I started my day lazing on the bed as I think the heat was making me very tired (and very sweaty too). Then I realise I do not have much time today as I have to check out by 2pm to avoid extra charges. 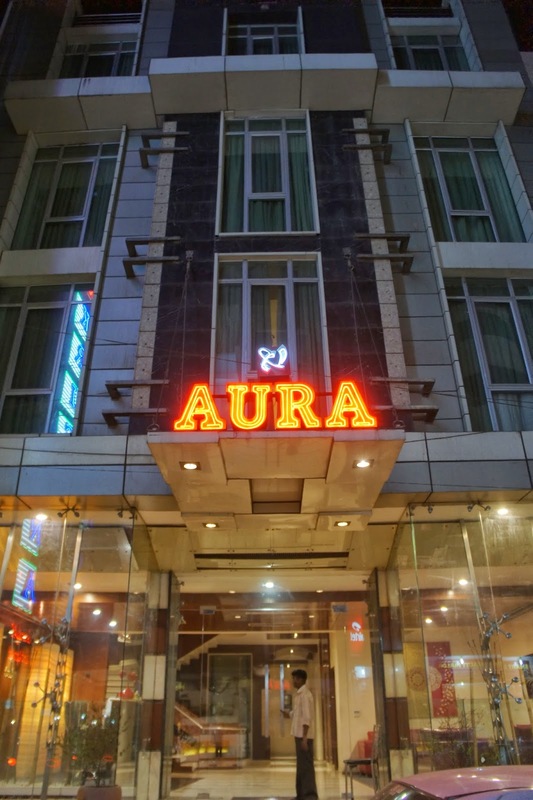 The hotel staff is kind enough to arrange for a late check out for me so that I do not have to pay 7500 rupees for half day extension. I quickly cleaned up and had my breakfast, and headed out in with little time wasted. 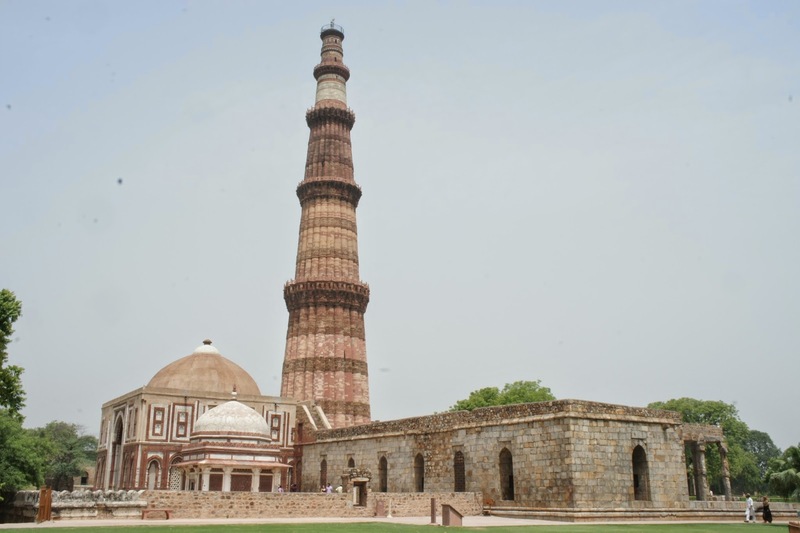 I wanted to take the metro to Qutb Minar, my first stop for the day, but thinking that I have to get an auto rickshaw to the metro station and once reaching the other metro station and get another one, I thought going to Qutb Minar from my hotel in auto rickshaw will make more sense. Moreover the distance is not that great afterall. 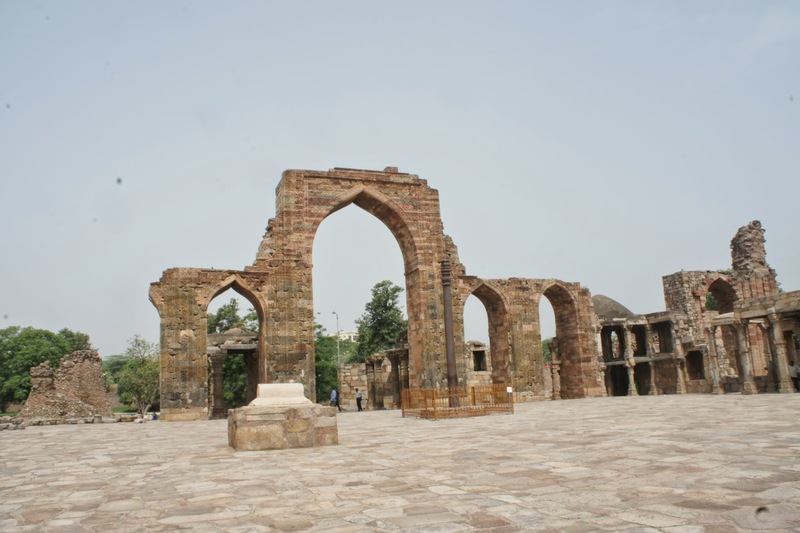 Once reached Qutb Minar, purchased the ticket I entered the site. However I headed back out again as I wanted to try out the audio guide (which I have not tried that out yet). I rented the audio guide and headed back in. 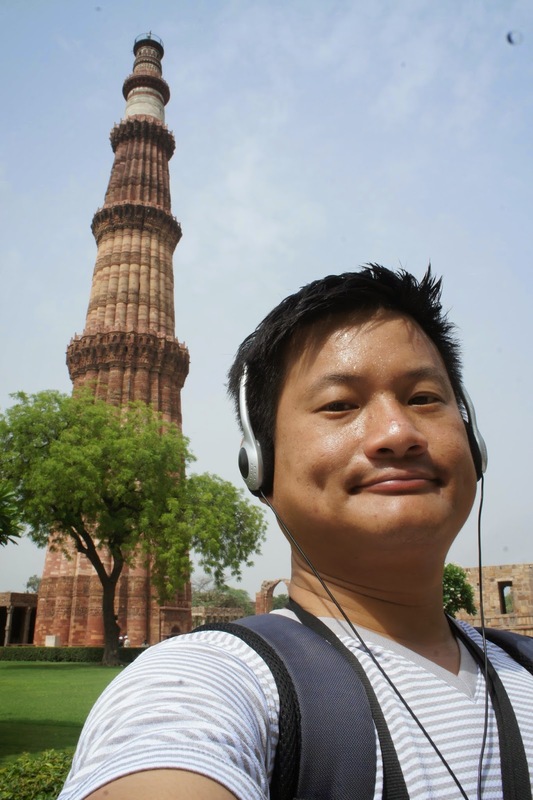 I must say the audio guide thingy is quite informative and a good way of seeing the monuments. 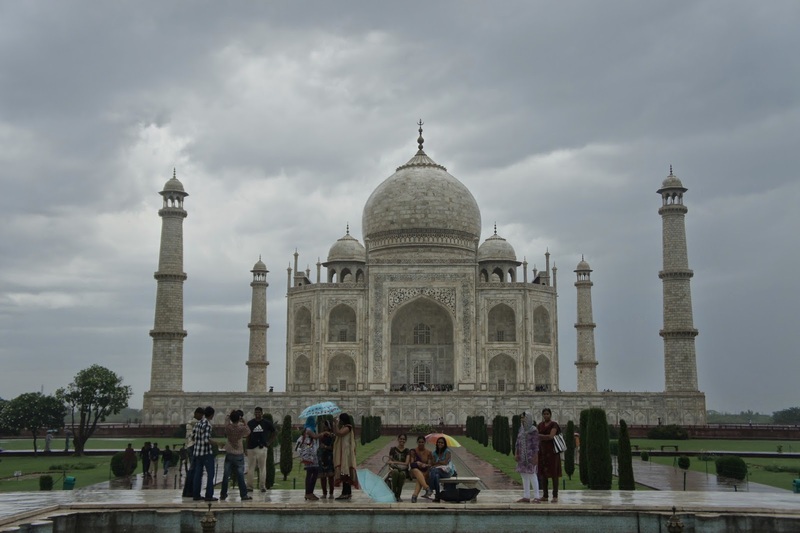 Should have done it a long time ago with the other monuments, especially Taj Mahal. 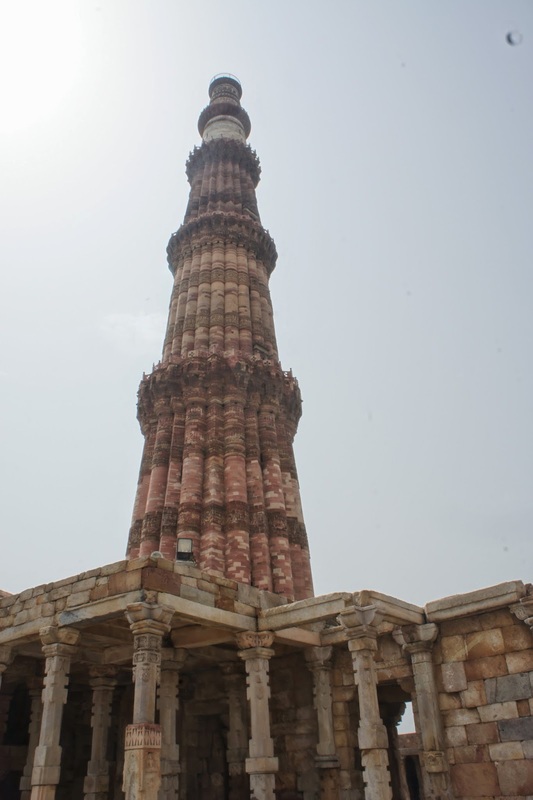 Anyways, the audio guide really gives good details of the Qutb Minar and the surroundings, it even point out things that I would usually have missed. 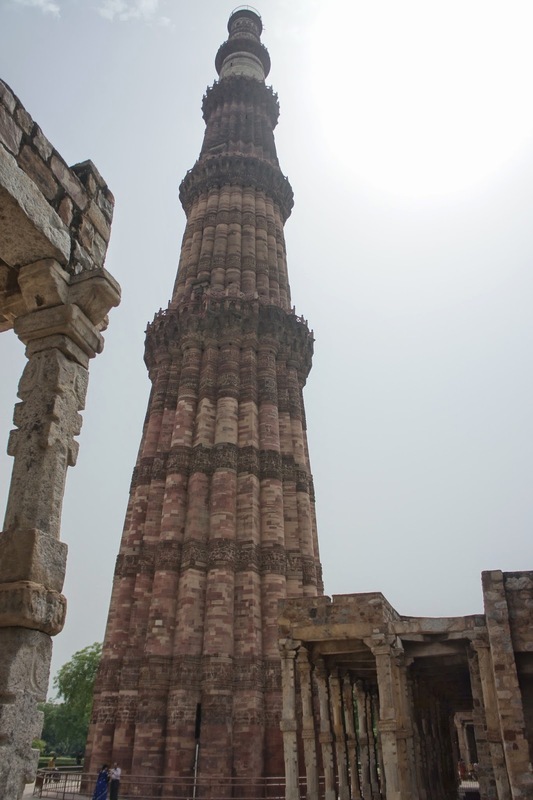 The Qutb Minar was very distinctive the moment I entered the complex grounds, there is no way anyone can miss it. 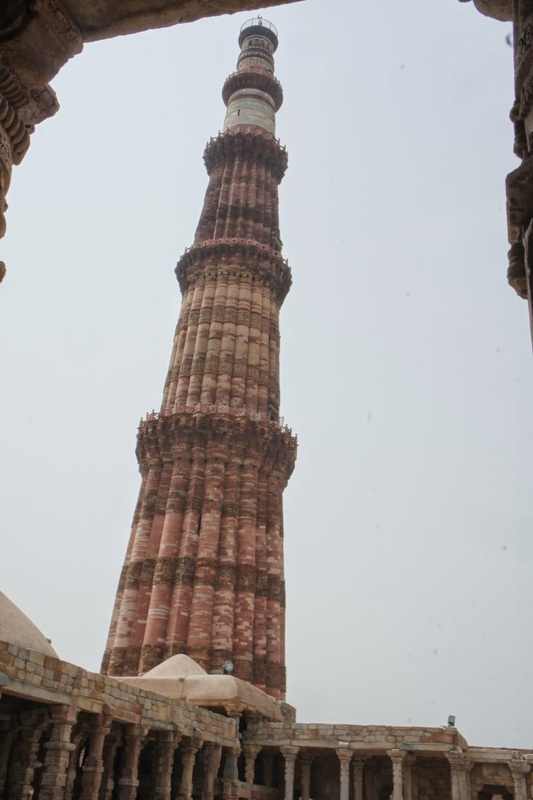 Afterall this is the world’s tallest brick minaret, standing at about 72m. 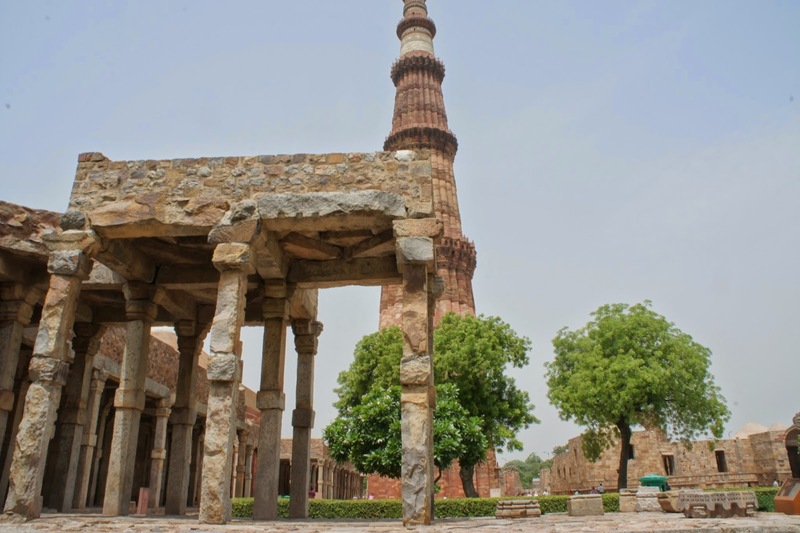 The audio guide has pointed out that the Qutb Minar was built by 5 different kings, and the first one merely built the first storey. 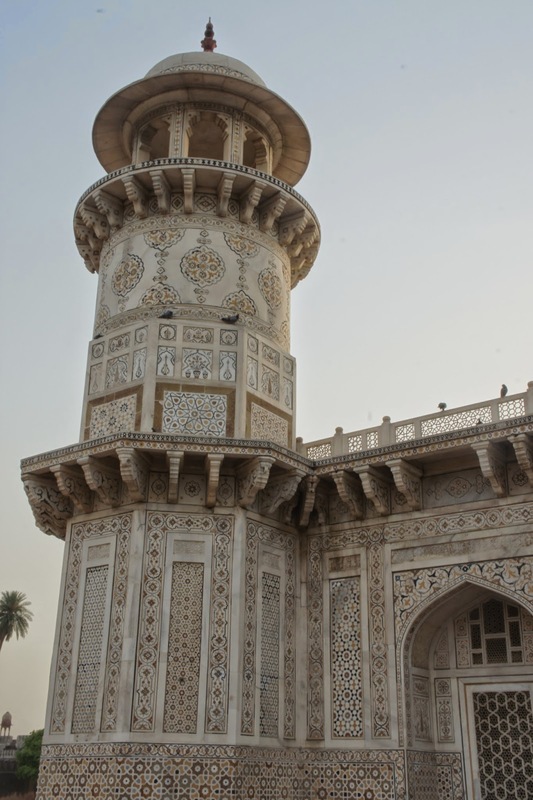 The Minar is mostly made of red sandstone and has intricate carvings and verses from the Holy Qur’an carved on it. 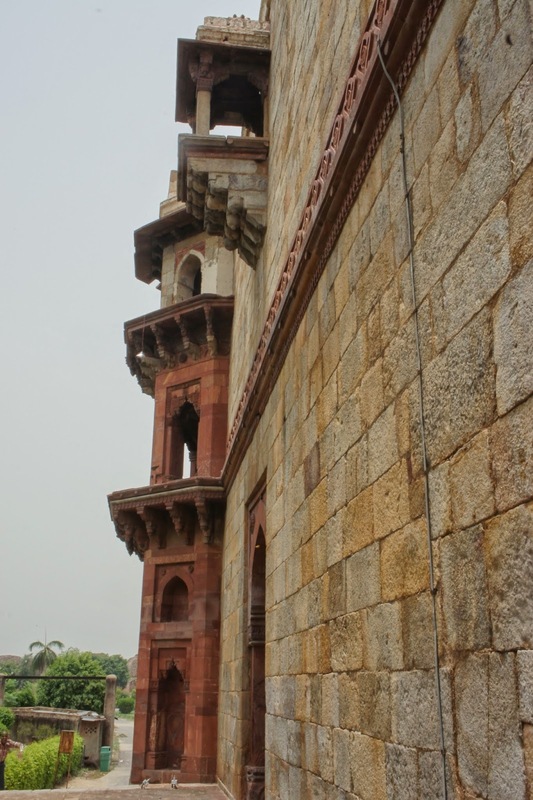 There is a stairway leading up to the tower itself, but pity it is sealed nowadays. I can imagine how far I will be able to see up this tower. 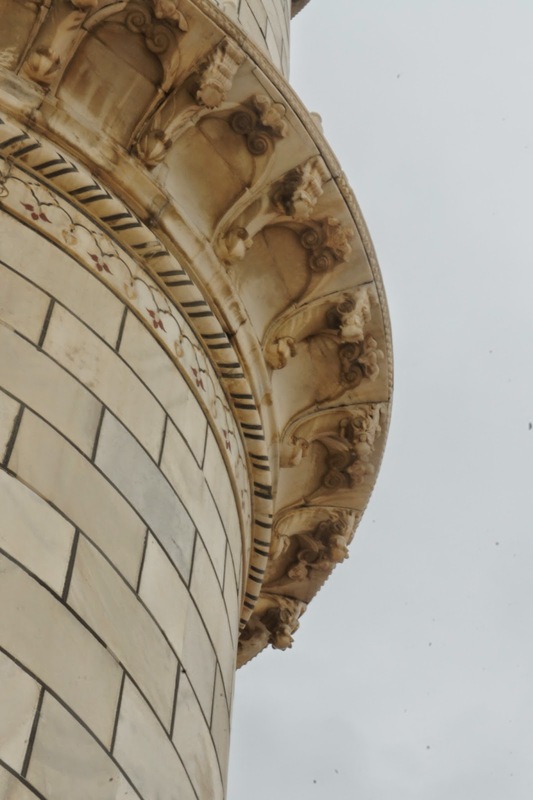 Perhaps the most interesting thing about this tower is the last 2 levels are built with white marble instead of sand stone. 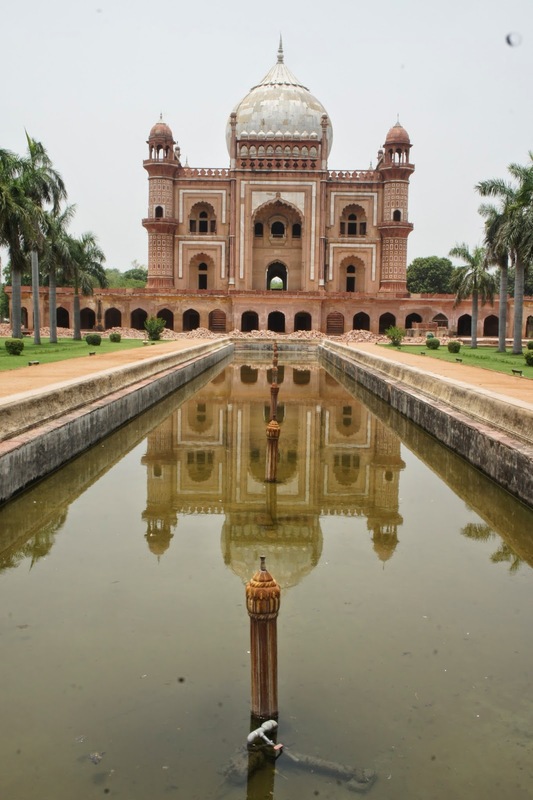 As I was walking around the Minar, it is not difficult to spot the symmetry in its design and construction. 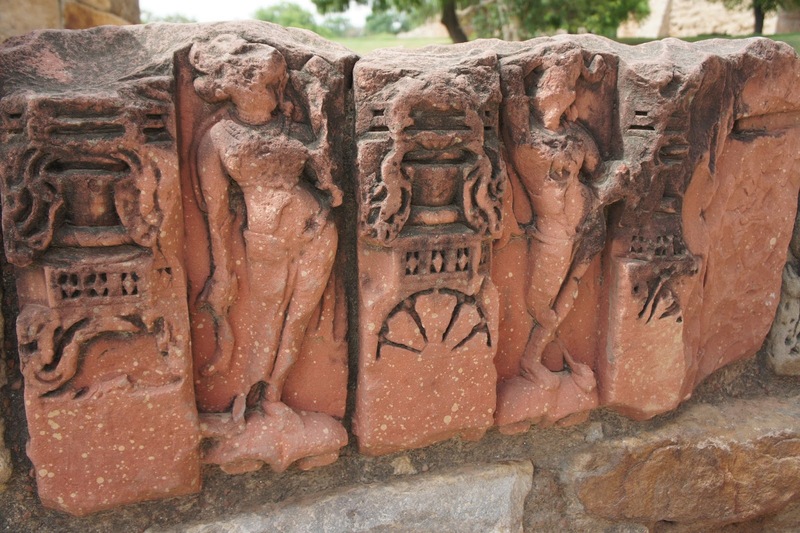 There is a partially ruined building to the side of the minar, I was drawn to the carvings of dancing ladies that was perhaps forgotten by many visitors who came to see the tower. 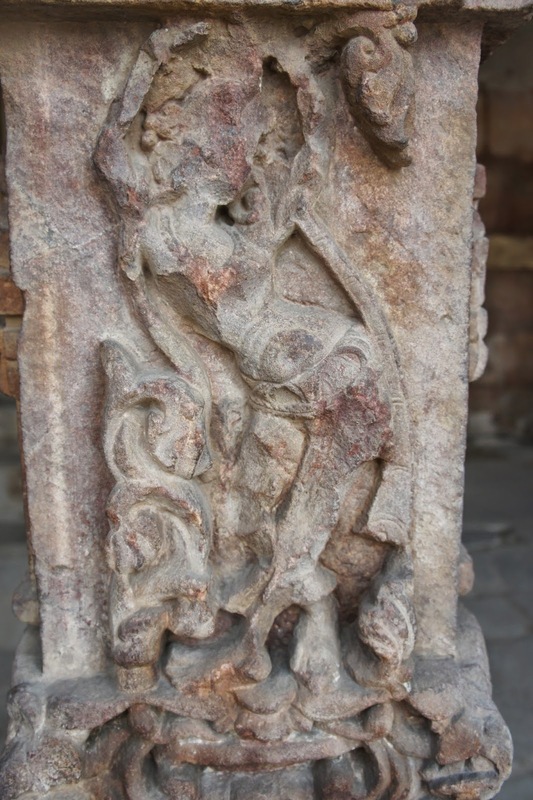 These carvings was in a very inconspicuous corner, unless one walk along these ruins , they are likely to be missed. 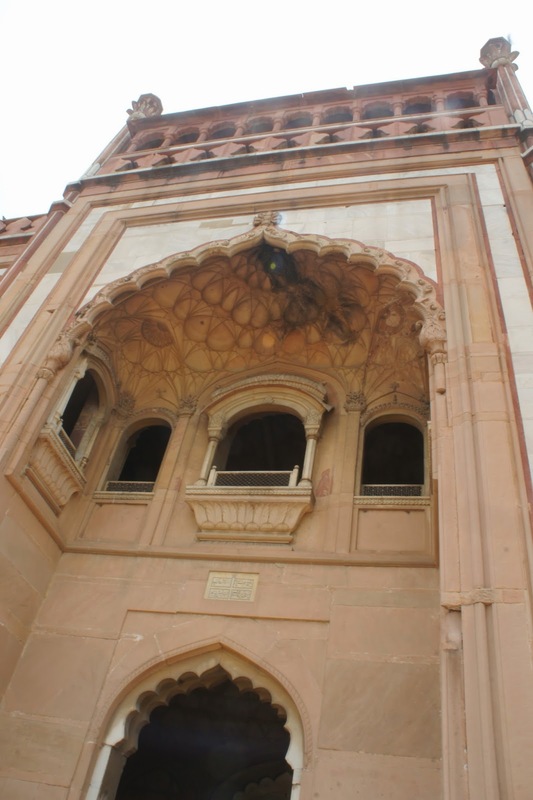 The audio guide led me to the entrance of what used to be a mosque. 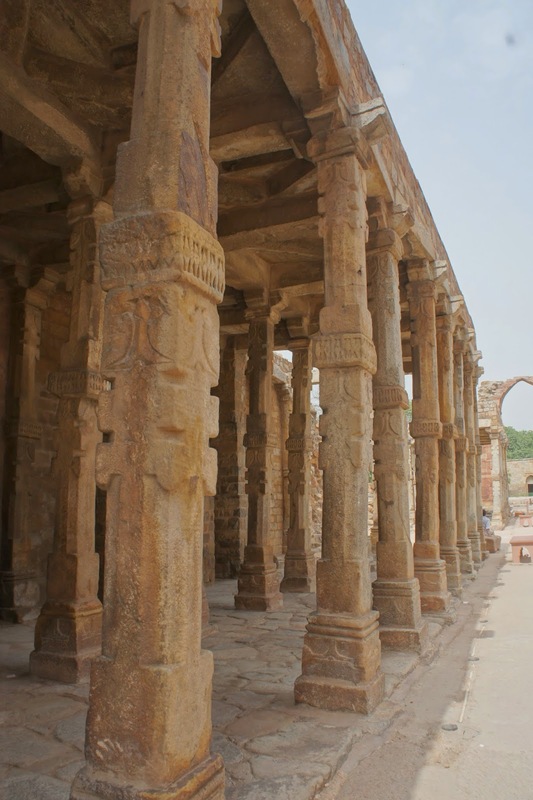 This mosque is now in ruins, but before entering the mosque compounds, I was drawn to these set of ruins, which looked like pillars of some building, it’s current state looks very much like the ruins of Persepolis I have seen in Iran. 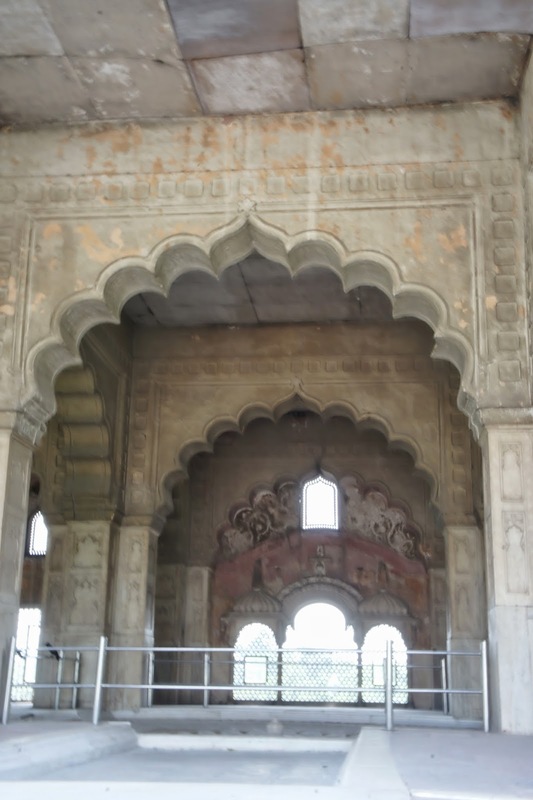 As I entered the mosque, the audio guide pointed out the many different designs, hinting presence of Hinduism carved into the pillars within the mosque. 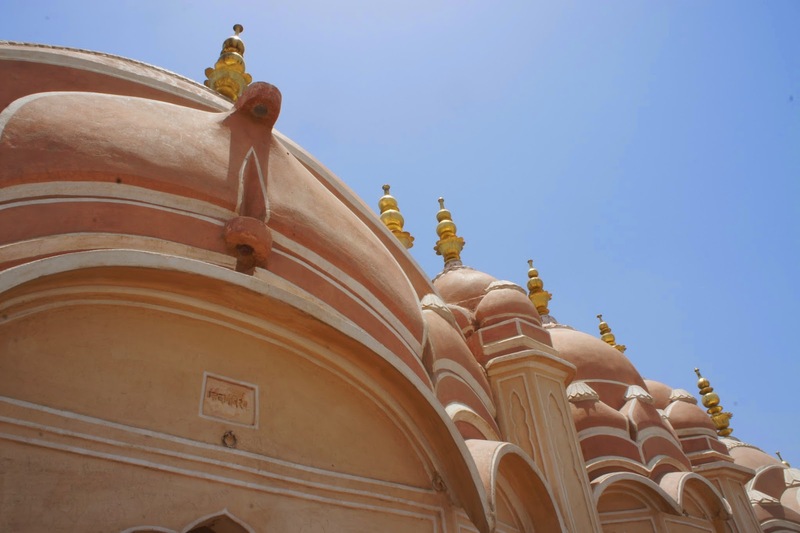 It was believed that the king had used the best craftsmen from the region to make this mosque. 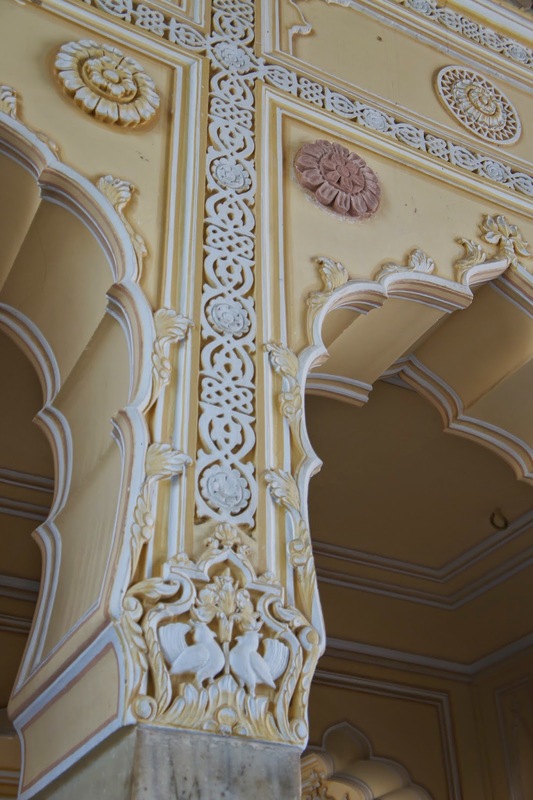 As the craftsman were Hindu, they carved what they believe to be holy onto the pillars. 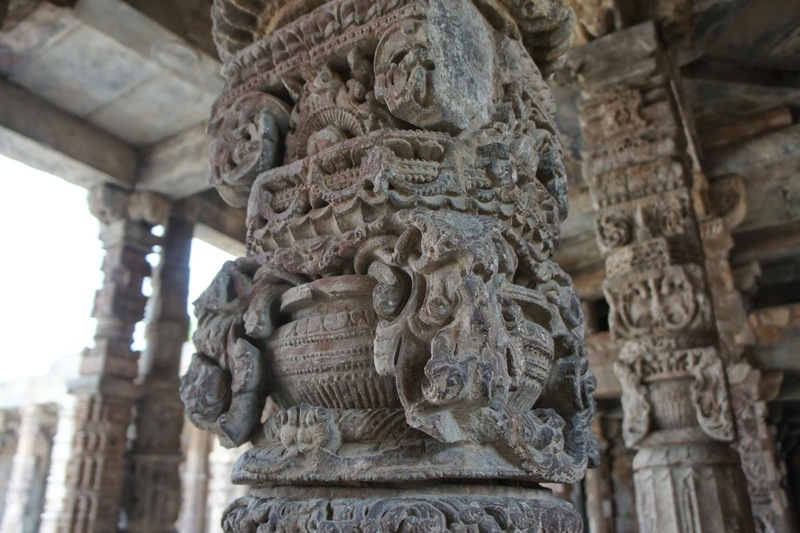 After centuries, the carvings on these pillars are still very much in tact. 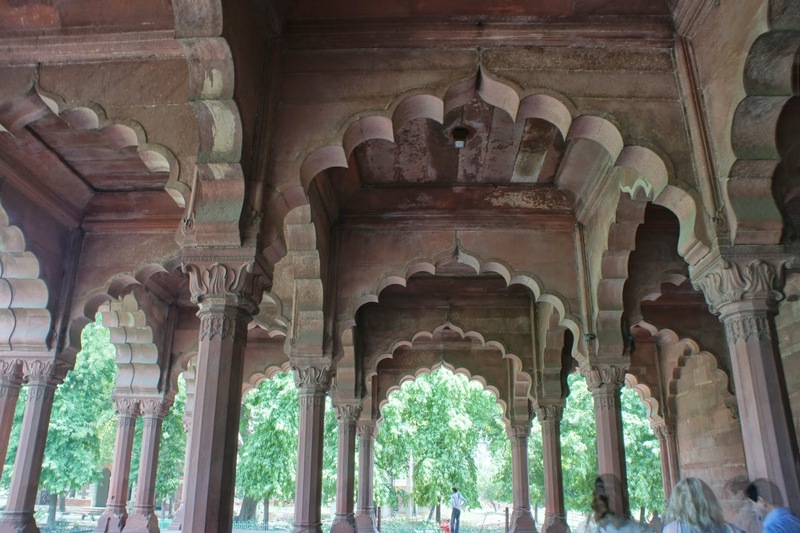 I went around looking at the pillars, true enough each pillar seemed to be different to the one before it. 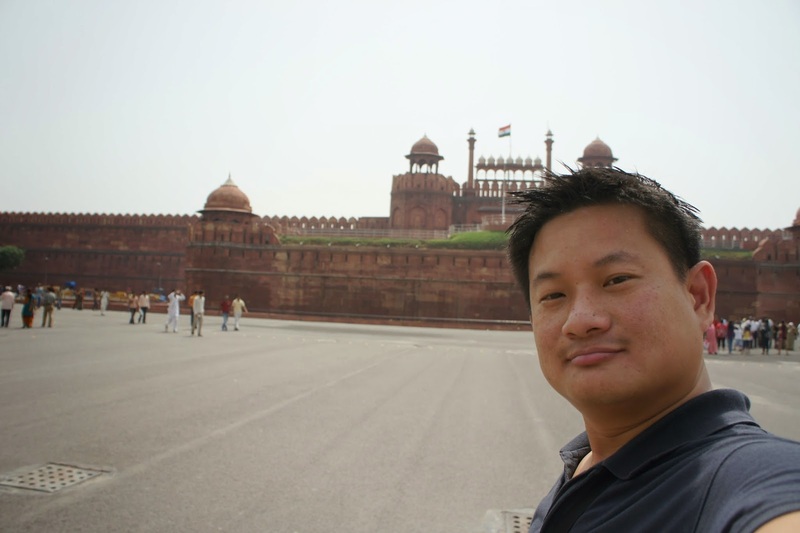 As I was looking around, a man in security uniform approached me and asked where I was from. I volunteered the information, and then he just blabbered information about the pillars and the sites. Well I already gotten most of the information he had just spilled. After blabbering those information, the guy actually asked for tips. 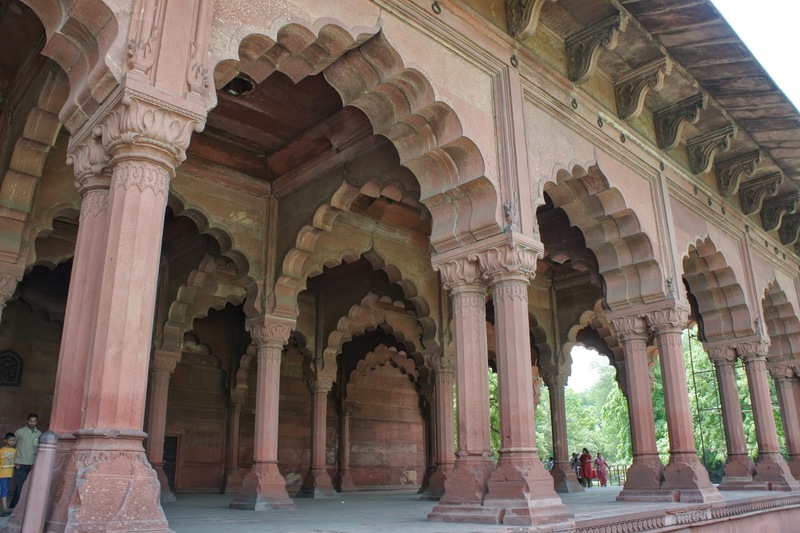 Well I kinda saw that coming and told him straight in the face that I paid 100 rupees for the audio guide which gave the information and more that he just shared with me. I also told him I am not going to tip him as he volunteered the information. Upon hearing this, the guy backed off and went to hunt for another pray whom he can rip some tip off. I went to the corner the audio guide pointed me to. 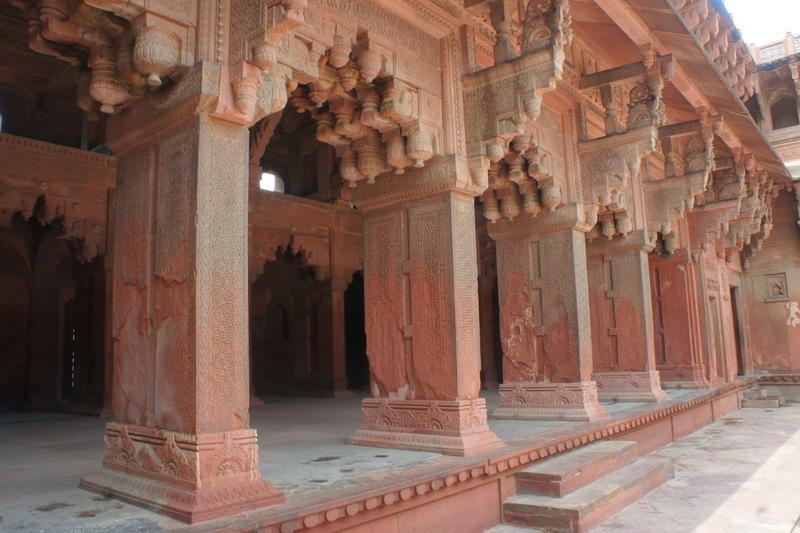 This is part of the mosque with different carvings in the pillars. 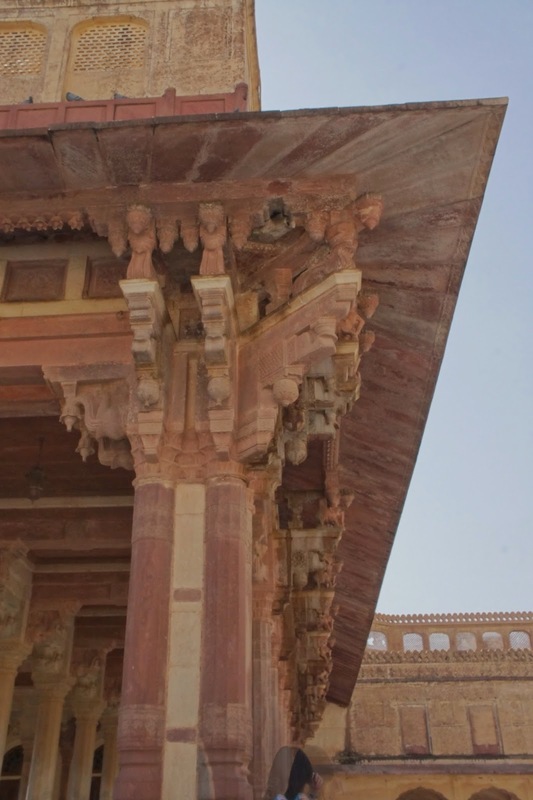 However this corner was believed to be truly muslim as the pillars have little carvings on them. 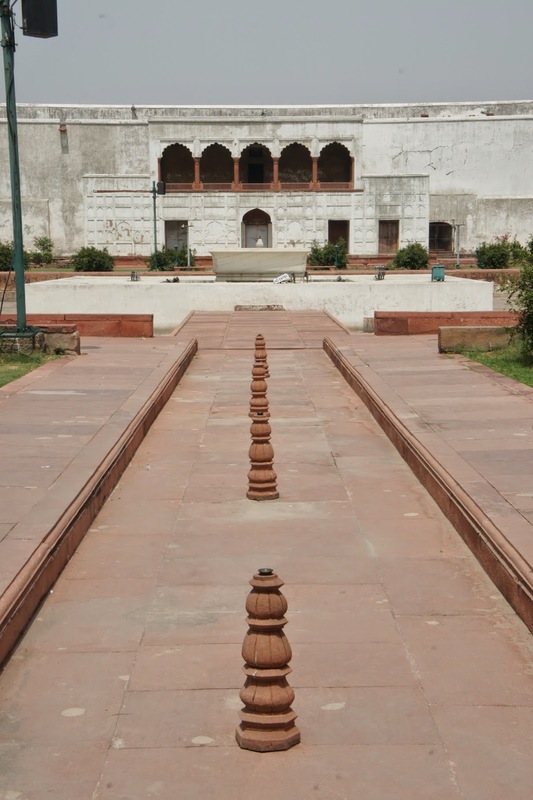 I was then guided to the centre of the mosque where lies an Iron pillar. 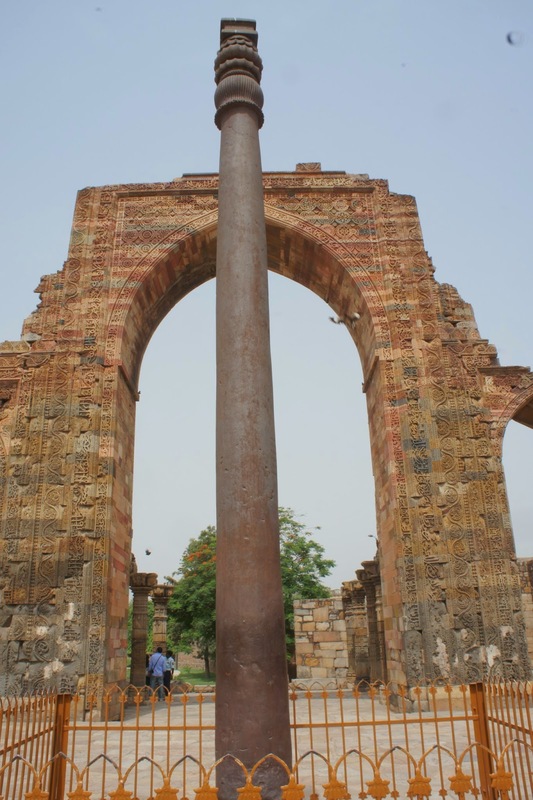 The big deal about this Iron pillar was that the purity of it was almost non existent in those days when this is casted, thus this was the purest iron at that time it was smelted. 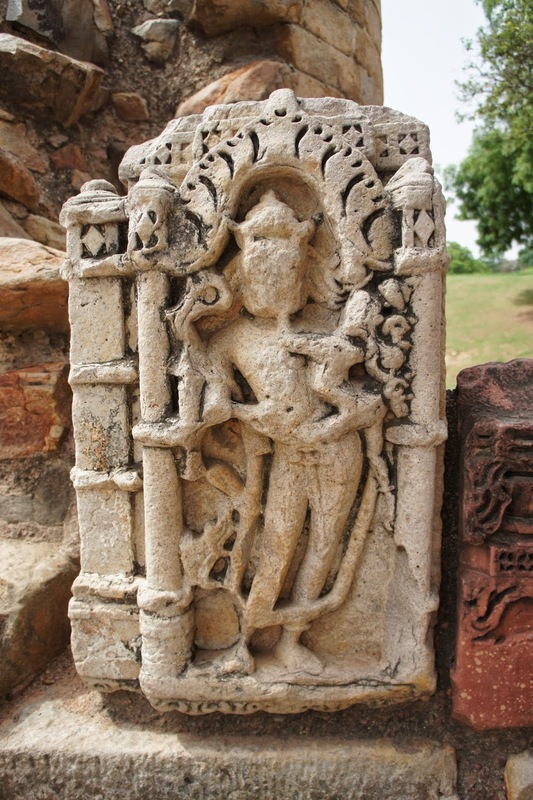 There are some scripts carved on it, which is not muslim. 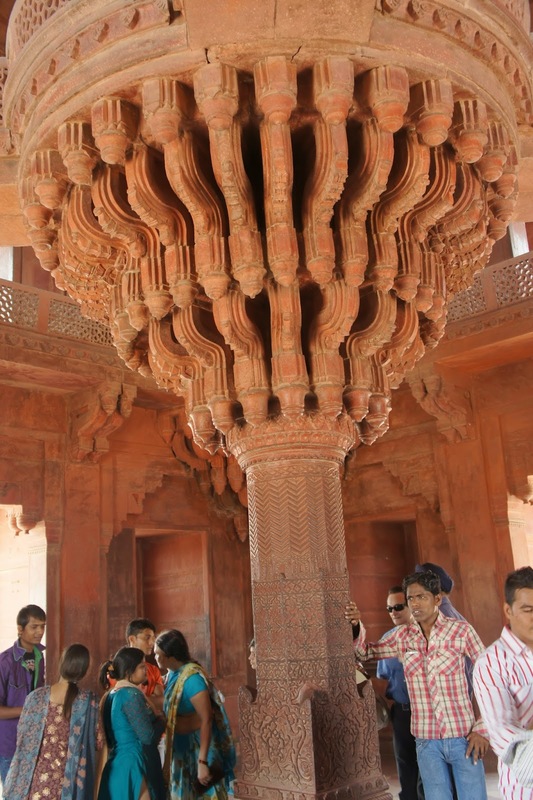 Also the pillar used to have a hindu god on its top. 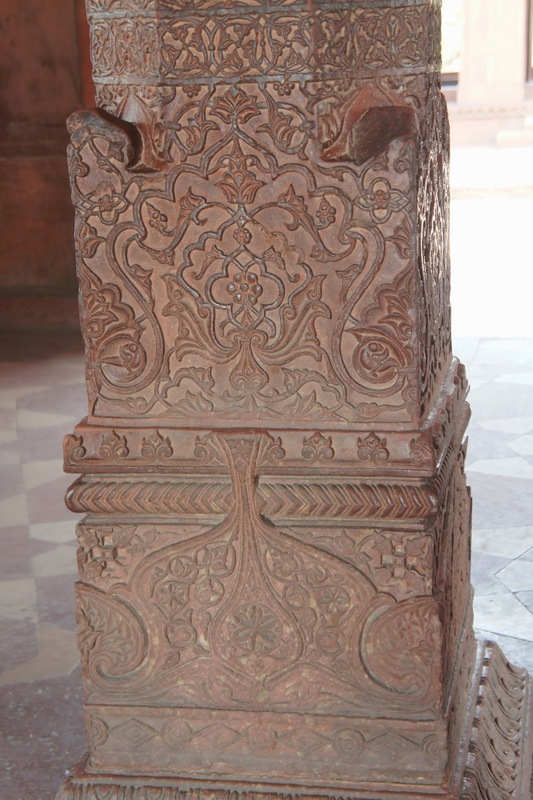 I was wondering why this iron pillar with Hindi origin is doing in the middle of a mosque. quite puzzling. At the back drop of the iron pillar seemed to be some gate way. 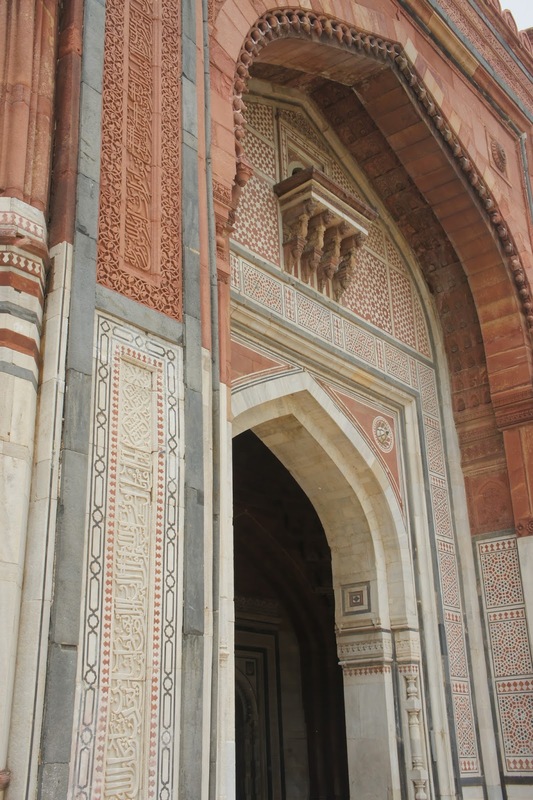 These gate ways are full of carvings with Arabic words. It only make sense that these could well be part of the Holy Qur’an. 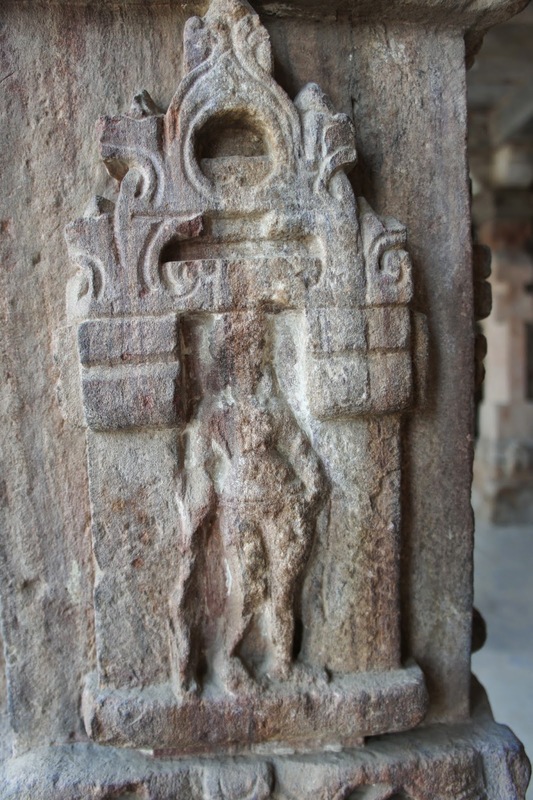 There isn’t much to see on these doorways, other than its intriguing carvings. 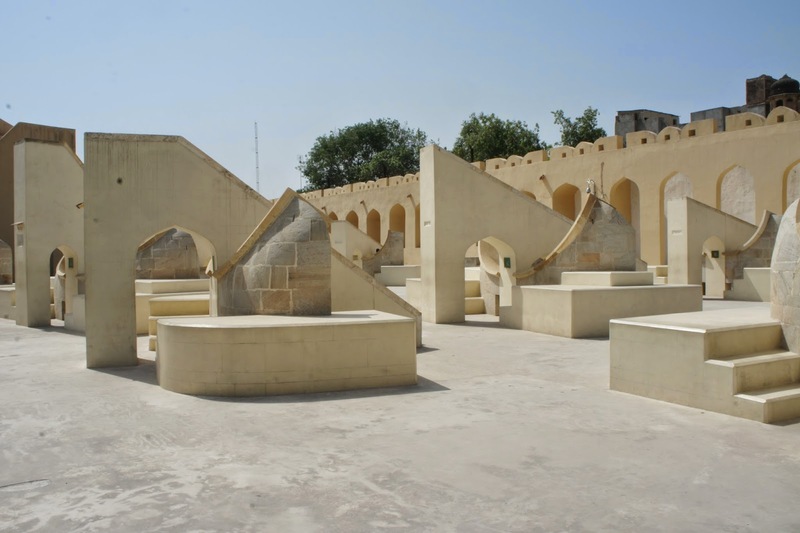 The other puzzling thing about this mosque is there seemed to be 3 tombstones in its courtyard. 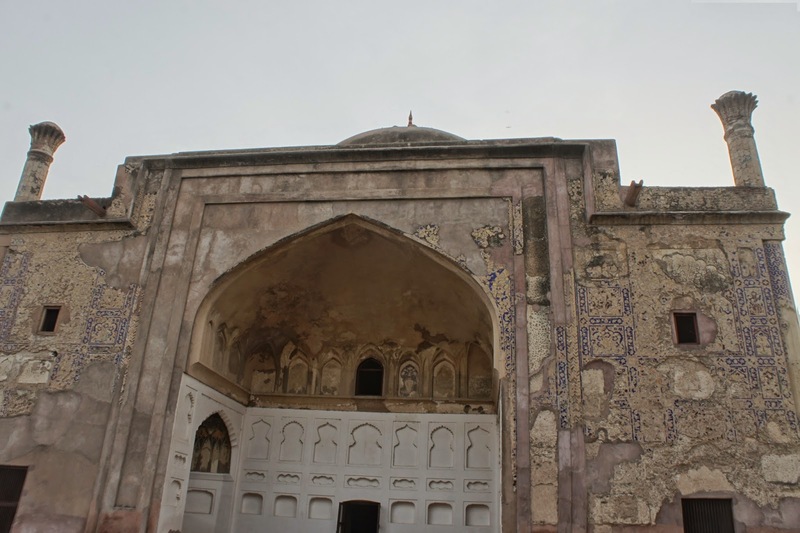 The audio guide mentioned that the reason for their presence is rather sketchy, it can only be presumed that this mosque was once so abandoned that people just used its grounds for burial. Well whoever the genius thought of that is now resting amongst the graves of the kings. I exited the mosque area and headed towards this giant looking stump of rocks. 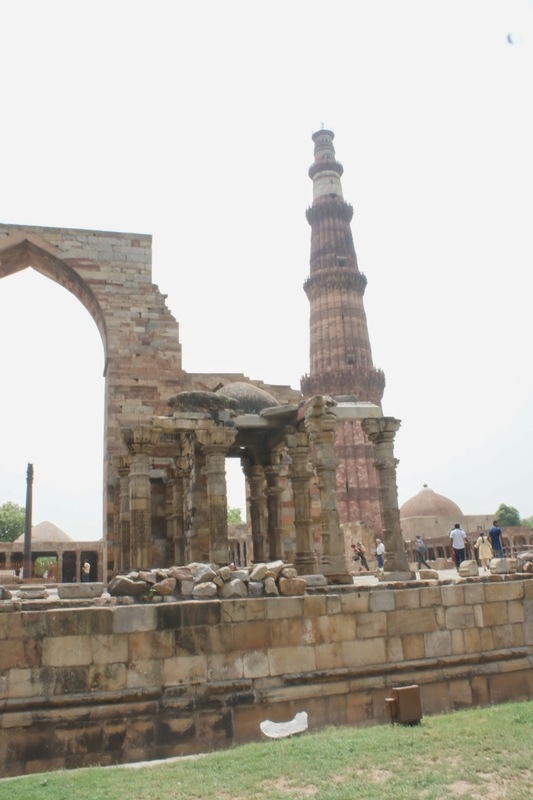 The audio guide mentioned that this was supposed to be another Qutb Minar, once completed it will be grander then the one opposite it. However the construction barely reached the first storey when the king who ordered its construction died. 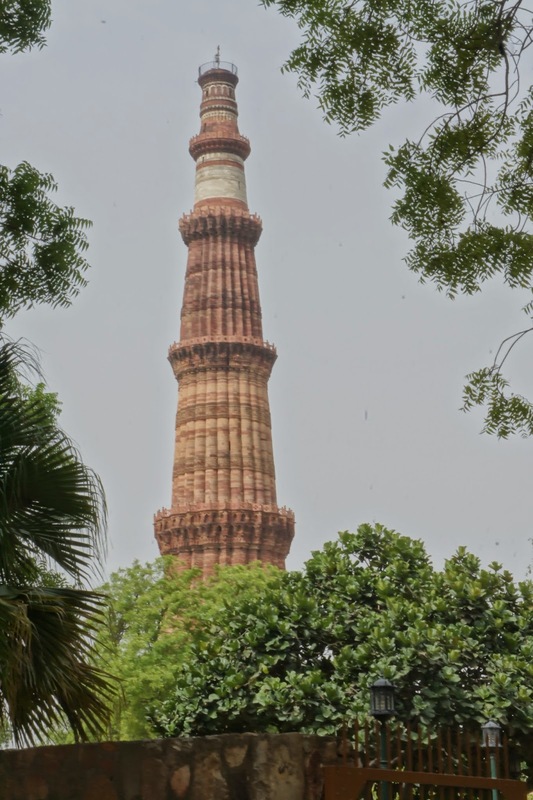 His descendants were busy fighting each other over power then to complete this tower. 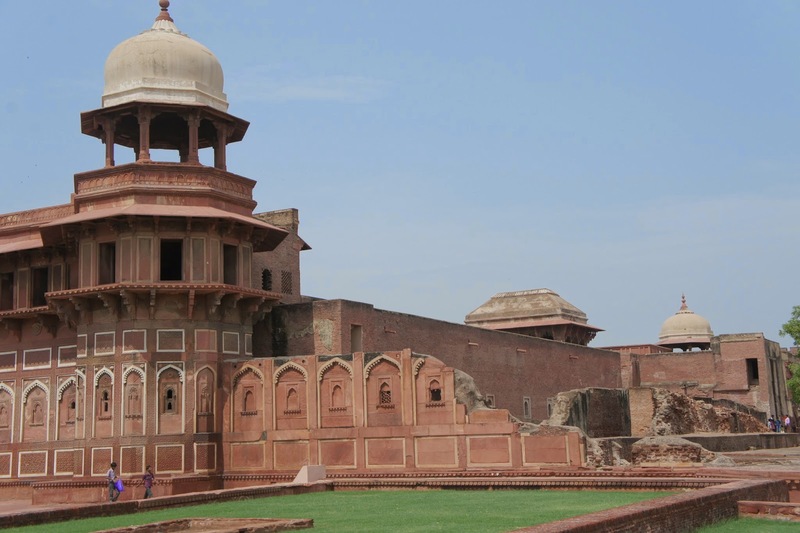 I then headed over to the King’s tomb – Tomb of Iltutmish second sultan of Delhi, which is tucked away in a quiet part of the complex grounds. 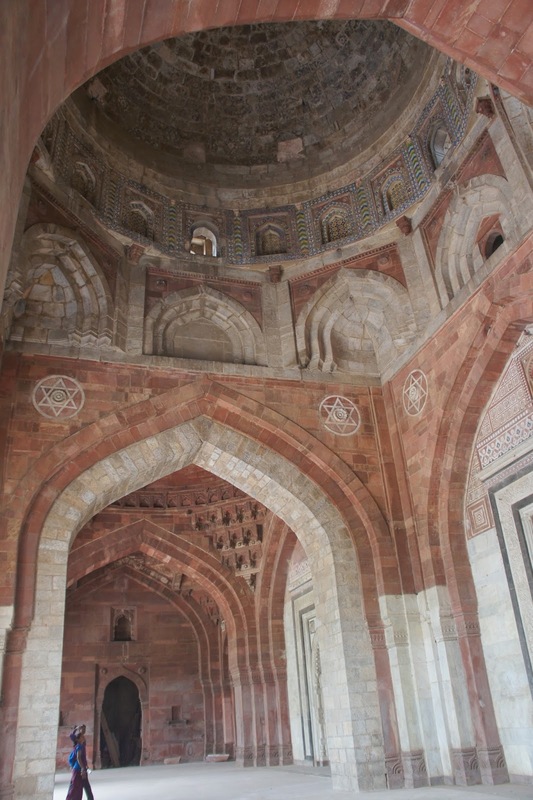 There used to be a dome for this now open aired tome, and as the audio guide pointed out, the intricate carvings are of muslim origins with hints of hinduism like the lotus buds on the archways. 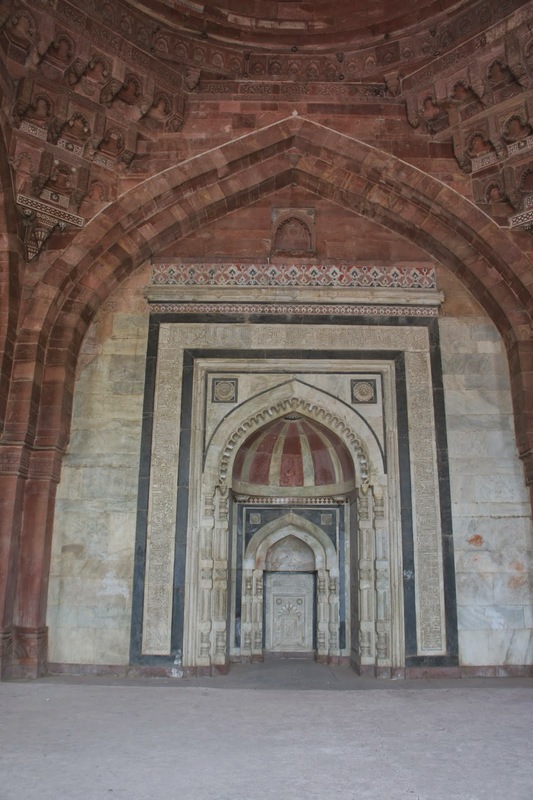 The entrance to the mausoleum crypt is still visible at one of the entrance of the tomb. 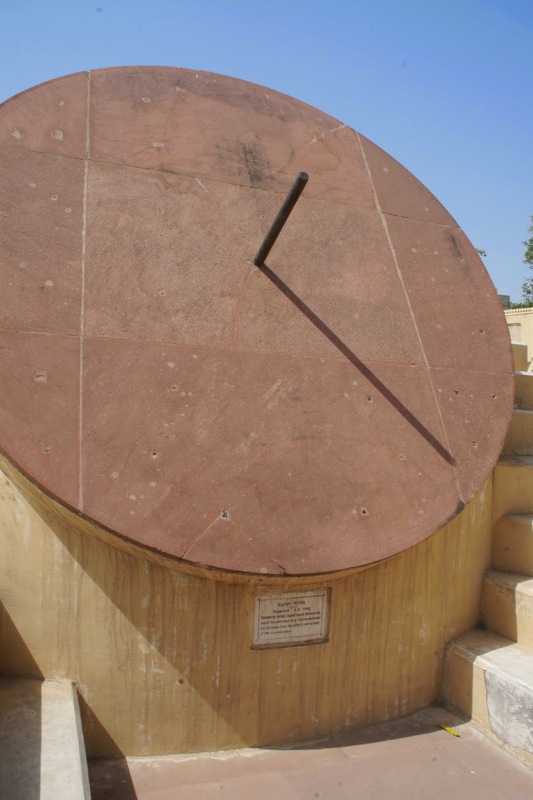 It is now sealed and probably forgotten by the thousands of visitors flogging to this site daily. 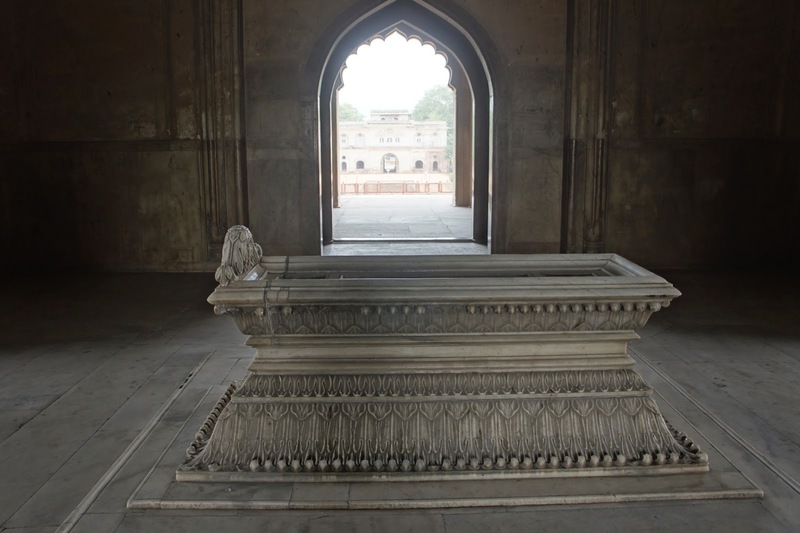 Moving right on was the tomb of Khiliji, second Sultan of Delhi from the Khilji dynasty. 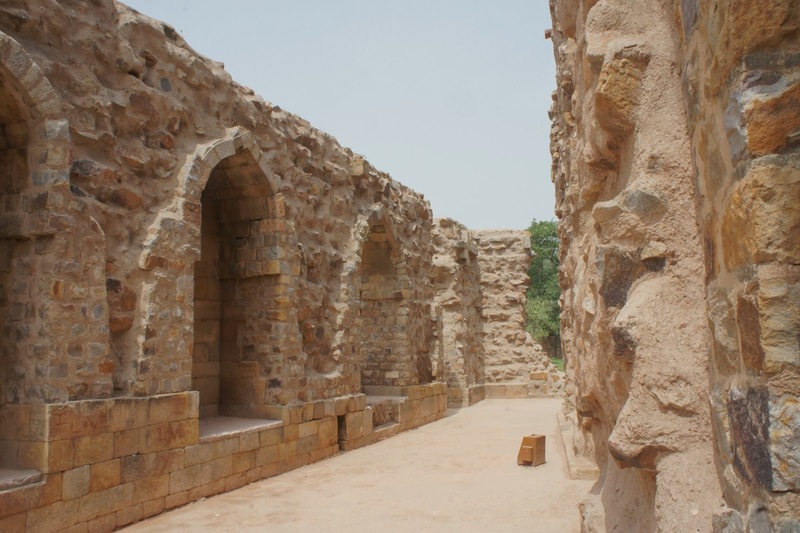 Well this is not exactly another tomb, this set of ruins used to be the college of muslim studies in Qutb Minar complex. 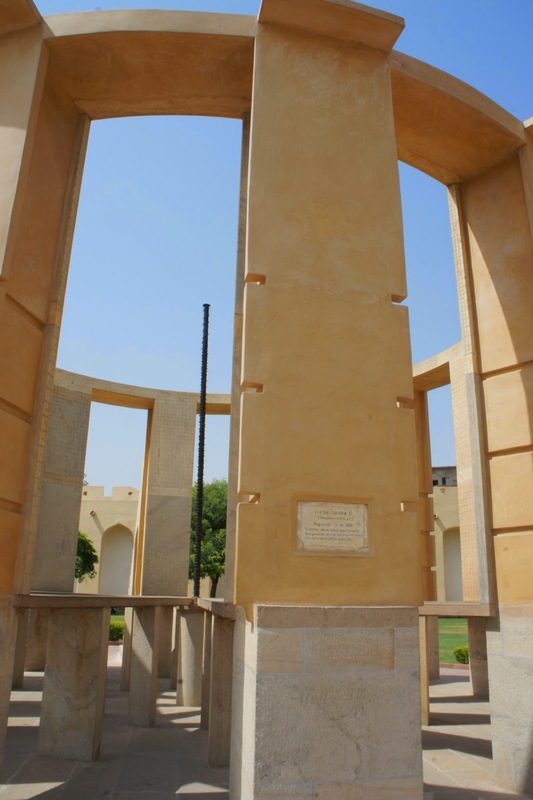 To commemorate the founder of this college they buried him here within the college grounds. Too bad the tomb of this founder was not restored and in a rather bad shape, however the audio guide did pointed out that this tomb was once grand. 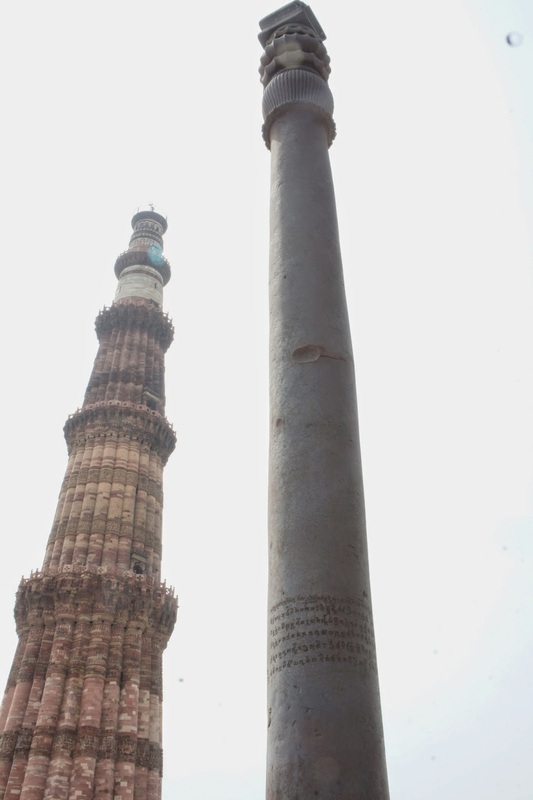 I was then guided back where the Qutb Minar was, passing the mosque and then the Minar. I was guided to a gate way. 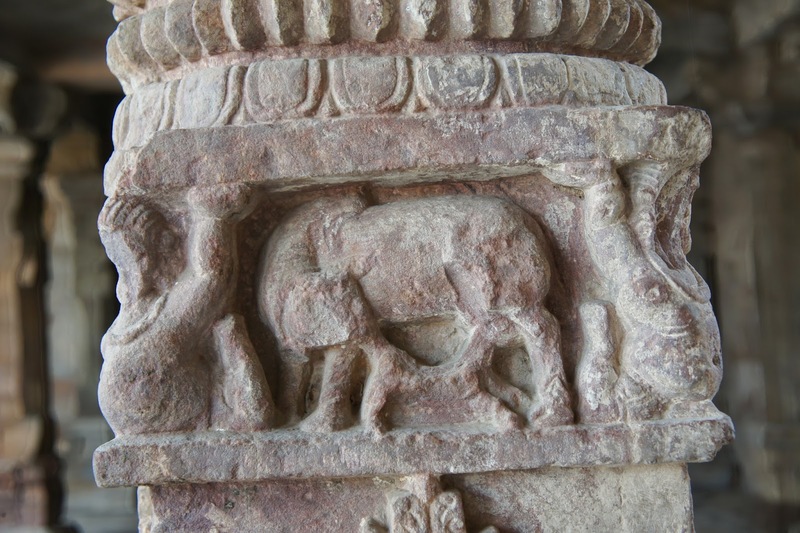 There are more carvings of muslim nature mixed with hints of hinduism in it. 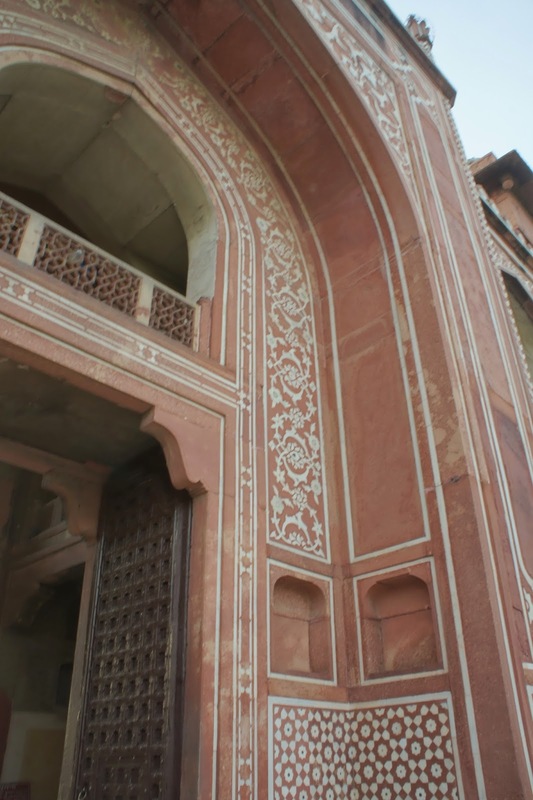 From here I can really see the amount of work put into the carvings of this gate way and its interior. 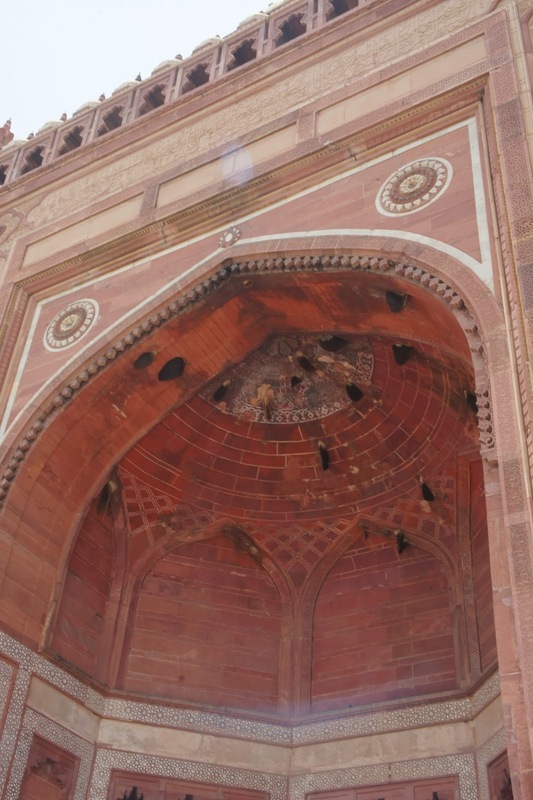 Every inch on the archway was carved with something, both inside the gate way and its exterior. Truly amazing!! The other side of the gate way was actually an empty field, instead of heading that way, I was guided to the side exit of the gate way, where a small crypt lies. 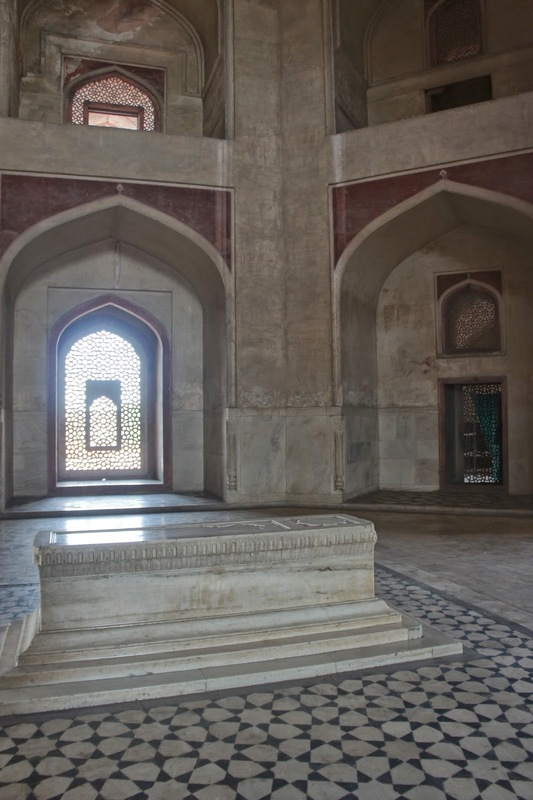 This is the tomb of Imam Zamin, a saint from Turkey. 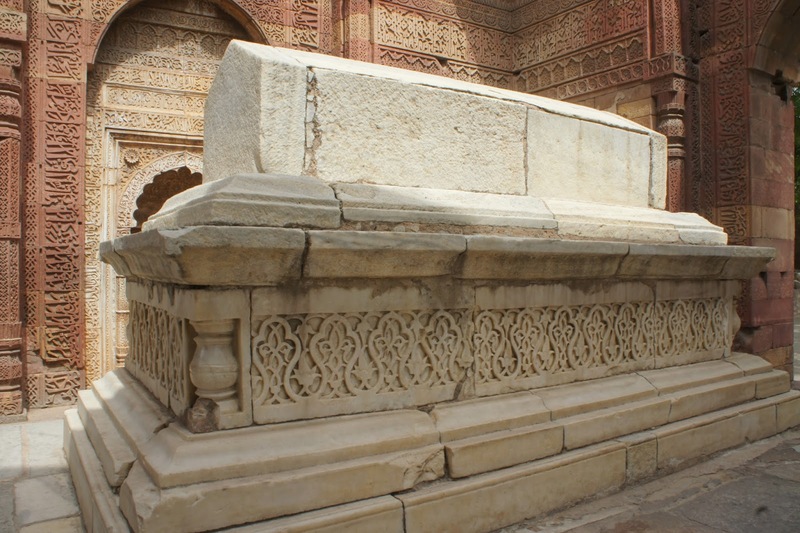 This smallish tomb is one of the most in tact building around within the complex. I was then guided to the next area through a very small door. 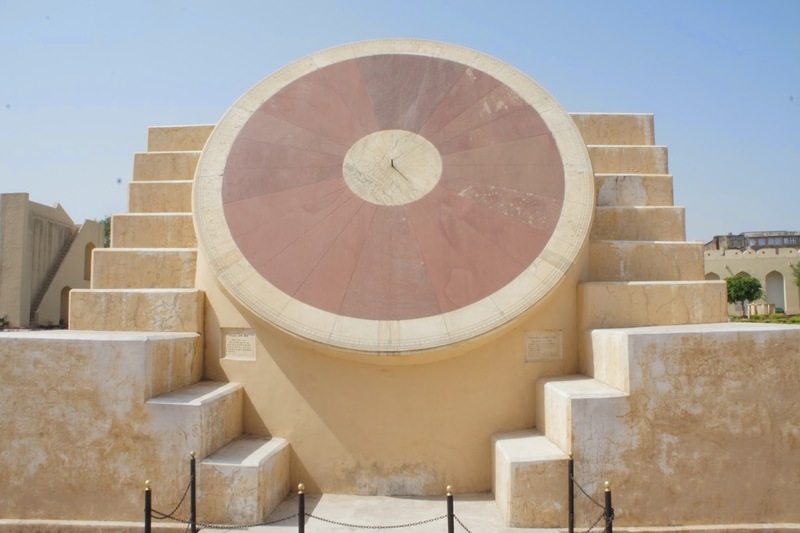 Well the next 2 areas within the complex that the audio guide led me to were of British origins, one is a pavilion and another a sun dial. Well not too interested in those 2, I headed towards the exit as soon as I took a couple of “I have been here” photos of these 2 items. 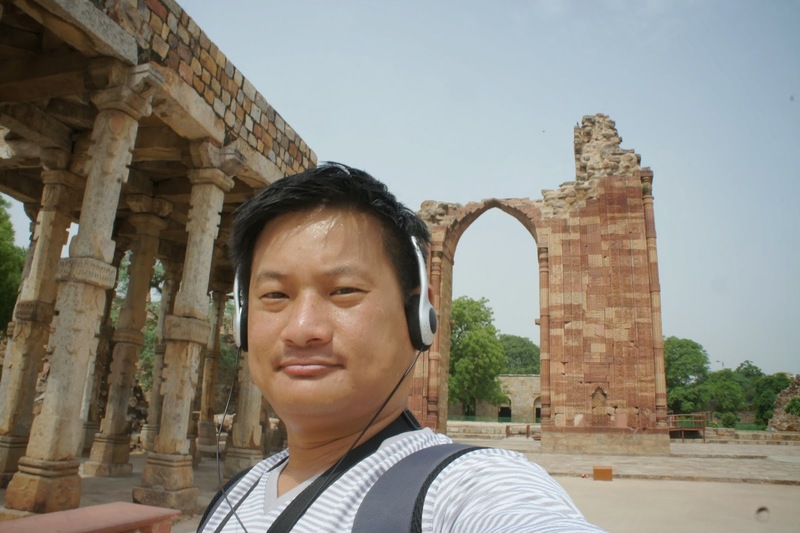 I returned my audio guide and started to walk towards the metro station. Well the walk is longer then it should be. 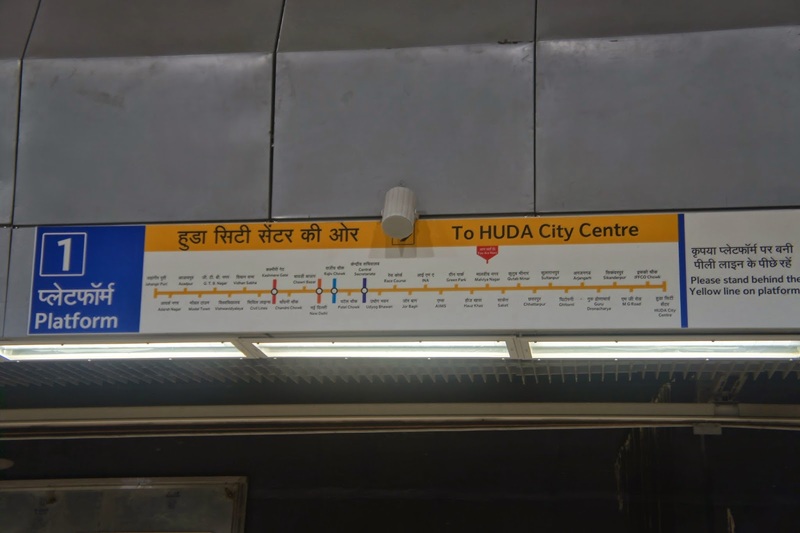 According to the guide book, the closest metro station is Saket. After about 20 mins of walking under the hot sun, asking a few locals where the station is, I finally reach the station. However I realised this was not the station I wanted to be, and it is the further station. Well as long as I reached the station, I am not really complaining about it. 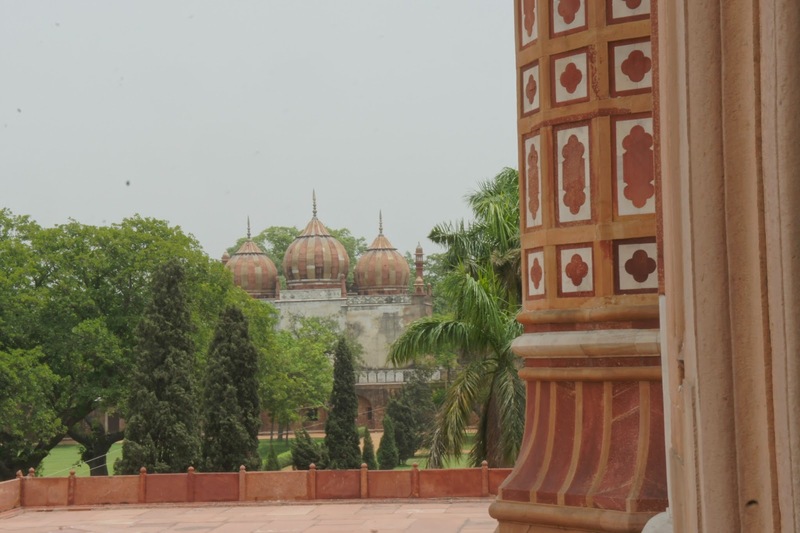 The train arrived shortly the moment I was at the platform and off I went, heading towards the next destination – Safdarjung’s Tomb. I was contesting between 2 stations as the map suggests that one is closer to the other. So I alighted at this station which appeared to be closer on the map. I got out of the station and started asking locals where the tomb is. One of the local, who happens to be heading the same direction, motioned for me to follow him. And so I did. He told me that the other station (that I was considering) is actually closer then this one. Damn it seemed today I had walked alot of unnecessary distances. The local then told me to keep to this side of the road and the tomb as well as the station is on the right side. So I followed his instructions and reached the tomb in no time. Well this tomb was rather abandoned, not in the deserted and no restoration kind of way, but the visitorship is really few. The main gain of the tomb, to be honest, was quite modest. 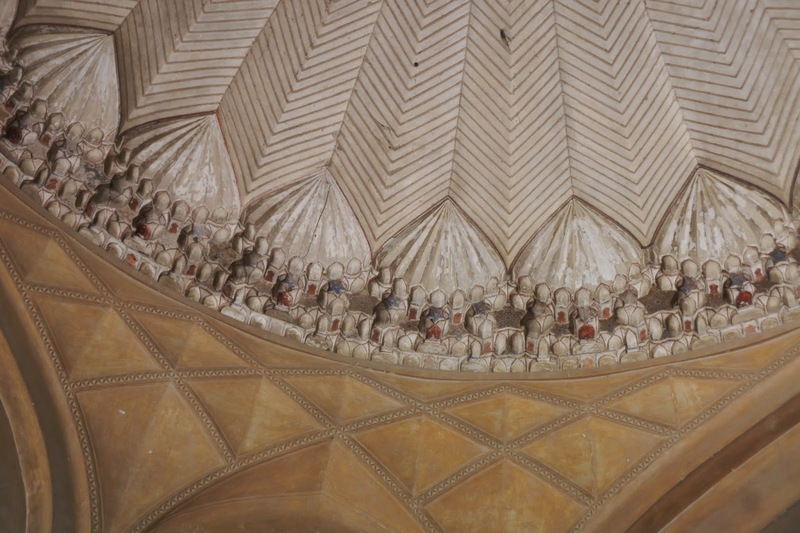 However the Persia influence in the design is very clear on the ceilings of the arch on the gate. Through the gate was the garden before the tomb. 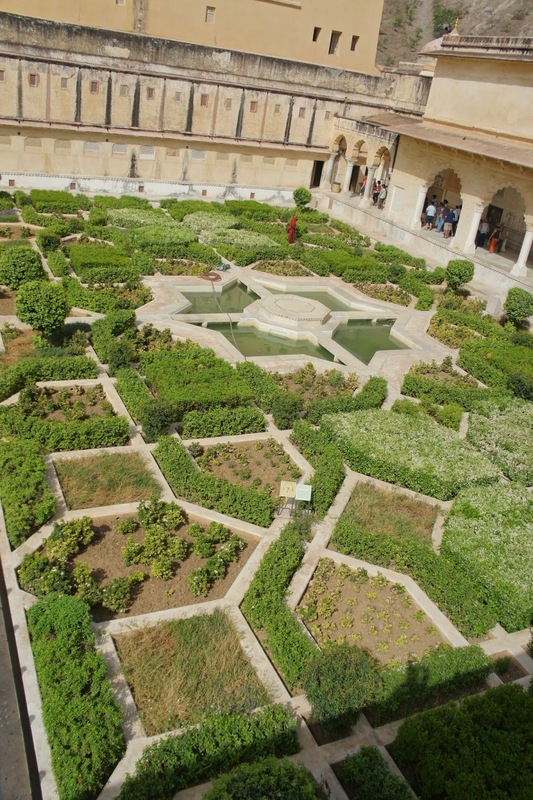 This garden also has the Persia design, reminded me of the Fin Garden in Iran. 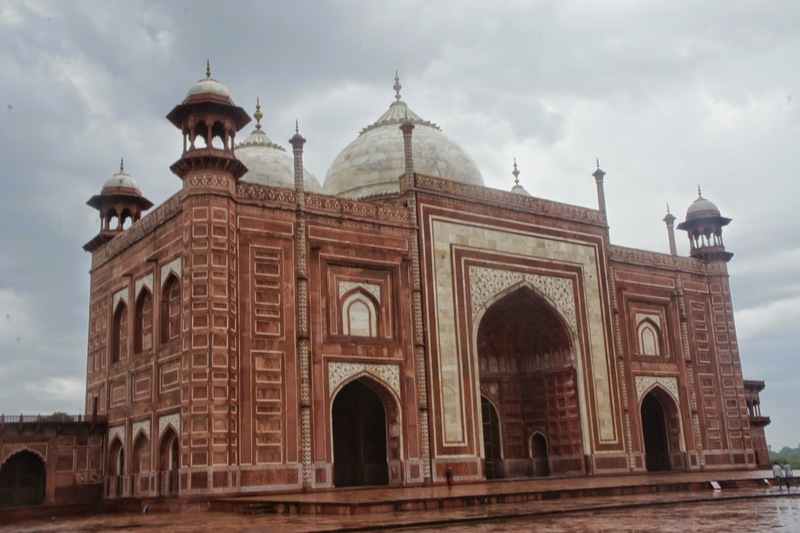 The design of the tomb is very similar to that of Taj Mahal, which follows the Mughal architecture. I walked towards the tomb, and it seemed to be under some kind of restoration that was abandoned halfway through. I climbed onto the platform and start to take pictures of the tomb and the garden around it. 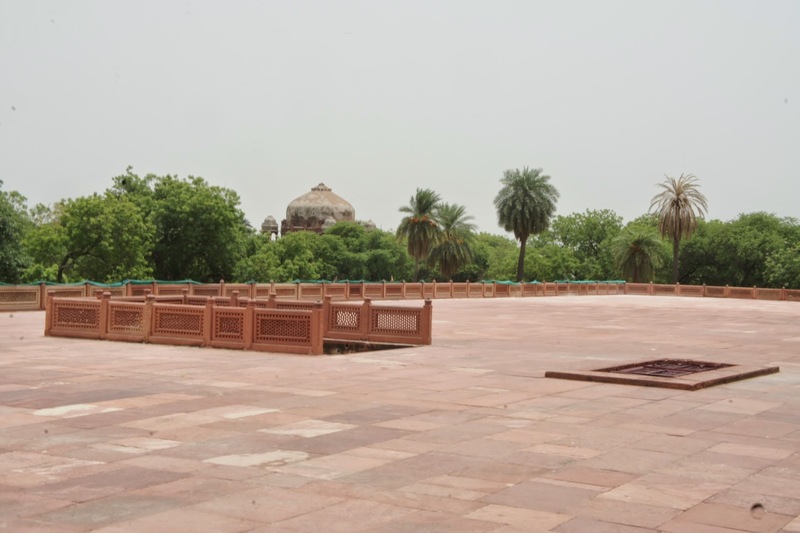 I thought the garden is better maintained then the tomb itself. 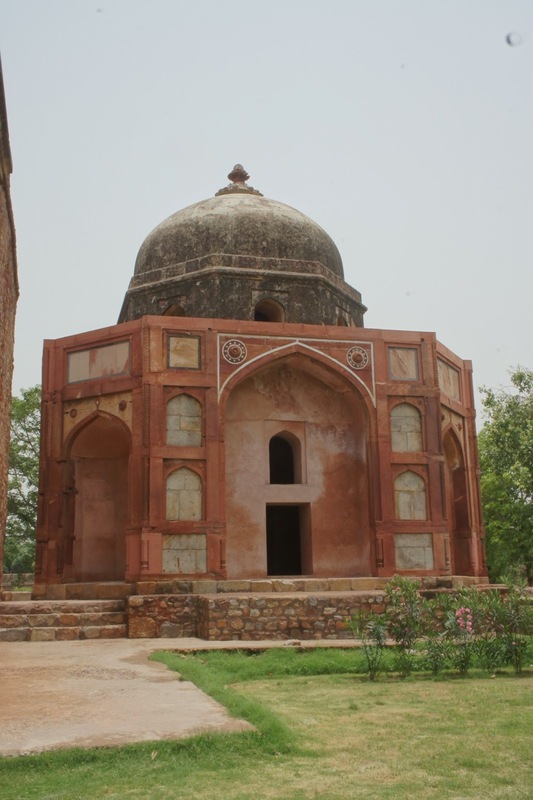 The significance of this tomb is it represents the last of the Mughal style tomb architecture, which started off with Humayun’s tomb, apexed at Taj Mahal and declined at this one. 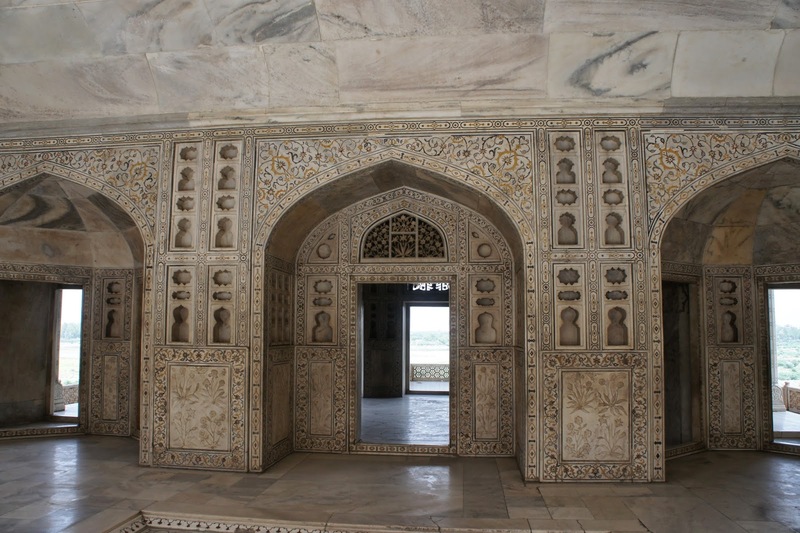 Entering the interior of the tomb, the carvings are still in order with little or no damaged done it it. I guess one thing good about being a forgotten tomb is no one comes to mess around with the walls. 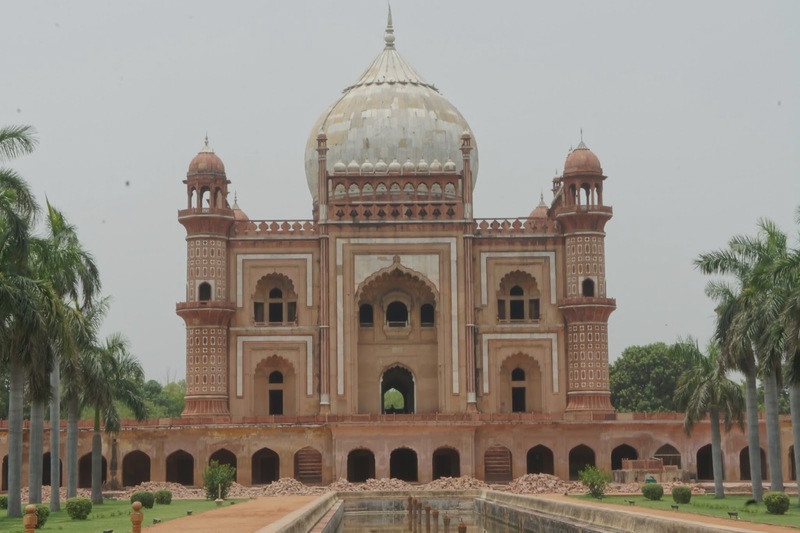 In the centre of the tomb lies the grave of Safdarjung. I went around taking more pictures before exiting the tomb. I headed back to the hotel via metro to pack up. To avoid paying for the half day extension I need to check out by 2 pm, which i delayed till about 2.45pm. The staff at the hotel was amazing, not only they did not rushed me, they also told me it is fine and to take my time. 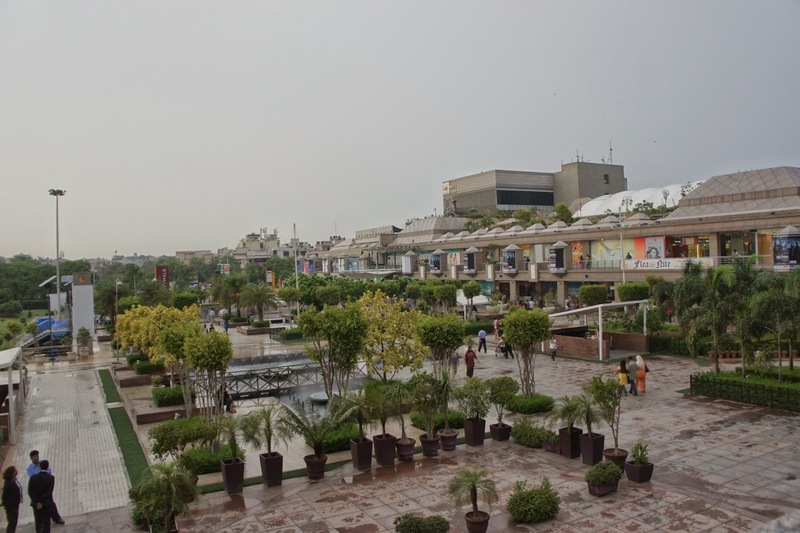 I left my luggage with the concierge, and spent the rest of my time in Delhi shopping around the malls. I wanted to catch a movie at the cinemas, but the timings are really bad. 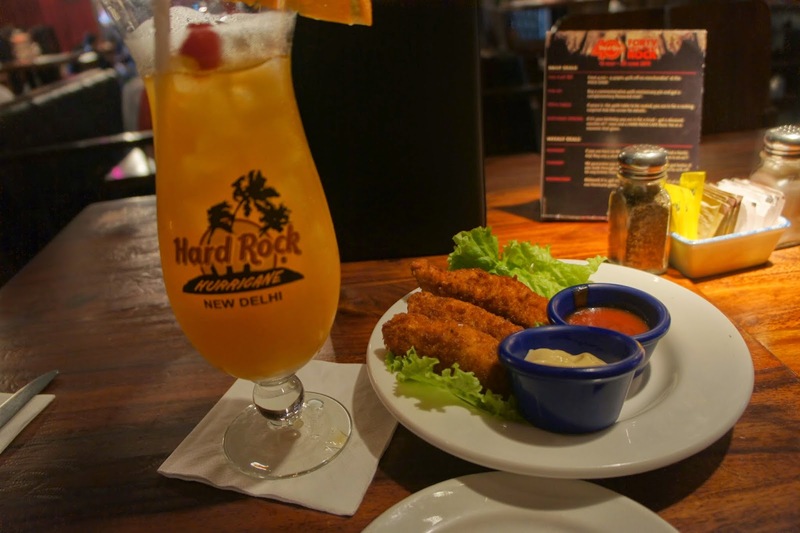 Headed over to the mall next door where Hard Rock Cafe is, had my lunch and bought some HRC merchandise before heading back to the mall next door. As I was walking pass coffee bean, I saw someone surfing net there. I check with the staff and they informed me that they do have free Wifi! 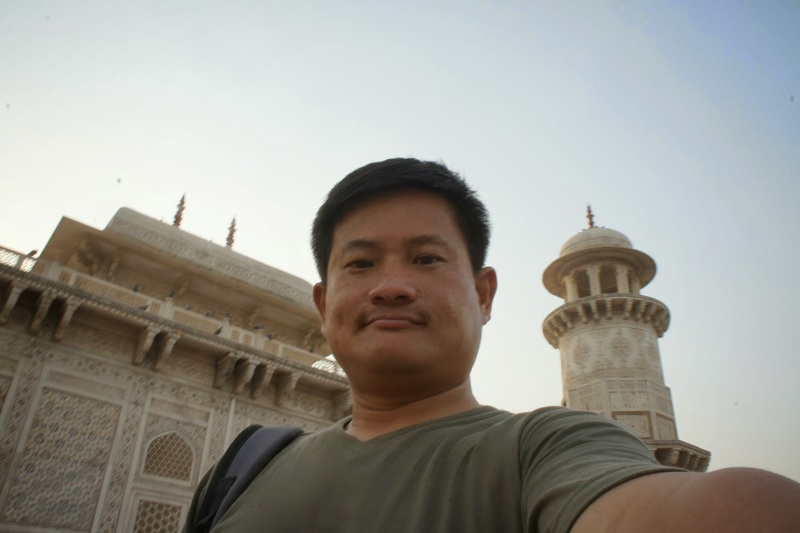 I went back to the hotel concierge and grabbed my macbook and spent about 2 hours at coffee bean surfing net and working on this blog. Soon it was time for me to head to the airport. The hotel has arranged a taxi for me to the airport. It arrived about 5 mins before the time I wanted to head to the airport. We reached the airport in about 30 mins. 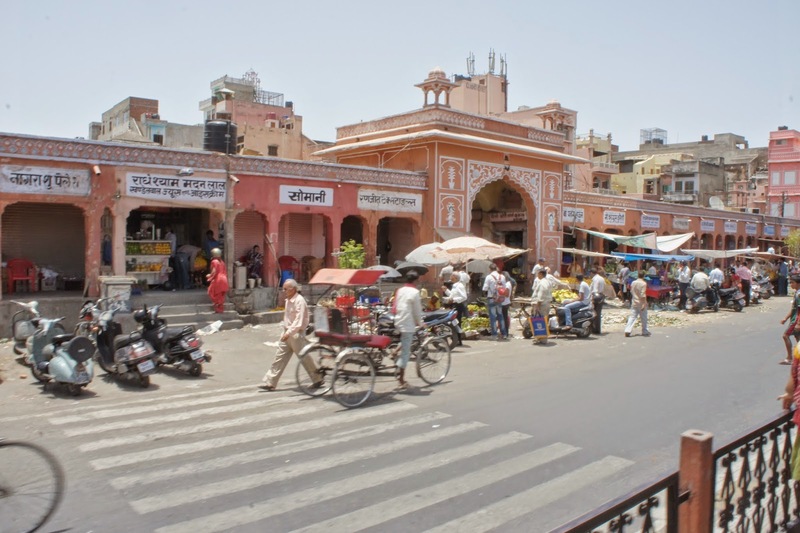 The traffic along the way was bad, with the constant honkings (I am rather used to hear honking in India after my 2nd day here). The checking in part was easy, but the immigration part was a chore. 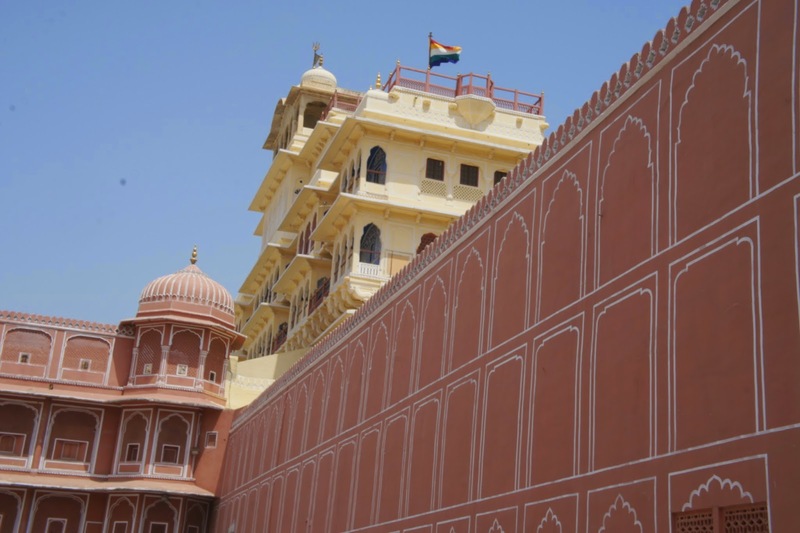 The amount of security here is ridiculous for India. Every bag has to have a luggage tag before they allow you to put them through the x-ray machine. Not having a luggage tag (well I was not told about the luggage tag thingy), I approached some Air India staff whom gladly gave me the amount I needed. 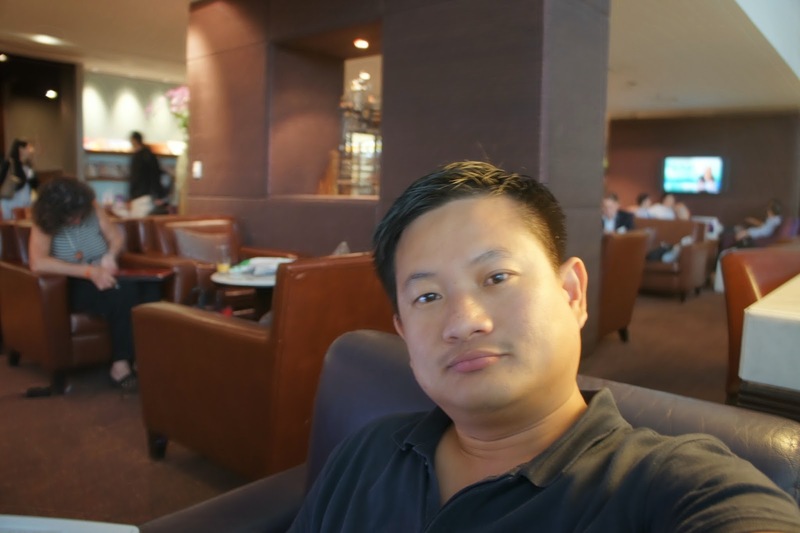 I went through the security checks with little problem and headed for the lounge to chill out before my flight. 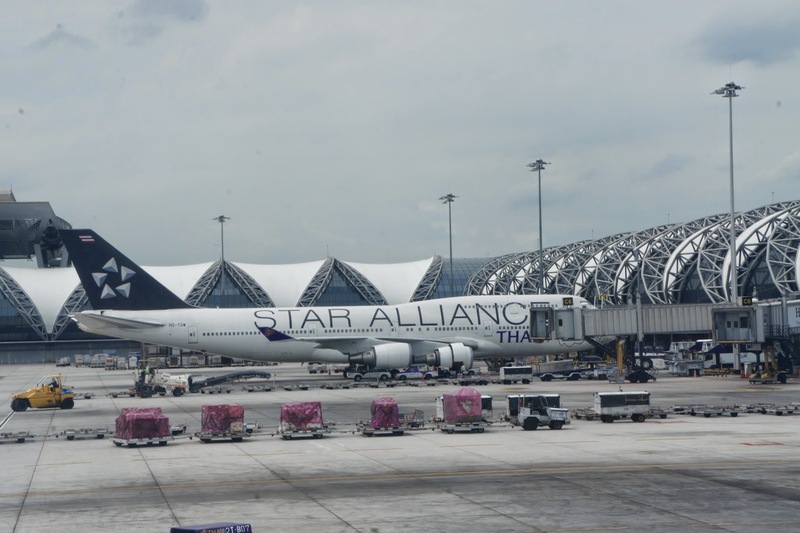 Arrival in Bangkok was early, I changed my flight to a later one as I was rather tired and was afraid that I might miss my flight from Bangkok to Singapore. 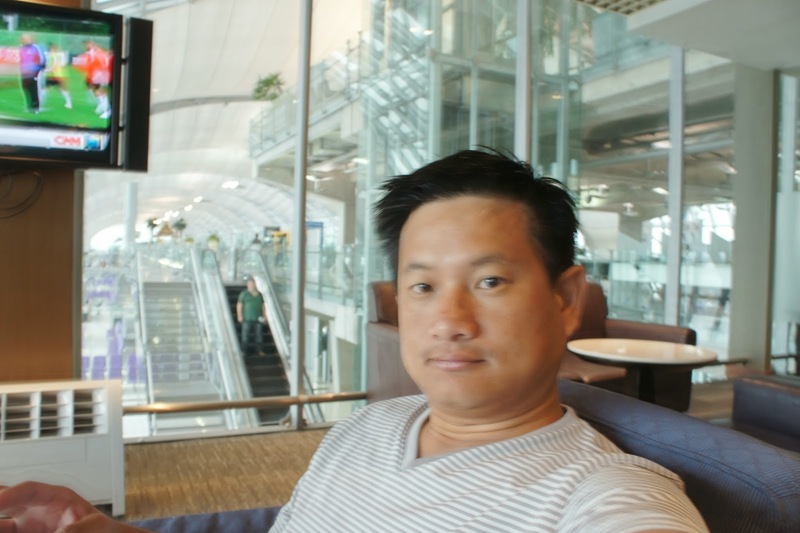 After changing the flight, I went to the lounge in Bangkok airport to sleep for another 3 hours (they do have slumber rooms in the lounge). Luckily I changed my flight, I would have missed my flight if I hadn’t. 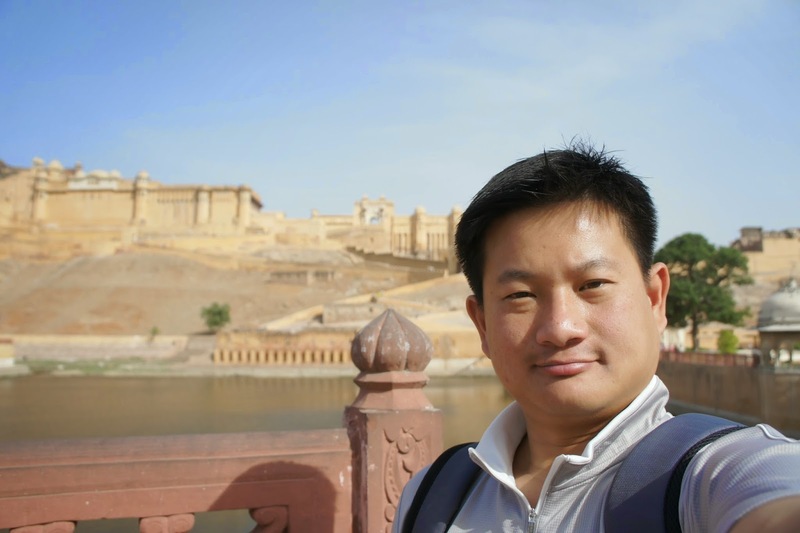 Soon it was time for me to board the flight back to Singapore, thus concluding my 1 week trip to India. 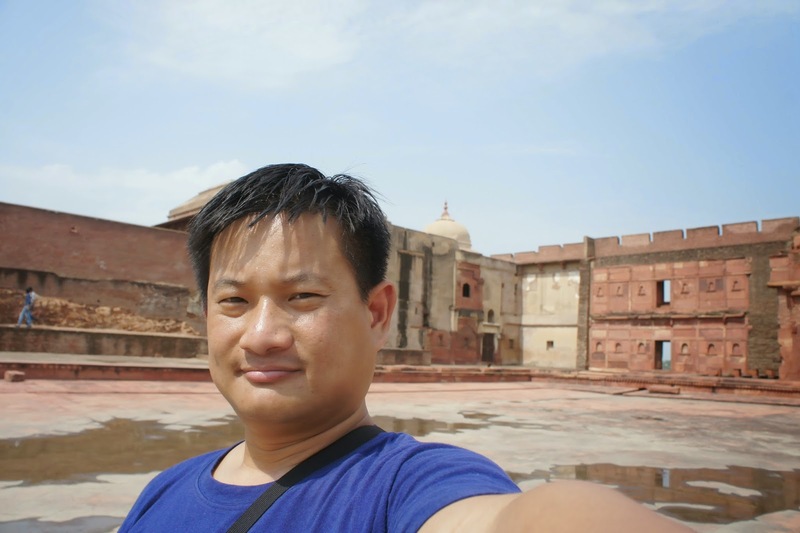 My deepest impression of the place is the heat! 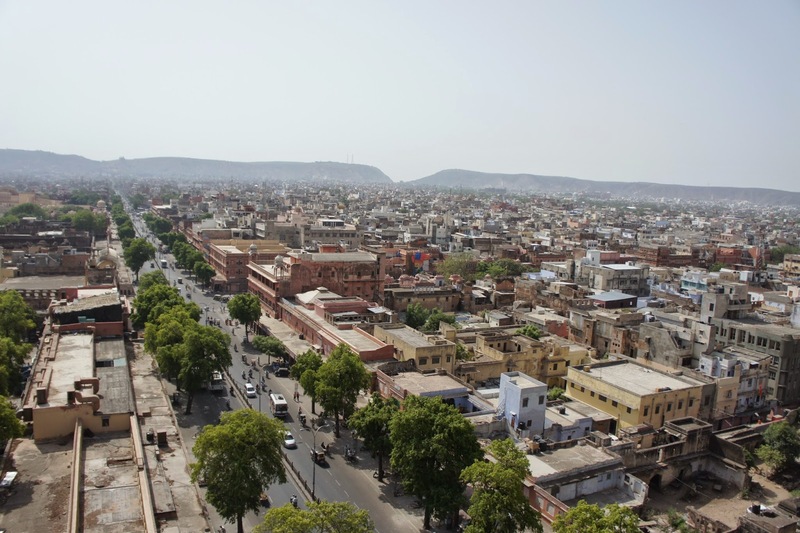 It was totally unbearable , especially in Jaipur, where it hit 47°C. I tried walking from one place to another, but the heat is just too much for walking. Dealing with touts and staff or even security personnels at the sites is another challenge too. Over the week I have learnt how to identify them and stand on my grounds that I did not ask for their service and was not obliged to tip them or give them what they ask for. Looking pass the exorbitant entry fee that foreigners have to pay over the locals (the locals only pay 10% of what foreigners pay), the constant honkings in Indian roads, the auto rickshaw drivers whom ask for ridiculous amount of fare seeing that you are a tourist, and the touts and tip askers, India is really a nice place to visit (if only the sun was more merciful), with monuments dating back centuries and the nice infusion of Muslim and Hinduism. 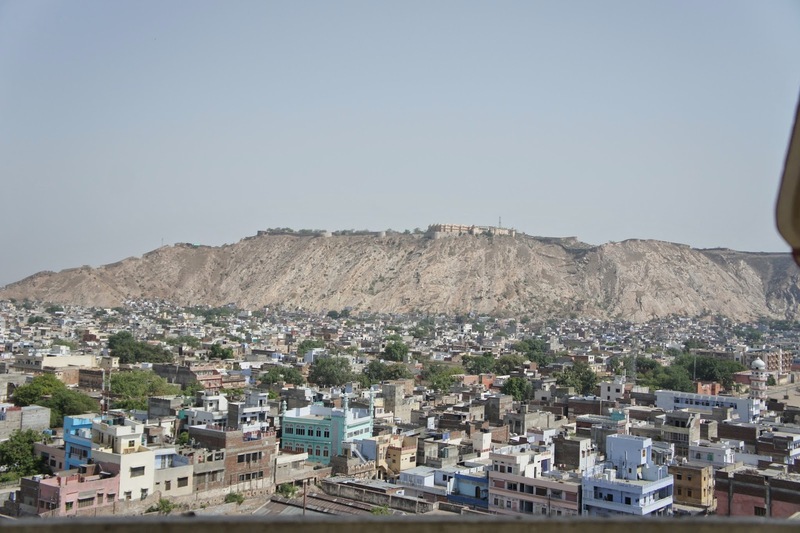 Well I am not sure if I will be back to India, if I ever come back again, I will definitely avoid summer, where I spent most afternoons in the hotel chilling out and head out again in the evening time. Started the day with a walk to the metro station. One of the reasons I chose to stay in this hotel is its proximity to the metro. To be frank I am quite sick of being a live target to the auto rickshaw drivers to be ripped off. I decided to minimise the need to use private transport and go with public transport instead. The metro station seemed nearby the hotel I am putting up on the map. However the walk proved that distance on the map is a delusion. Moreover walking in this hot weather is a killer. I was perspiring profusely while walking to the metro station. Entering the metro station was a life saver for me. 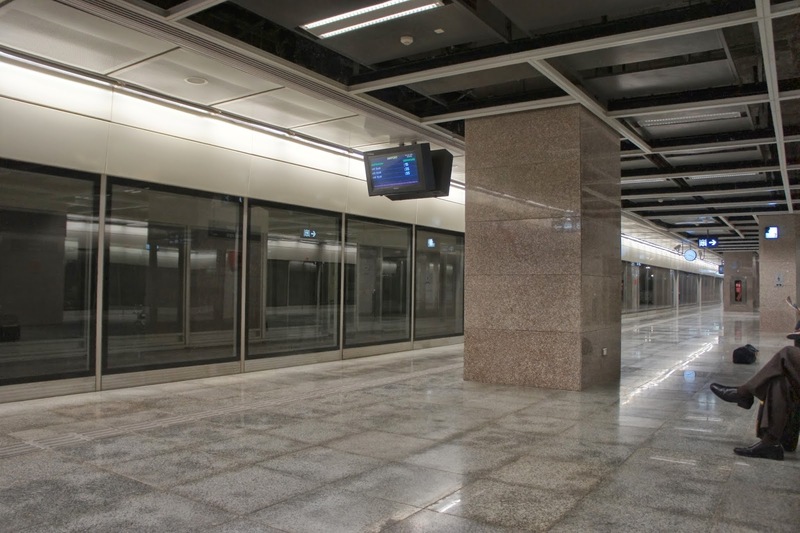 The air conditioning in the metro station cooled me down in no time. 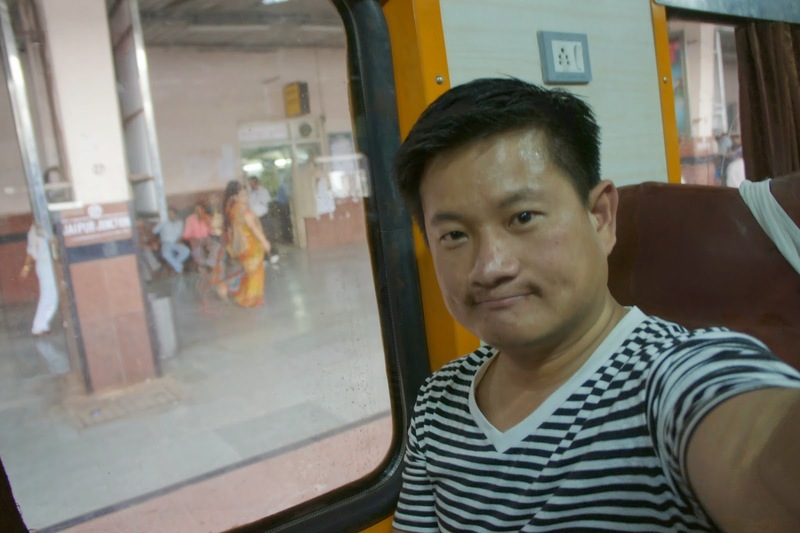 Got a multi trip ticket at 100 Rupee and off I go in the metro to my first destination – India Gate. 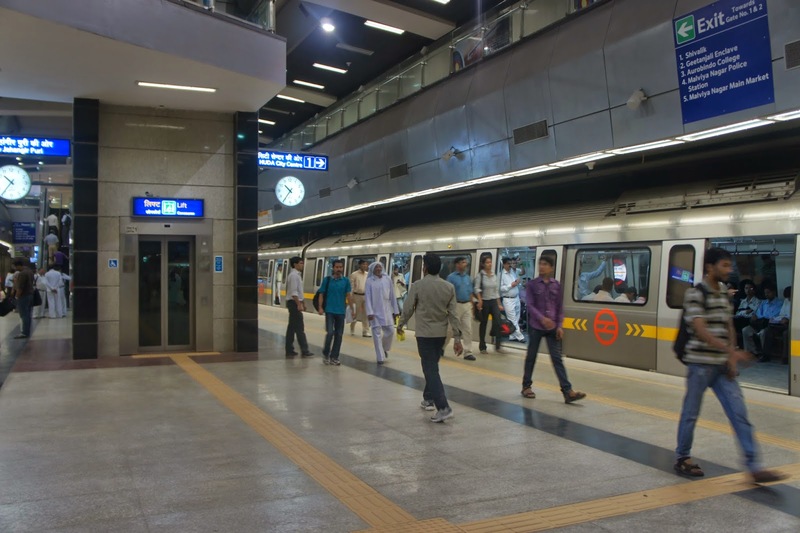 I would say the metro in Delhi is very clean and efficient and it was a good way of traveling around away from the heat. 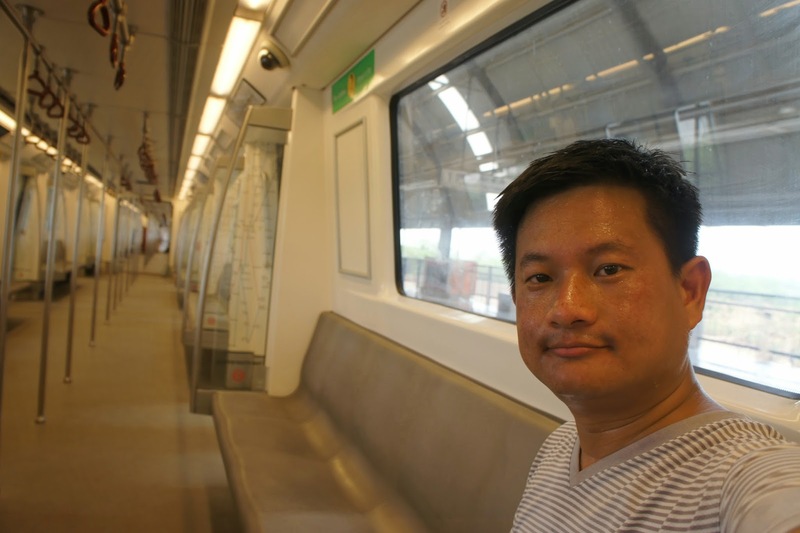 The air con in the metro train was also very powerful, making me forget how hot it is on the surface. I reached my station in no time and as I walked out of the metro station, surprising the usual congregation of touts are nowhere visible. 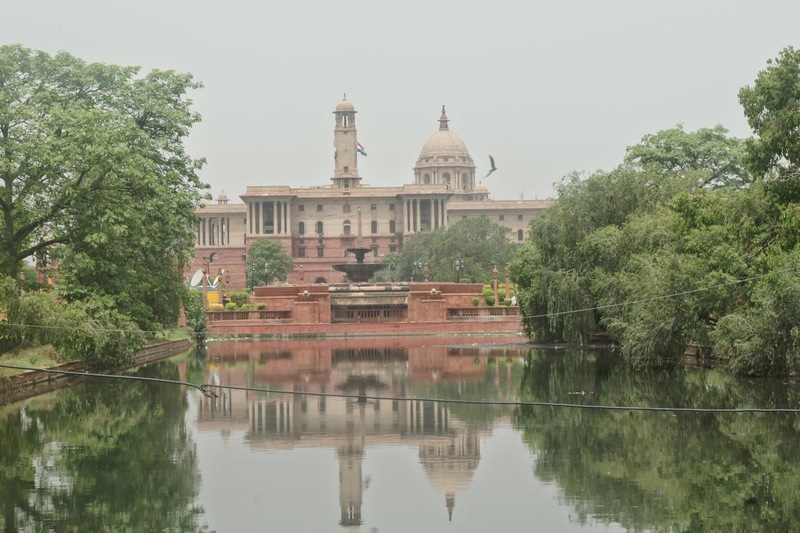 Well I am not complaining about it, though the weather was as hot as ever, I was enjoying my quiet morning walk towards the India Gate. 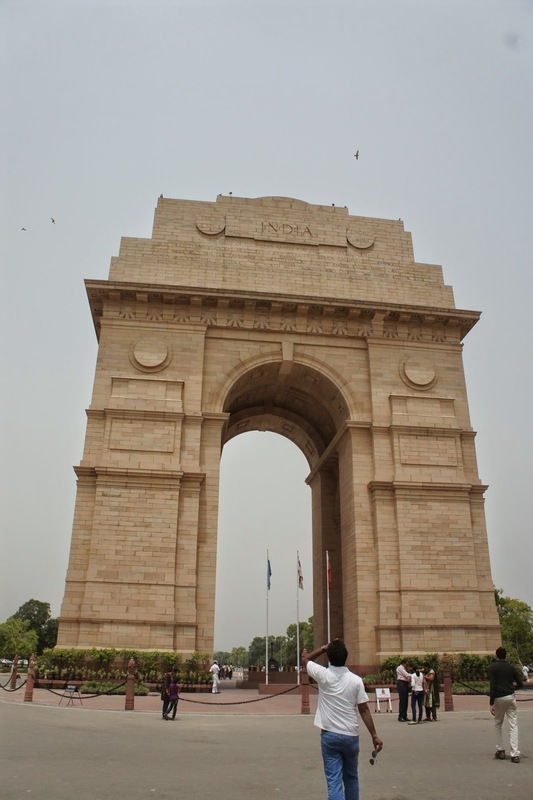 To get to the India Gate, I have to walk through this boulevard that leads towards the Gate. 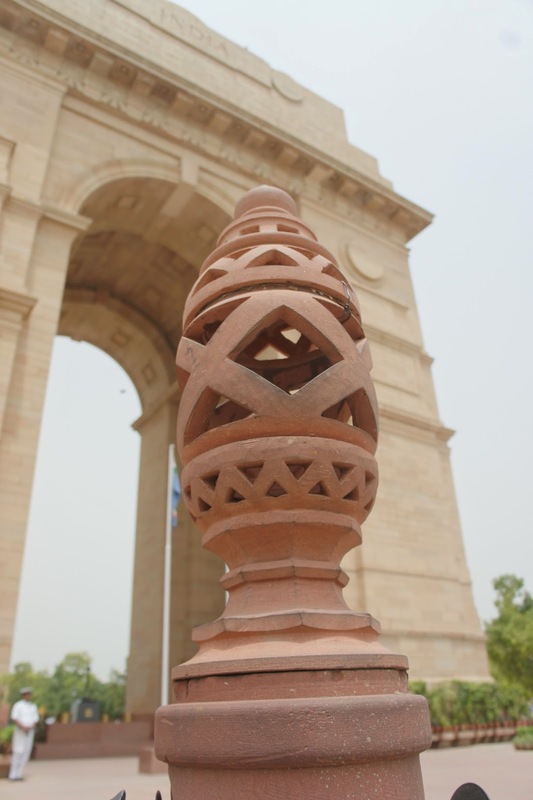 At the start of the boulevard, it is not difficult to spot the India Gate. 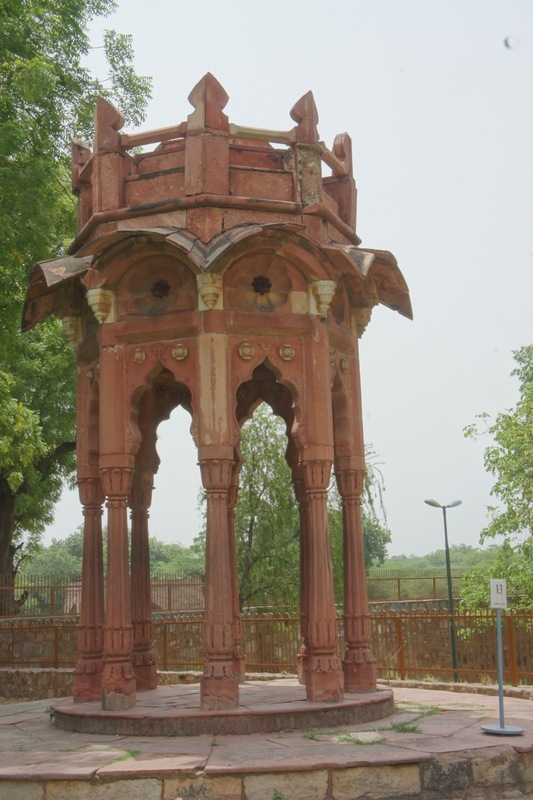 It was standing there solemnly mourning for the demise of the Indian soldiers it was purposed for. As I was walking down the boulevard, I began to perspire profusely again. 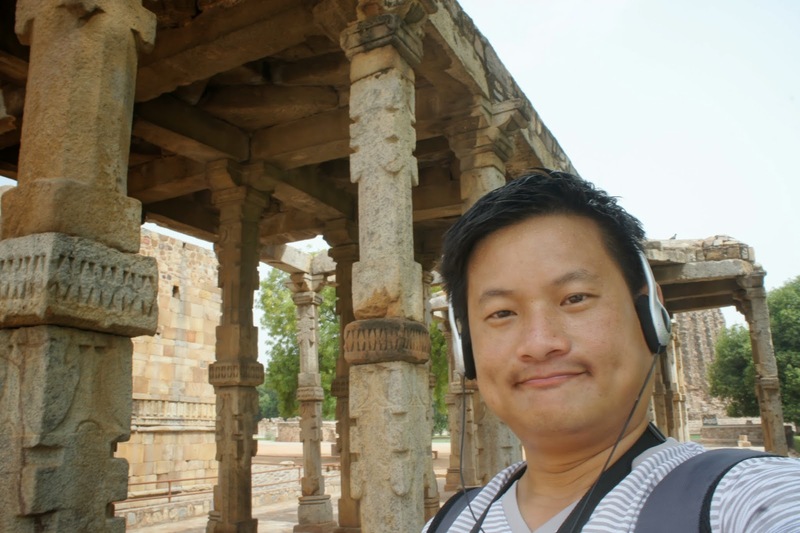 Damn after being in India for about 1 week, I am still not getting use to the heat. 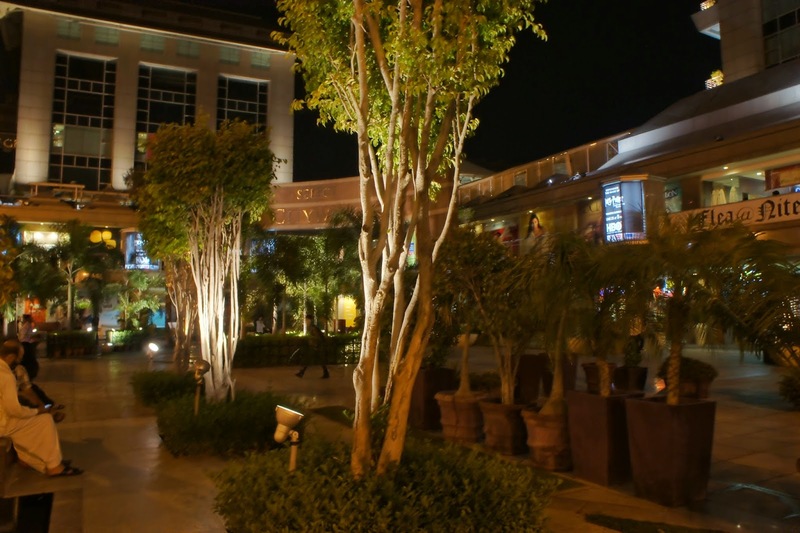 I was so tempted to hit the greeneries by the side of the boulevard where it was decorated with trees, and where most of the locals hang out to cool themselves off the summer heat. However I persisted on walking under the ever merciless sun towards my destination. 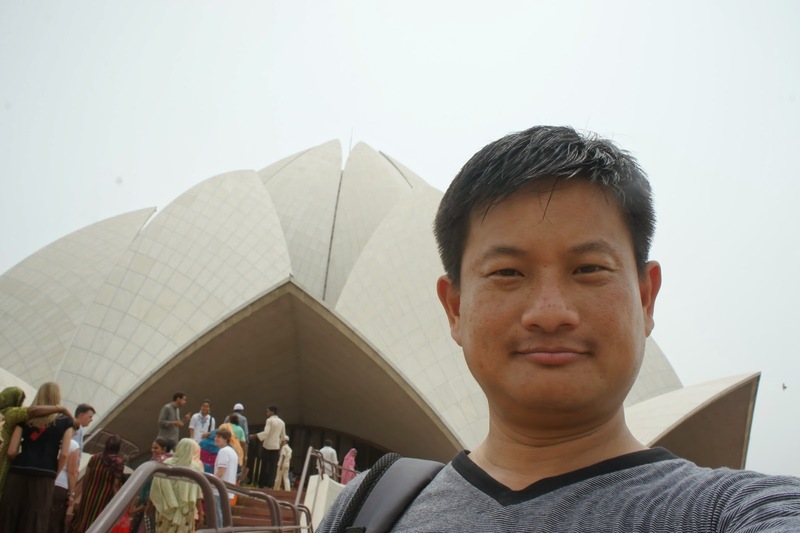 As I was about to reach my destination, an auto rickshaw pulled up and asked if I am going towards the India Gate. At this point I was about to give up, however with no intention of hopping on. I nodded to the driver and asked how much would he charged me for the very near trip. 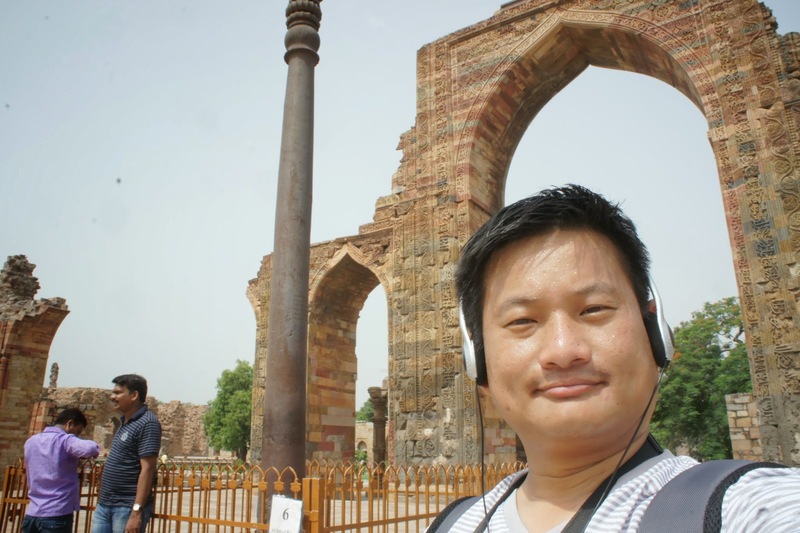 Before stating the price, the driver asked where I am going next after the India Gate. Guess he did not think I will spend the whole day there. 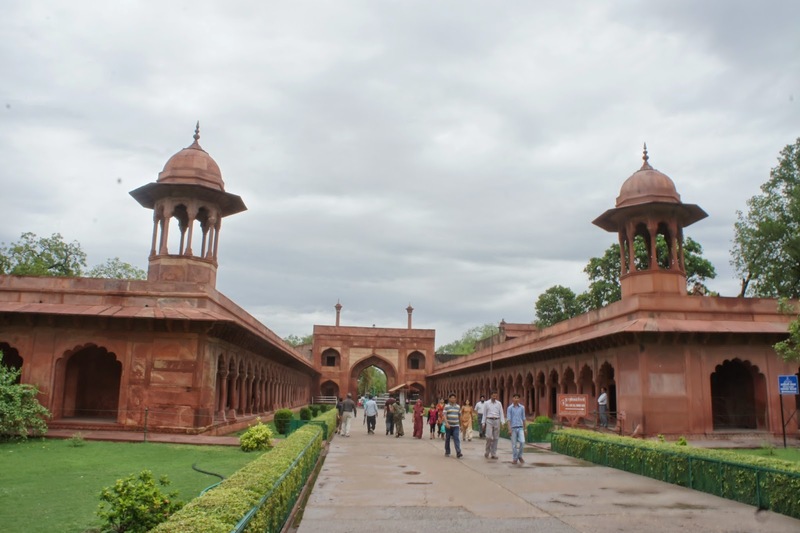 I told him I am going to Purana QIla. He then quoted me 50 Rupees. I counter offered him 30 rupees, and he agreed. 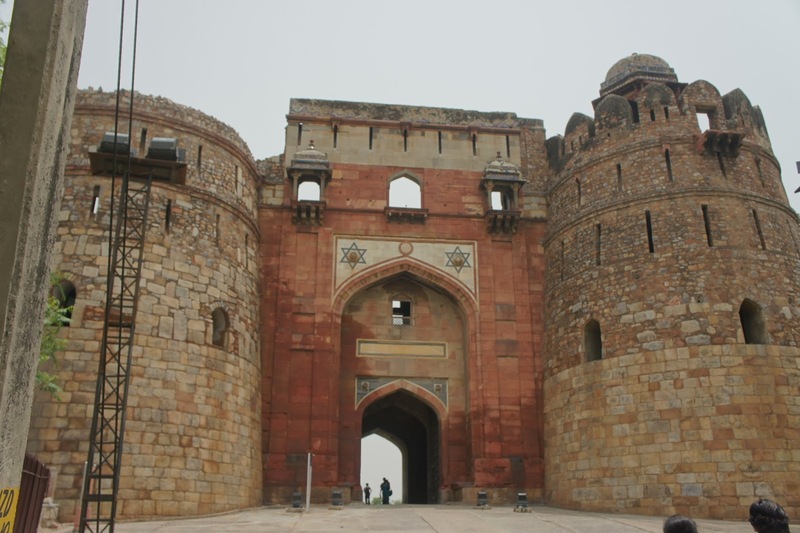 Without much hesitation I hopped onto the auto rickshaw as I thought I would need get an auto rickshaw to Purana Qila anyways. 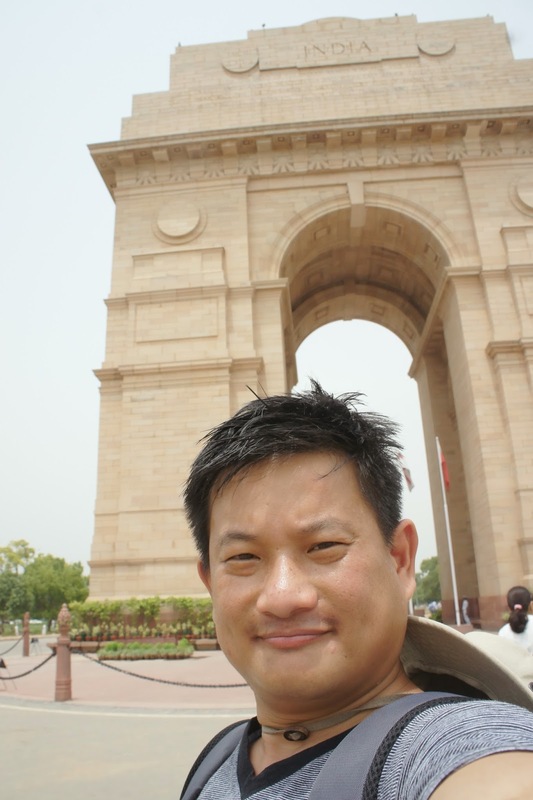 We reached India Gate shortly (it was really close where I boarded the auto rickshaw. 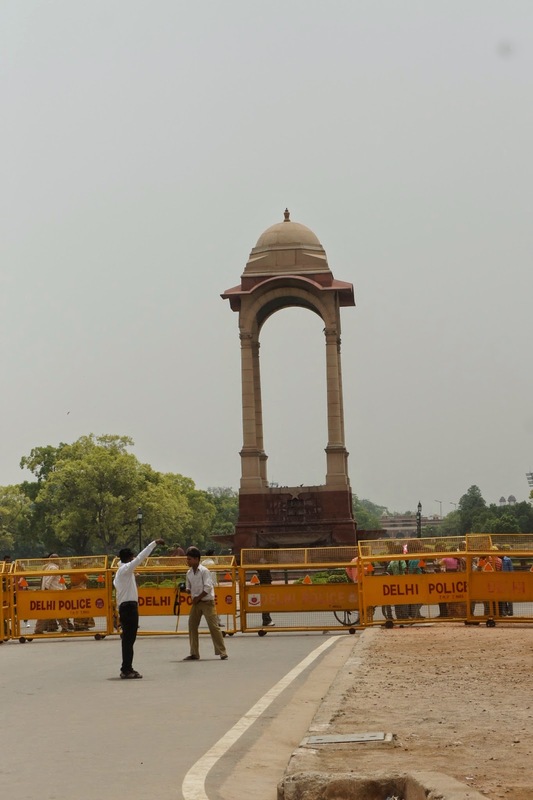 I got off the vehicle and told the driver I will only take 5 mins tops and headed over to the India Gate. It looked solemn standing there like a soldier, mourning for the lost lives who fought for the Brits during World War I. 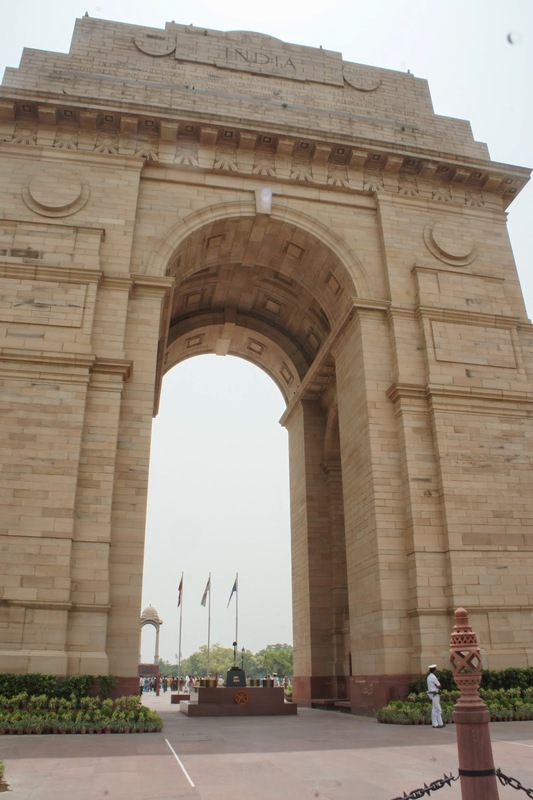 It is similar to the “Arc de Triomphe” of Paris, but looked slimmer and one cannot climb up to this gate unlike the Arc. Well it does serve its purpose of remembrance. On the main beam, carved the word “India” and below it the words “To the dead of the Indian Armies who fell and are honoured in France and Flanders Mesopotamia and Persia East Africa Gallipoli and elsewhere the near and the far east and in sacred memory also of those whose names are here and who fell in India or the north-west frontier and during the Third Afghan War”. 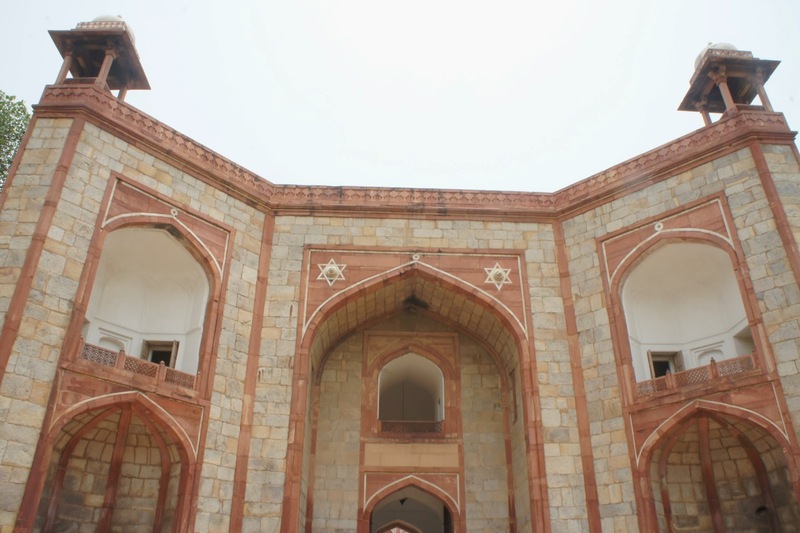 On the walls of the gate, both inside and outside are carved the names of those who perished during the war. 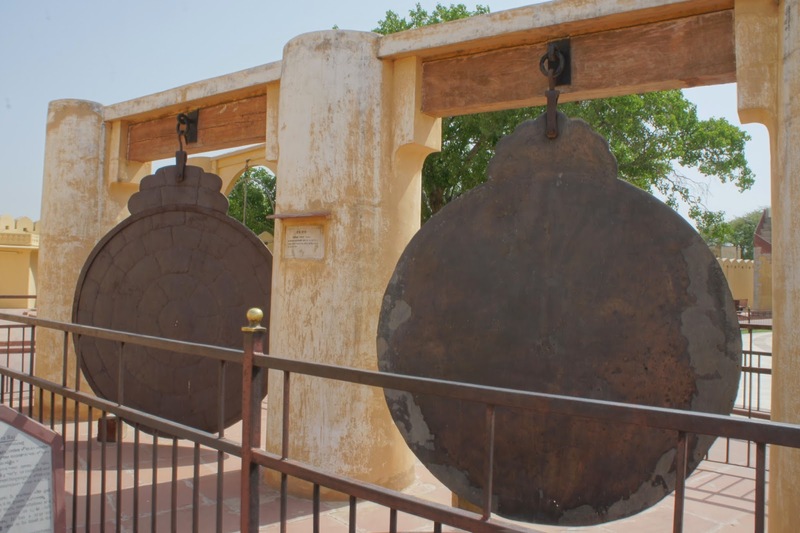 There was four drums at the bottom of the gate, but strange enough, only one was burning. Too bad the gate was cordoned off, I guess to prevent people from vandalising it. 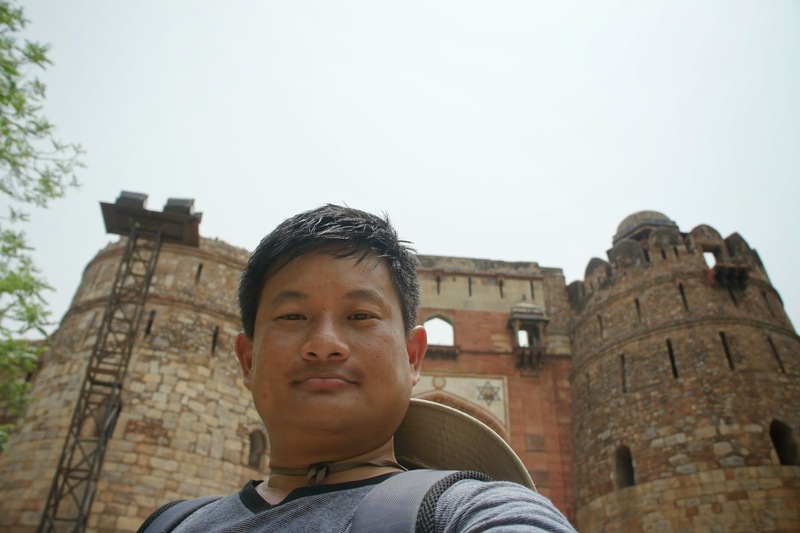 I walked a few circles around the gate, took a few more pictures before heading back to look for the auto rickshaw which brought me to my next destination. 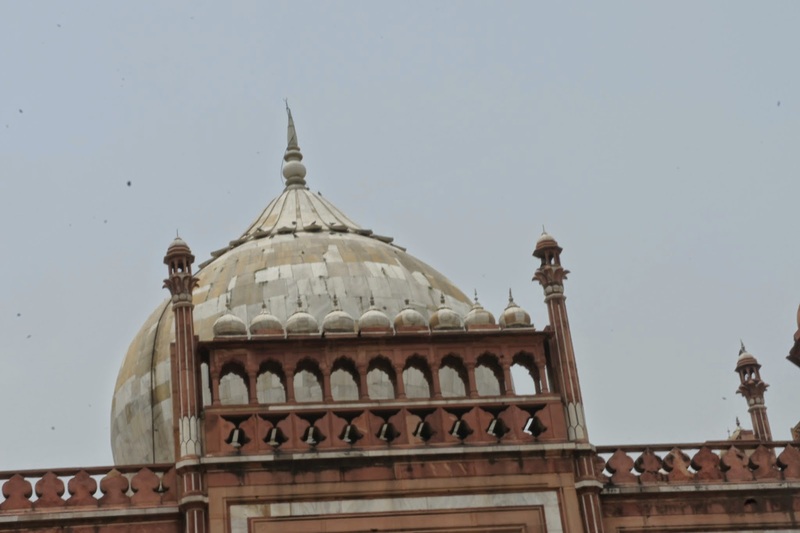 The next destination is about 5 minutes ride from the India Gate. 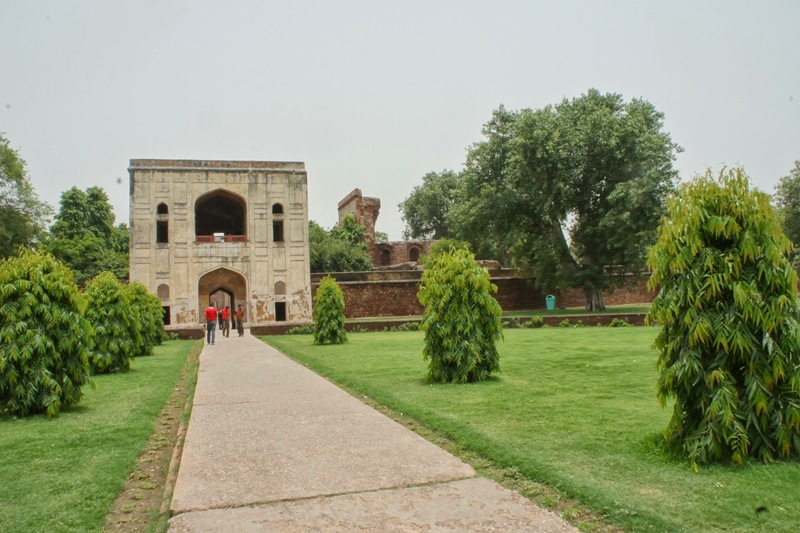 Purana Qila, or Old Fort which it was commonly known as to the locals, was next to the zoo. 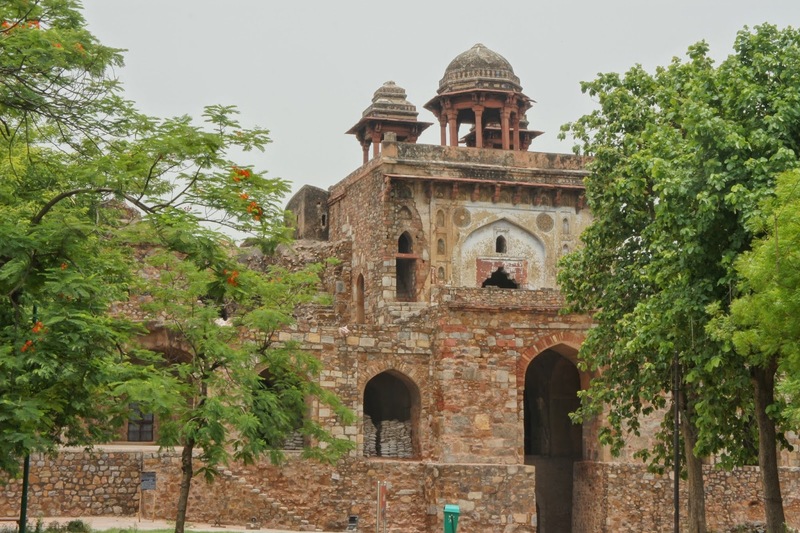 The Old Fort, which predates Red Fort, was the oldest fort in Delhi. 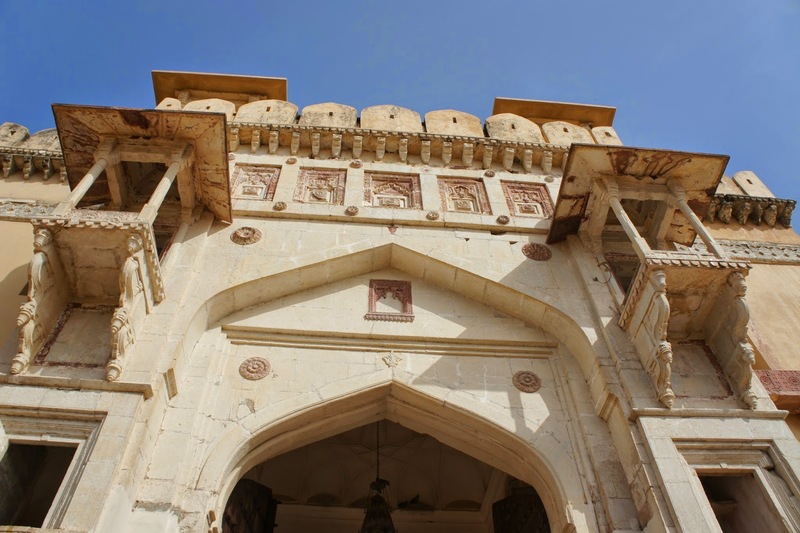 The main fort gate was Persian and Muslim influenced in its design and having 2 cylindrical tower beside it. 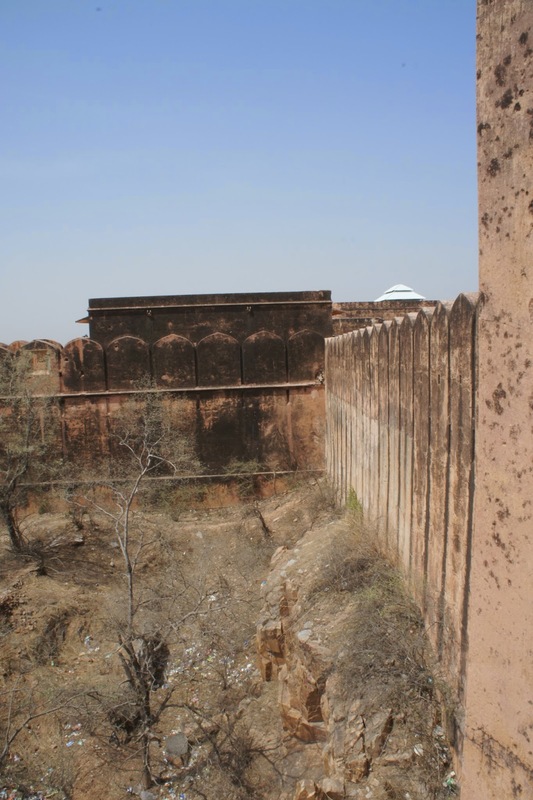 The walls of this fort looked rather ruined from the other side, once I have passed the gate. I could see ruins along the wall. Passing the gate was a huge garden. 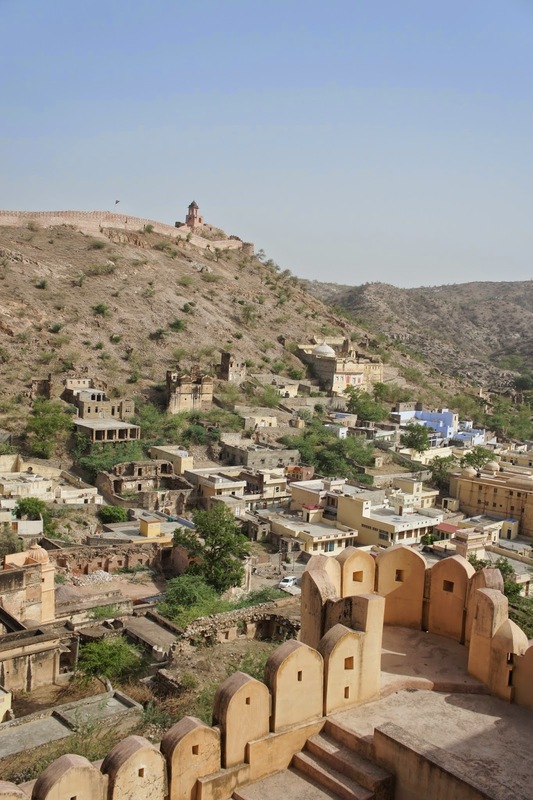 I read from the guide book that this fort now functioned as a garden, where the locals hang out. 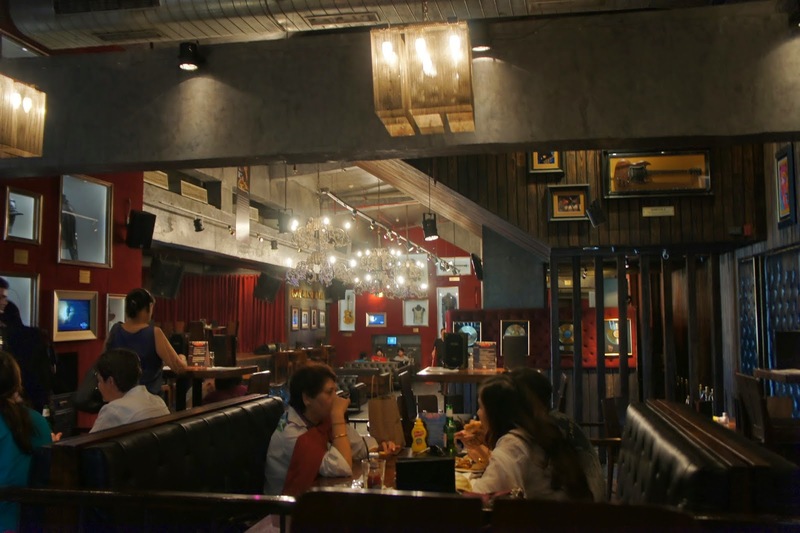 True enough, it has became a popular spot for lovers whom come here for their dates. Across the gardens, I can see a building with a dome on top of it. Instead of heading that way, I headed for the right gate. 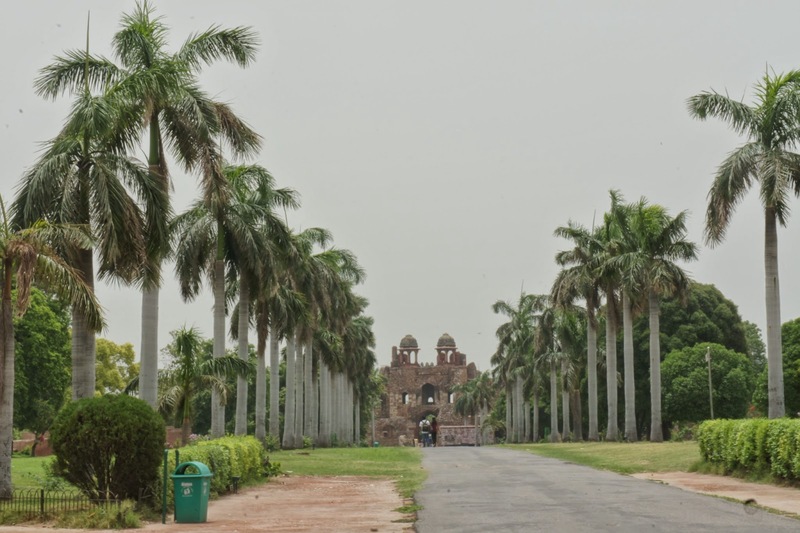 The way to the right gate was decorated with coconut trees. From far, I can see a gate like structure with 2 pavilions on top of it. Walked towards it and snapped some pictures of it. 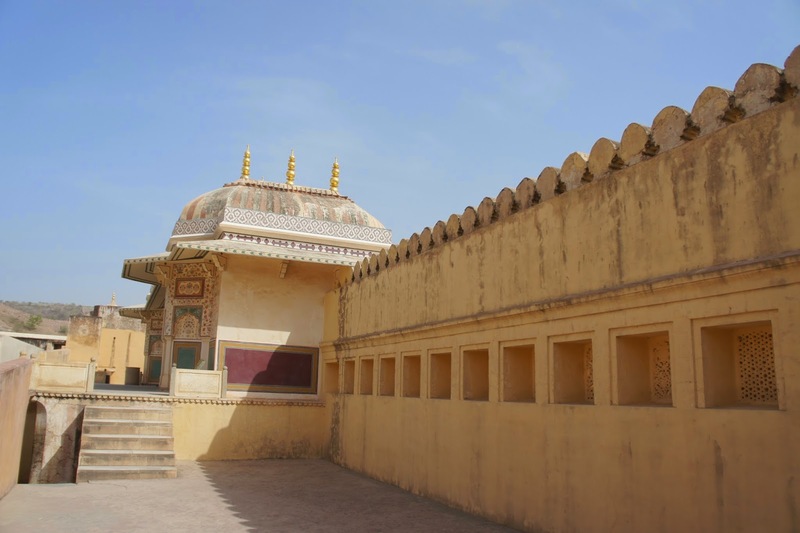 Other then looking ruined and the 2 distinctive pavilions, there was nothing really much about this gate. There seemed to be some restorations going on, which prohibits me from going under the gate to see what’s on the other side. 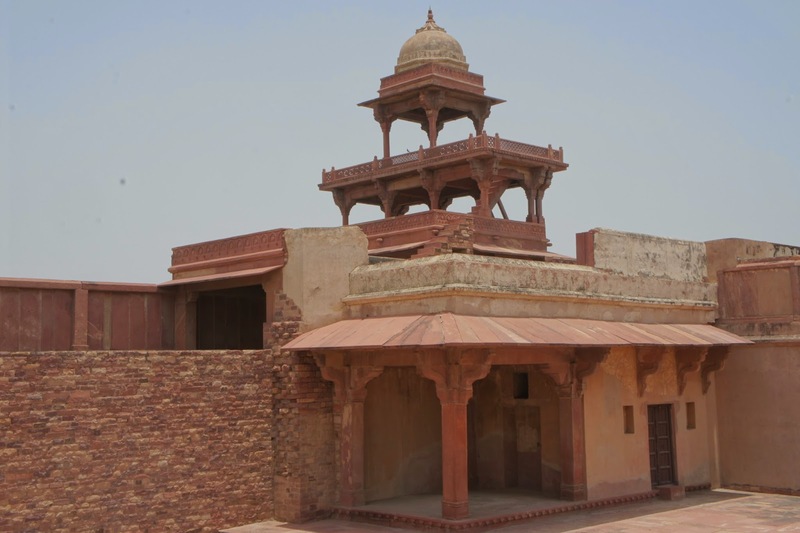 Turning back, I headed towards this lone building in the fort. 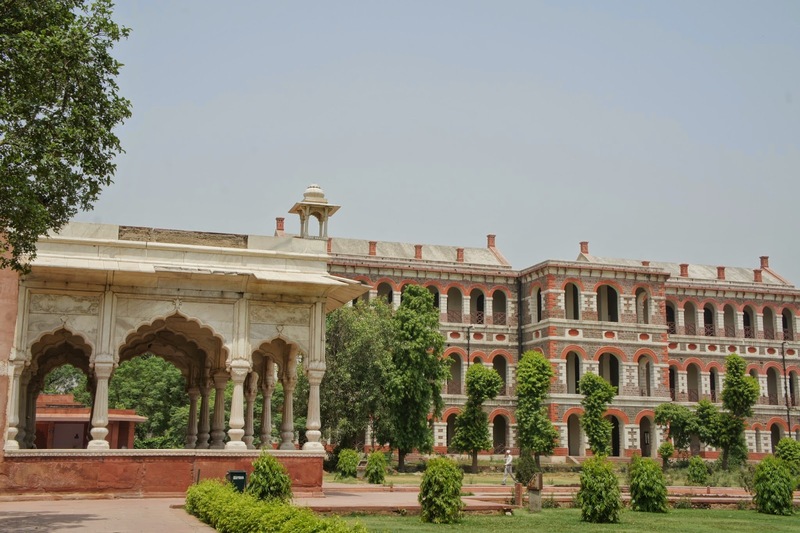 This octagonal lone building served as a library and the first observatory in Delhi. However it was sealed and there was no way of gaining access to the inside of this building, thus I headed towards the building next to it. 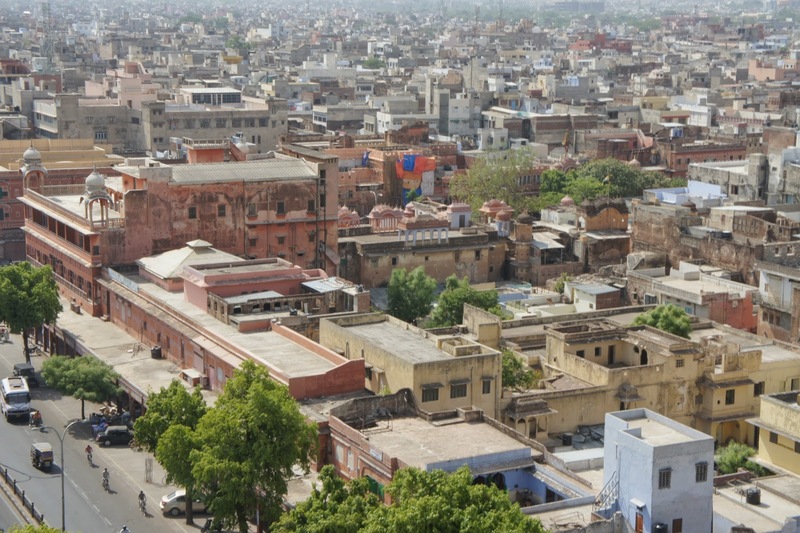 Not far from the library was a mosque. 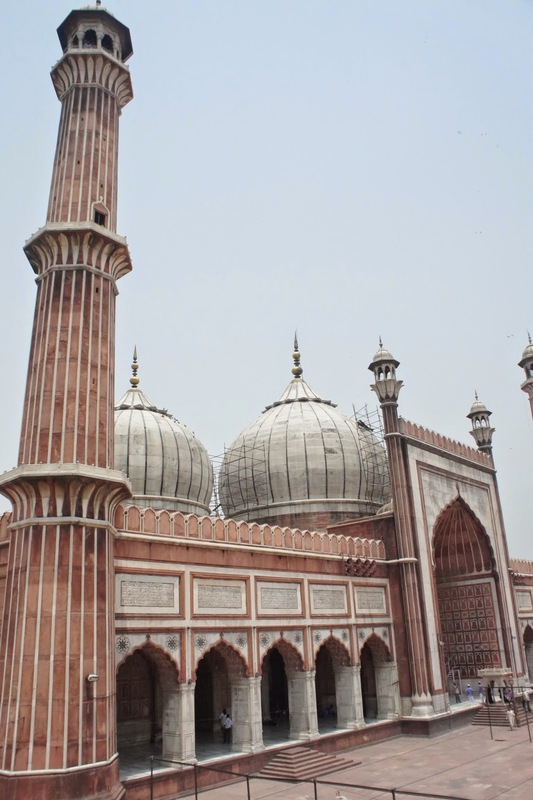 This suggested that India was heavily influenced by Muslims in its earlier days. 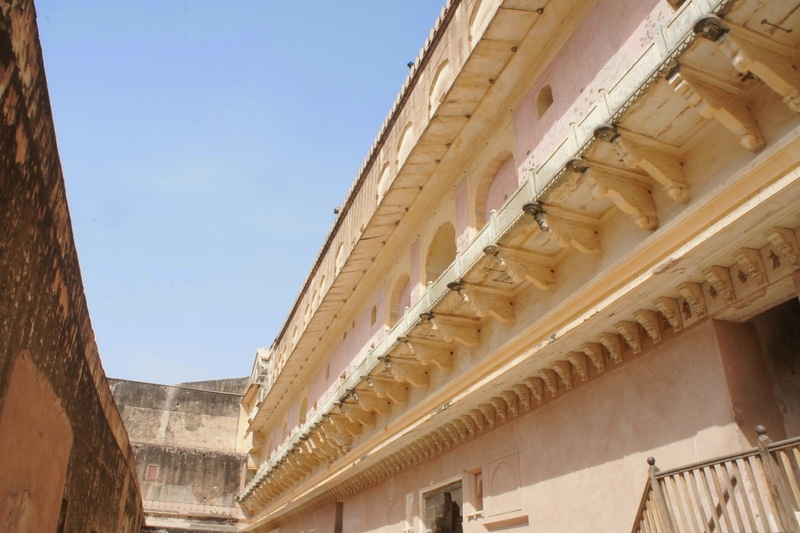 This is perhaps one of the most well preserved building in Old Fort as it has not lose its grandeur. 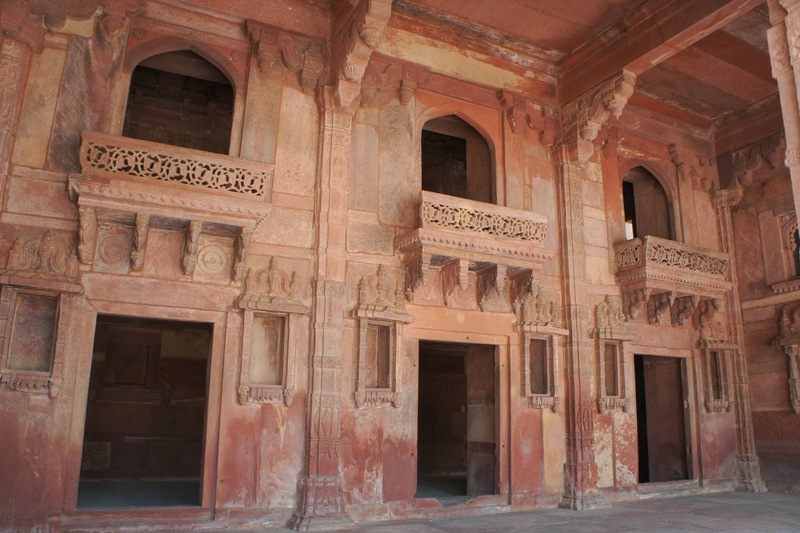 The red building seemed to be partly built of white marble, has some Islamic or perhaps Arabic inscripted on the walls. 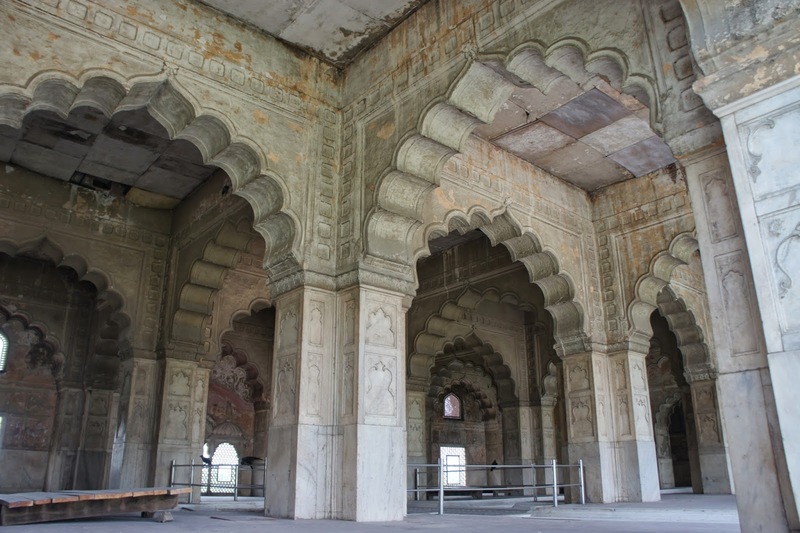 The arches, however has some lotus buds carved onto it. 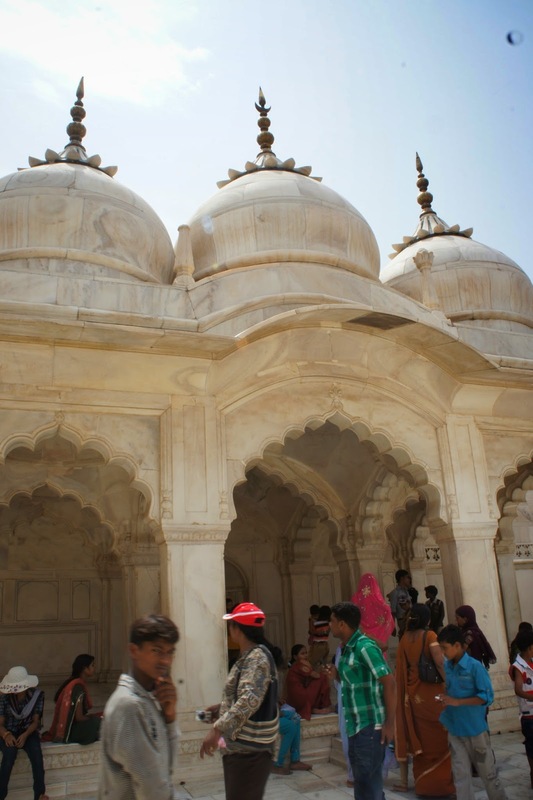 Looked like a Hinduism and Muslim has well been integrated into the design of this mosque. 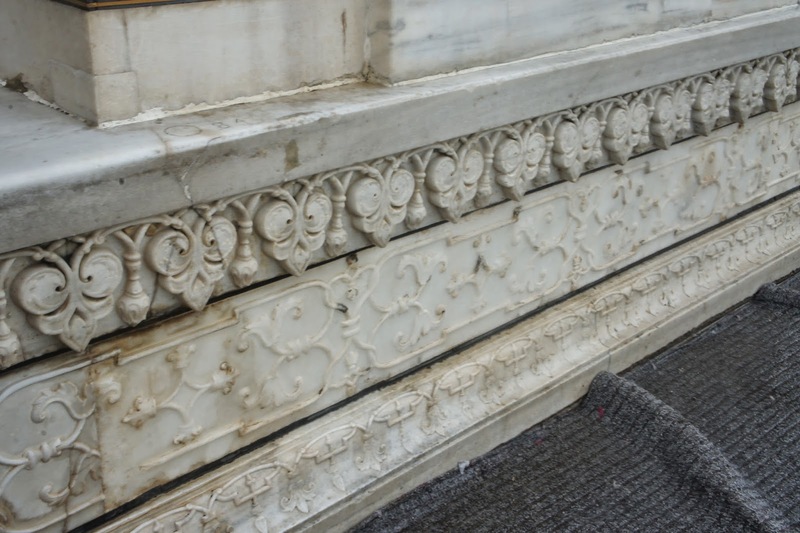 I headed inside the mosque and saw the main praying wall was made of white marble. 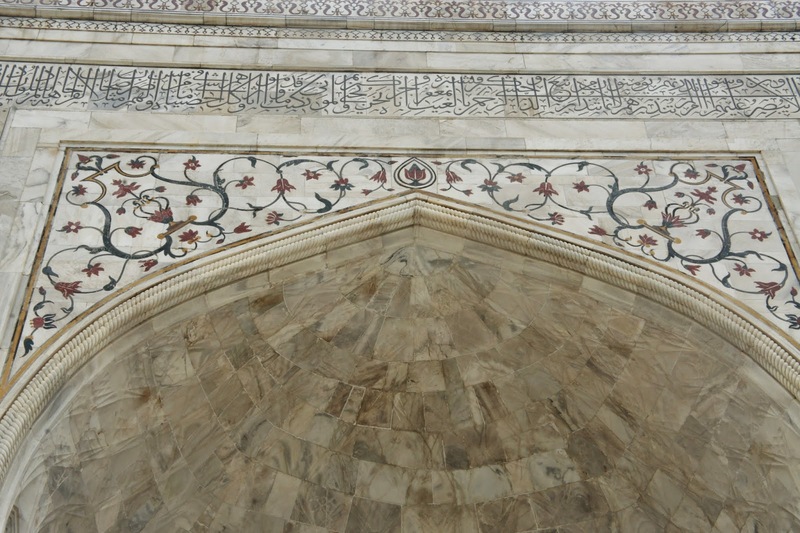 The walls near the dome has some Persian looking designs on it. 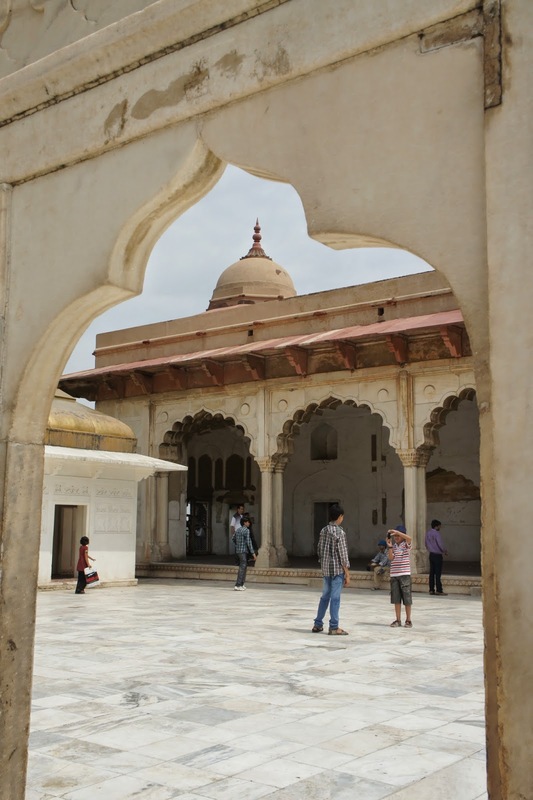 This mosque certainly has not lost its characteristics all these centuries. Exiting the mosque, I went to the Gate to the left of the main gate. 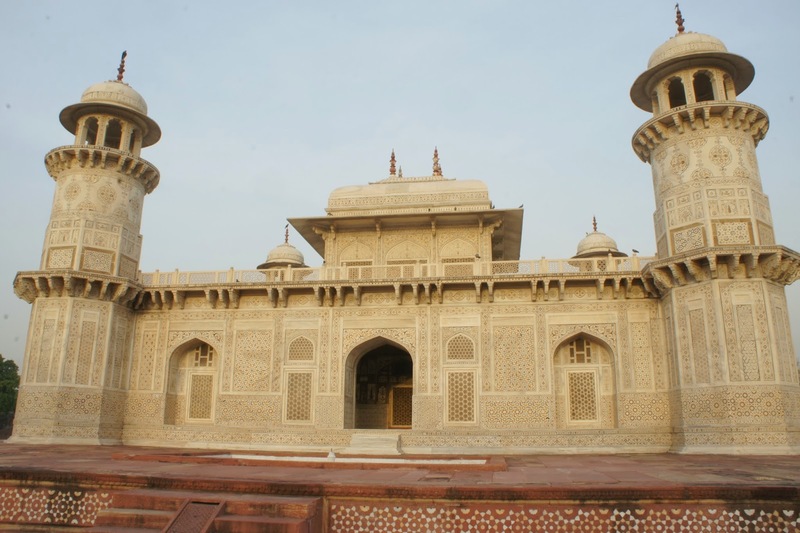 This gate was similar to the other gate opposite it, but has only 1 pavilion instead of 2. It seemed like the restoration works never took place for these 2 gates. 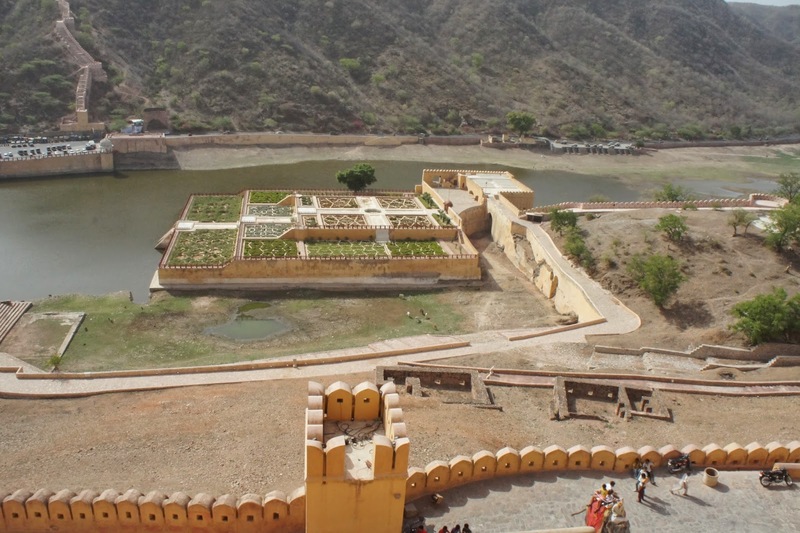 As the rest of the Old Fort has been converted into a garden, there is really nothing much to see here. I headed to my next destination. 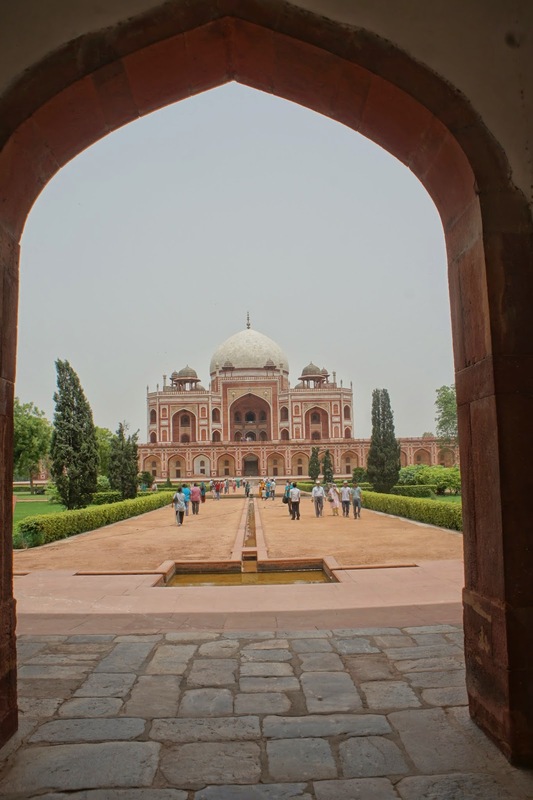 My next destination was Humayun’s Tomb. 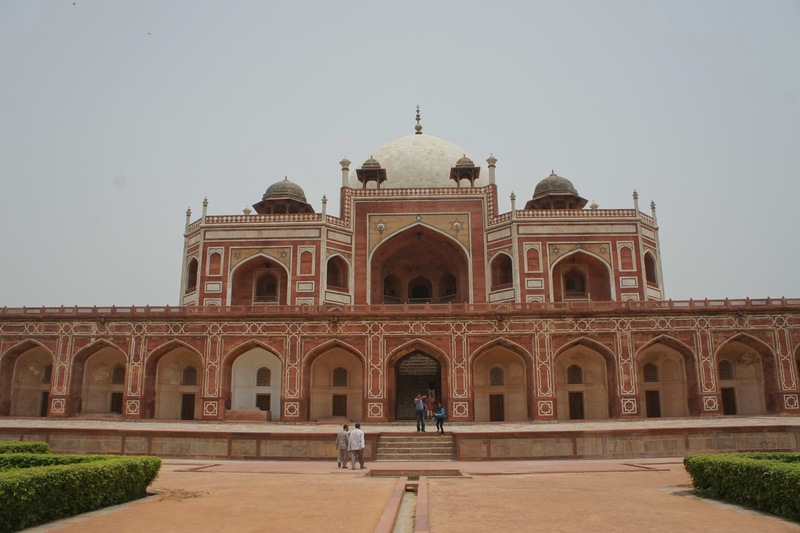 Humayun was a Mughal Emperor and this tomb was certainly befitting of an emperor. After getting the tickets, instead of heading straight for the tomb, I took a right turn and went to the side garden instead. Through the side gate was 2 buildings next to each other. 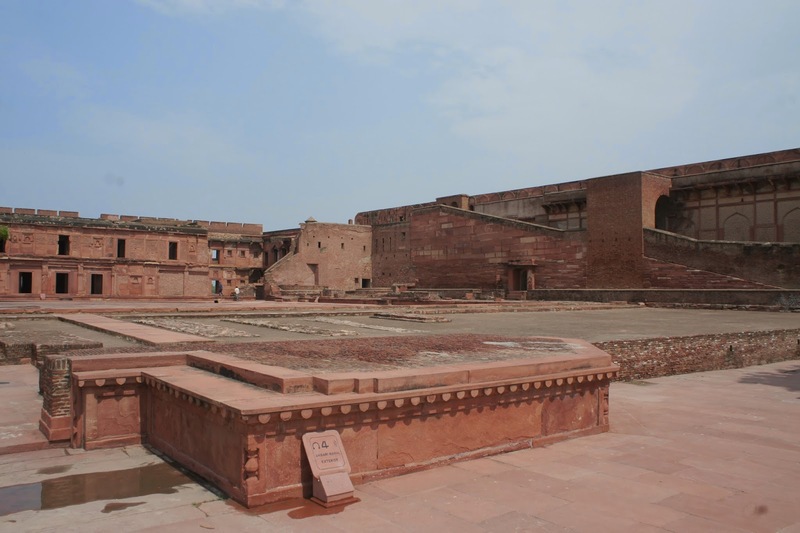 The smaller squarish building was a tomb, whereas the larger rectangular building was a mosque. 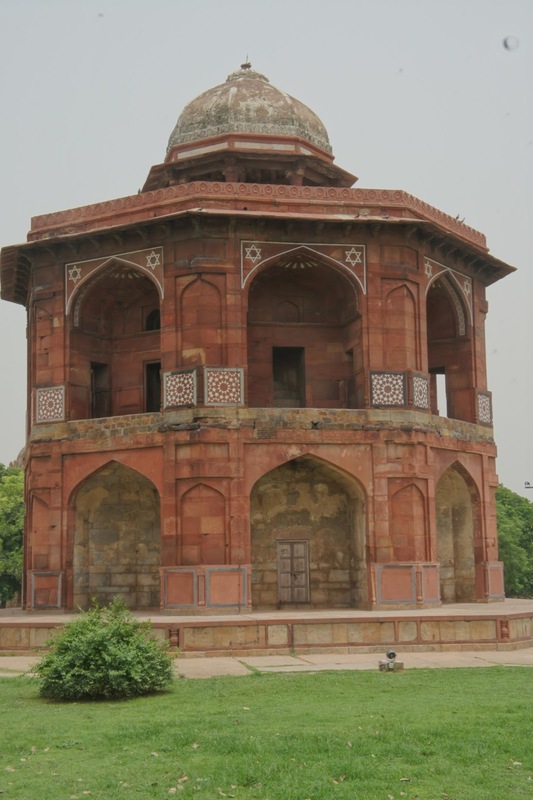 This little corner seemed to be masked by Humayun’s Tomb, as no one was passing through this quiet area when I was there. 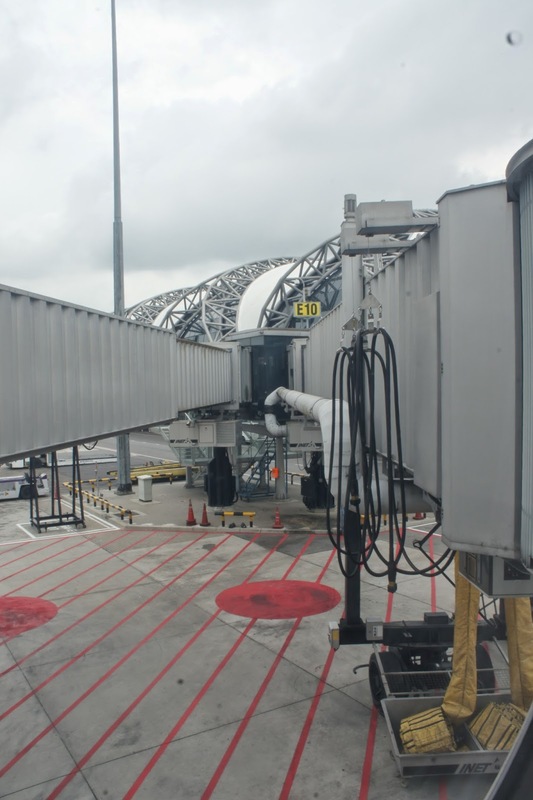 I took some pictures and headed out from another gate. 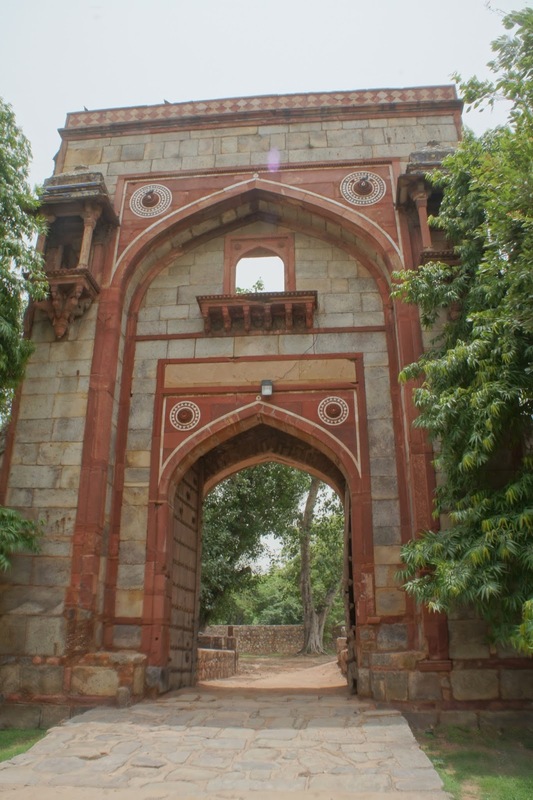 The main entrance gate to Humayun’s tomb was immediate after this side gate. 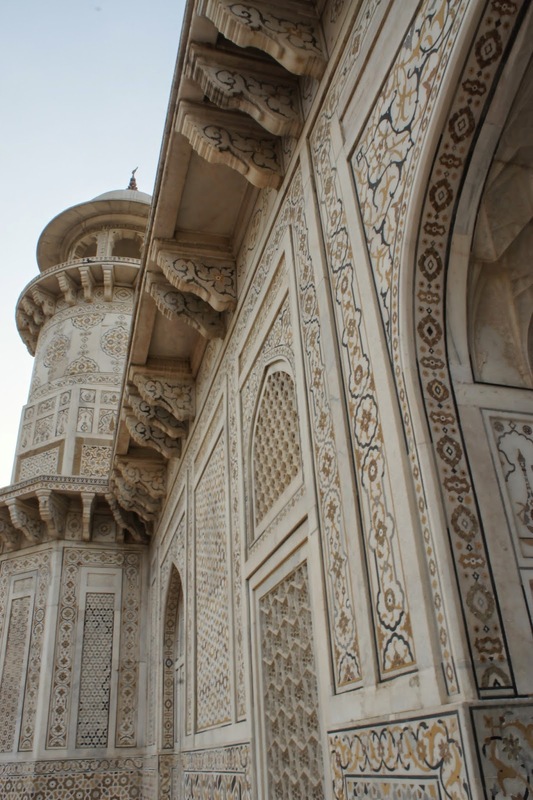 Even the main gate to the emperor’s tomb looked grand. 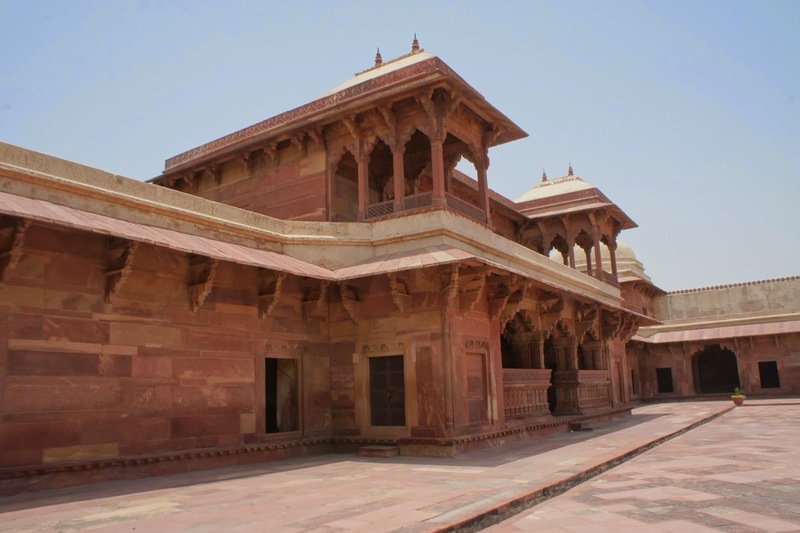 The white coloured building, brimmed with red sand stones has 3 faces to it and 2 pavilions on top of them. 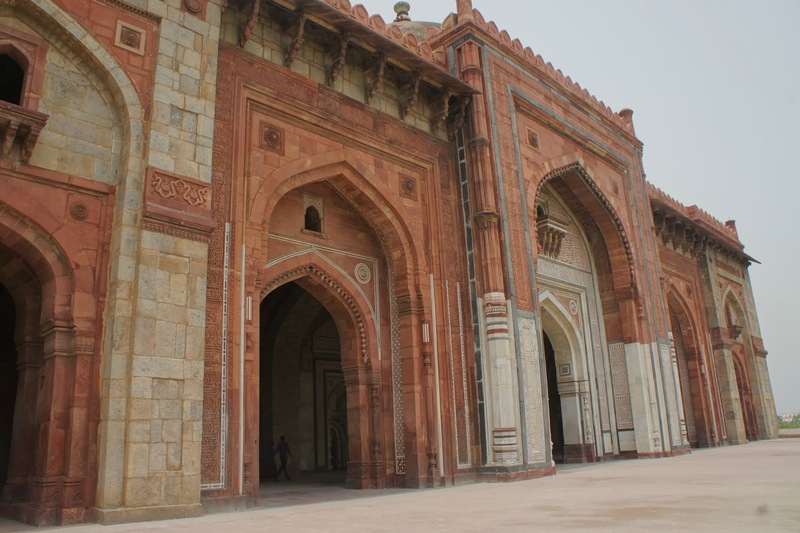 The architecture of this gate was heavily influence by Islamism. 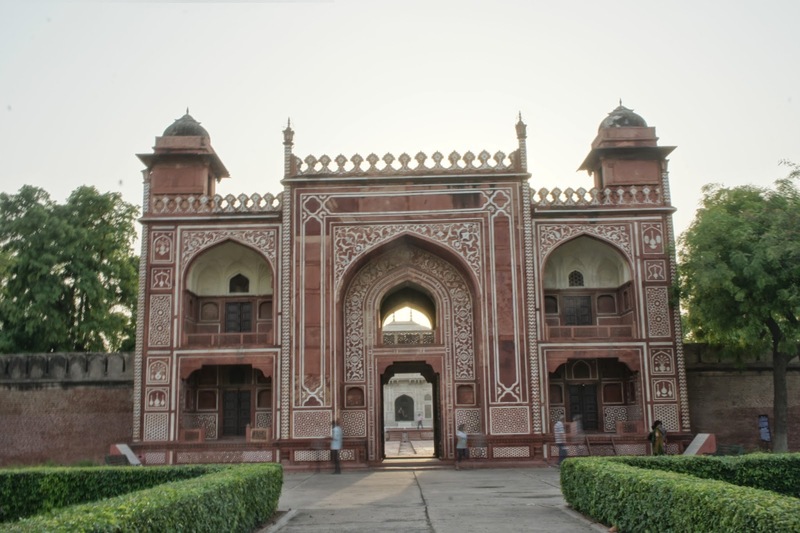 Passing through the main gate was the Tomb! Man, it really looked huge. From far, it looked like a large scale mosque. 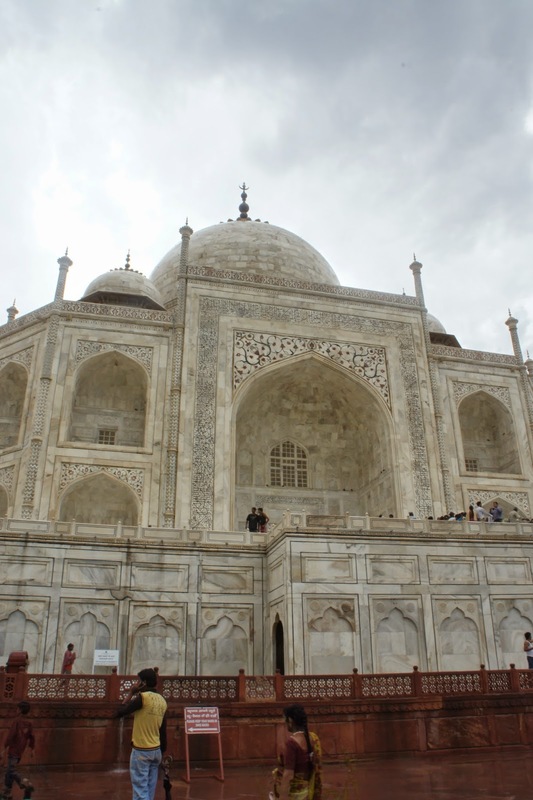 its construction was pretty similar to that of Taj Mahal. 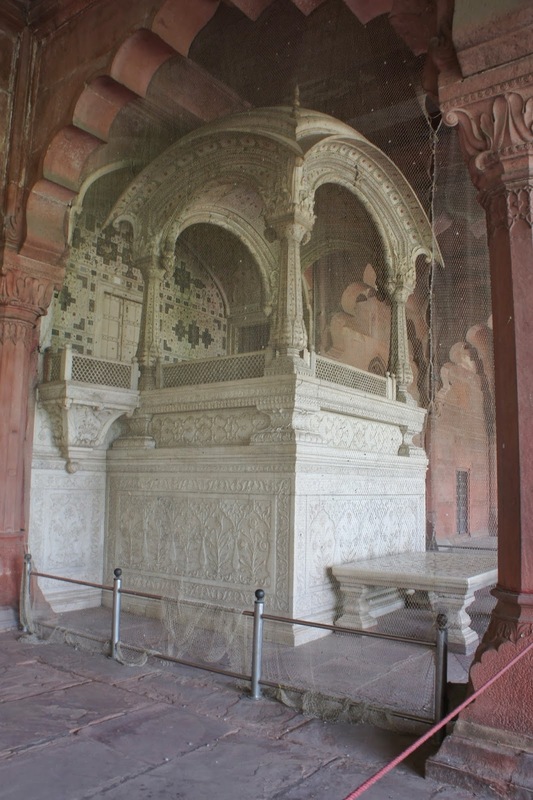 Before the tomb was a garden, and this was believed to be the first garden tomb in India! 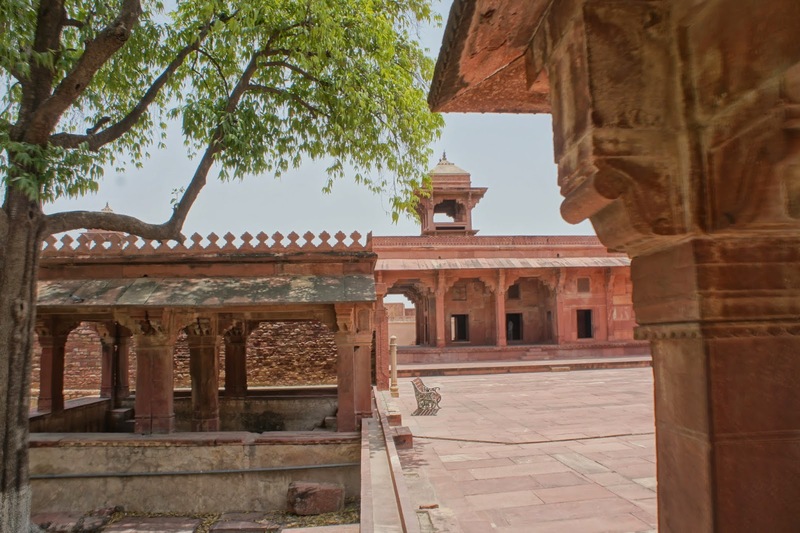 Till today, the garden was well taken care off by the staffs in this tomb. 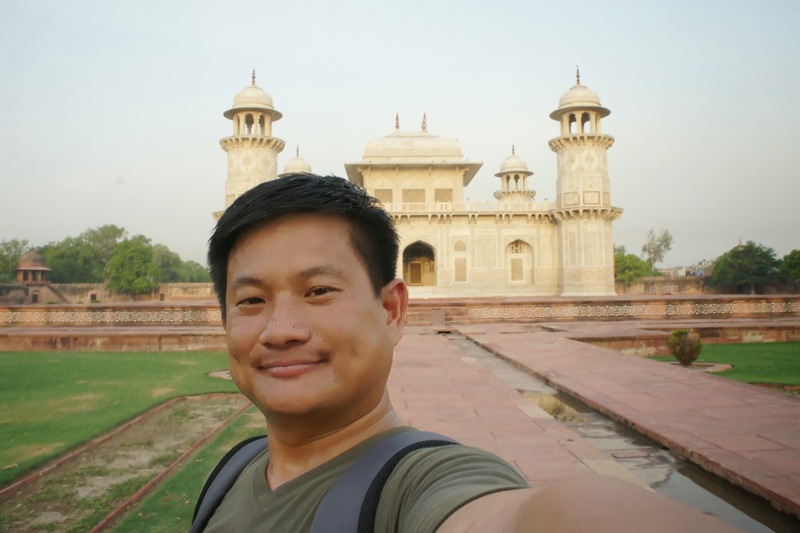 I walked towards the tomb building, and it was magnificent! 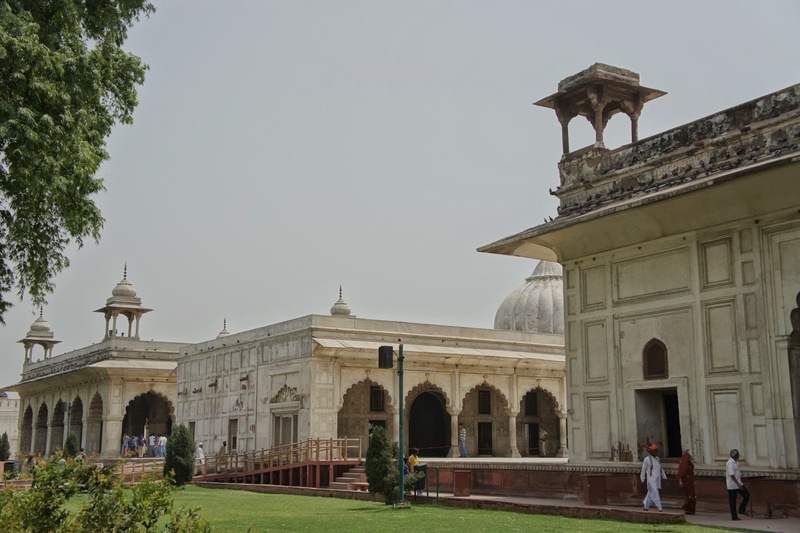 The main tomb building has a huge white dome and 4 smaller pavilion looking structures beside it. 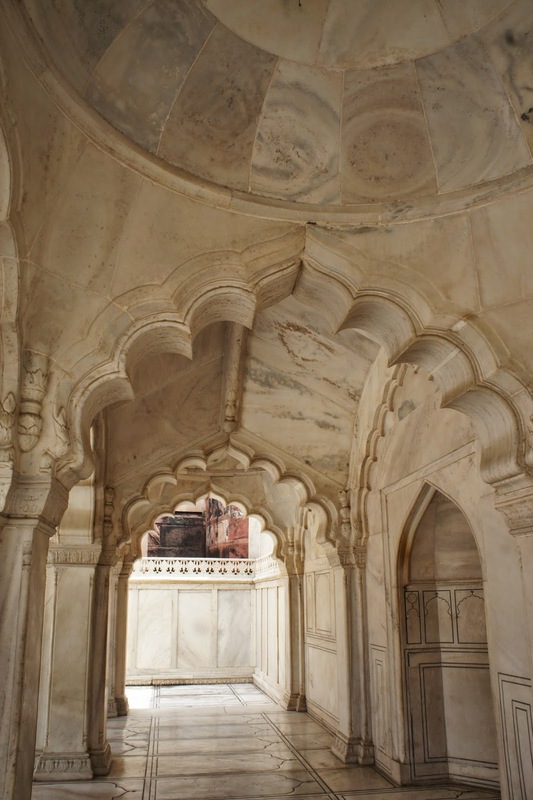 The red tomb was brimmed with white marbles, a stark contrast from its main gate. Once up on the main platform where the emperor’s tomb sits, there seemed to be more tombs on the platform. Wonder who’s tombs are those. 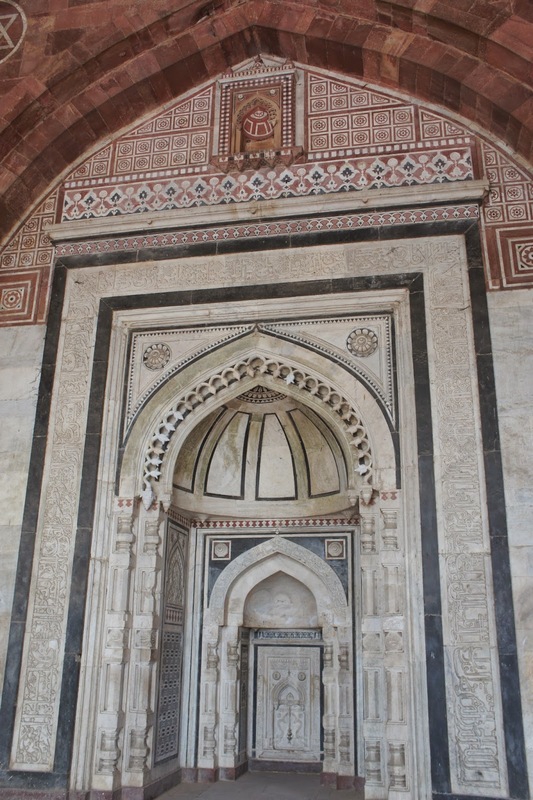 The main entrance into the tomb was very Persian in style, reminded me of the Imam mosque In Isfahan I saw in Iran some months back. 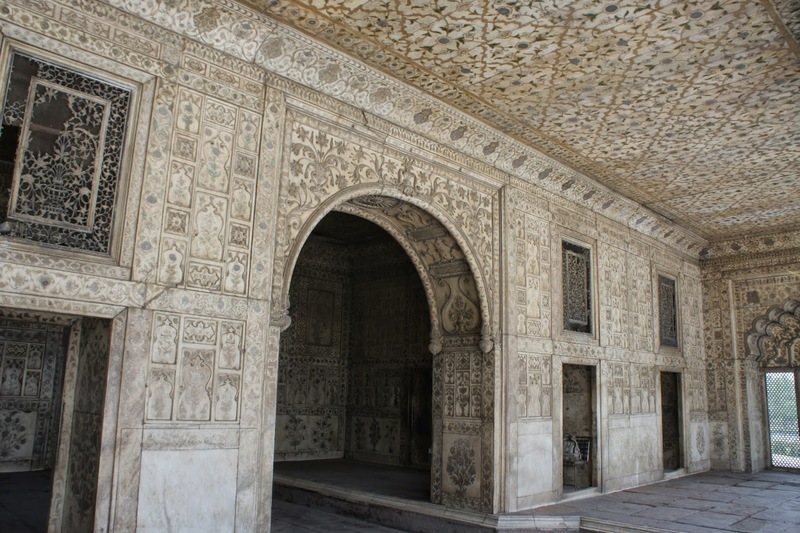 Even the interior of the gate was nicely carved and decorated, which looked very much like the mosques in Iran. 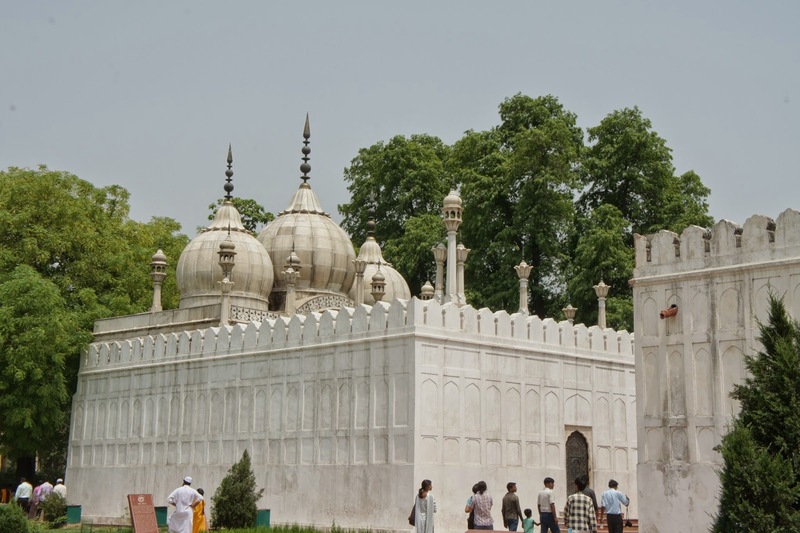 The white marble emperor’s tomb sits right in the centre of the tomb for centuries. 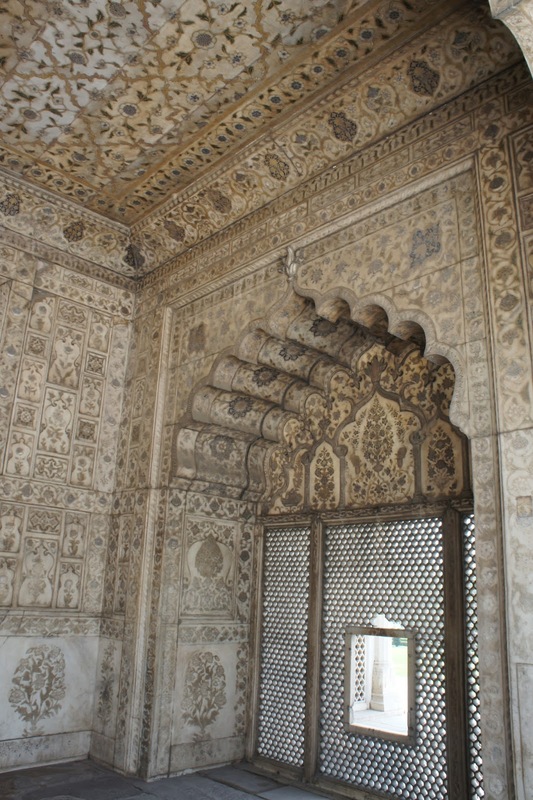 The interior looked like it was built of white marble, very similar to that of Taj Mahal, except that there was no flower carvings on its interior walls. 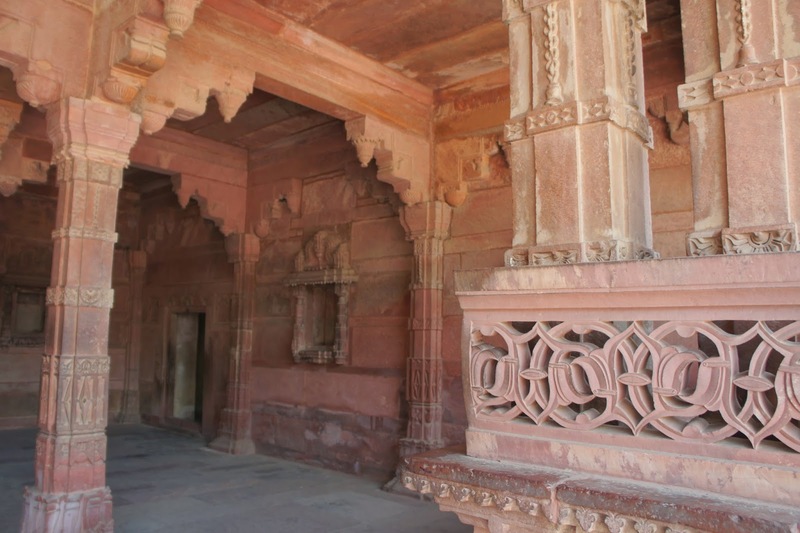 I went around the tomb building and spotted more tombs in the smaller rooms within the same building, some are in pairs, while others are in threes. Really wonder who would be honored enough to be buried next to the emperor. Exiting the tomb building, I walked around the tomb admiring the gardens where this building sits. 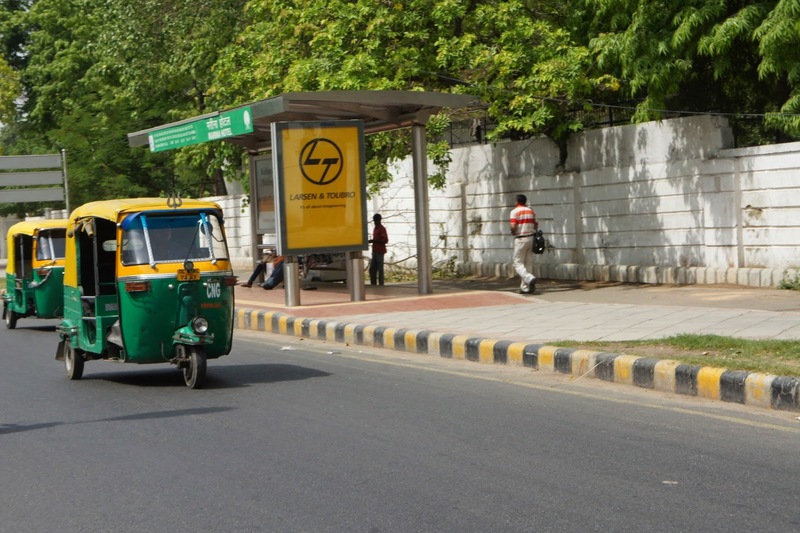 After taking some pictures, I exited the compound and headed towards my next destination by auto rickshaw. 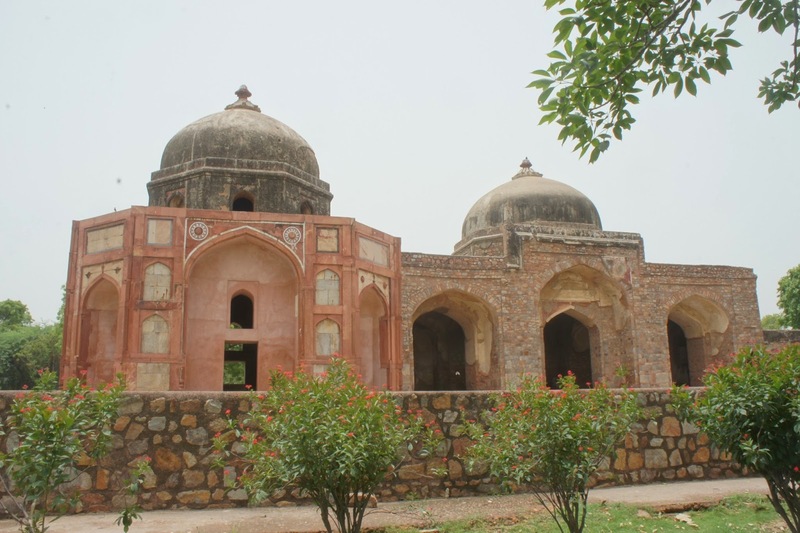 The Lotus Temple (which was locally known) was a fair distance from Humayun’s Tomb. Once arriving, there is not mistake that I have reached my destination. 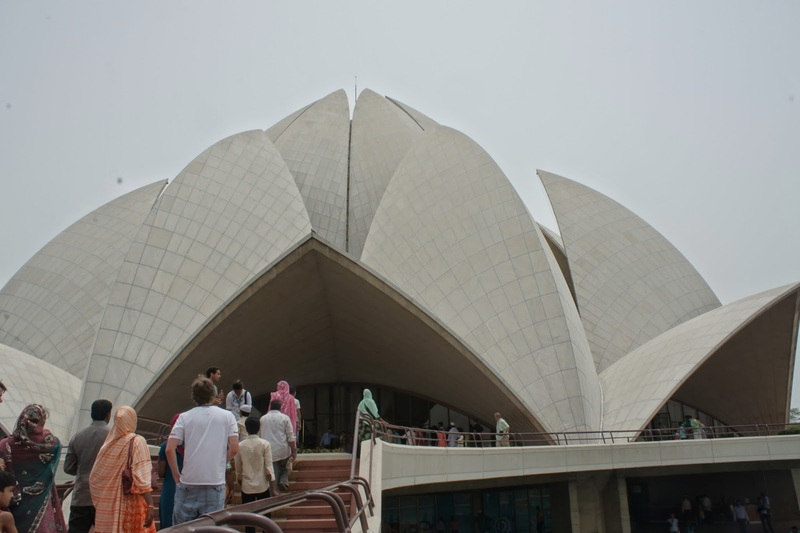 Often known as the Sydney Opera house in India, the Lotus Temple was constructed to resemble a lotus. The white building was definitely a feat of architecture. I followed the crowd into the temple. 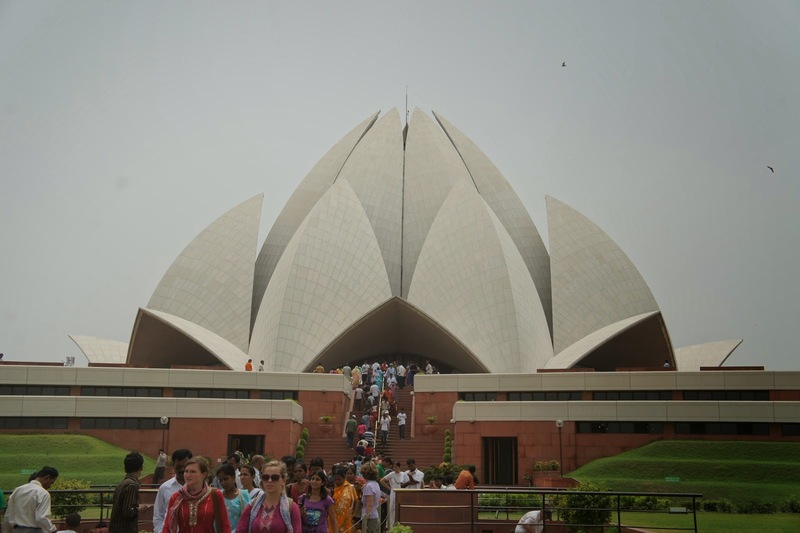 As the temple is of Bahai origins, it welcomed anyone of any religion to enter its premises to pray to their god. 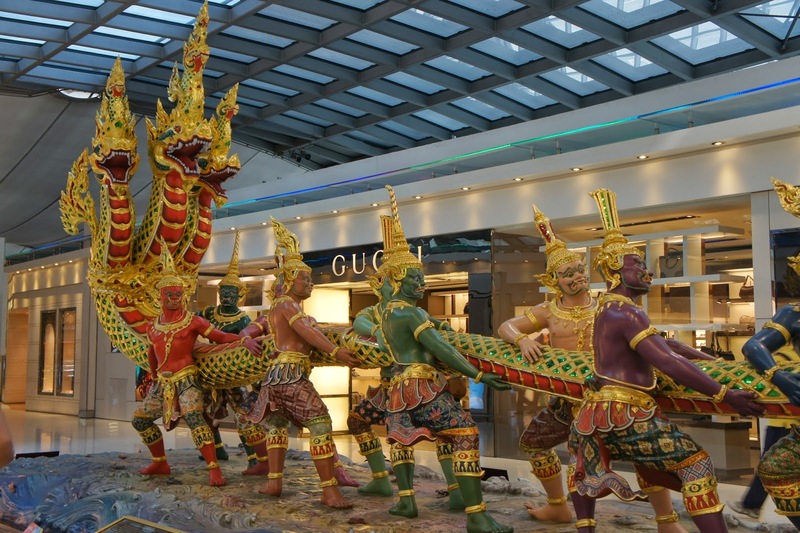 It really symbolises harmony of all religions. Once inside the temple, I can’t help but admire the architecture and the difficulty in the design and construction of this temple. At the very centre of the temple was a motif, can’t really figure out what it is (I have been staring at it the moment I entered the inside the temple). 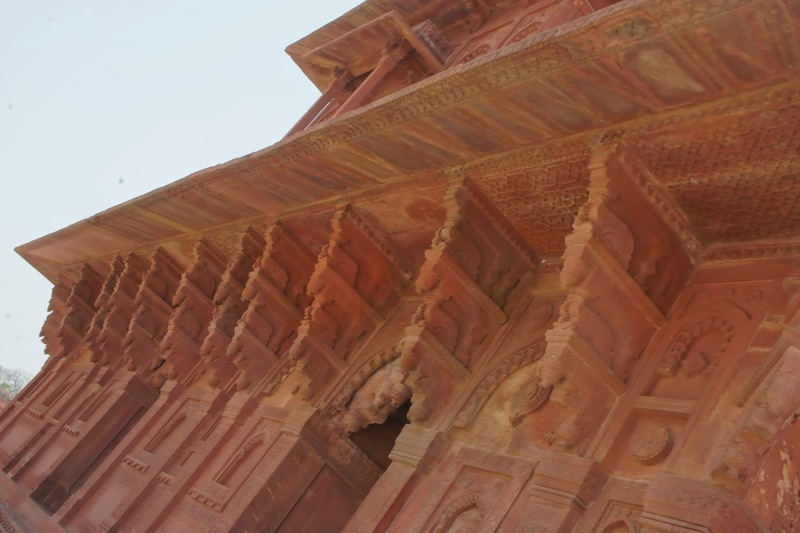 The interior of the temple was very serene, and the sunlight only managed to peek through the top part of the temple where the opening of the lotus flower was at. 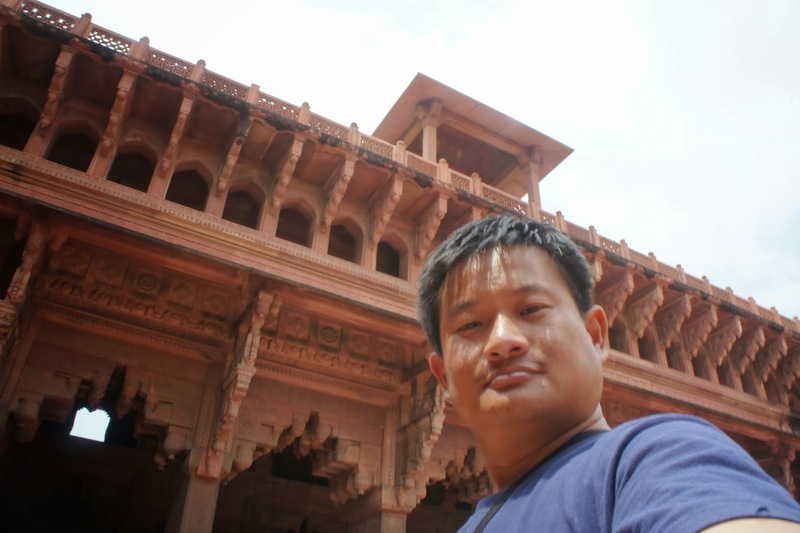 I took 1 minute to walk around the interior of this temple before heading back out. I headed towards the metro station next. 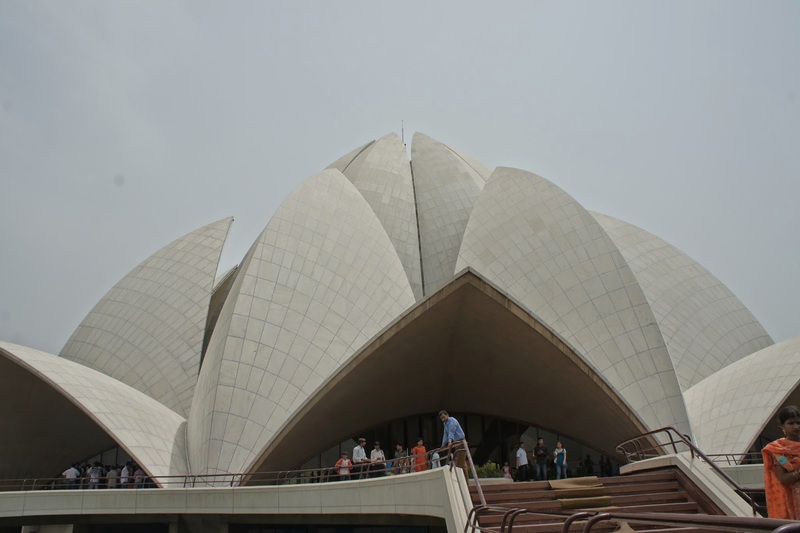 The Lotus Temple was about 5 mins away from the nearest metro station. 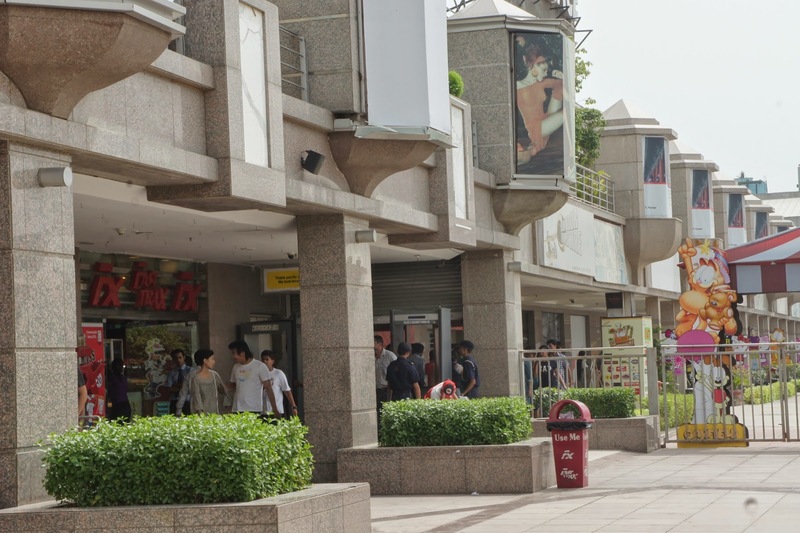 The entrance of every metro station (and shopping malls too) was guarded by some security personnel, and everyone has to go through the metal detectors and subjected to body checks. My bag has gone through countless X-ray machines in India whenever I enter a shopping mall or the metro station. Took the metro back to the hotel to rest for the day. 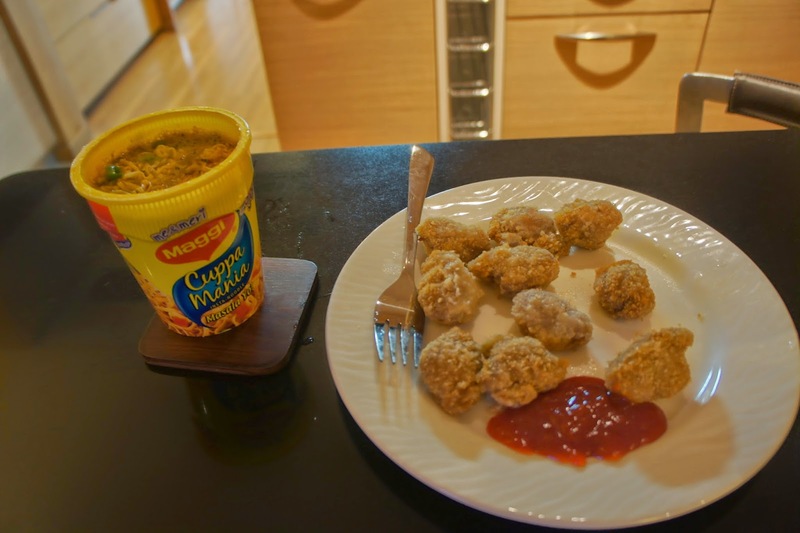 As the hotel has a small kitchenette, I went to the nearby supermarket in the mall to get some instant noodles and microwavable chicken nuggets, intending to have a simple lunch before heading to Hard Rock Cafe nearby for dinner in the evening. 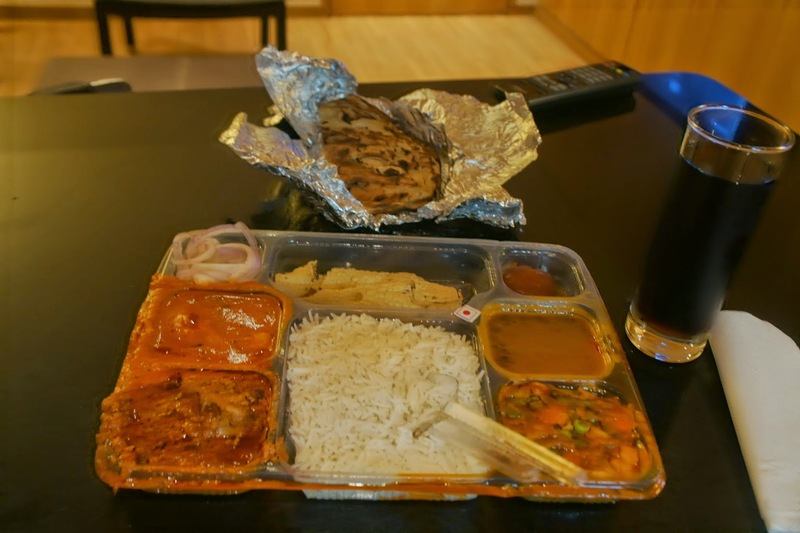 However I was too lazy to head towards Hard Rock Cafe (plus I was rather full towards the end of the day), I simply went over the food court to pack some Indian food back to the hotel (so I can watch one of the 2 TVs in the room while eating). After dinner I hit the bed as I was dog tired. 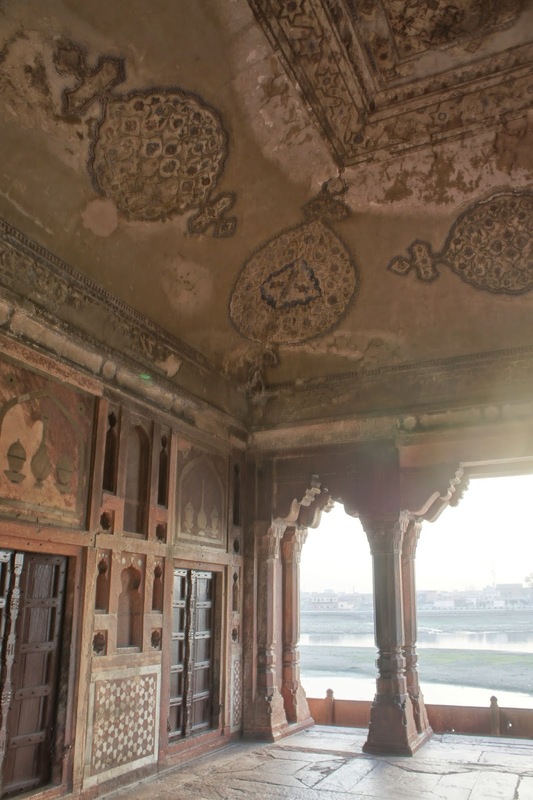 I originally wanted to wake up to see sunrise at Taj Mahal. 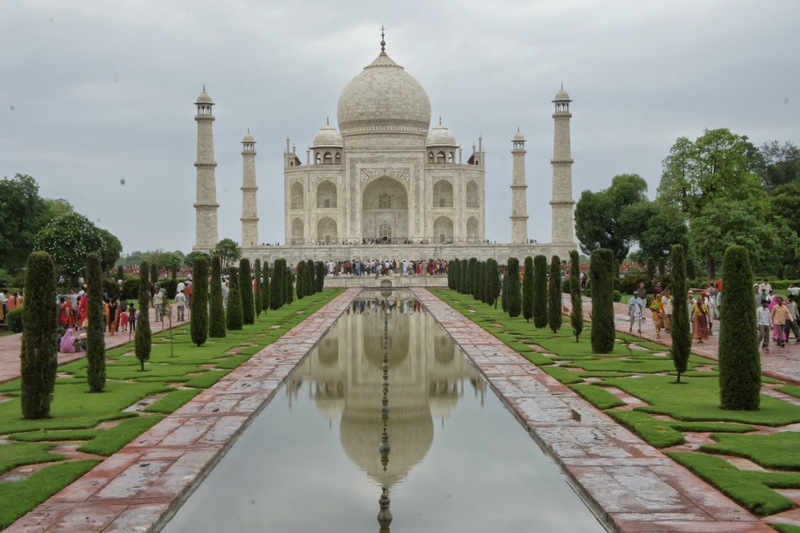 However a notice at the hotel lift lobby the previous night stating that the Taj was close at sunrise timing due to some VVIP visit, I had to change my plan to visit it at around 9 am, the timing the VVIP visit was scheduled to end to avoid the crowd who will be strolling in after that. 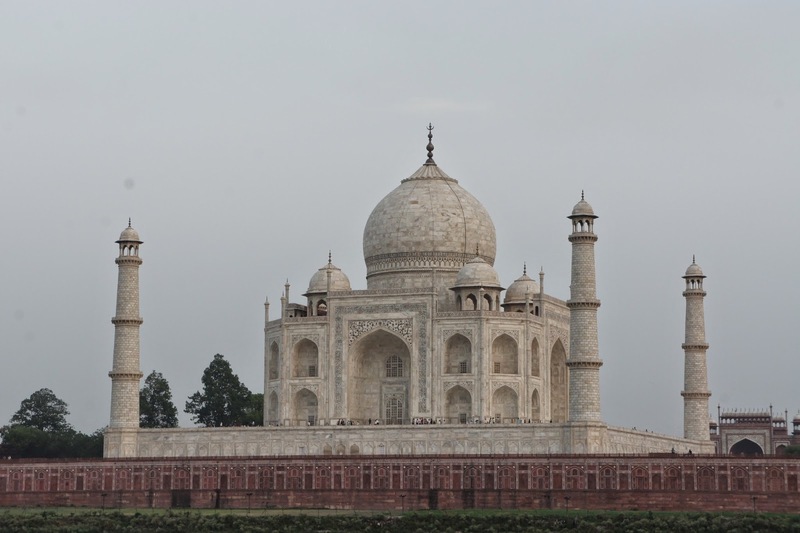 Since Taj Mahal seemed quite close by the hotel, I decided to walk there, partly to digest the breakfast. The walk to Taj Mahal took about 45 mins. As I was stepping out of the hotel, it started to drizzle. “Not too bad” I thought to myself, the drizzle really cools off the heatwave I have been experiencing the past few days. God must have heard my bitching about the heatwave and the hot weather. 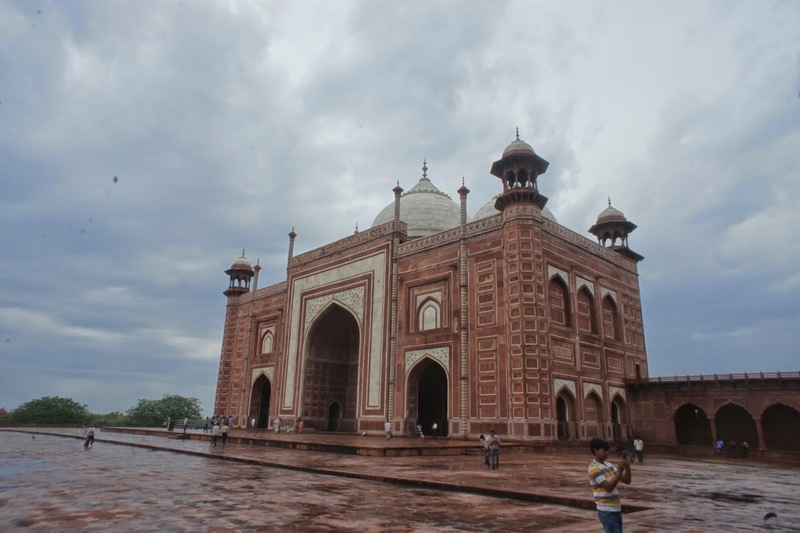 As I was walking, the rain turned into a downpour, I was totally soaked by the time I reached Taj Mahal entrance. 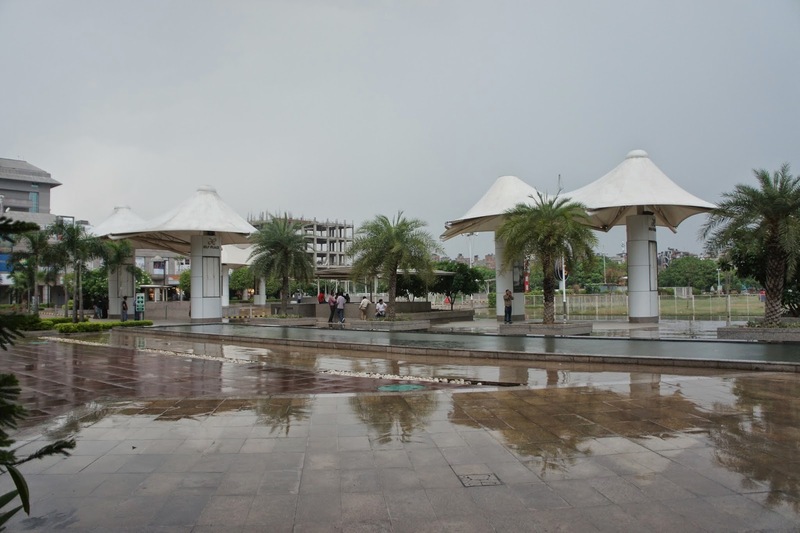 Once at the entrance, well the touts are at work again, people trying to sell me umbrella, hmmm….. seemed like not much use to me since I am already totally soaked. Entering Taj Mahal was not too bad, despite the snaking queue forming outside, with people queuing under the rain. I was told to proceed to an empty queue. 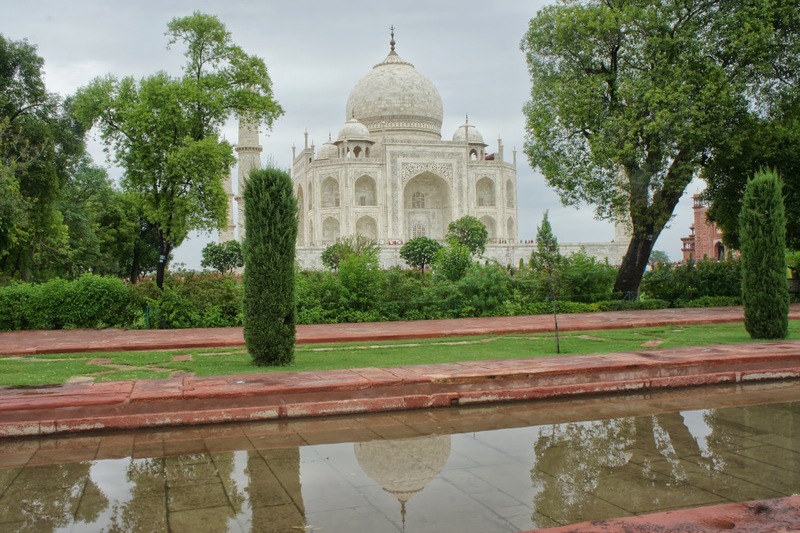 So I did, I was in Taj Mahal grounds in no time. 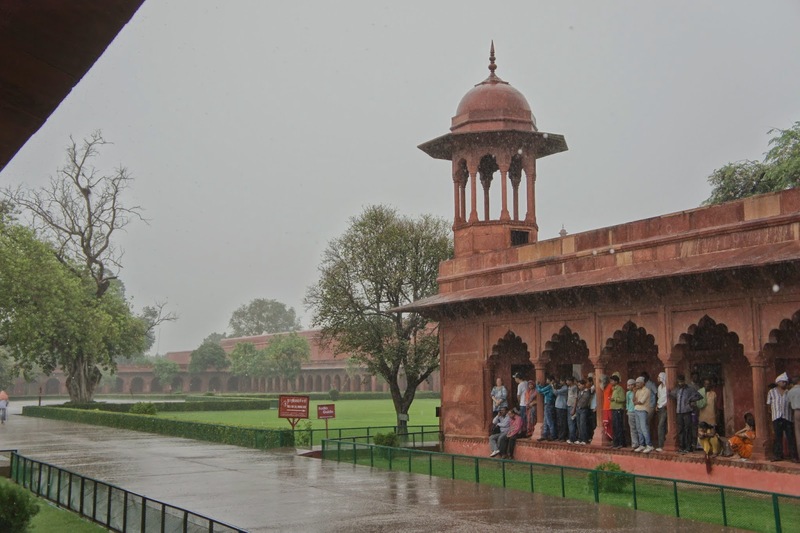 As it was still pouring, people are generally seeking shelter either near the entrance or the gate building before Taj Mahal. 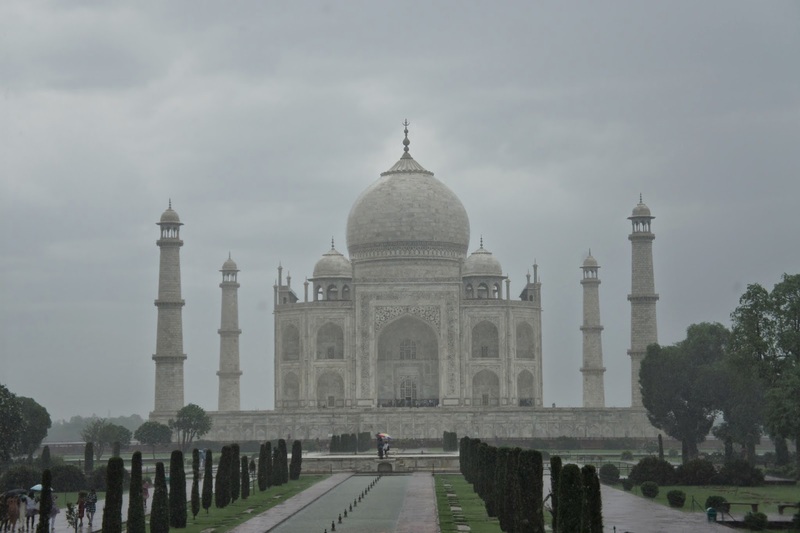 I marched through under the rain and headed straight towards the Taj. I am glad I did that as the crowd was significantly lesser. As I was walking towards Taj Mahal itself, I met these 2 ladies with a British accent and volunteered to help them take picture. They seemed to trust me more then the locals and was quick to agree to my offer. 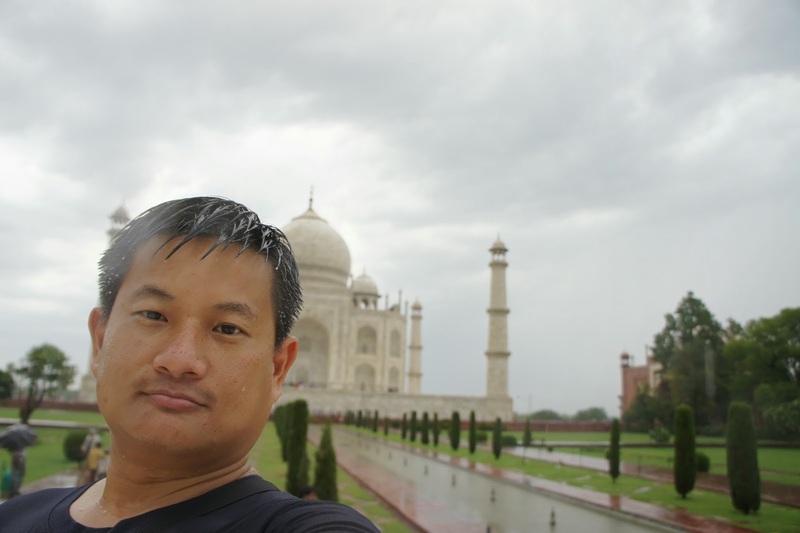 After taking the pictures, I headed towards Taj Mahal. I was at the platform where this wonder of the world rests for centuries. 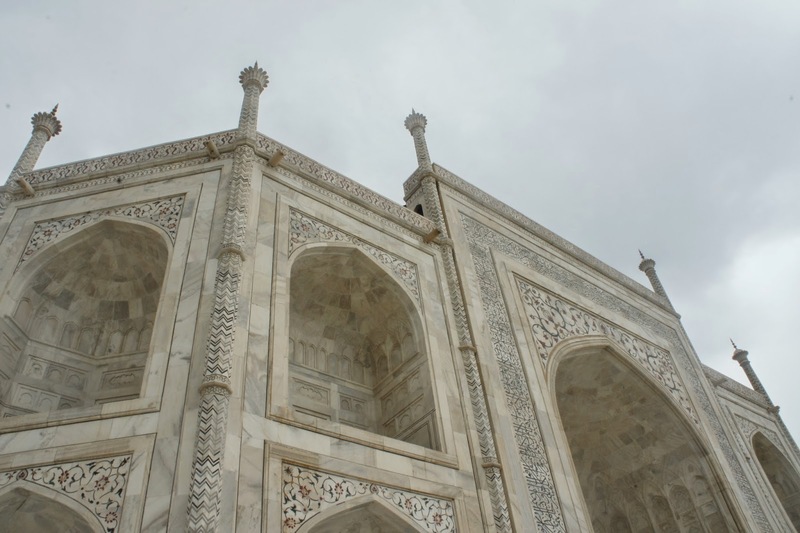 The platform was also made of white marble, walking up the platform was exhilarating as I was about to enter one of the Wonders of the World. 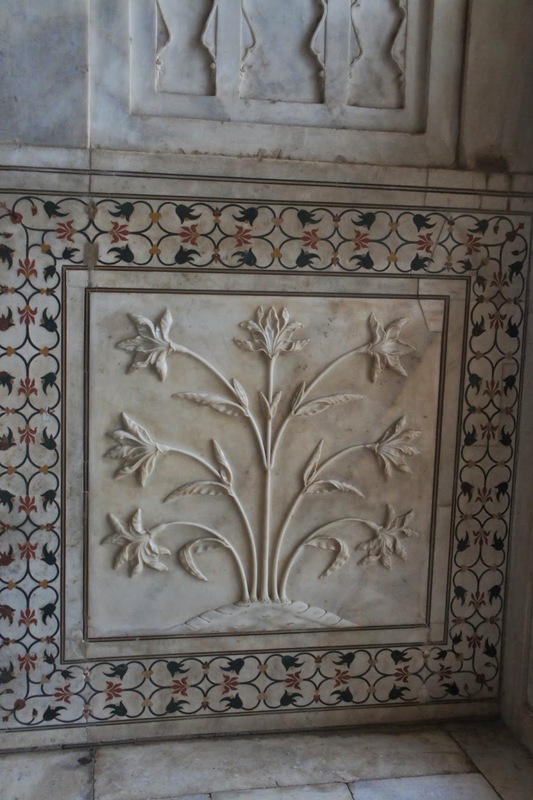 I decided to take some pictures of the Taj Mahal before entering the mausoleum, the walls of Taj Mahal was also colourfully decorated with flowers which was made of red gems. 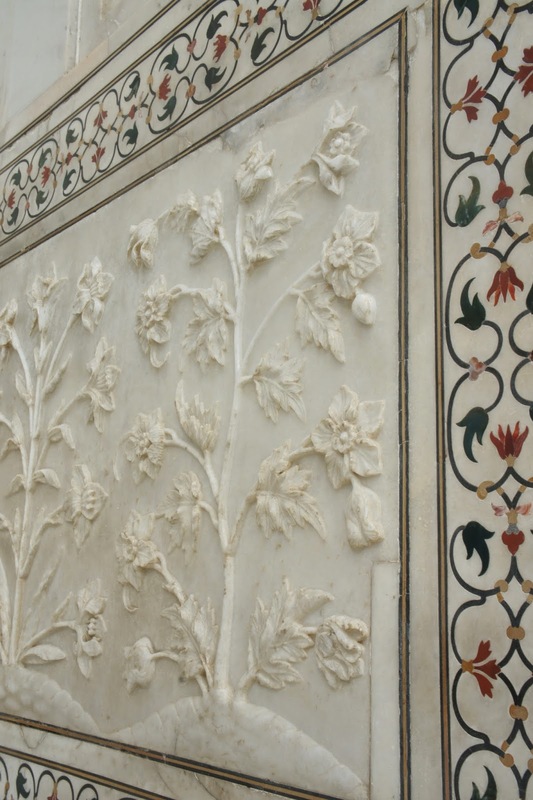 On the walls of the Taj Mahal, be it carved or arranged with gems, the flower and plant theme was distinctive. 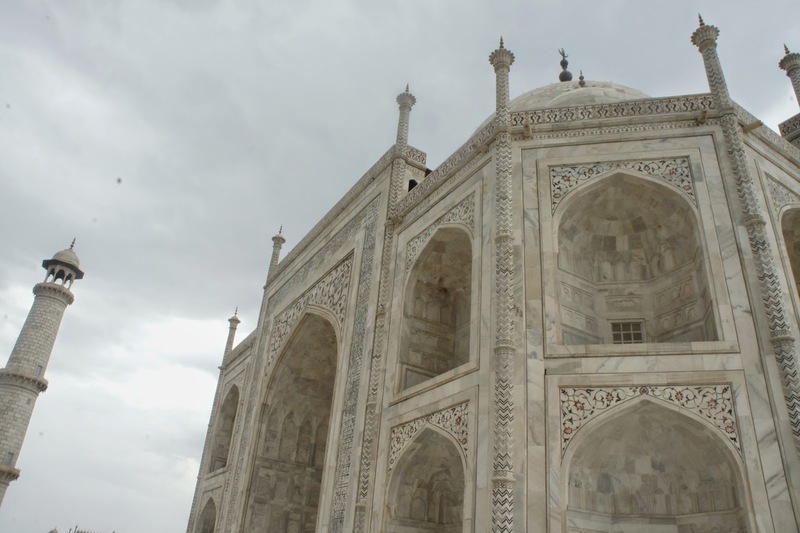 The tall walls of the Taj Mahal has some Arabic inscription on it. 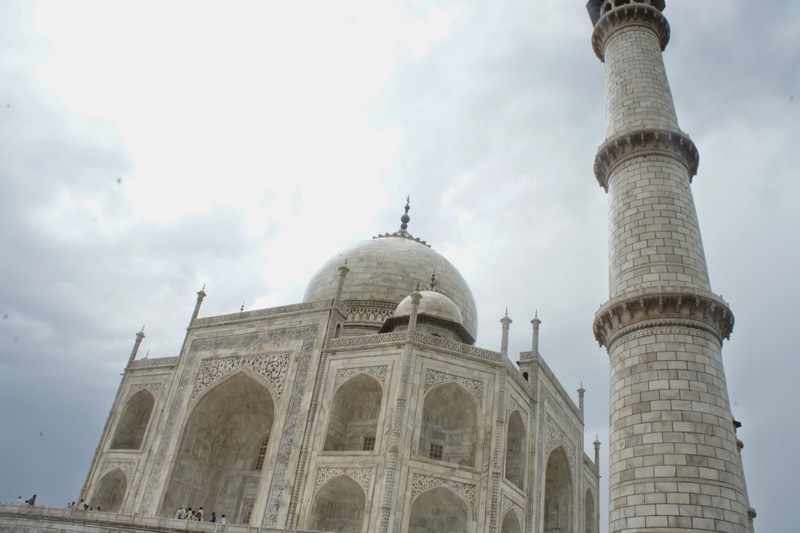 Unlike the baby Taj, The minarets of the Taj Mahal is not part of the main building, but 4 lone standing towers at each of the extreme end of the white marble platform where Taj Mahal sits. 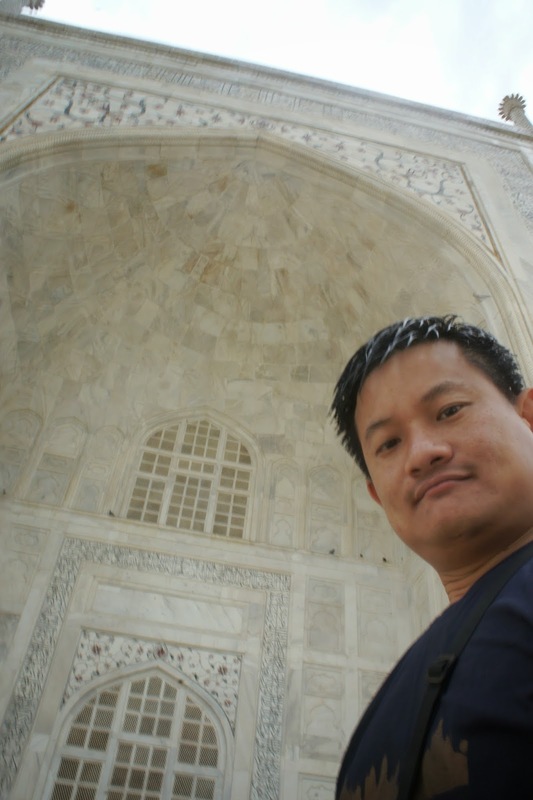 I entered Taj Mahal after taking pictures of it and the surroundings. There wasn’t much of a queue at this point partly due to the rain, and I got inside in no time. 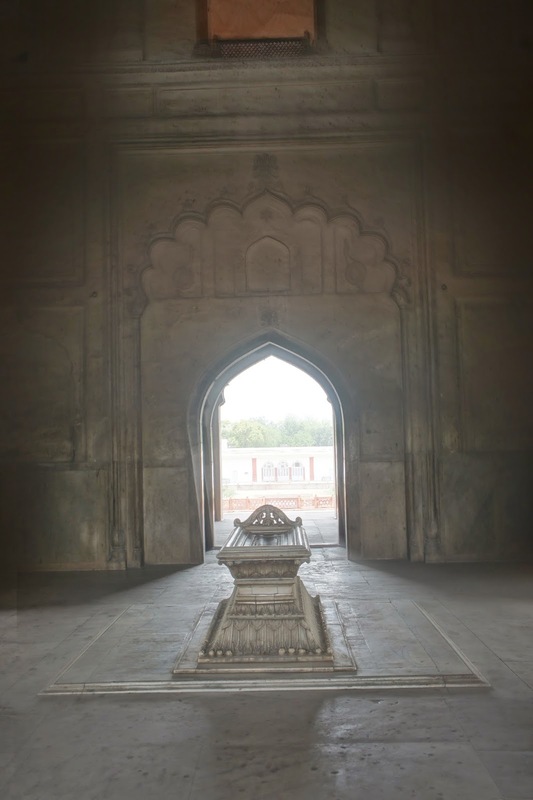 Lying in the centre of Taj Mahal was the tomb of Arjumand Bann Begum, the favourite wife of Shah Jahan. 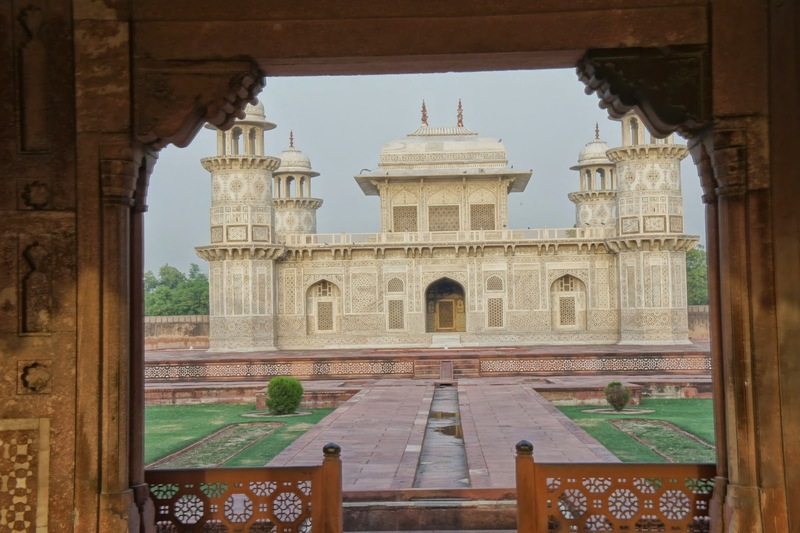 To the left of this tomb was the tomb of Shah Jahan, whose tomb was one platform taller then his wife. 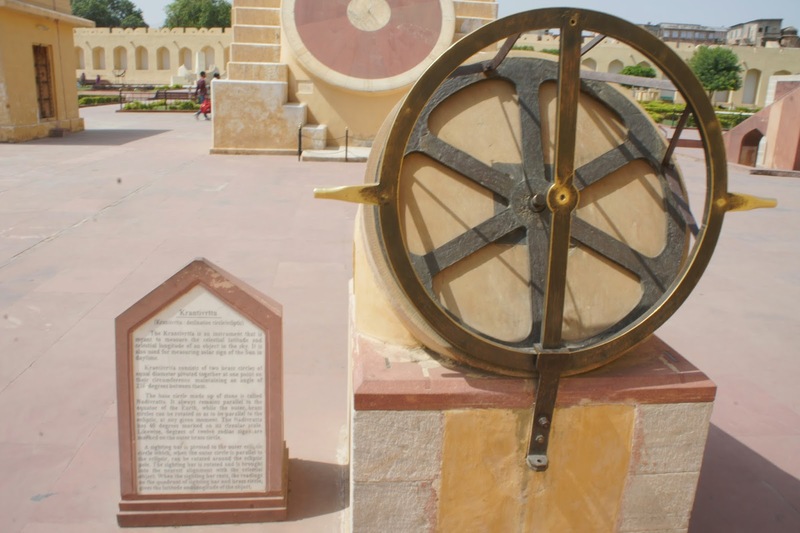 It was said that people subsequently buried him there after his death owing to his devotion to his dead wife. 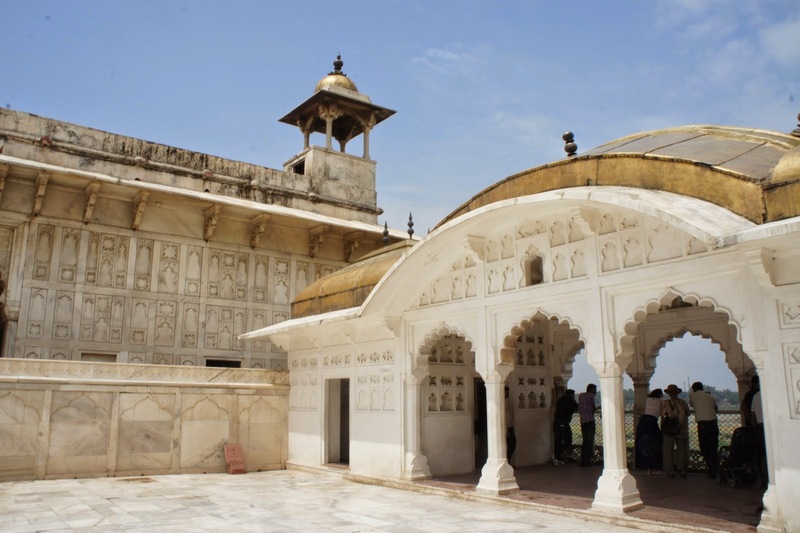 The tombs was surrounded by a white marble fence, having only the side facing the main entrance open. 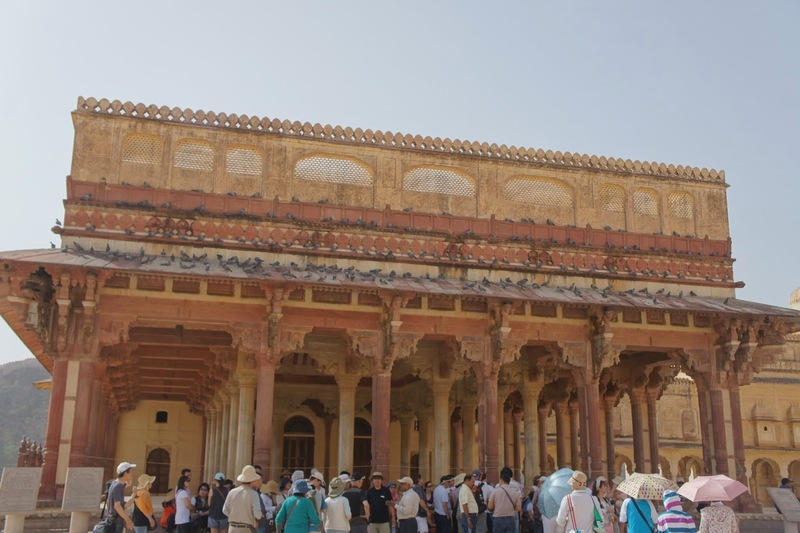 People crowded at this opening to glimpse at the 2 tombs inside the Taj Mahal. 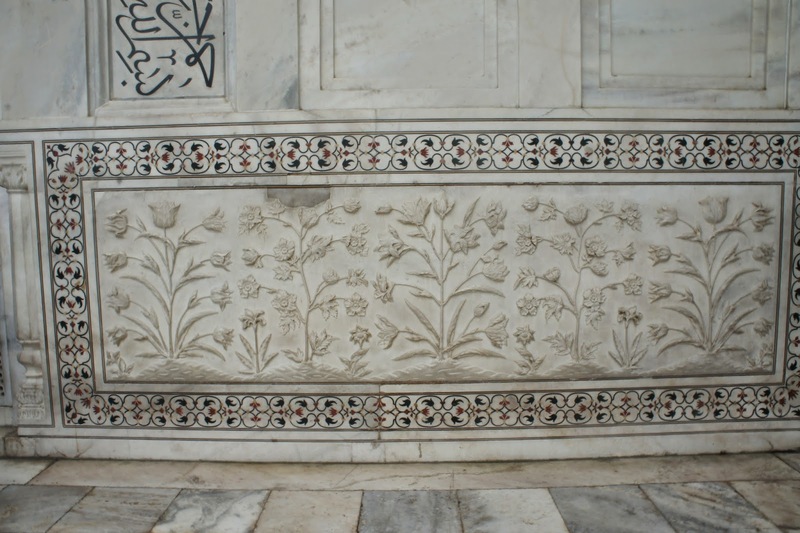 The platform of the tombs and the lower half of the fence was also colourfully decorated with flower patterns. 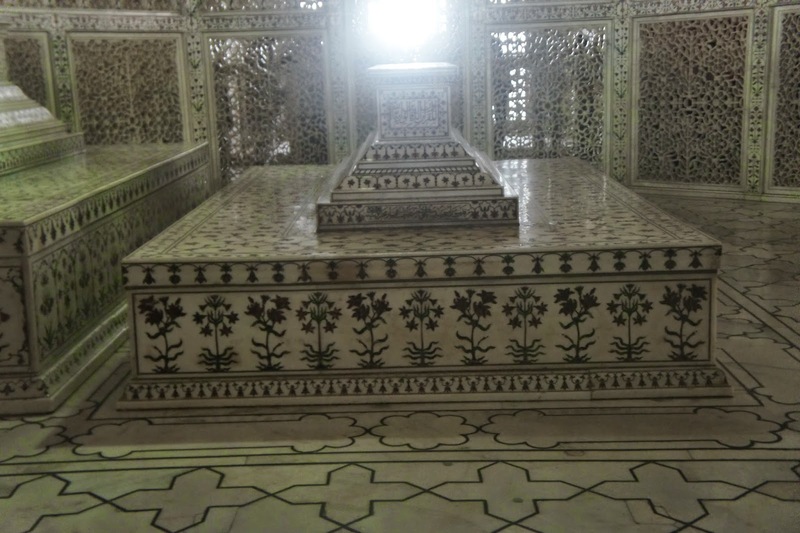 After looking at the tombs, I walked one round inside the Taj Mahal. 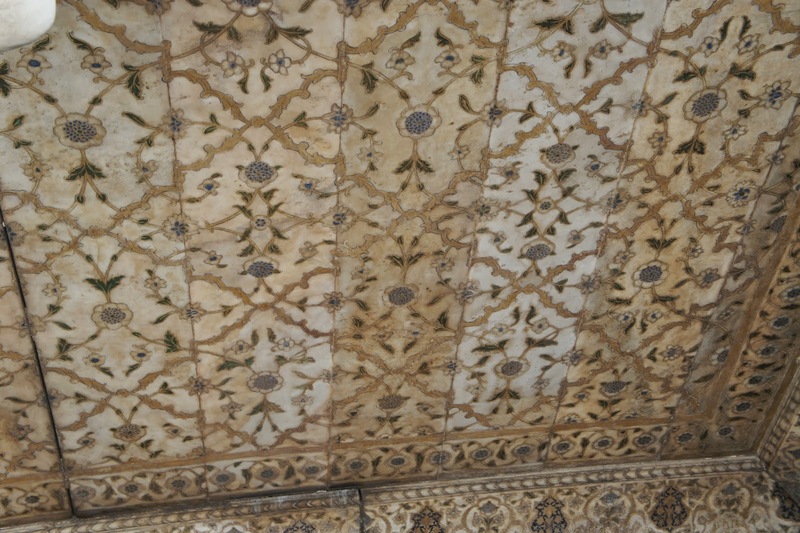 Even the interior was also engraved with flower designs, seemed to suggest a continuity of life after death. 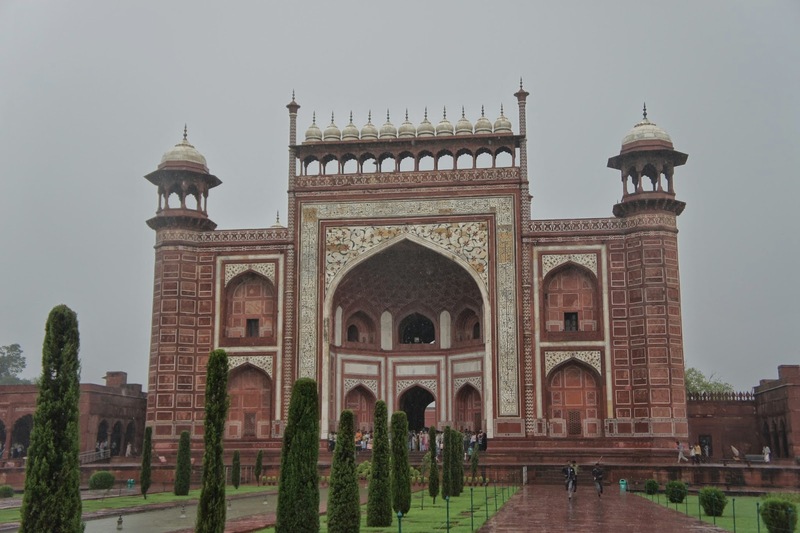 I took one glimpse at the tombs before heading outside the Taj Mahal and take pictures of the exterior. 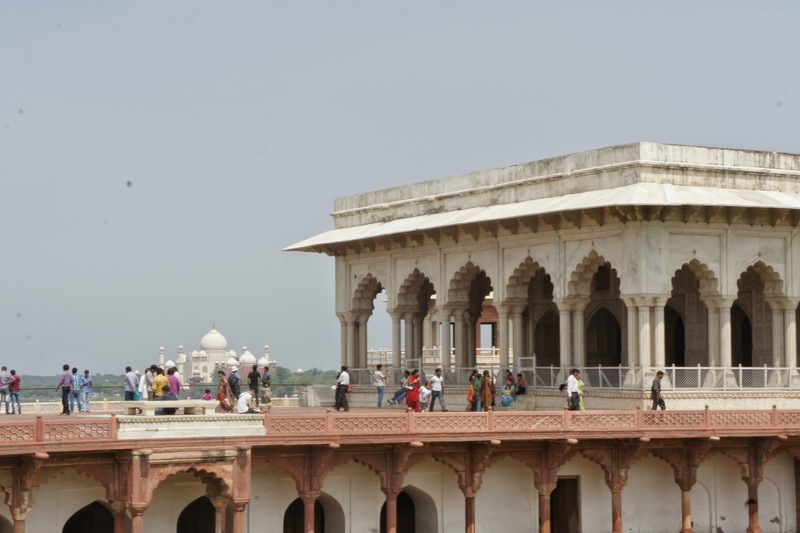 As Taj Mahal was built on the banks of Yamuna River, I went to the side that overlooks the river. 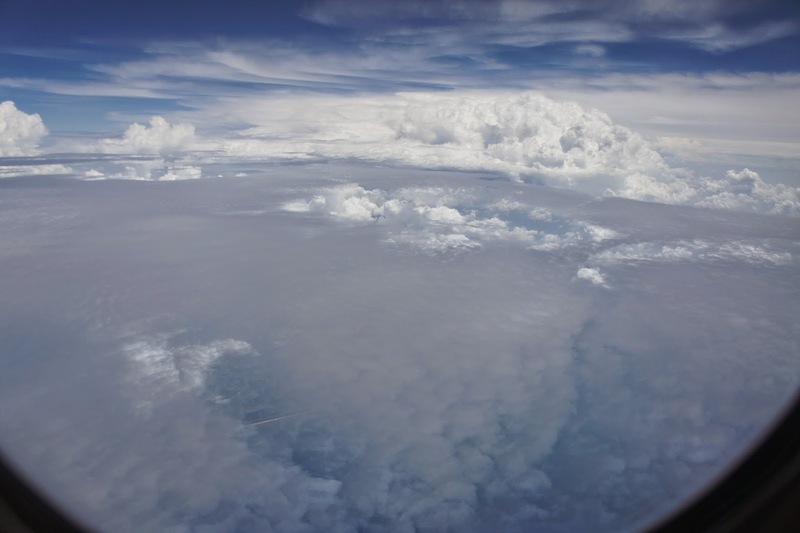 The view was smoothing and magnificent. 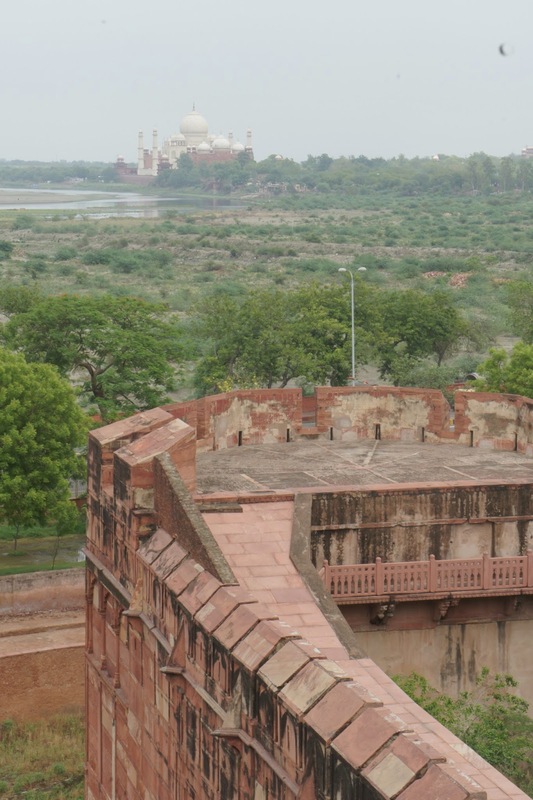 From this side, I can see Agra fort. 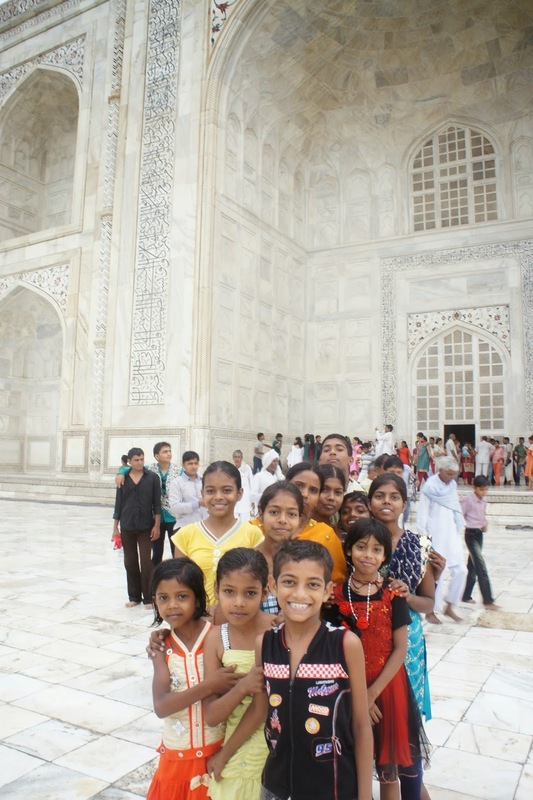 As I was moving around taking more pictures and enjoying the view, some local kids asked me to take a picture of them. Soon there was a small group of children posing in front of my camera, they seemed to be very happy to be a subject of my camera and kept thanking me. After the children left, 2 locals asked to take picture with me. Feels like I was in Iran, where the Iranians are also very passionate in asking foreigners to take pictures with them. 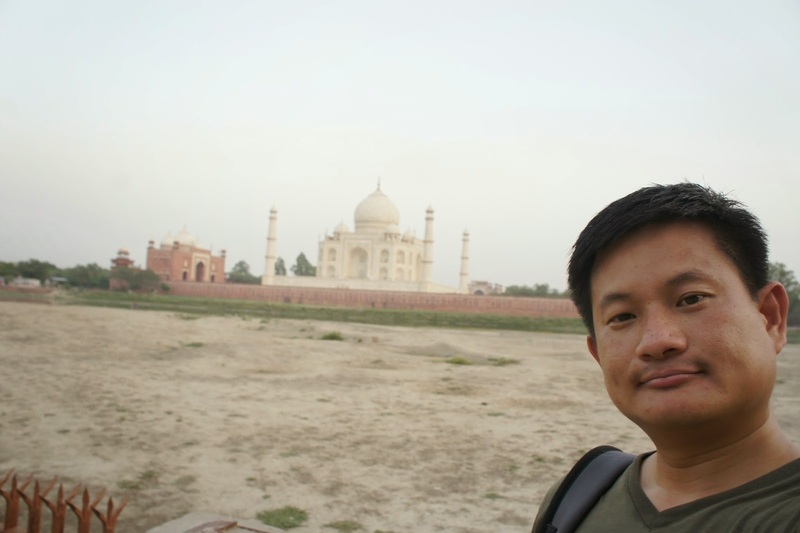 I roamed around Taj Mahal for another 10 minutes before heading out. 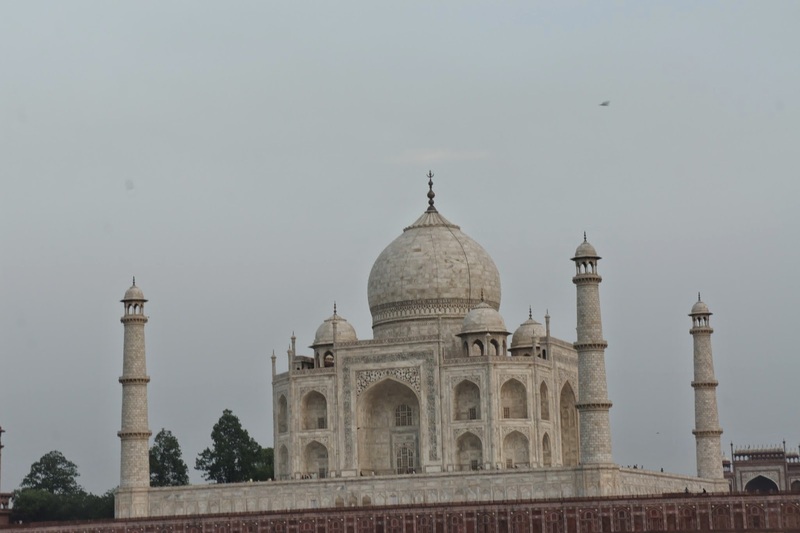 On my way out, I realise there was a really good spot to take picture of the Taj Mahal at the centre platform. After snapping some pictures, the 2 British women approached me to ask me to help them take a picture. I told them to stand where the best spot is. After seeing the pictures, they were very happy and agreed that the spot I just recommended was indeed a very good spot for picture. They helped me take a couple of shot before bidding farewell. 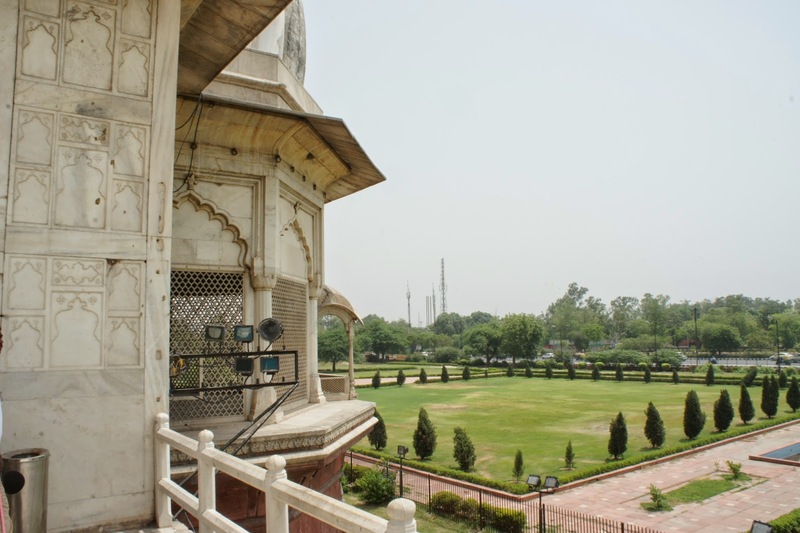 I headed towards the side from the center platform, where it says Taj Museum. 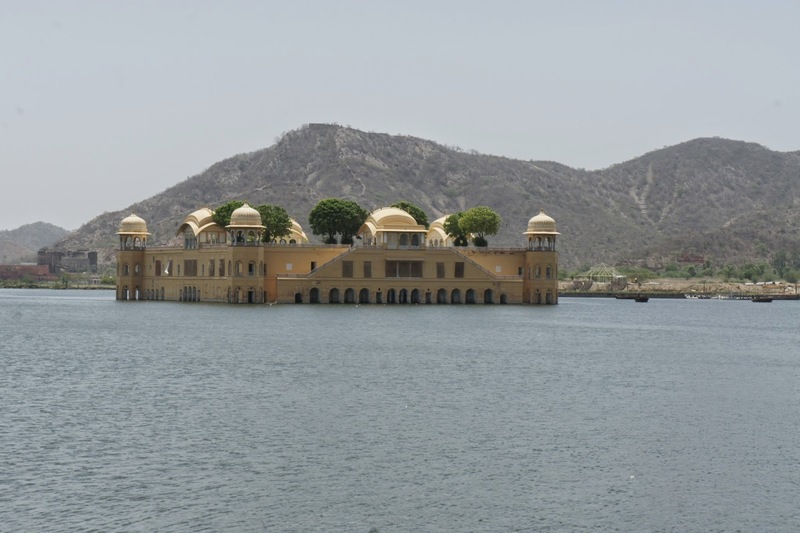 The side buildings were used as water control gates back then, thus they were known as the water palaces. 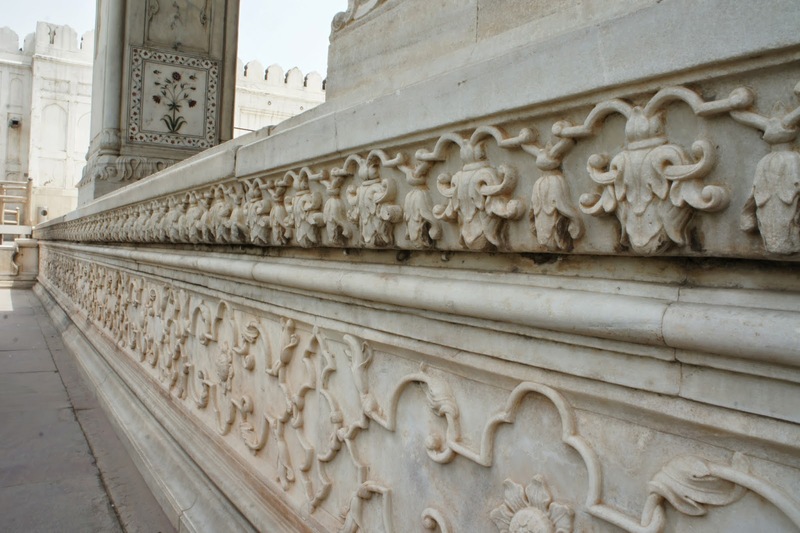 As the design of Taj Mahal was heavily influenced by the Quran, symmetry was an important factor and can be seen throughout the grounds of Taj Mahal. 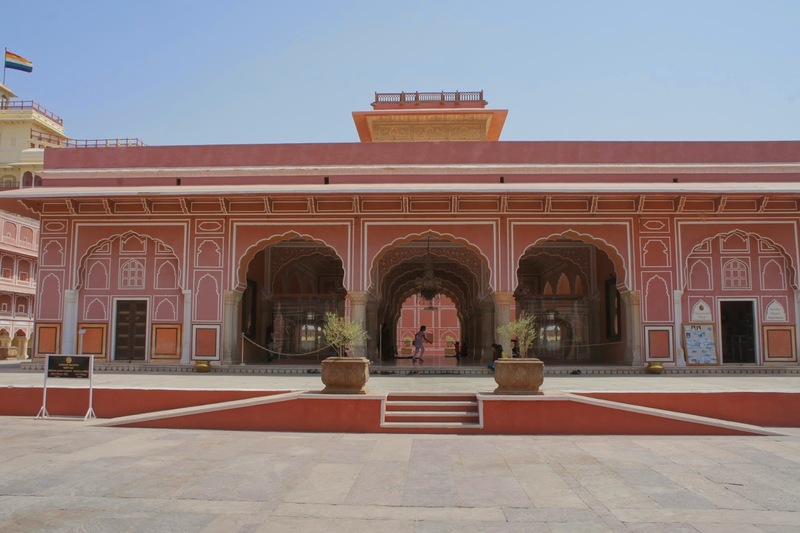 To enter the museum, visitors have to pay an additional 10 rupees, which I am not very keen to, thus I made my way out. 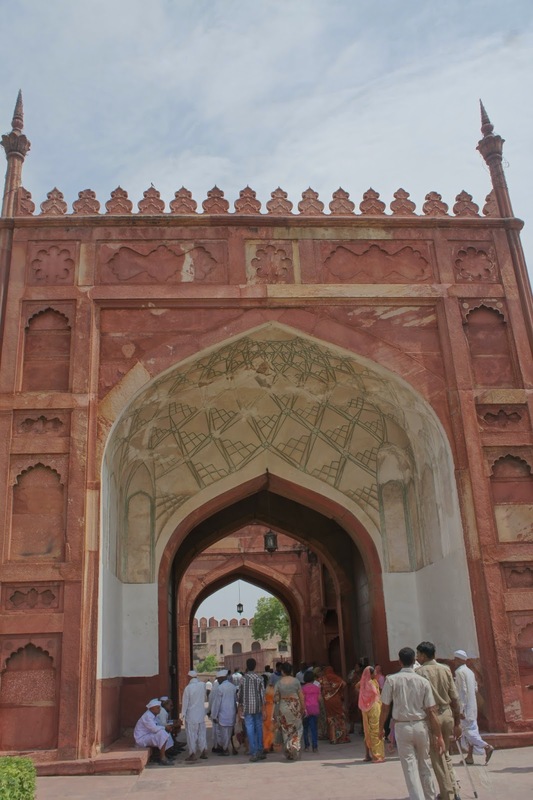 At the gate to the Taj Mahal, I took some more pictures before leaving the premises towards the hotel. 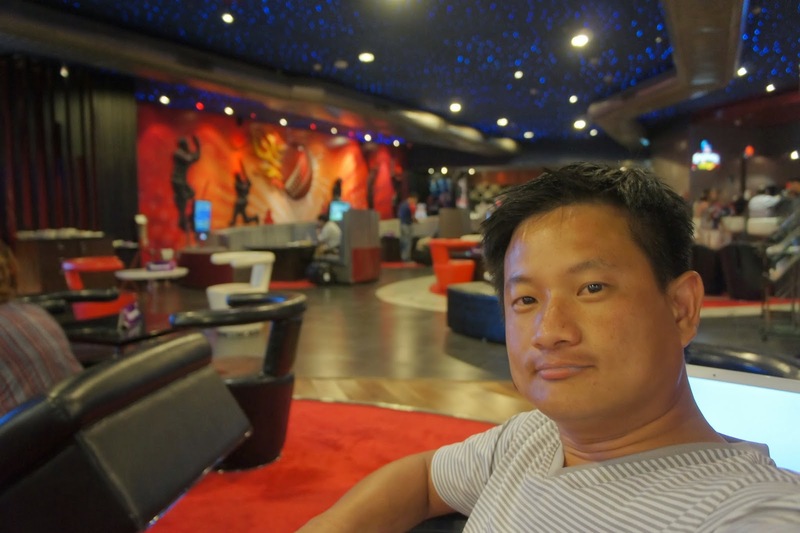 As I was partly dry, I rested at the hotel for about an hour. 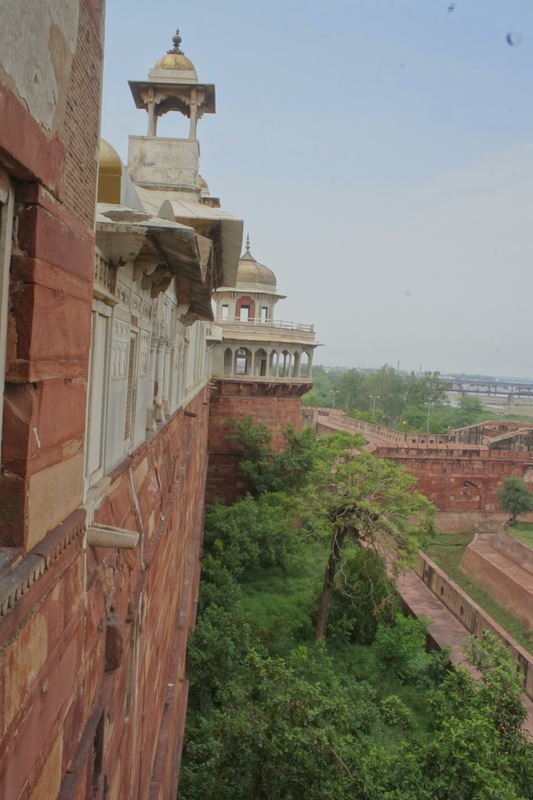 Seeing the weather was not that hot, I opted to visit Agra Fort before the sun appears from beyond the clouds to show its might again. 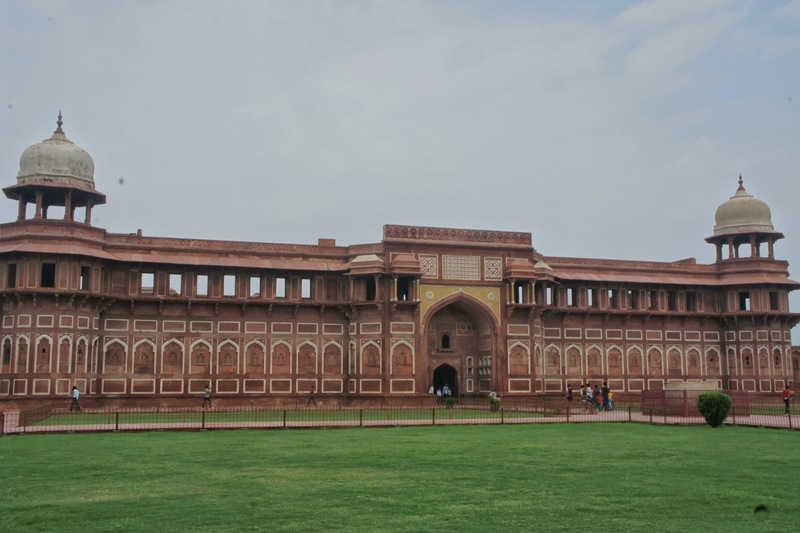 At the entrance of Agra Fort, I realise I forgot to bring the ticket for Taj Mahal, which can give me a 50 rupee discount to the site. Damn it, must have left it in the hotel. I decided to pay for the full price instead of going back to the hotel to get it. I left the counter after getting the ticket and start snapping picture of the entrance to the fort. 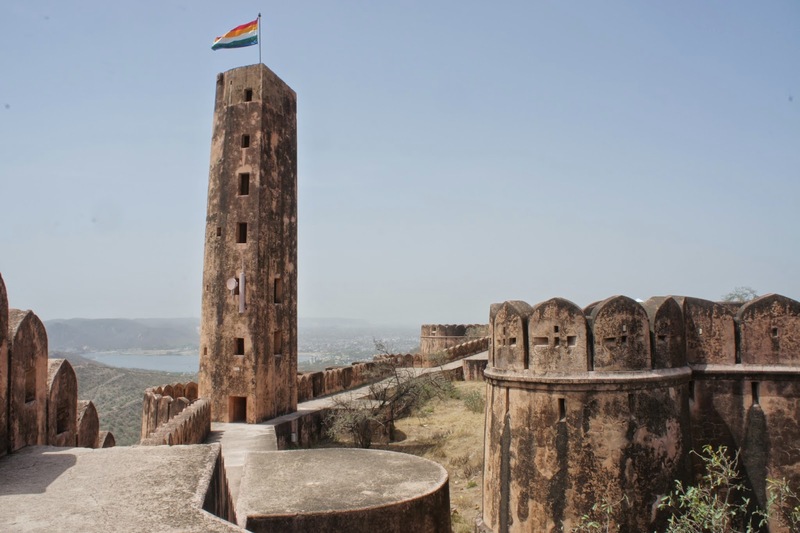 As I was walking towards the entrance of the fort, I realise I forgot to take the change from the counter man after I have paid for them. 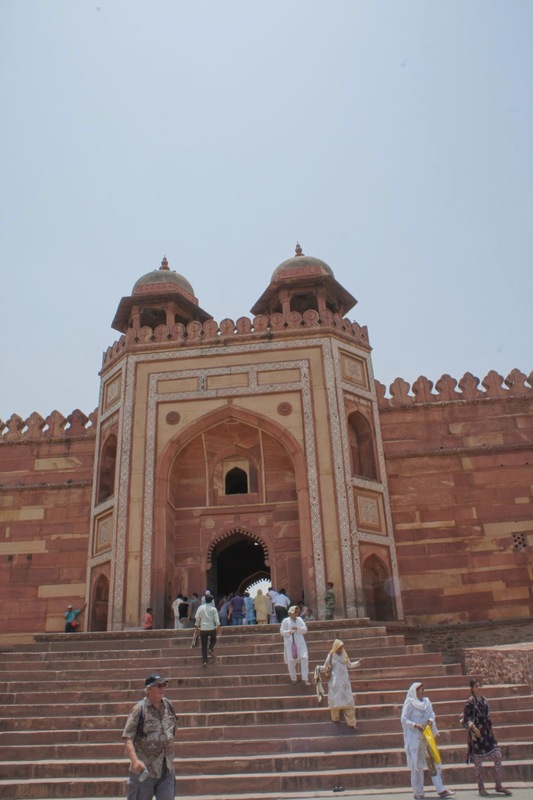 The entrance to Agra fort is 500 rupees for me!! The price of being clumsy. 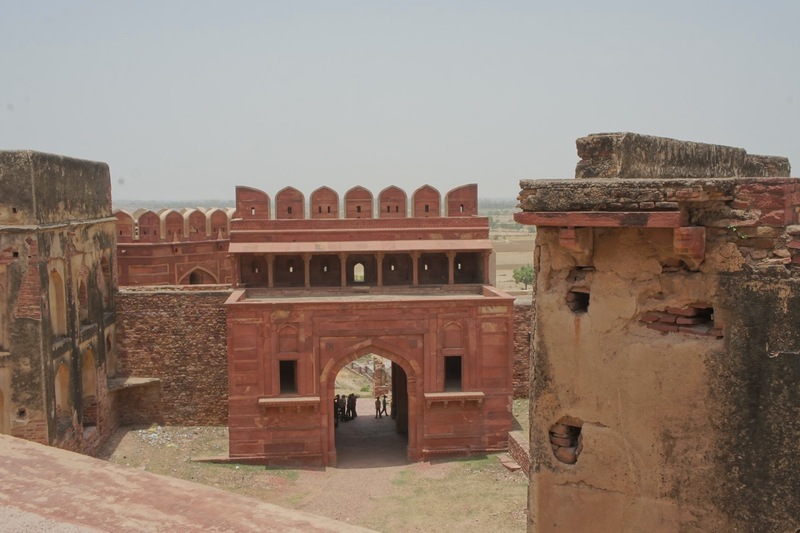 Agra was known as the mother of all forts in India as Forts in India was replicated from this one. 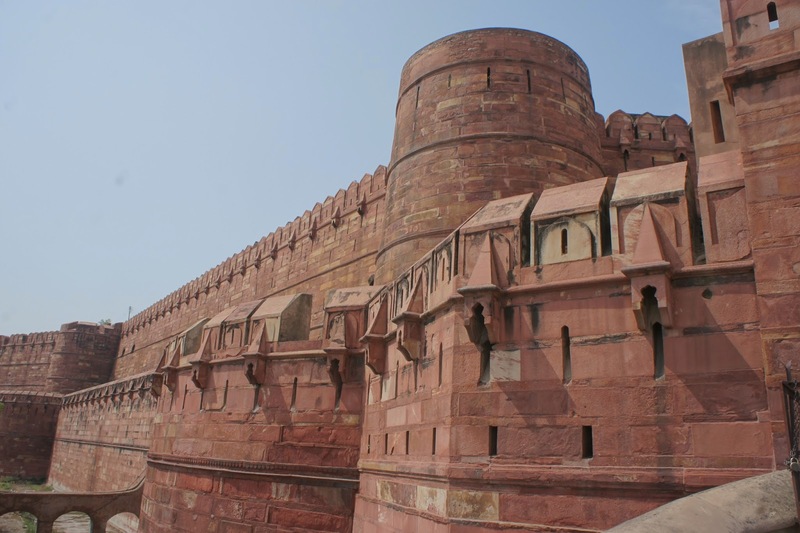 Agra fort was also the stronghold for the Mughals for several generations, and the entire fort was made with red sandstones. 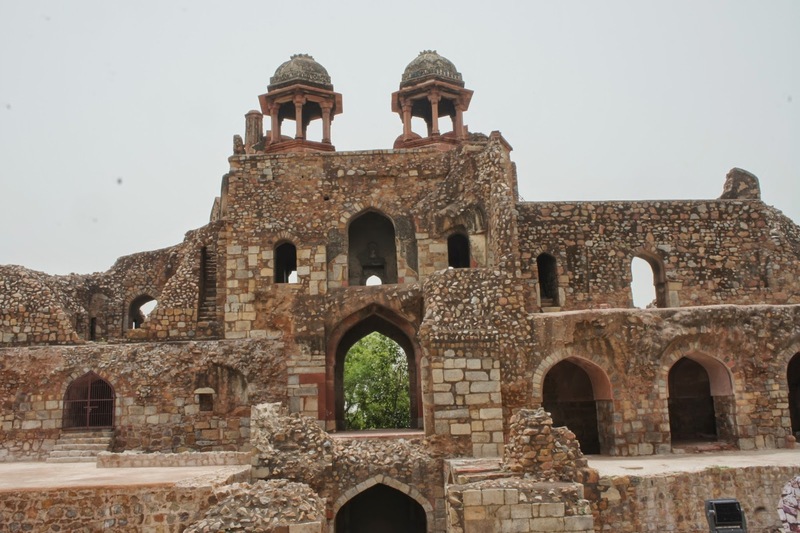 The towers, which was part of the gate, certainly displayed its might and the power of the Mughals back then. It was rather intimidating looking up at the main gate. Through the main gate was another gate that leads to the internal palace. Instead of going through it, I head towards this huge building on the right of the gate. 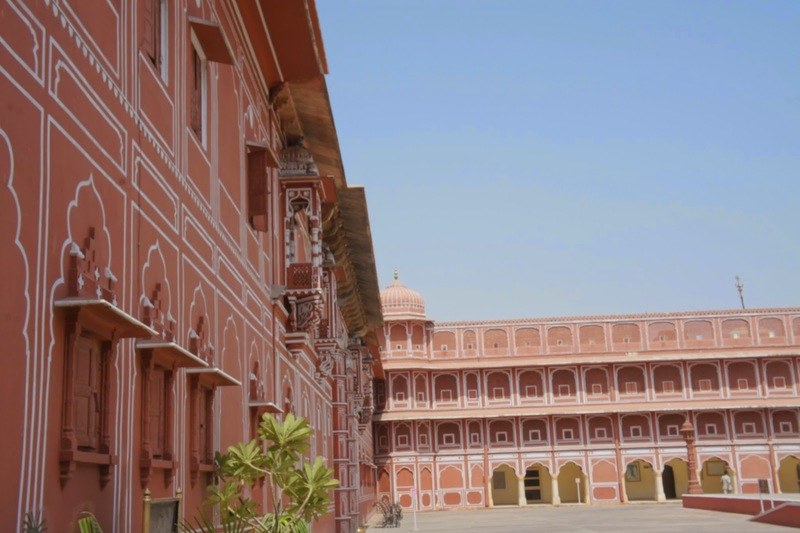 This red building seemed to be some sort of living quarters, as its design is very similar to the Jodbhai Palace in Fatehpur Sikri. 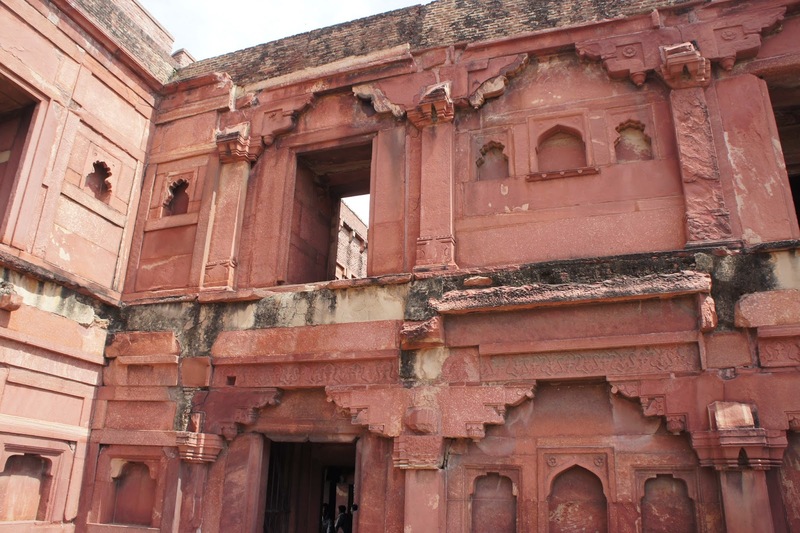 This building was linked to another building beside it, which looked like a library or more living quarters. I walked up to the window that looked outwards from this building. 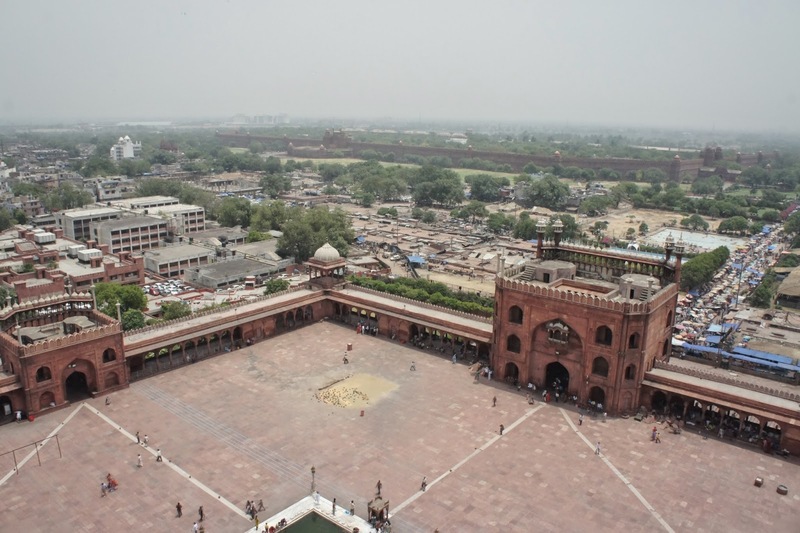 From here I can see Yamuna River and Taj Mahal. 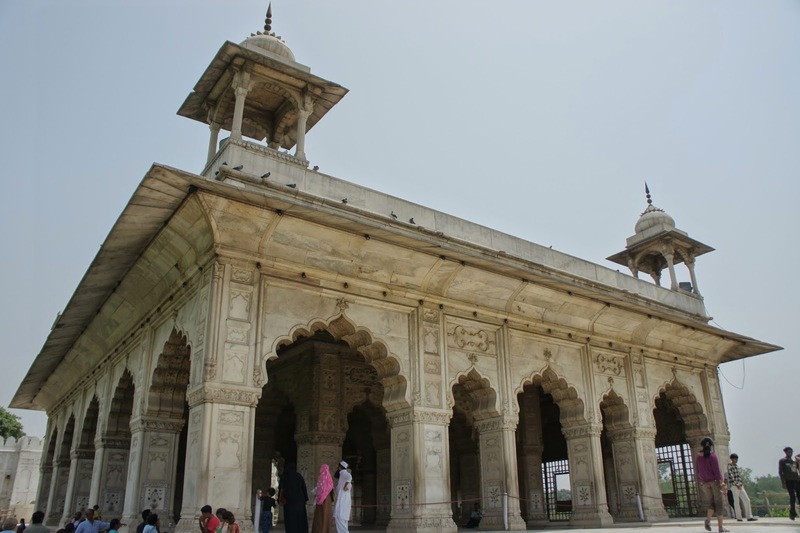 Next to the building was a white marble building, which was a mosque built for Shah Jahan during his imprisonment in Agra fort. 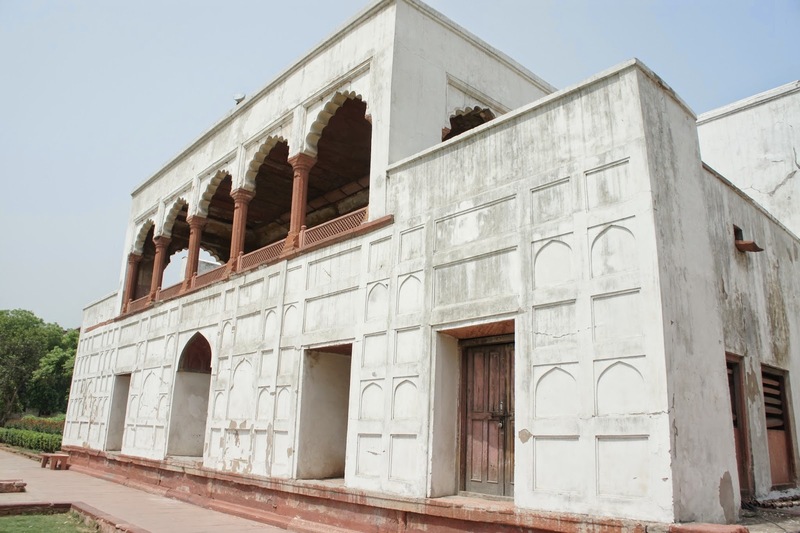 The mosque was tucked in one tranquil corner of the fort and have only 1 entry point. 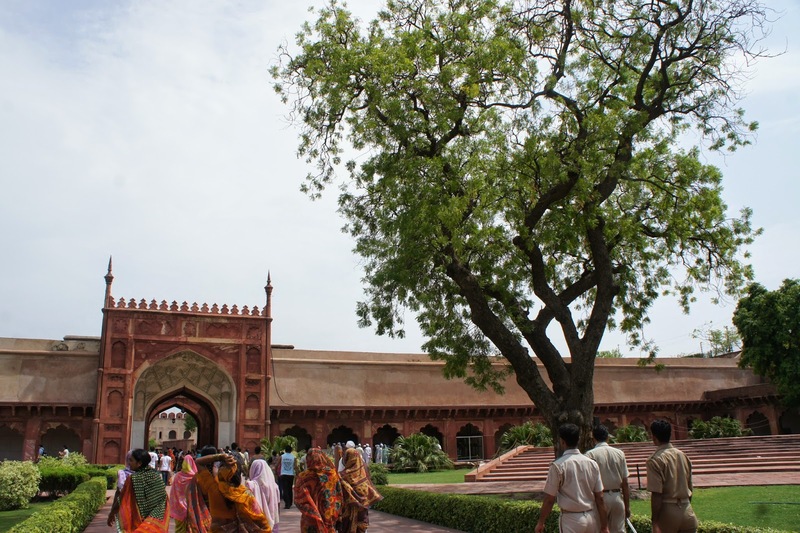 Exiting the mosque, I headed towards the area next to it, which is a rather large courtyard with a black marble on it. This is the throne for the king. 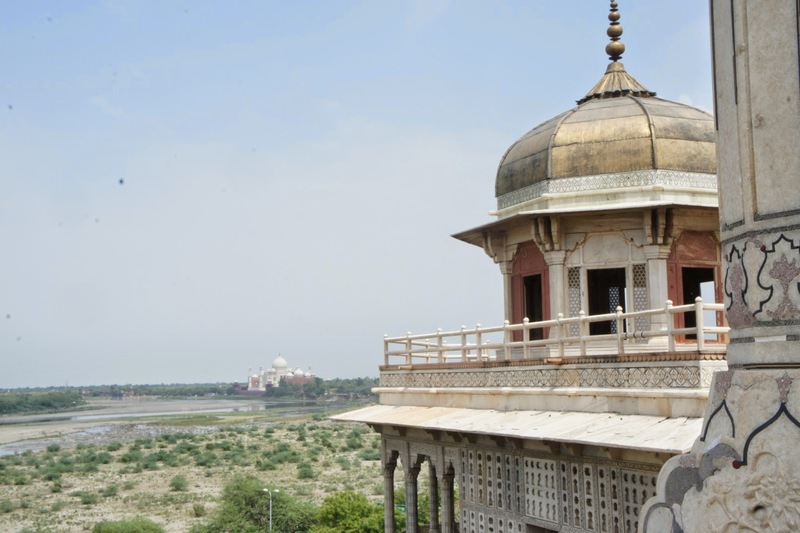 this throne offers good view of Taj Mahal and Yamuna River. Beside the throne was a building seemed to used for entertaining guests. 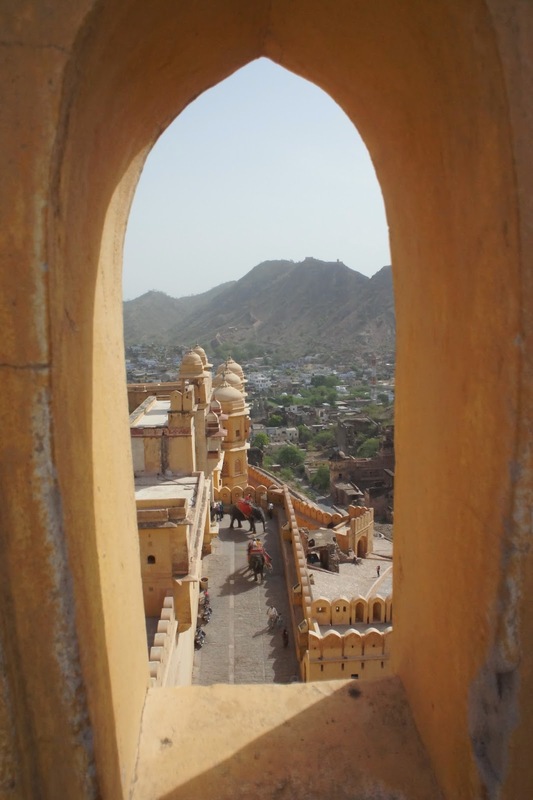 The view from this courtyard was not just beautiful, the breeze here was good too. I headed to the main audience hall after this throne. This hall is huge and looked like it can accommodate hundreds of people at one time. After snapping some pictures, I headed for the main gardens and noticed that there is this area that was cordoned off. Beyond those gates, there seemed to be more buildings that is perhaps worthy of viewing. 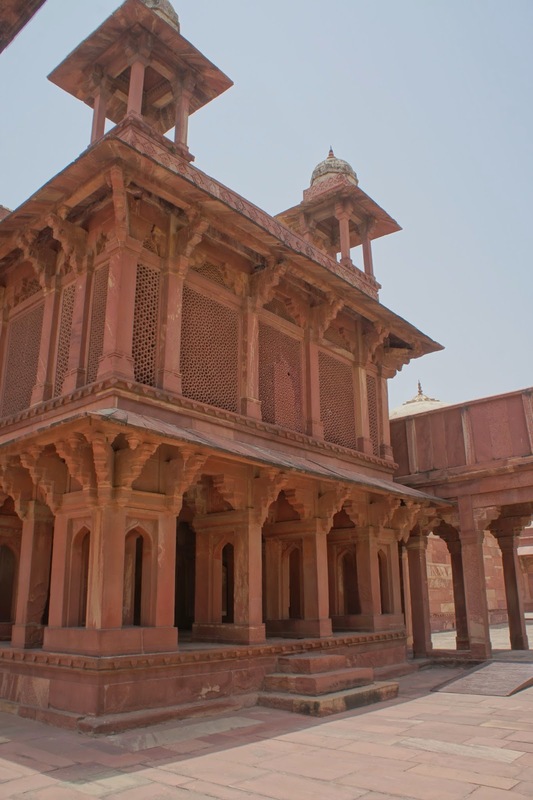 I then head back out towards the entrance, asI thought this is pretty much it for this trip of Agra fort. I thought I had covered all those that was opened to the public. 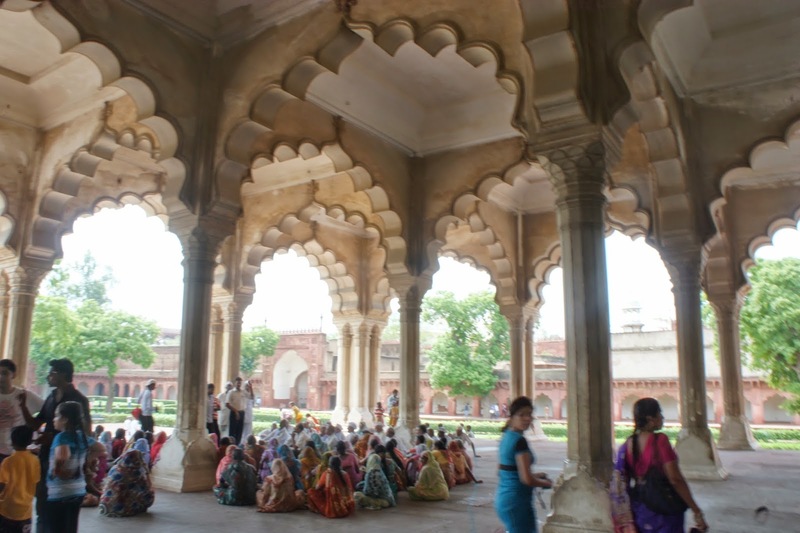 As I was heading out, I heard a guide explaining the Agra Fort layout to tourists. 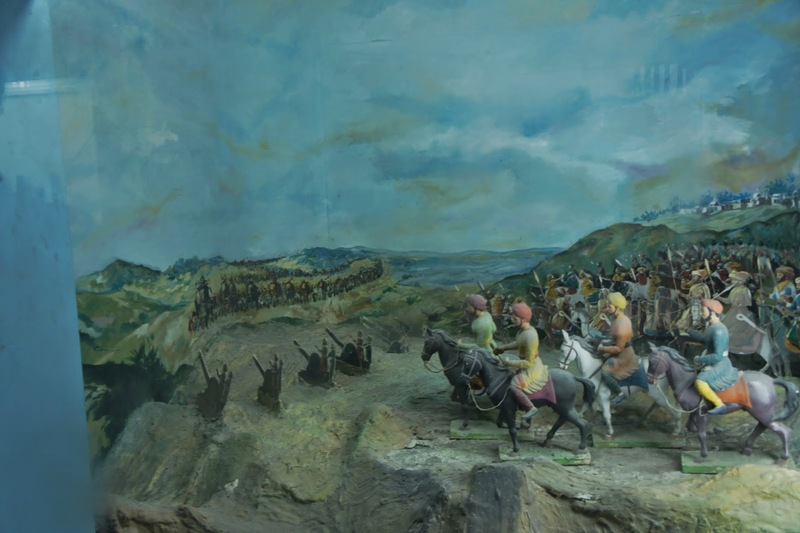 He mentioned that part of the fort was the property of the Indian Army. That explains the cordoned off area that I seen earlier on. 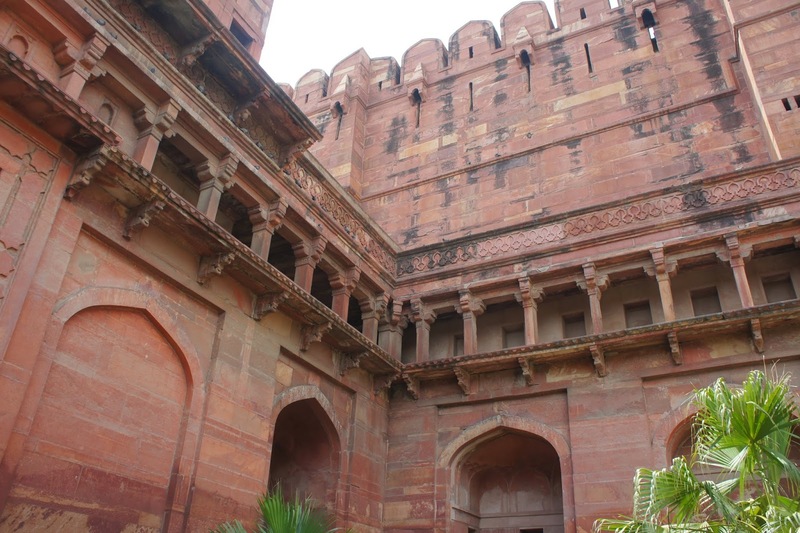 I headed back to the hotel after I exited Agra Fort to pack up and get ready for my train ride to New Delhi. 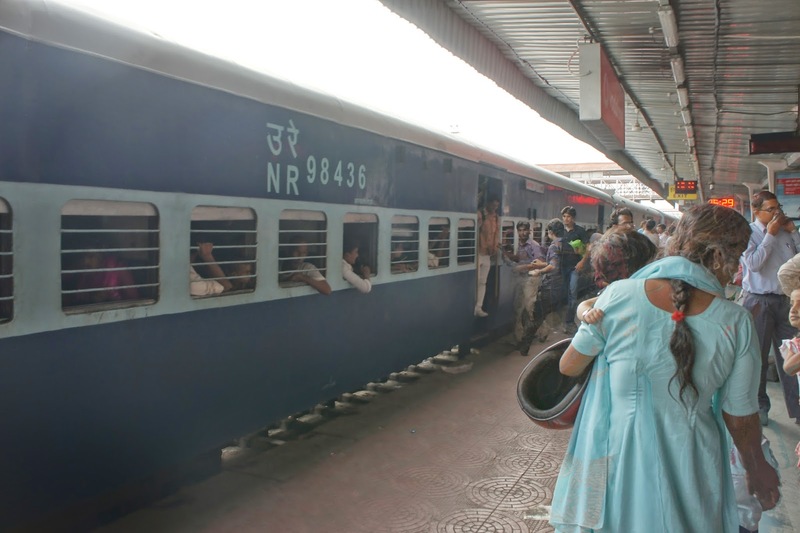 Well train was late as usual in India. But I welcome that lateness as I had always thought the train will depart at 8.55pm. I reached the train station at around 8.45pm, thinking that I have time. After checking the status board, the train was late by 30 minutes. I then looked at my ticket again, this time I realised my train was originally scheduled to leave at 8.30pm. Luckily it was late, if not I would have missed my train. 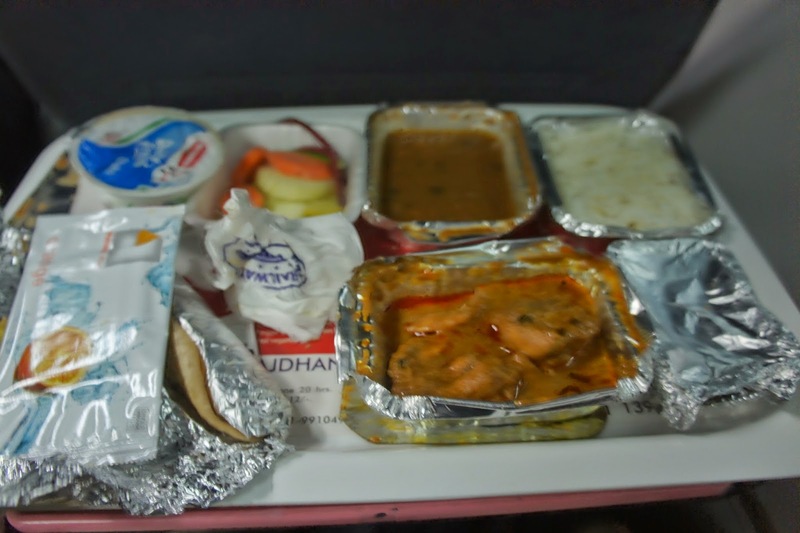 On the train, there was food service pretty much like what one would experience on an airplane. 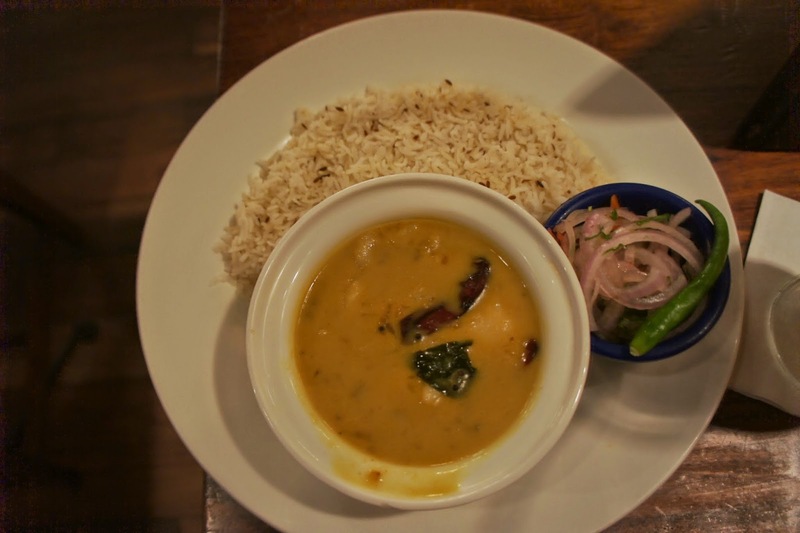 The food was tasty, but in small portions. 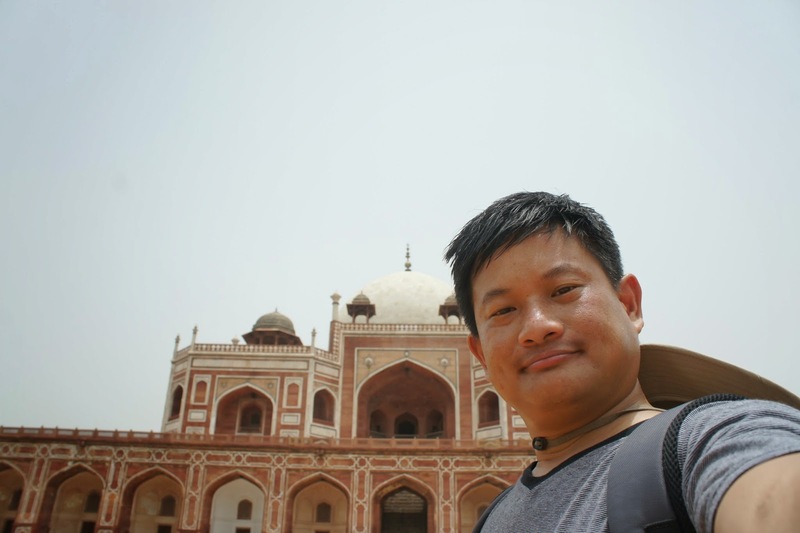 I arrived in Delhi about 1 hour later then scheduled and headed straight to the hotel where I booked a room with. I was pleasantly surprised with this hotel that I will be staying till I fly back home! 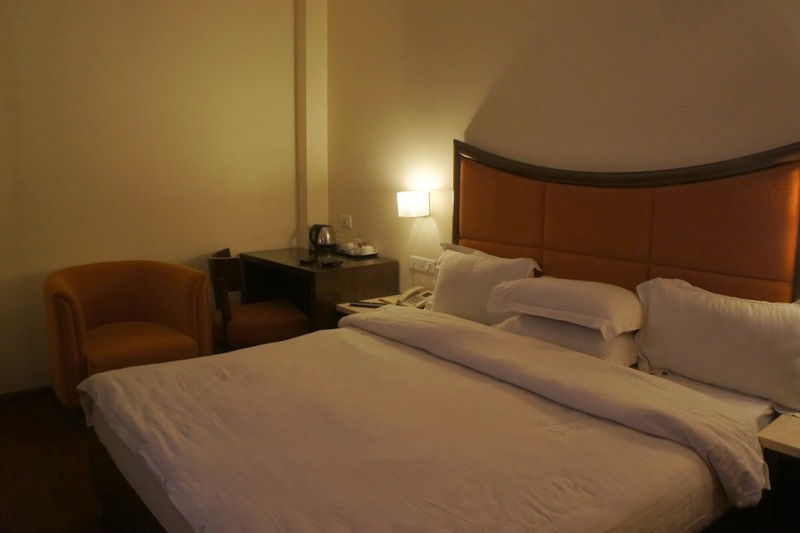 This room has a living area, a small kitchenette and 2 TVs! How cool was that. As it was way pass midnight, I hit the bed after shower to rest for tomorrow. 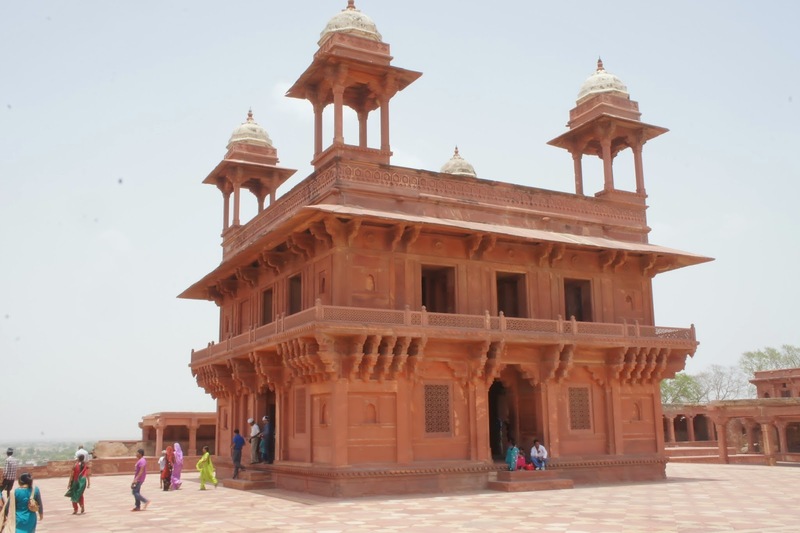 My plan for today was to visit Fatehpur Sikri (this name is easier to type then pronounce). 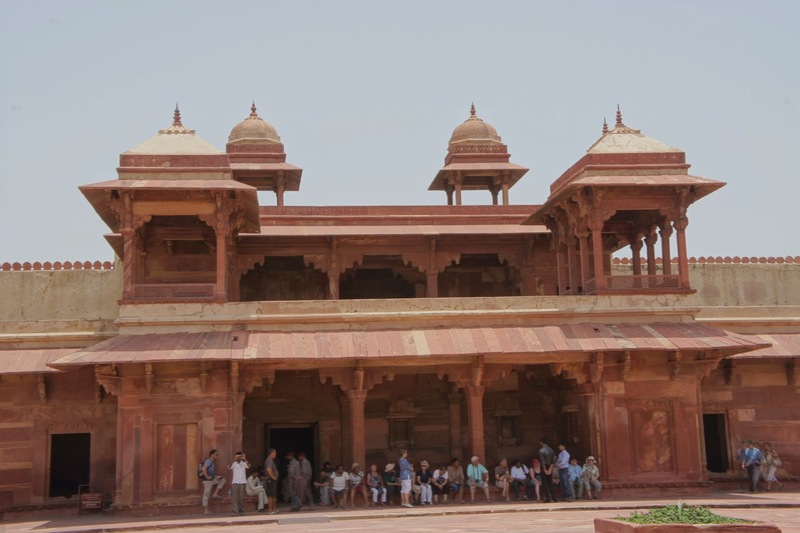 I read on my guide book that the Tourism board has set up a half day tour for this ancient city which is located about 39 Km from Agra. 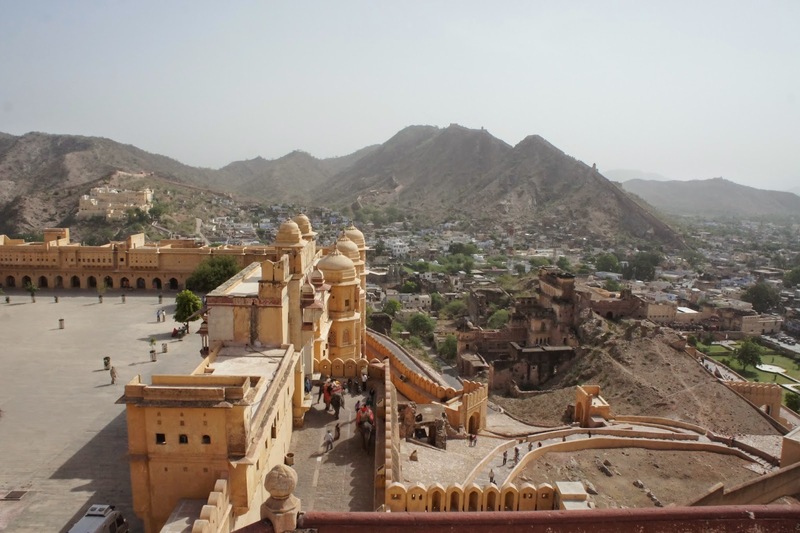 The tour seem quite a deal, pricing at 550 rupee, with guide and entrance fee. Hired a auto rickshaw to take me to the tourism board. 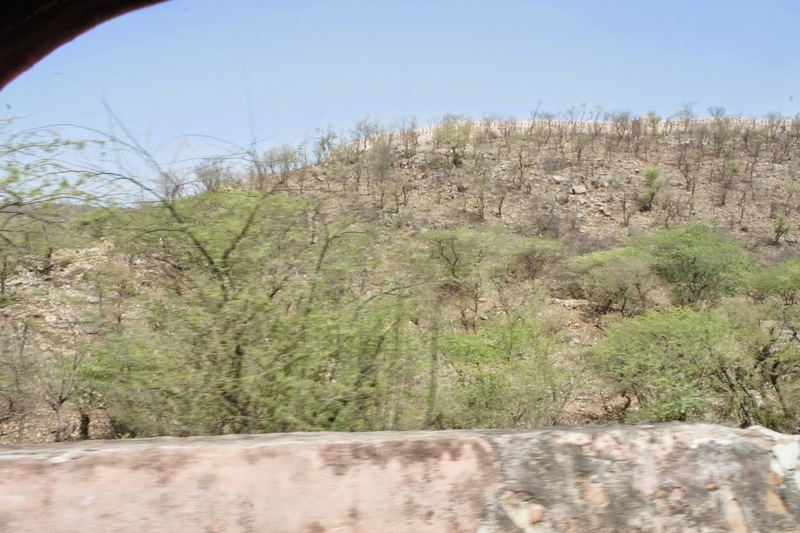 On the way, the driver kept hard selling his service to bring me there at a price of 650 rupees, entrance extra. But I told him of the deal that tourism board is offering, he backed down and brought me to the tourism board. At the office, the staff told me that bookings has to be made at the railway station, which I then head over to. At the railway station tourism board office, the staff there told me the tour will leave at around 10.30 am, subjected to if they can get at least 5 people for the tour. So I waited till the time arrives. 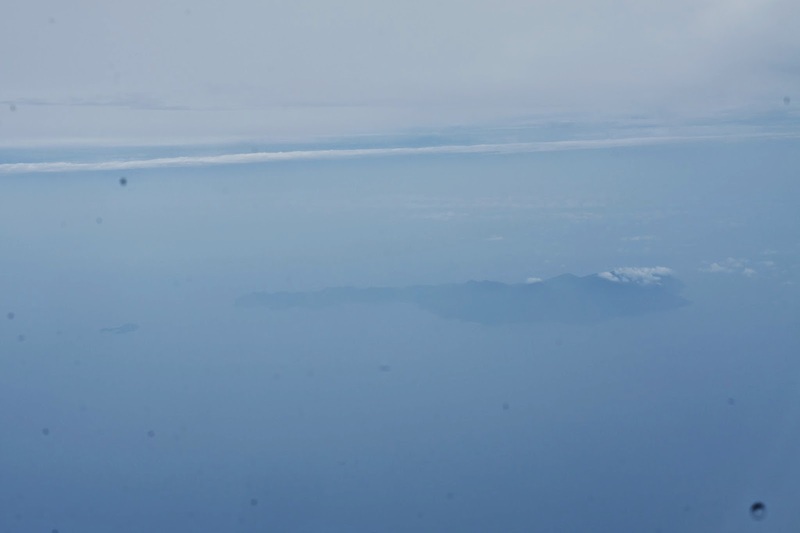 At around 10.30 am, the staff then told me the trip will be cancelled as I am the only one. 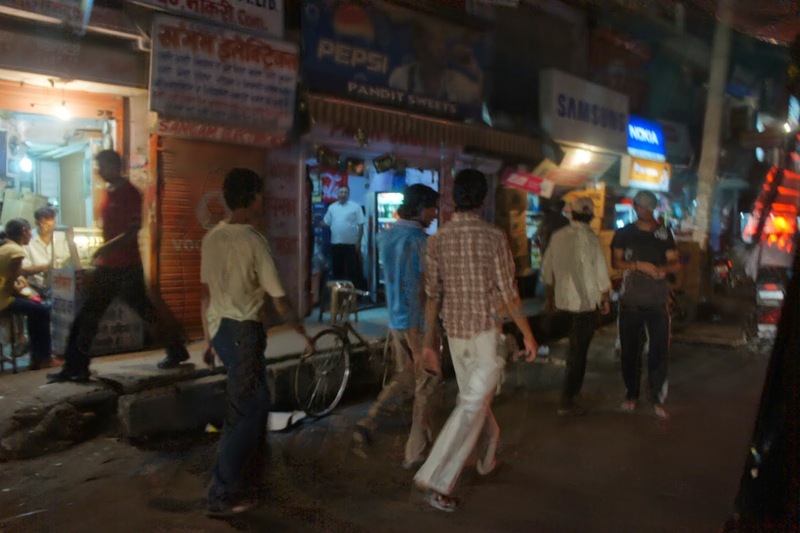 They advised me to take a rickshaw to the nearby bus station for around 5 – 10 rupees and take a bus from there which cost about 30 rupees. As I was heading out for the rickshaw rider, the forever persistent tout saw me walking out, a few of them came rushing towards me. 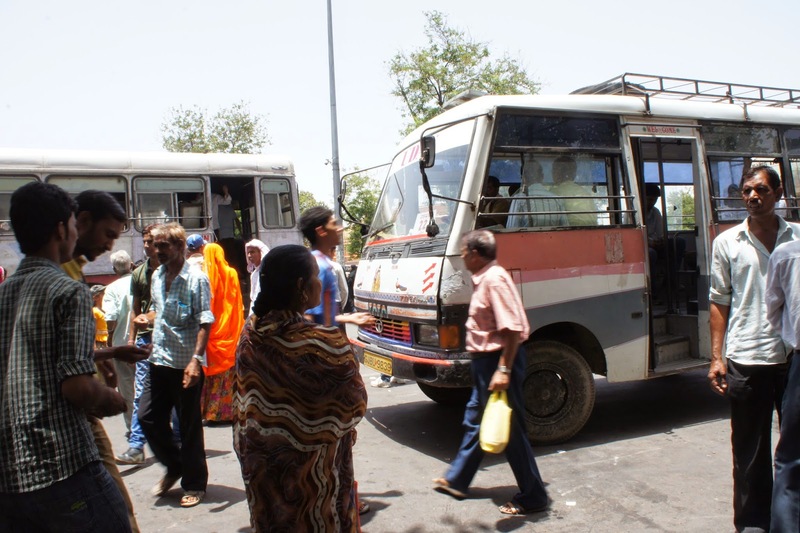 There was this driver who offered quite a good deal, 10 rupees for an air-con ride to the bus station. 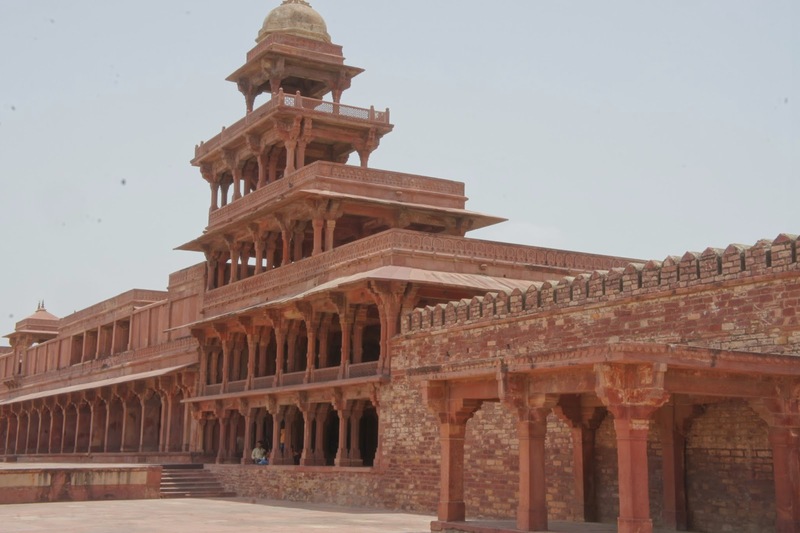 However he did not stop there, instead of bringing me to his car, he haggled for my trip to Fatehpur Sikri. He was asking for 900 Rupee for the return trip, admission extra. 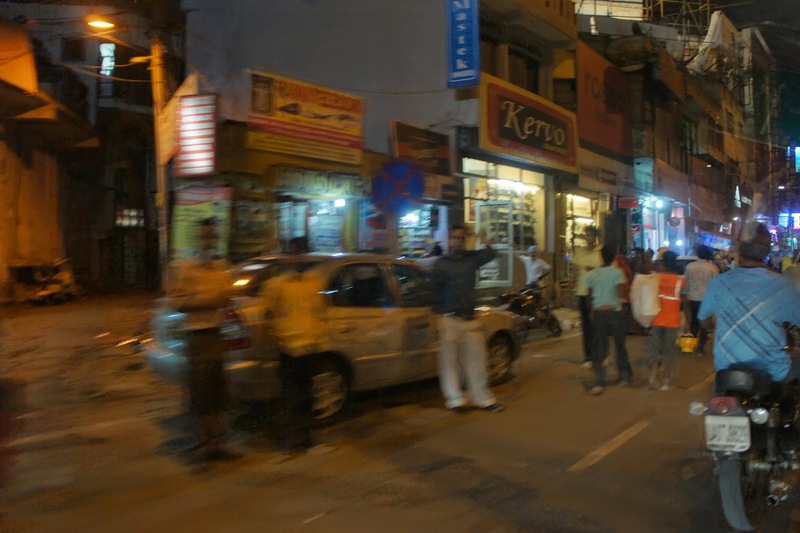 I then told him the driver who drove me to the train station offered to take me there for 650 Rupees and was rejected by me, let alone the 900 Rupees he was asking for. After some haggling, the man backed off and asked how much I was willing to pay. I told him 500 Rupee return, plus waiting time and inclusive of tolls and parking. Well this price was rejected by him initially, so I told him it is fine, I’ll just take the bus which will only cost me about 10% of this amount I am offering. 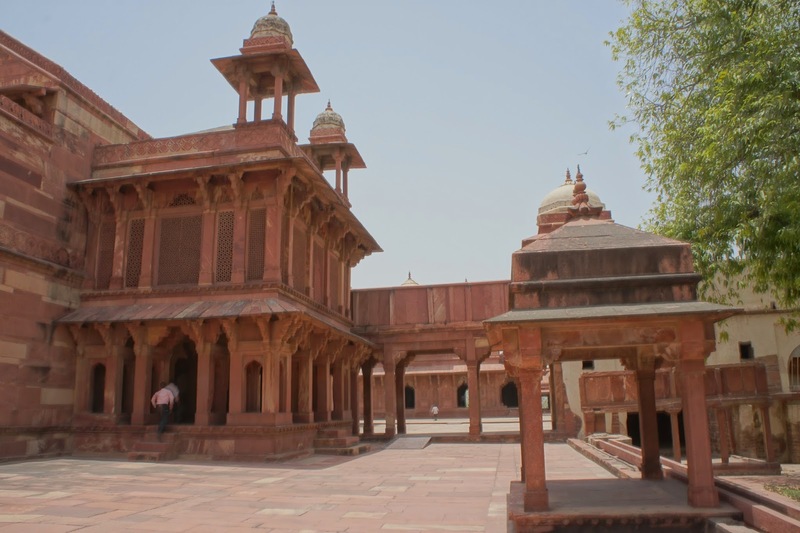 As he see me about to walk away, he frantically looked around for one of his friends, who agreed to take me to Fatehpur Sikri for 500 Rupee, all in excluding admission. I confirmed with him 3 times and told him I will not pay anything more then 500 Rupees. 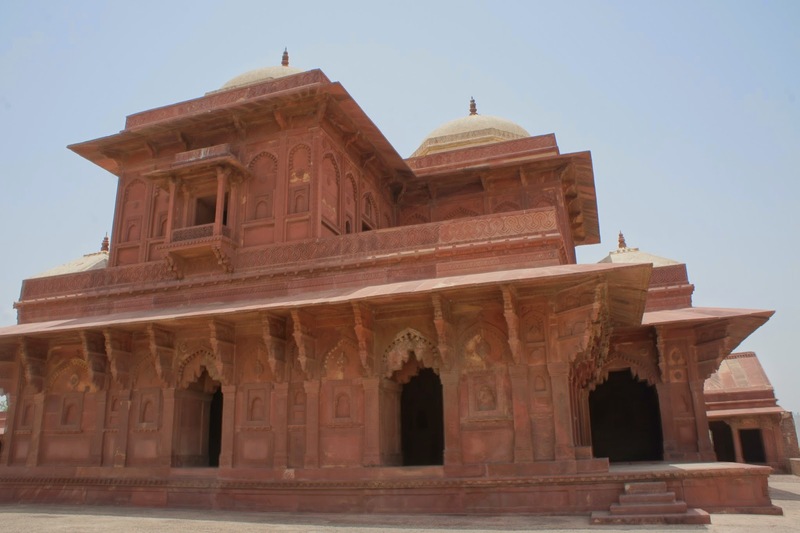 After confirmation and agreeing, I finally set off to Fatehpur Sikri. 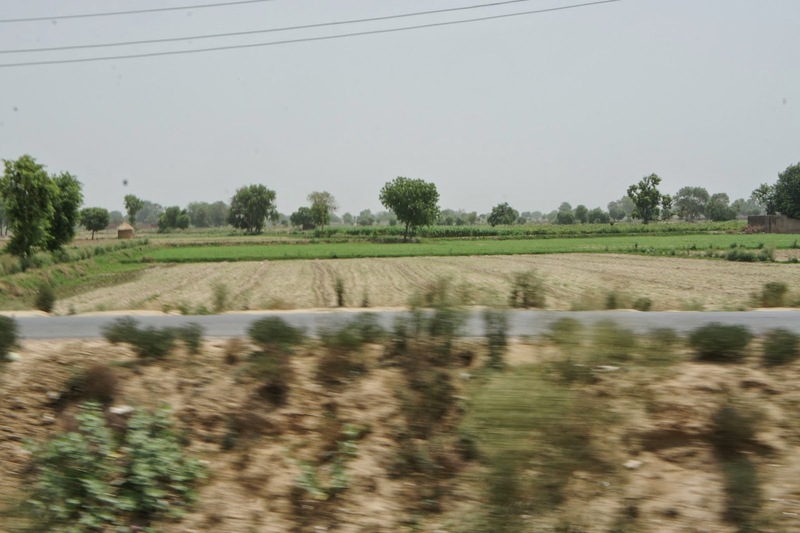 Along the way we passed by some rural villages and farmland. 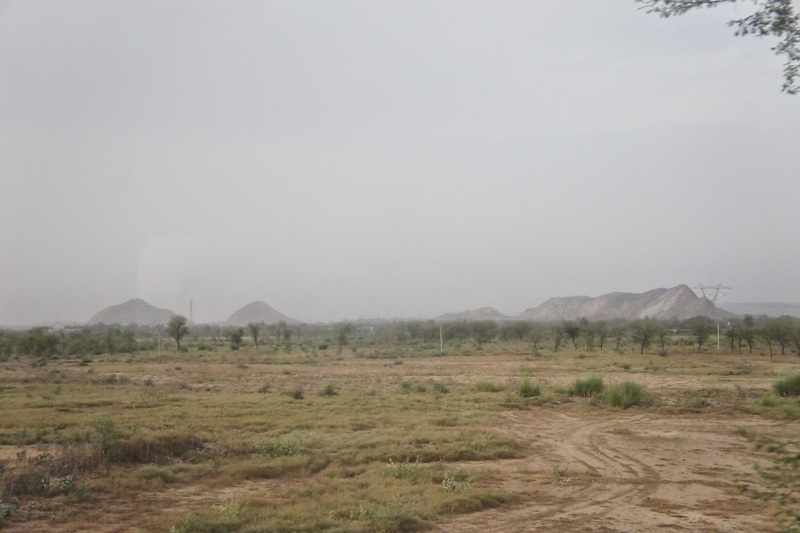 As it is middle of summer, most of the farmlands are dried up. 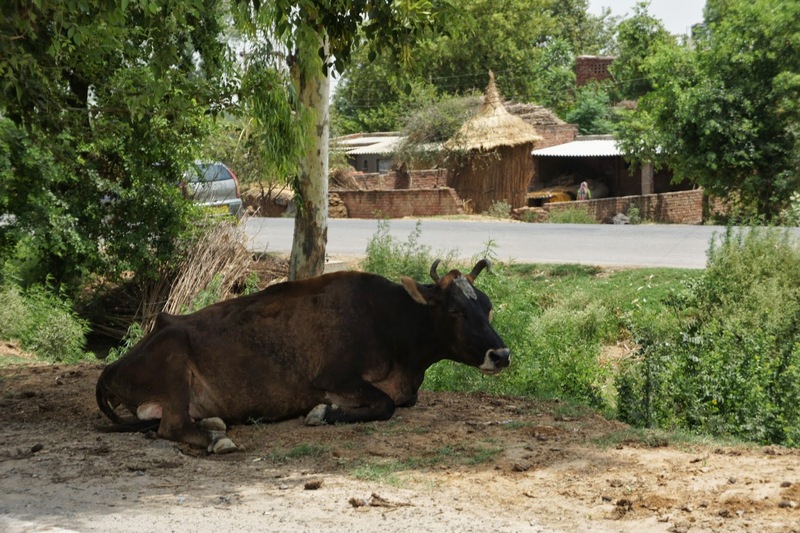 People (and the animals) simply laze under trees to cool the summer heat off. After some time, we reached a toll gate. The driver turned around and asked 85 Rupees for toll charge. 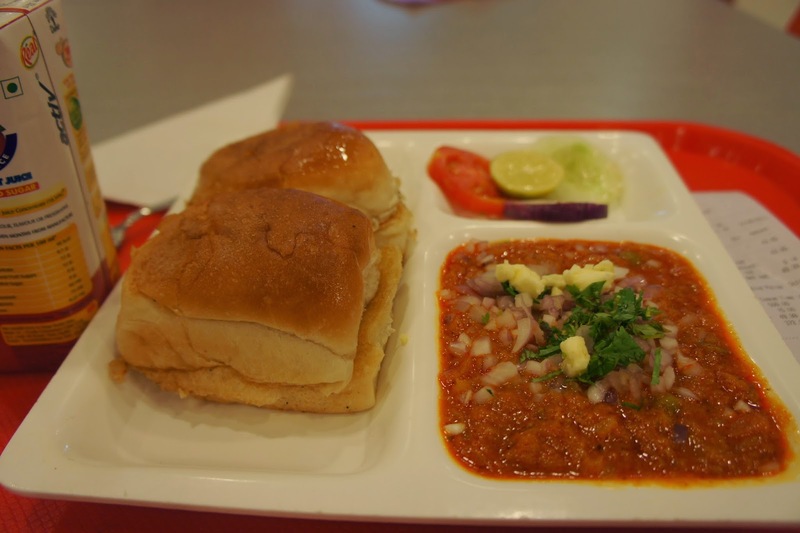 I firmly told him that it is not part of the deal, I agreed to pay 500 Rupees only and nothing more. I told him he would have to fork the toll charges himself. I think the driver saw that I was rather persistent in my stand, he simply backed off and I saw him stuffing 10 rupees to a guy and we went pass the toll gate without paying. At this point I was glad that he did not chase me off his ride, if not I’ll be stranded in the middle of nowhere, but then again why would he do that? If he had thrown me off his ride, his trip so far will be wasted. So I guess I was having the upper hand at this point in time. However what baffles me was his dishonesty. If toll charges was free, why did he demanded 85 rupees out of me?? 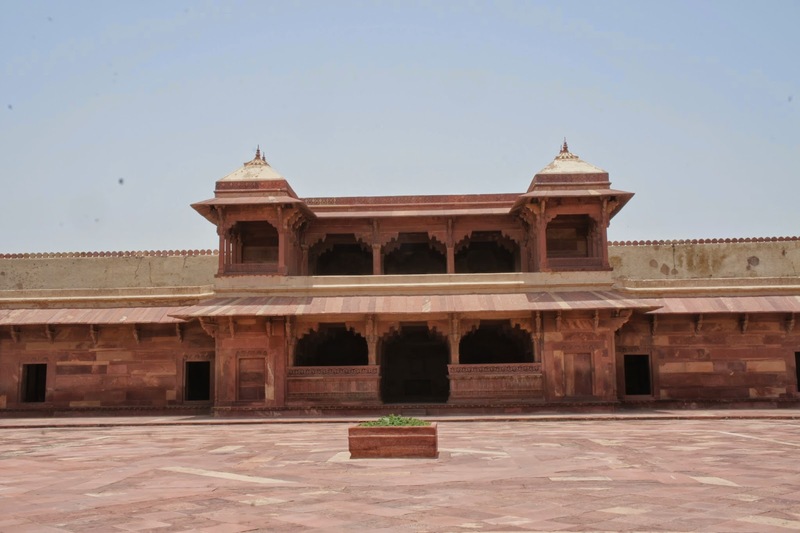 Fatehpur Sikri was termed The Ghost City as it was abandoned about 20 years after it was built. 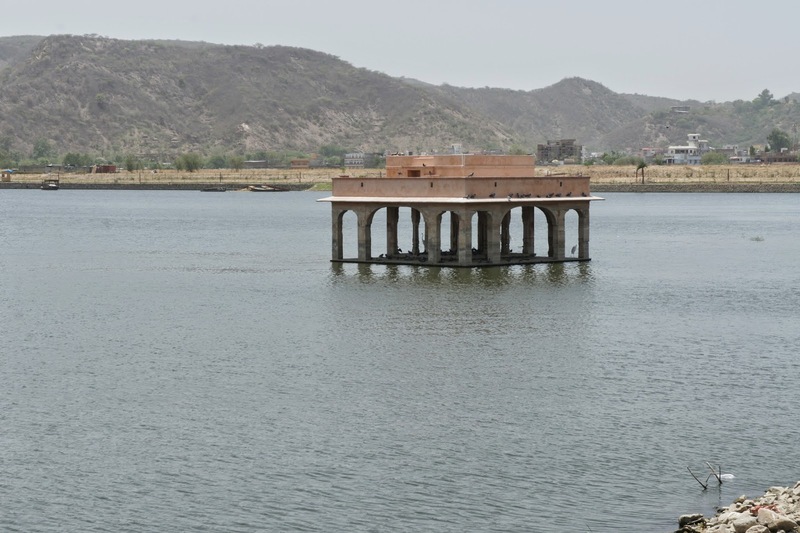 There were 2 theories about its abandonment, one is that there wasn’t enough water supply to sustain the whole city, which later was debunked as people found water at the nearby reservoir. 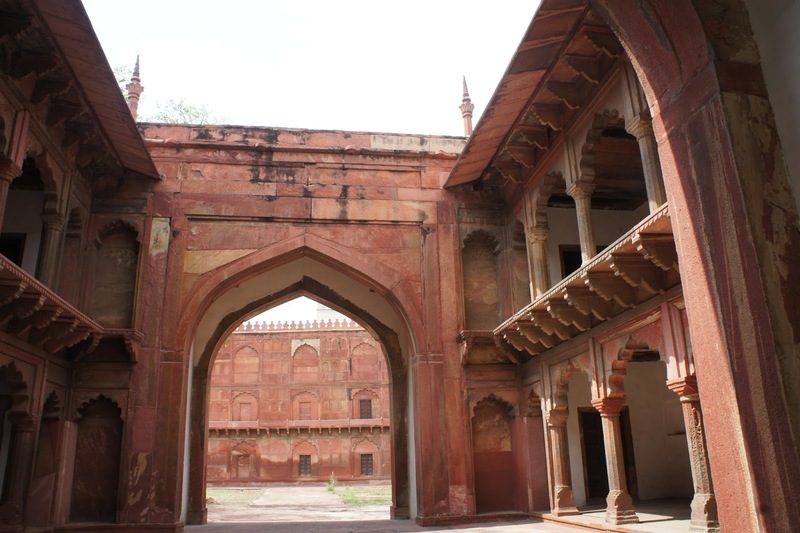 The other more convincing theory was that Agra was a better location to fight off enemies, thus the kings decided to abandon this city in favour of Agra. 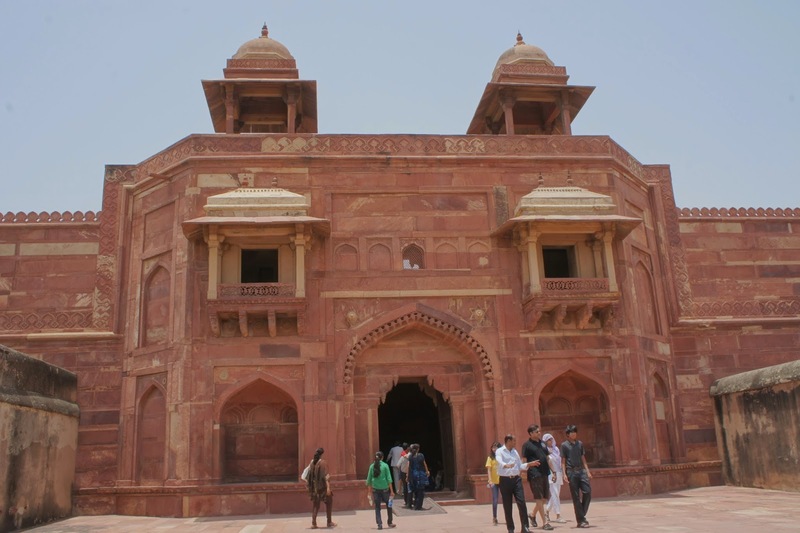 We arrived at the base of Fatehpur Sikri not long after the toll gate. 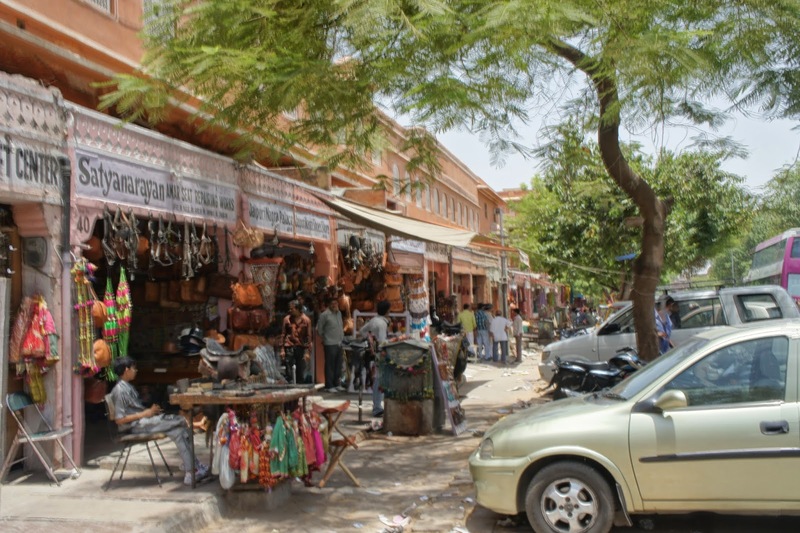 As we were turning into the parking space, the driver turned around and told me (in a rather soft tone) not to pay anything more then 20 rupees for a guide as most of them are unlicensed. Well I was glad that the driver offered this piece of information. As the vehicle came to a halt, the touts sprung into action. 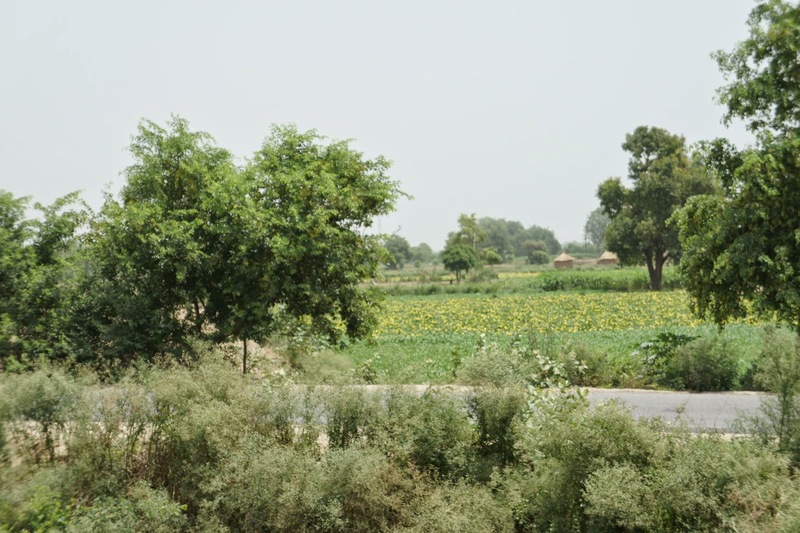 A guy claimed to be a licensed guide asked for 500 Rupees for his guiding services. I told him I already paid 500 rupees for the ride to the base and there is no way I am going to pay anything more other then the entrance charges. 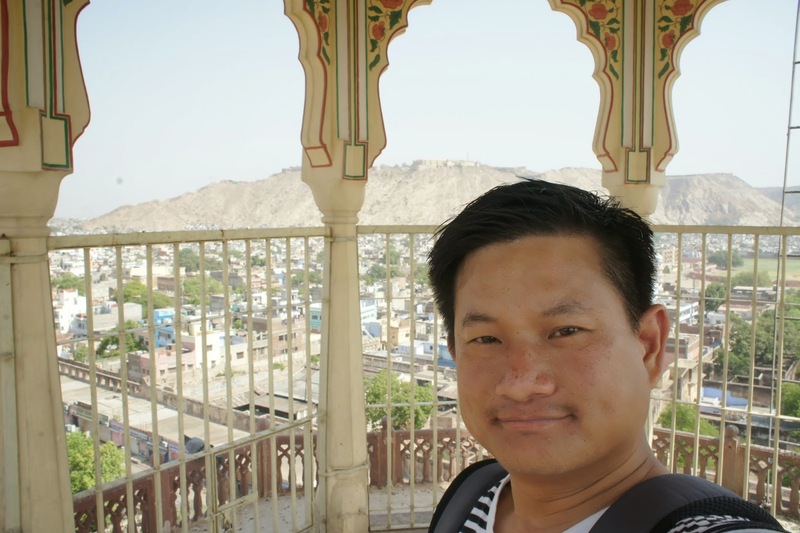 The guide that backed off and started to lower his price to 400 rupees and then 200 rupees and subsequently 50 Rupees upon seeing how relentless I was in refusing his offer. Even for 50 rupees I did not want a guided service as I really had it with the touts and people who self proclaimed to be guides. I told them I just want to visit the place by myself without anyone annoying me. 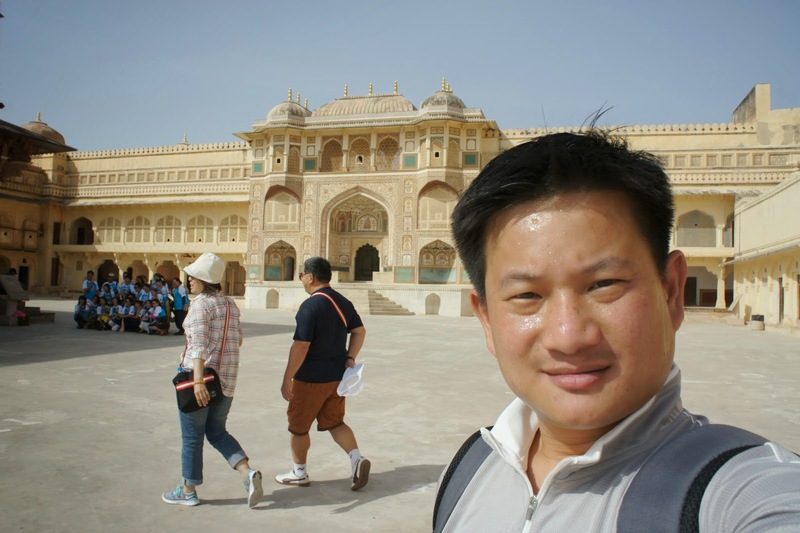 They backed off and I headed towards the bus which brought me to the palace entrance. 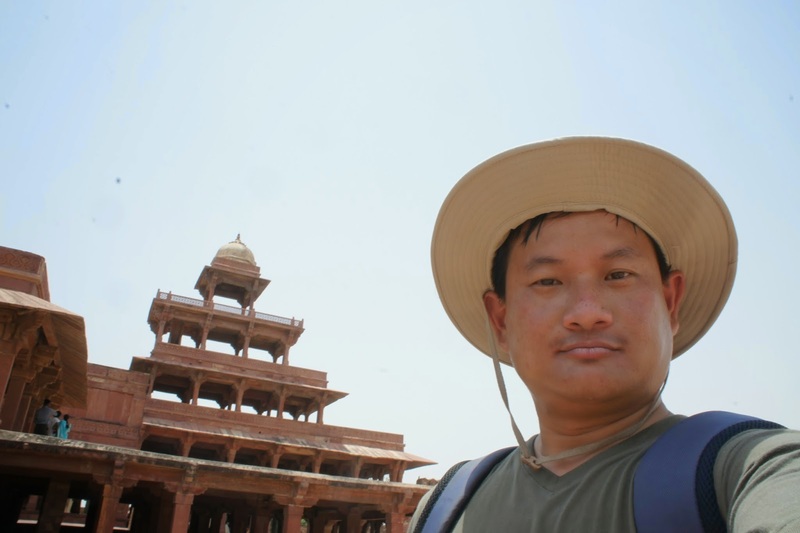 After getting the tickets for the palace entrance, another man approached me claiming to be an authorised guide. He showed me his pass and started to ask for 450 rupees for his services. I rejected him flat and told him I just want to visit the place by myself. The man then left me alone, seeing that big “no sale” expression on my face and told me if I needed a guide come look for him. 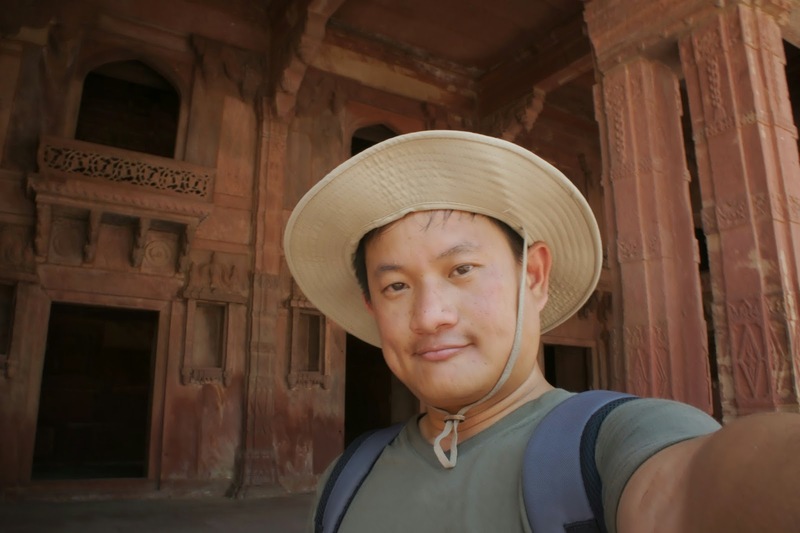 After freeing myself from all the touts, I was glad I was able to roam around myself. 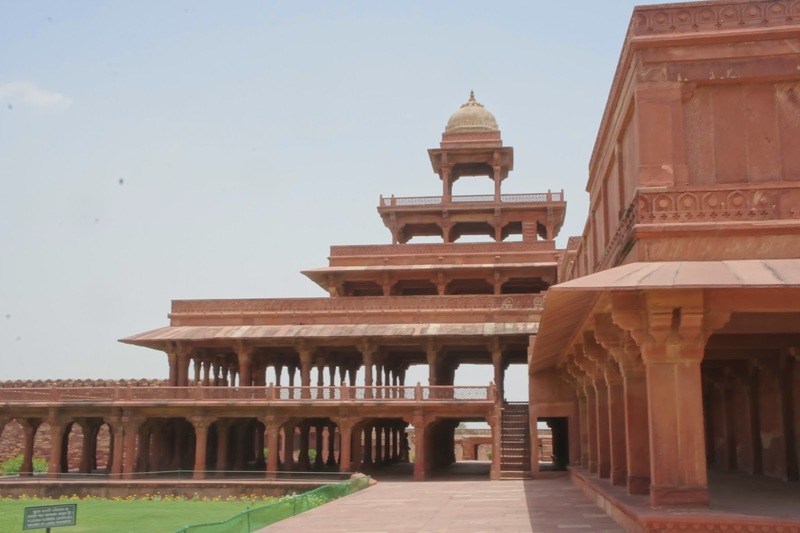 The first building that greeted me was the Jodbhai’s Palace. 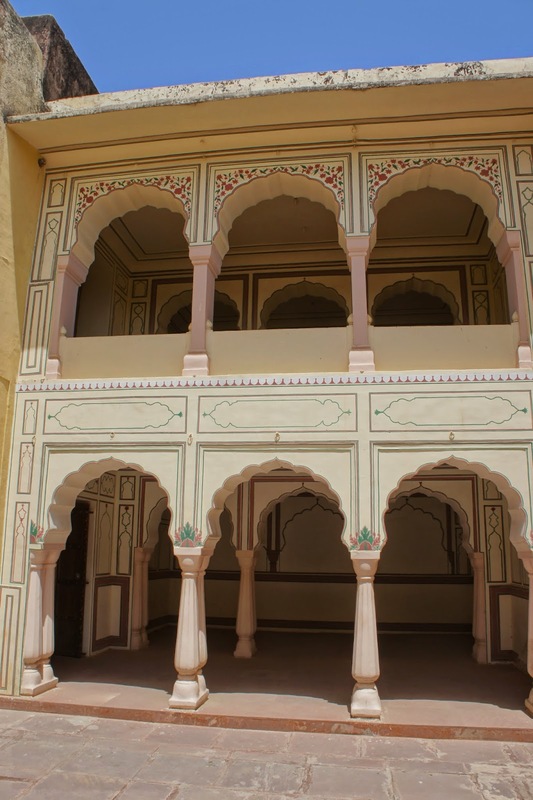 This building has a rather large courtyard in the centre and rooms at the sides and each room seemed to have a small balcony. This is where it was believed that the king made as his living quarters. 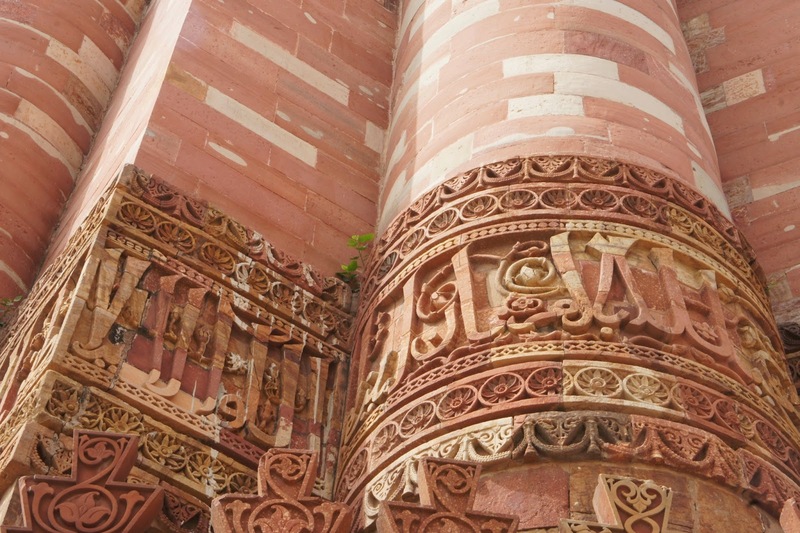 The Sandstone building was rather elaborate it terms of size and the designs on the pillars and walls. 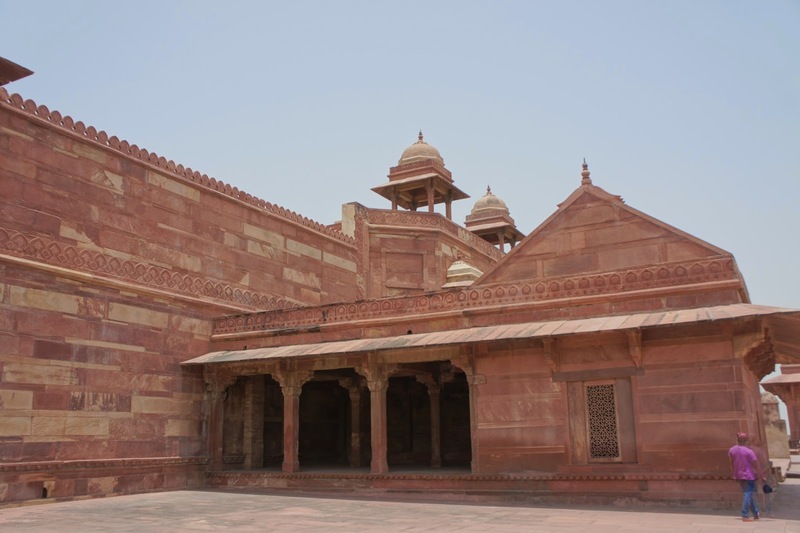 At the centre building (facing the entrance), there seemed to be a throne room or at least a place where the king would grant private audience to people who he trust. 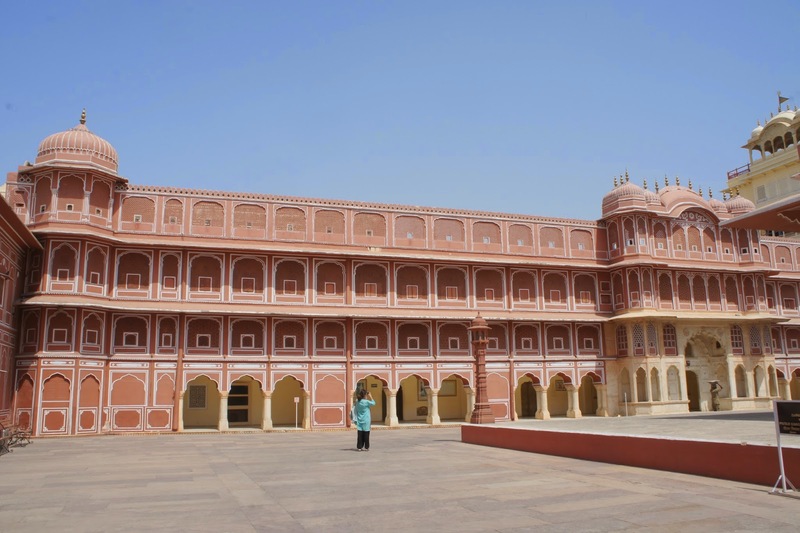 The attaching side buildings are symmetrical in terms of design and the number of rooms. I left this building after snapping some pictures for the other parts of this palace. 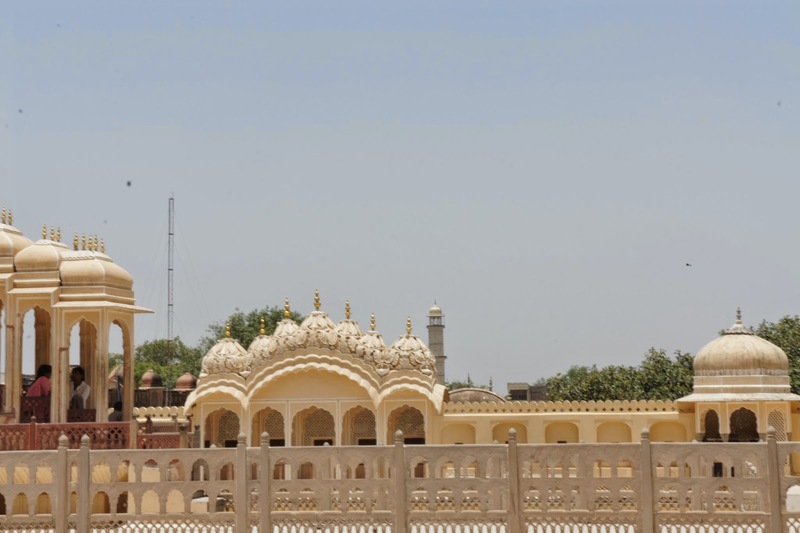 According to my guide book, the building to the left of Jodbhai’s Palace was the Wind Palace. 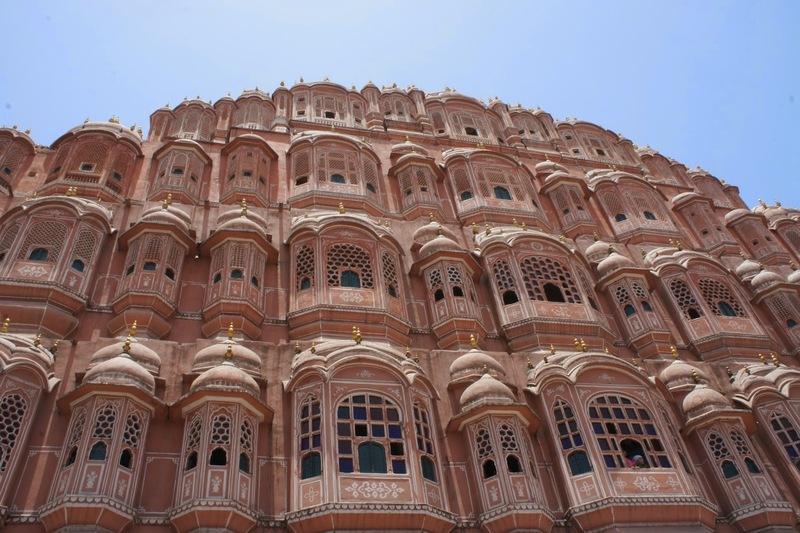 I was kinda expecting something like the one in Jaipur that I saw. I scanned around and saw nothing like that in sight. 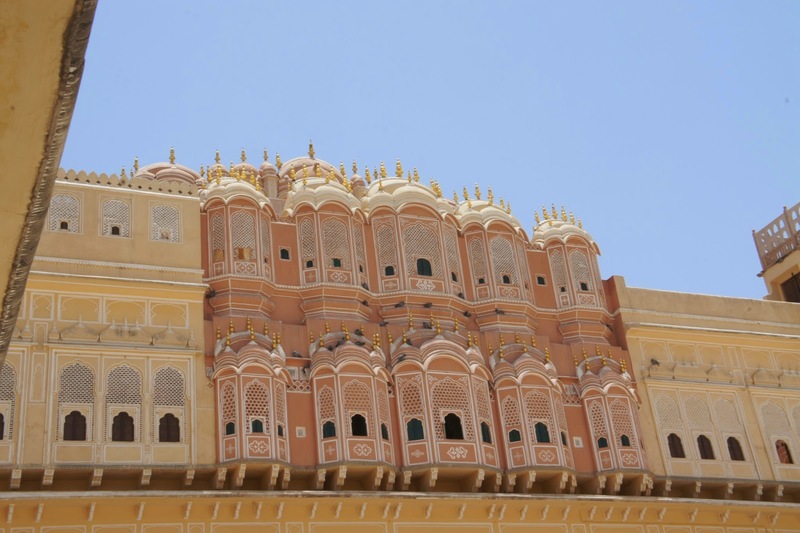 But then I realised that the Hawa Mahal is actually attached to Jodbhai’s Palace took some pictures of it and headed for the residence of The king’s most trusted adviser, which was behind Jodbhai’s Palace. Well the building was there alright, but the architecture was not impressive. 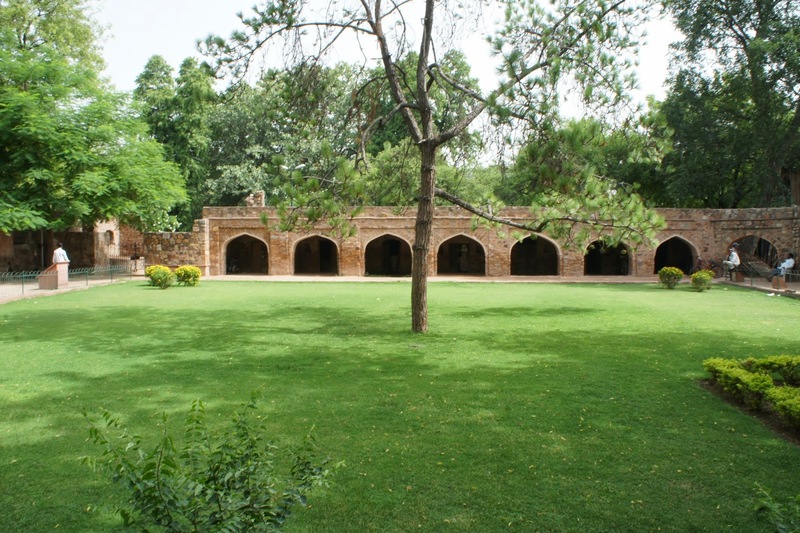 Right next to the adviser’s residence is the stables. I did not really go all the way into the stables. 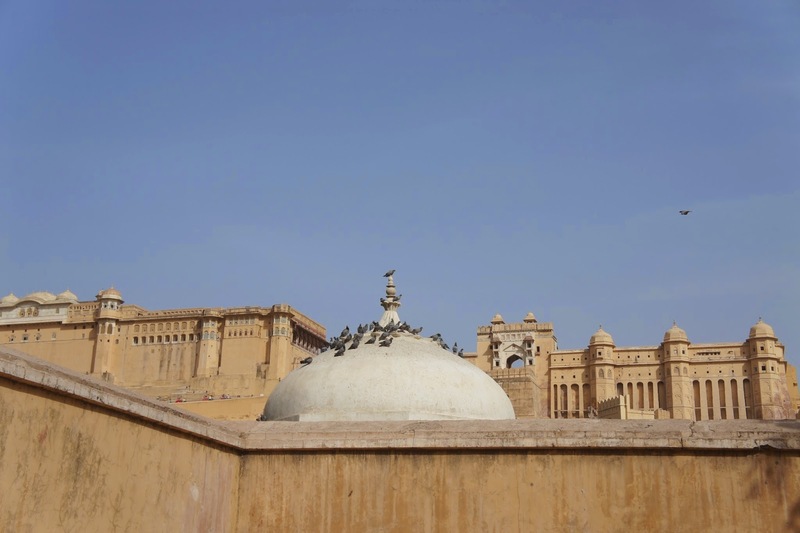 Headed back to the main area within the palace complex. 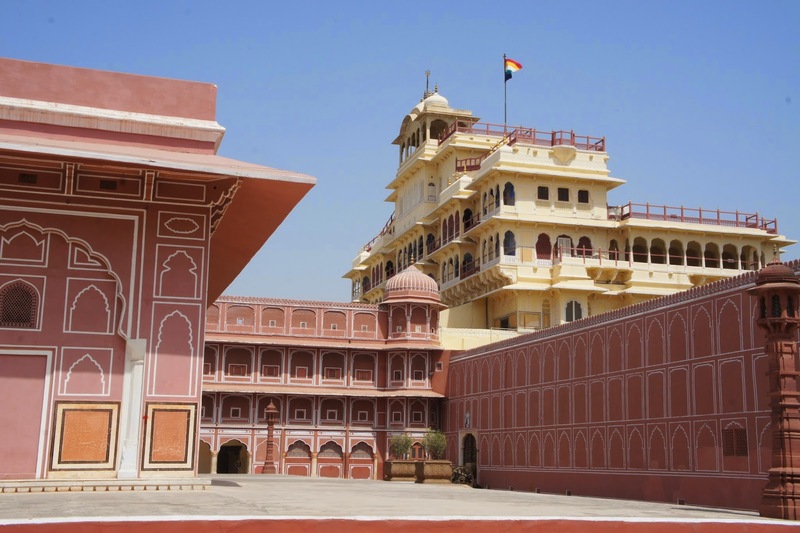 There are several more buildings within this palace grounds, there are a few which area rather distinctive. 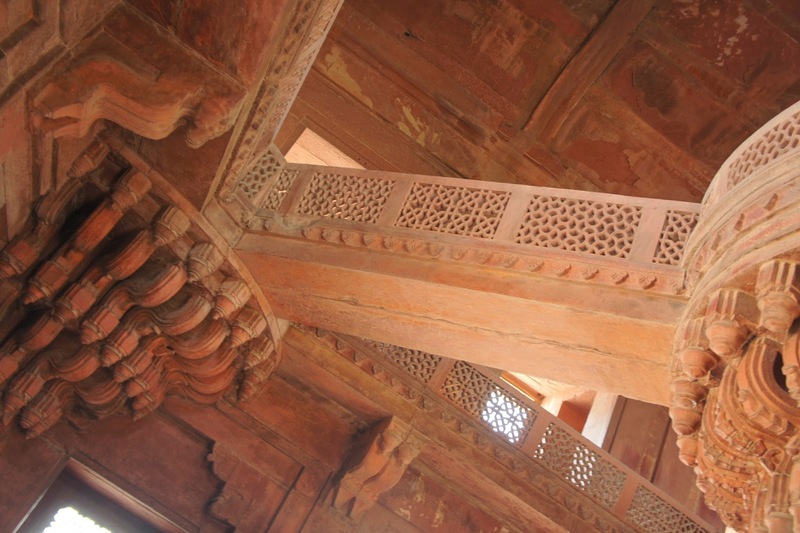 One of them is the hall of private audience, the interior of this stand alone building has one big and elaborately carved pillar, connected to 4 corners of the building by means of bridges. 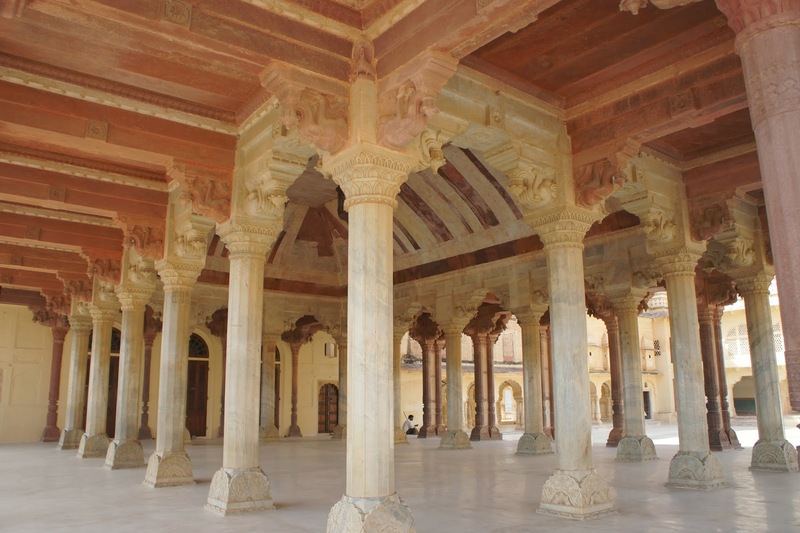 The centre pillar is where the throne used to be for the king to be seated for his audience sessions. 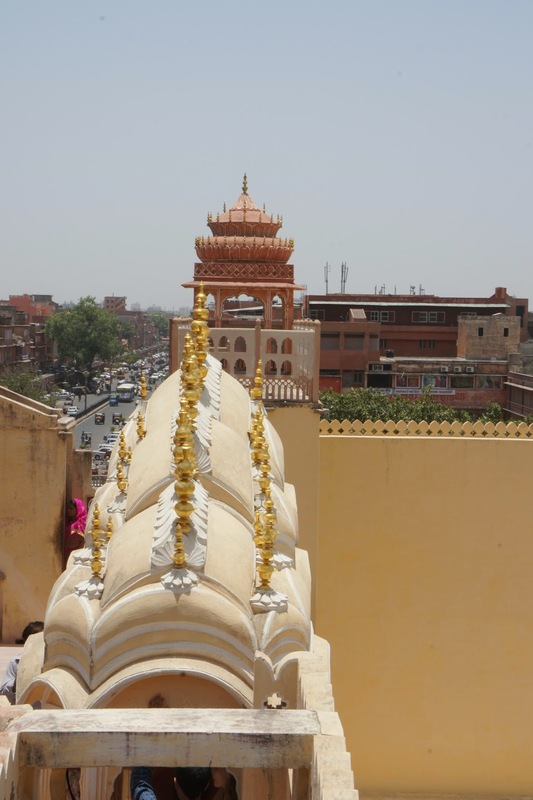 Another building that has rather unique architecture is the Panch Mahal, a 5 storey building that has one level constructed to be smaller then the one right below. 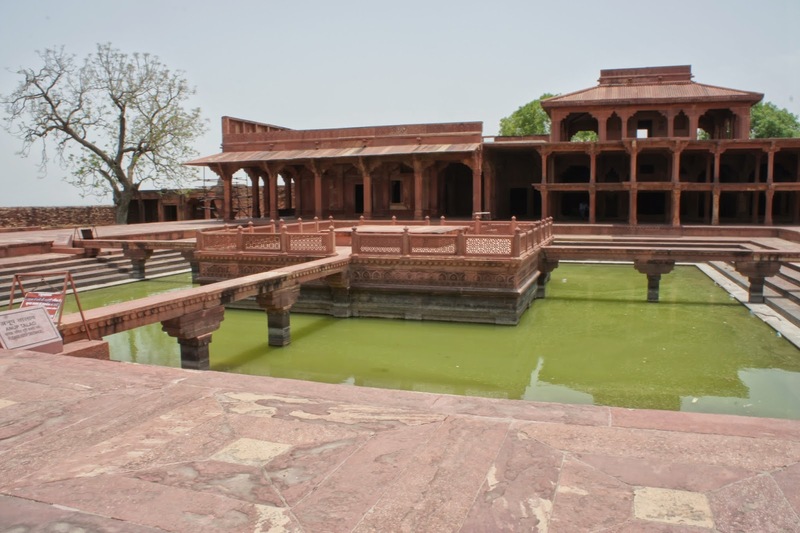 This is where the king come to enjoy the summer breeze and to admire the moonlight. 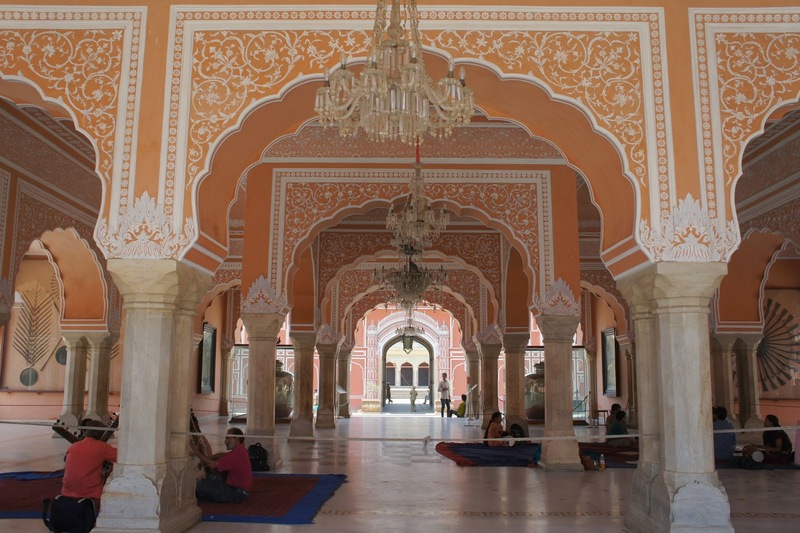 Quite an elaborate building for relaxation for the king. 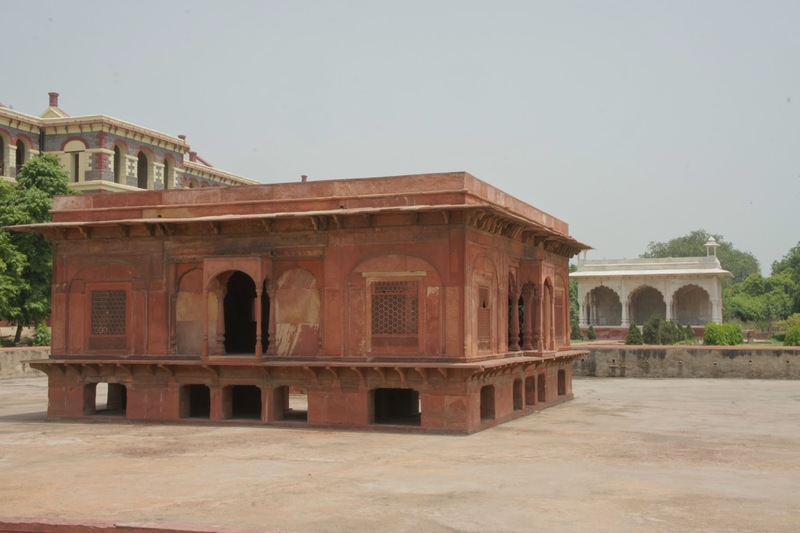 Next to the Panch Mahal is a small pool with a platform in the centre, accessible by small bridged built on each of the four sides. Directly behind the pool is the House of Turkish Sultana, which was believed to be the residence of the king’s favourite mistress. The rest of the palace grounds are repetitive buildings, which has rather ordinary architecture, as I thought this could be the end of my palace grounds visit. 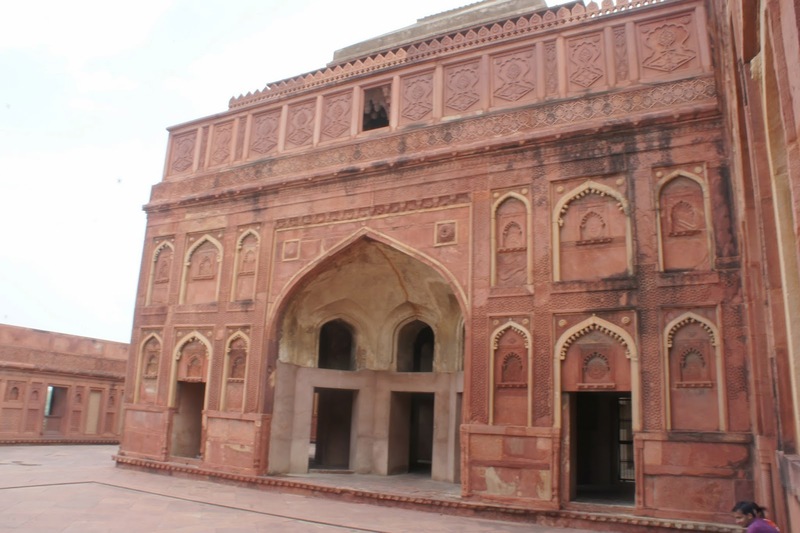 I walked towards the entrance and headed for the Jama Masjid mosque. 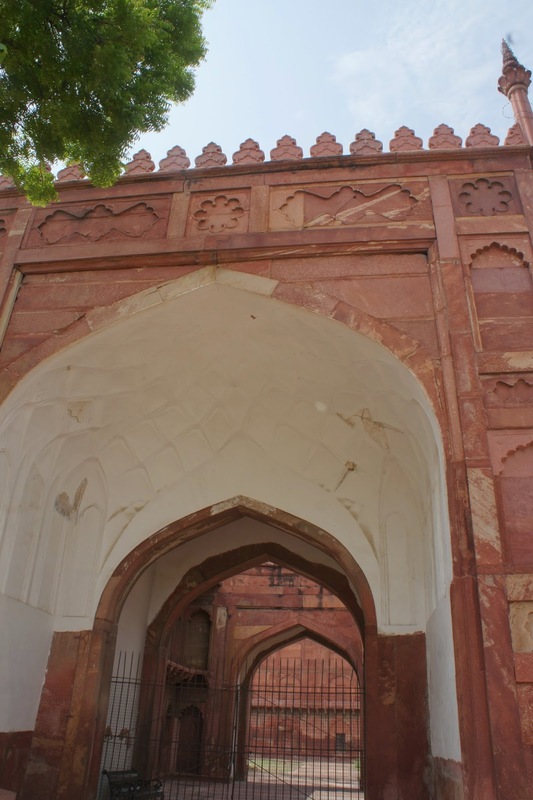 The entrance of the mosque closest to the palace was rather ordinary. 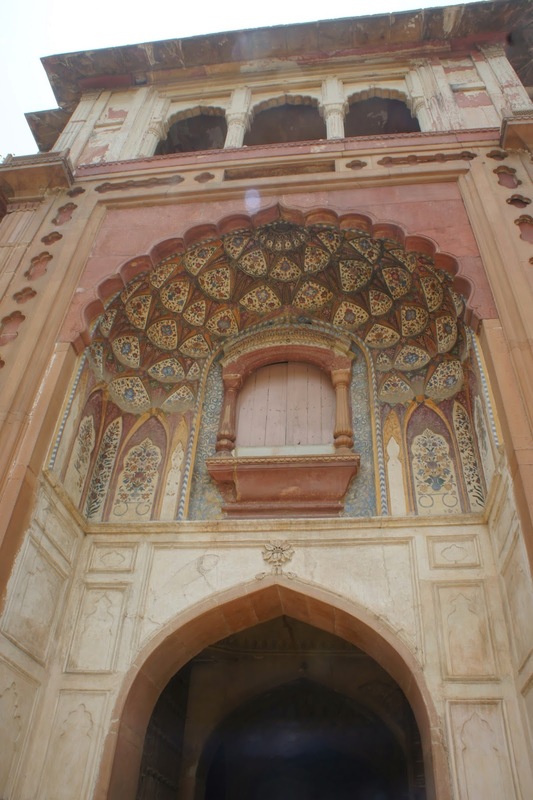 It looked like any other mosque entrance, however the main entrance is the more impressive ones. I walked towards the main entrance to be greeted by some self appointed guides. Thinking they might ask for ridiculous amount of tips after their service, I rejected a few. One of them is rather persistent and started to volunteer information about the top of the stairs where the main entrance stands. 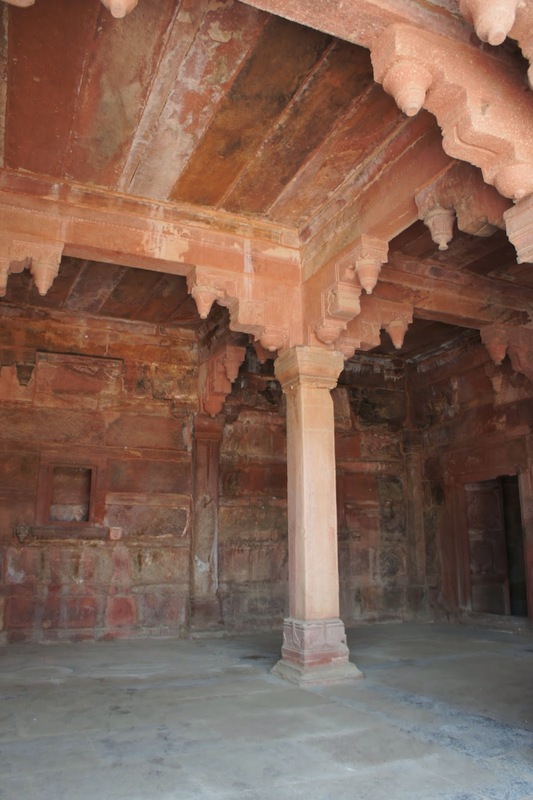 He mentioned that underneath the stairs was actually hollow, supported by pillars beneath. The guide brought me to one of the gaps to prove his point. After that I strongly rejected his service and headed towards the entrance to take pictures. 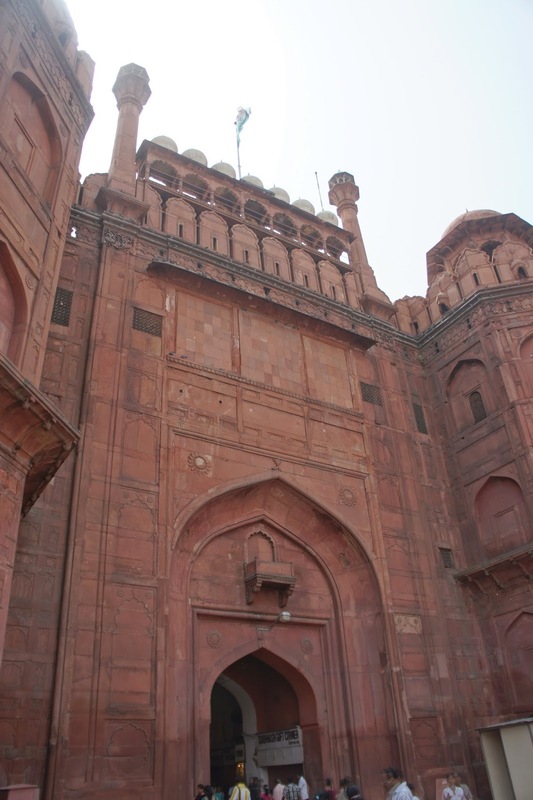 The main entrance was was tall and very eye catching as one rides the bus towards the palace. The 54m tall entrance has 3 main domes on the top most floor. 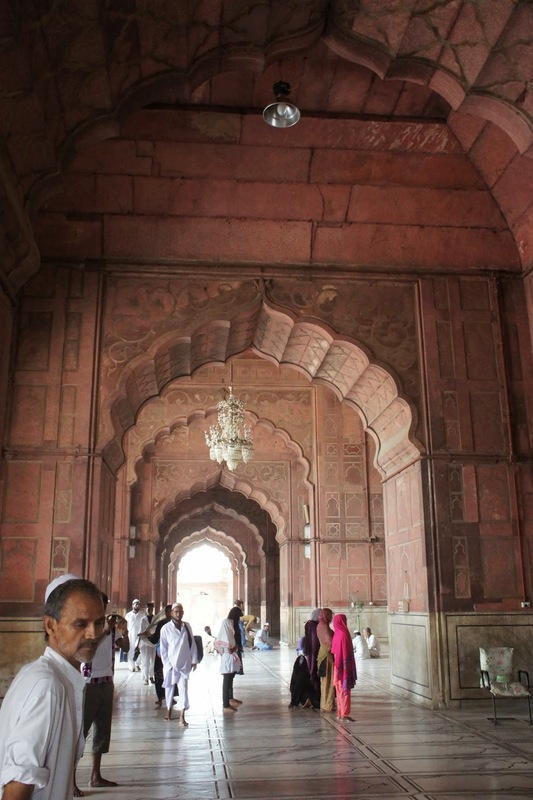 As I was taking pictures of the interior at the entrance, more touts offered to take me inside the mosque. 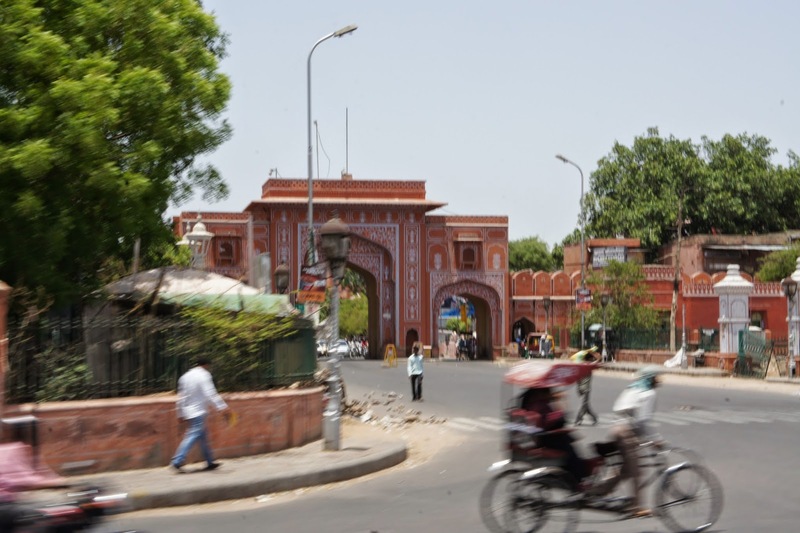 Well I did learn my lesson in Delhi some days ago, I brushed them off and told them I do not want to go inside (to be frank I was rather lazy to take off my shoes and carry them around, plus the hot hot weather is really unbearable). 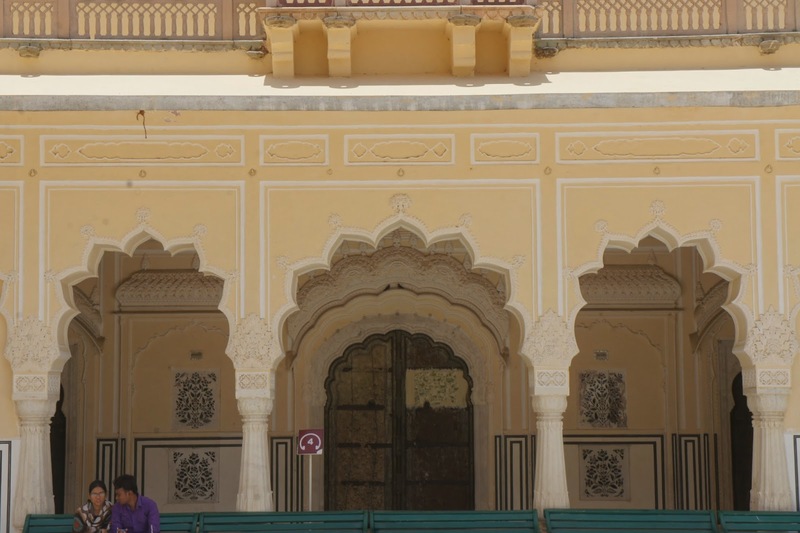 After taking some pictures, I headed back towards the entrance of the palace to wait for the bus, which will take me to the carpark where my auto rickshaw was waiting for me. 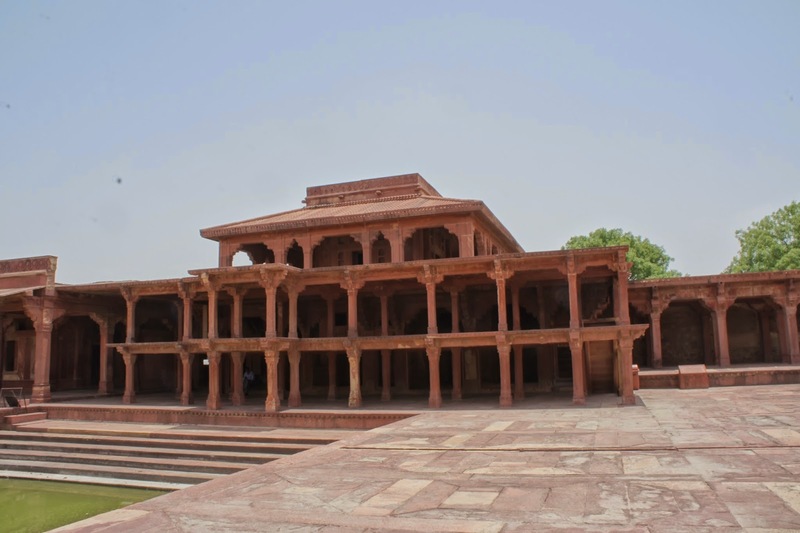 I did not stayed at Fatehpur Sikri for very long (about 1 hr) as the weather is really getting to me, all I want at this point was to get back to hotel and cool off. After meeting up with the driver, he drove me back to the hotel, where I rested for another couple of hours. 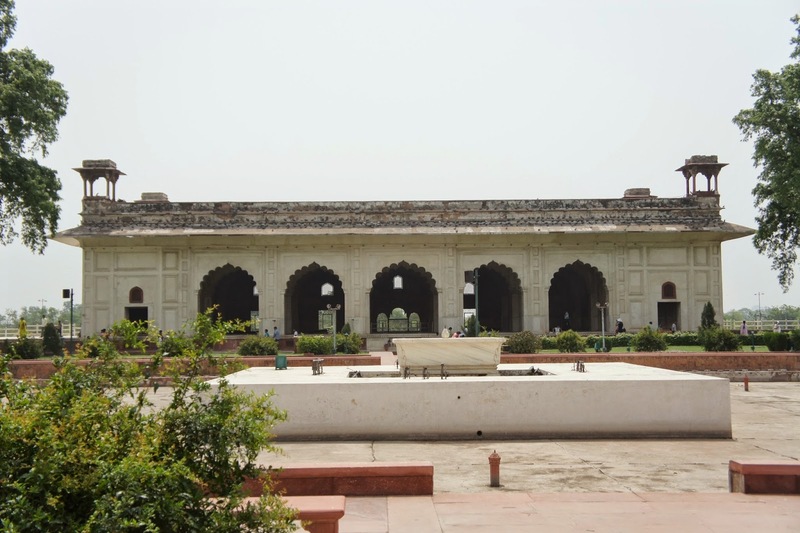 The temperature seemed to cool off after a couples of hours later, I decided to head to Itimad-ud-Daulah, commonly known as the Baby Taj as it was the first Mughal building to be built entirely of white marble. 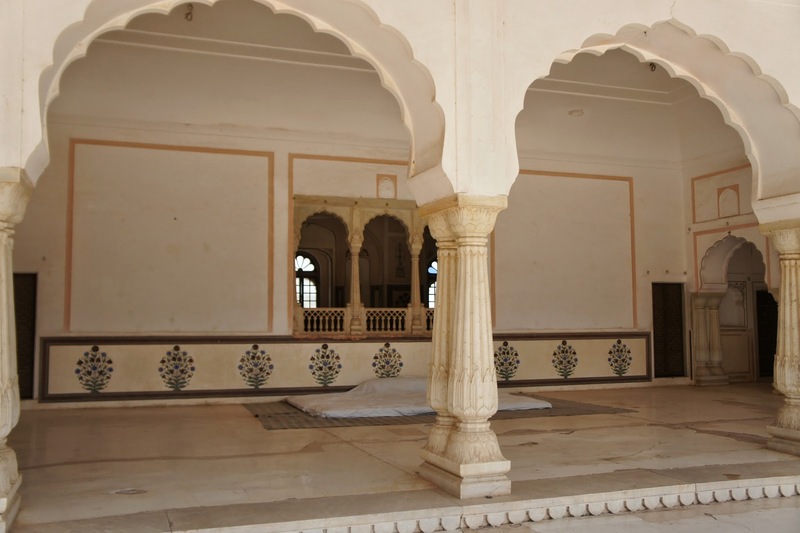 This building is where the father-in-law of the king was buried. 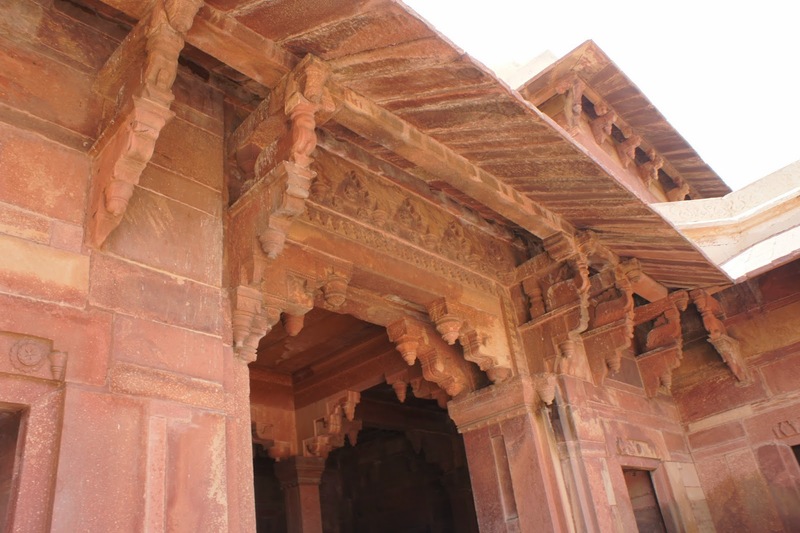 As I entered the grounds, there was a sandstone gate facing the main entrance. 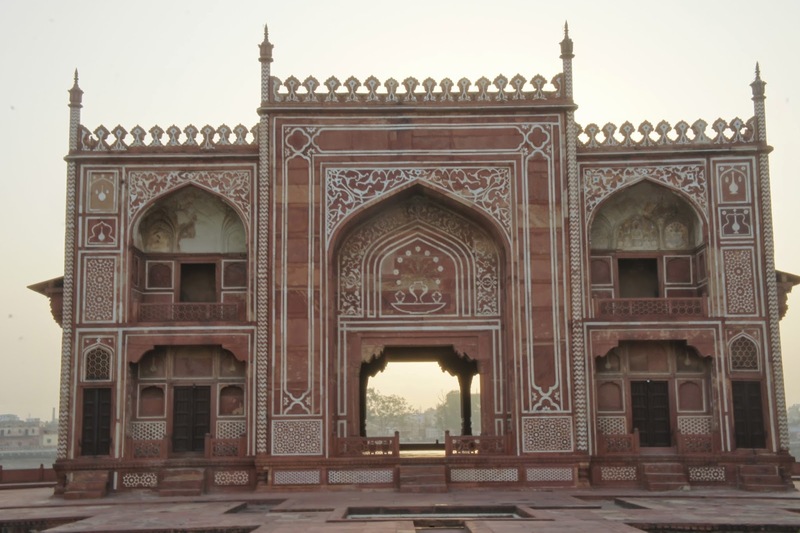 The design of this gate is very similar to the mosque in Fatehpur Sikri, except that it does not have the 3 domes on it, and its height was not as tall. 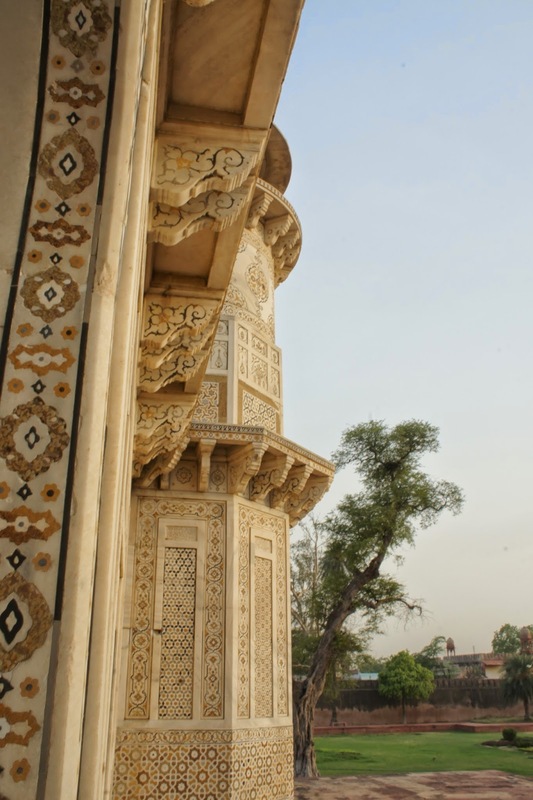 Still this is an exquisitely designed gate with flowers painted in white carved on its walls. 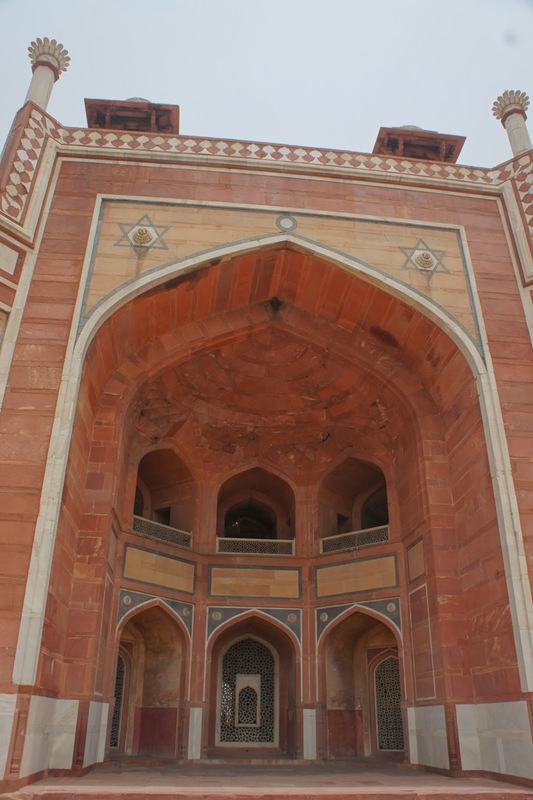 Right through this gate was the Baby Taj, sitting on top of 1m tall platform. 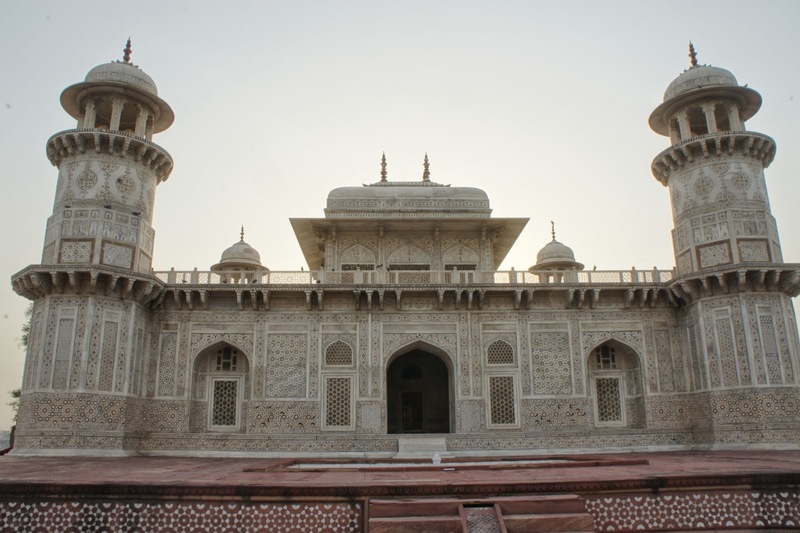 As with Taj Mahal, this white marble mausoleum has 4 minarets at the end of each side of the building. 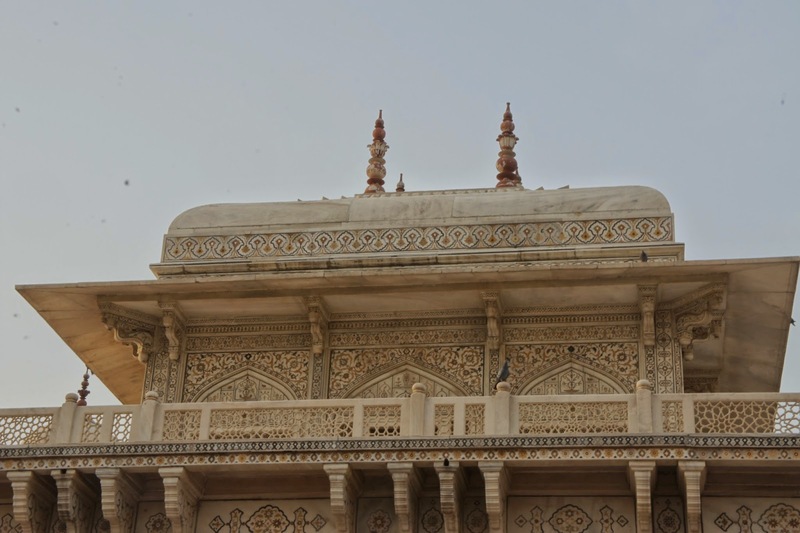 There is a rectangular structure on the top of the building. 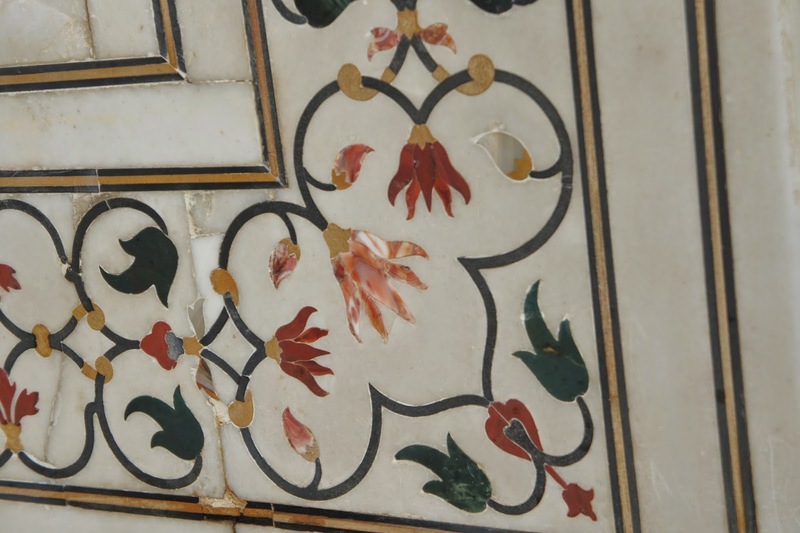 The walls of the baby Taj is colourfully painted with flowers, showing its heavy Muslim influence. As I was walking up the platform, a staff member told me that I have to take off my shoes and leave it with him. He claimed to be safe, not suspecting anything I followed his instructions. 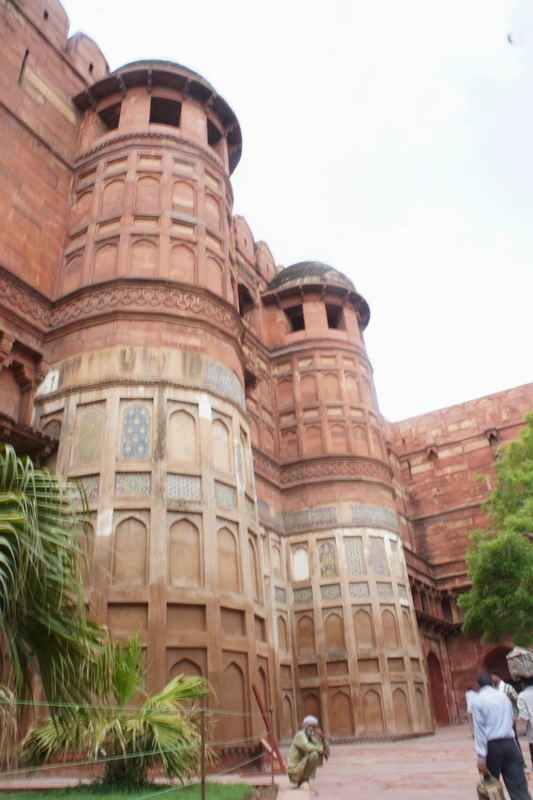 I then proceeded nearer to the Baby Taj, which is also very colourfully decorated with flowers and trees. 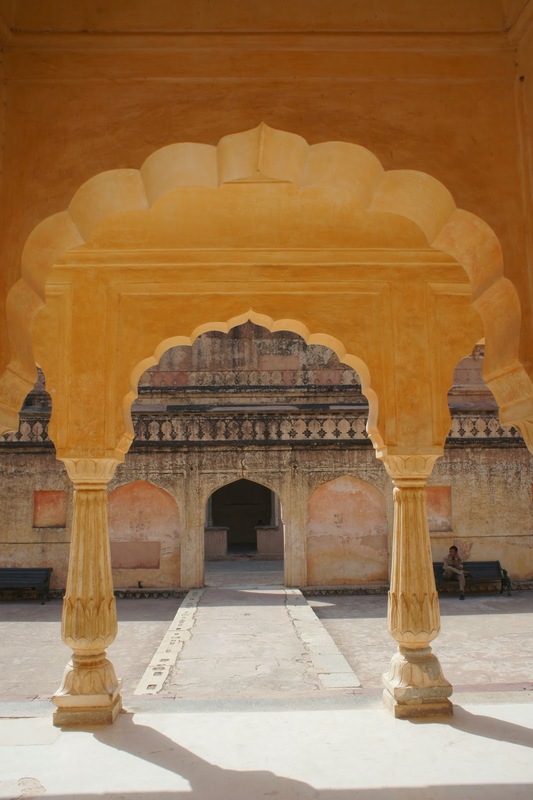 As it was around sunset, the golden sun ray reflecting onto the walls of the Baby Taj, painting it with golden yellow. Simply beautiful. 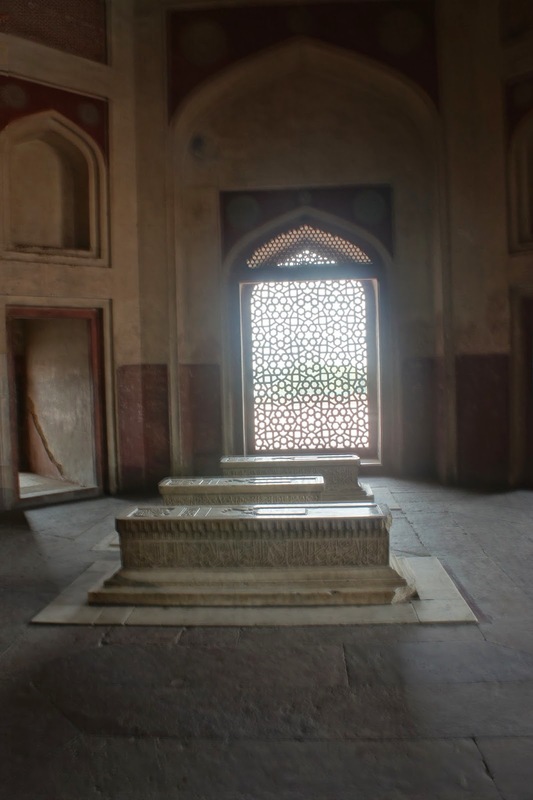 I headed inside, where a solo tomb rests the father-in-law of the king. 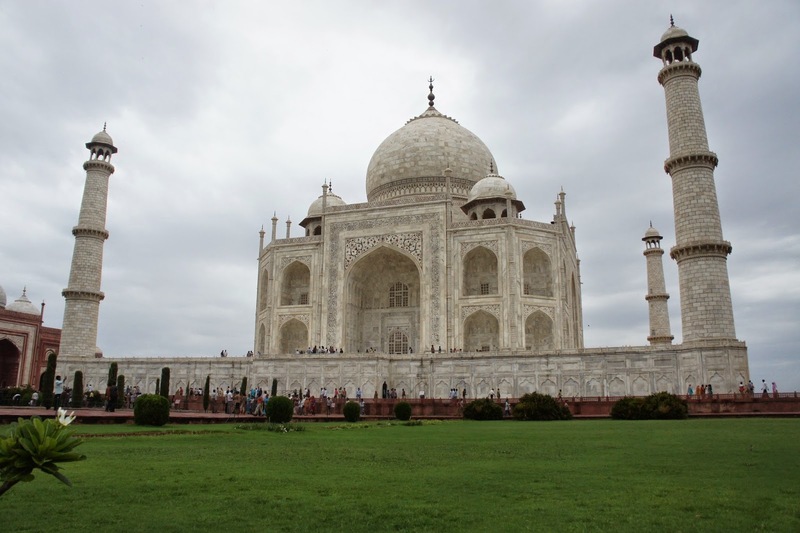 At this point I thought to myself, Taj Mahal would be something like this, except that it is much much bigger. As I went to claim my shoes, the staff member is still there and as I was putting on my shoes, he pointed to some money he has on his hand. At this time, I knew he was asking for a tip, and I firmly told him that I did not ask for his service, since he volunteered I am not going to pay him. Seeing that I was very firm, the staff gave me a puzzled looked and I walked off. 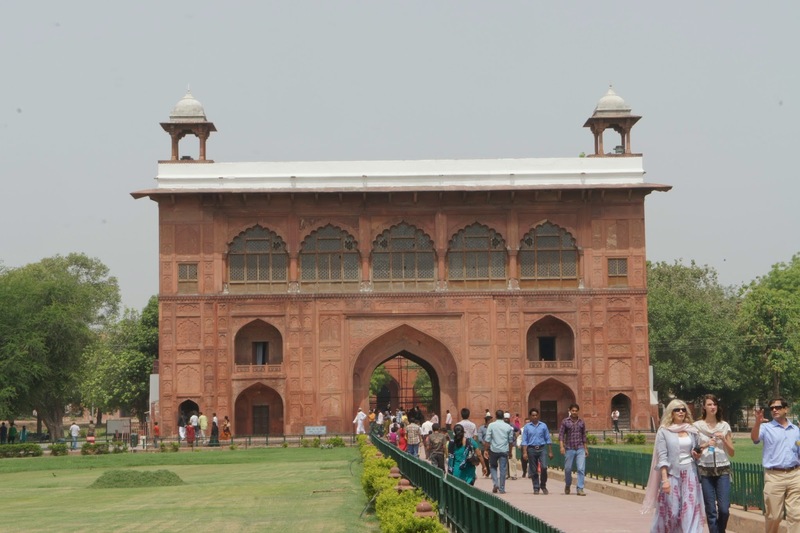 As I was walking towards the bank of the river (Baby Taj was built on the bank of Yamuna River), there was a gate overlooking the river, similar to the one guarding the entrance of Baby Taj. I walked through the gate, which offers a great view of the river. After taking a few more pictures I quickly left the premises, as I was worried that the staff may gang up with his friends and refuse my exit. I made it out of the premises without any incident and met up with my driver. 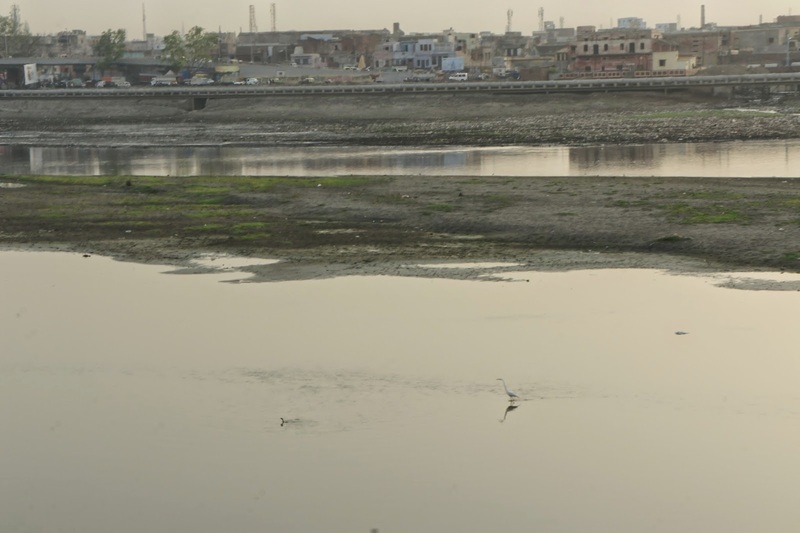 At this point, he suggested to bring me to see the Taj Mahal on this side of Yamuna River. 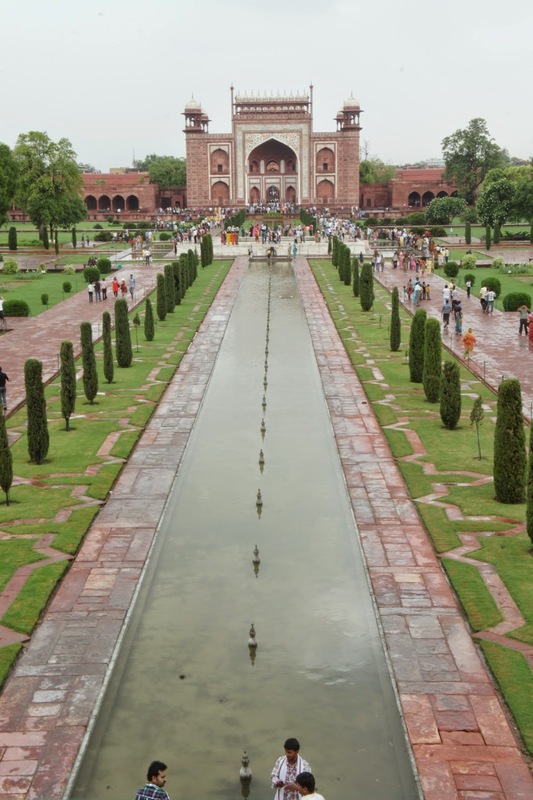 However I told him I wanted to visit another site, which is about 1 km away from Baby Taj. 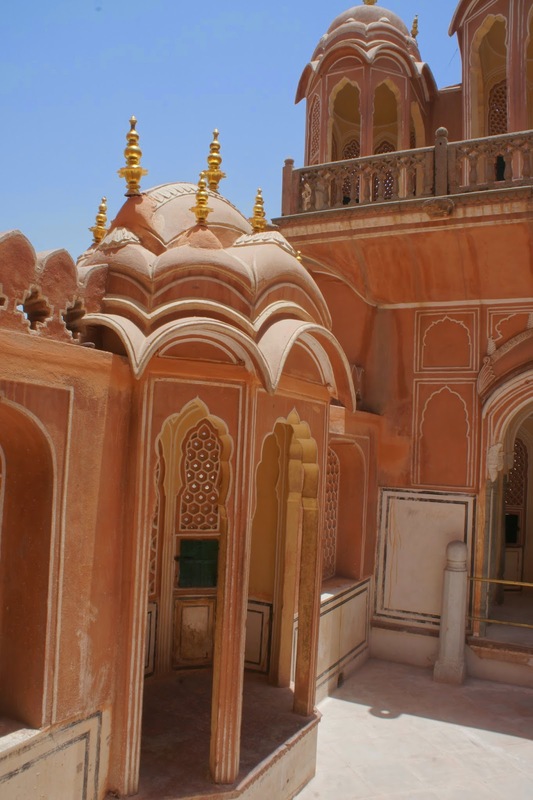 The Chini-ka-Rauza served as the mausoleum of a Shirazi Poet, who was one of the minister of Shah Jahan from Persia (present Iran). 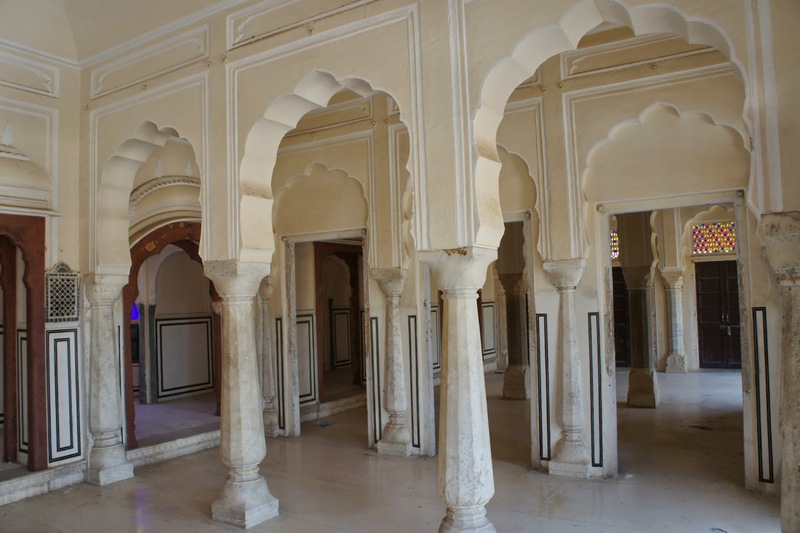 The significance of this building was that it is the only building in the whole of India that has Persian design. 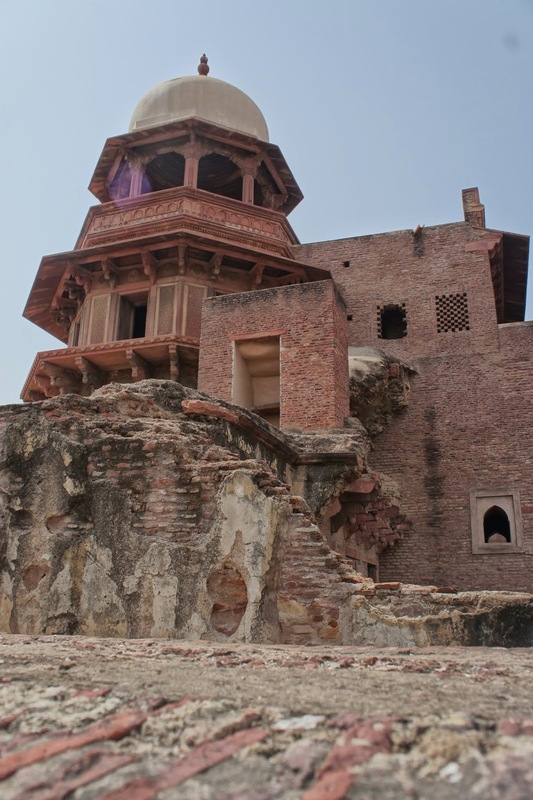 We reached the Chini-ka-Rauza in no time, it was in a really bad shape look as if no restoration was being done to it. 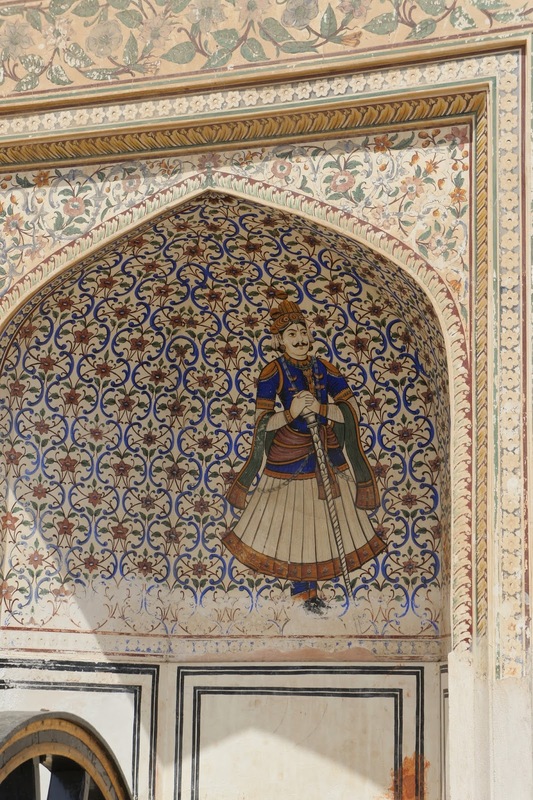 However the bluish Persia pattern was still visible on the wall. 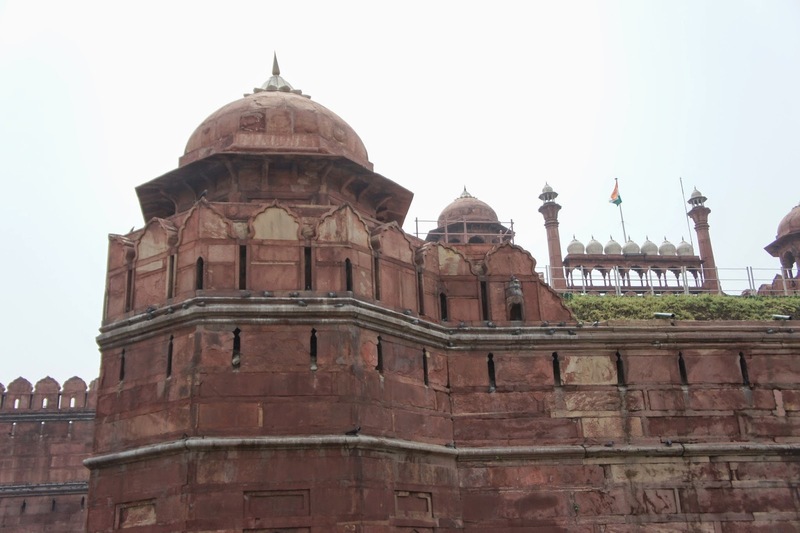 As the building was not accessible, I spent about 3 mins took some pictures before heading towards to see the Taj Mahal. 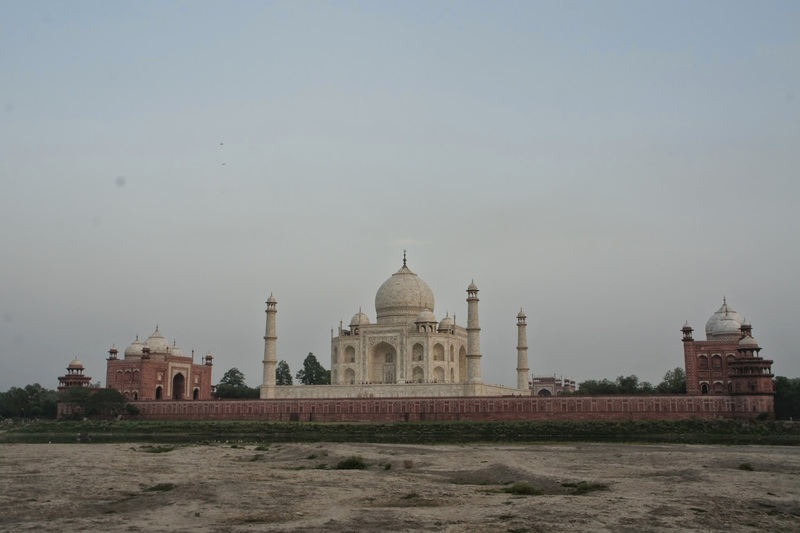 The driver was right, the view of Taj Mahal from this side of the river was indeed beautiful. 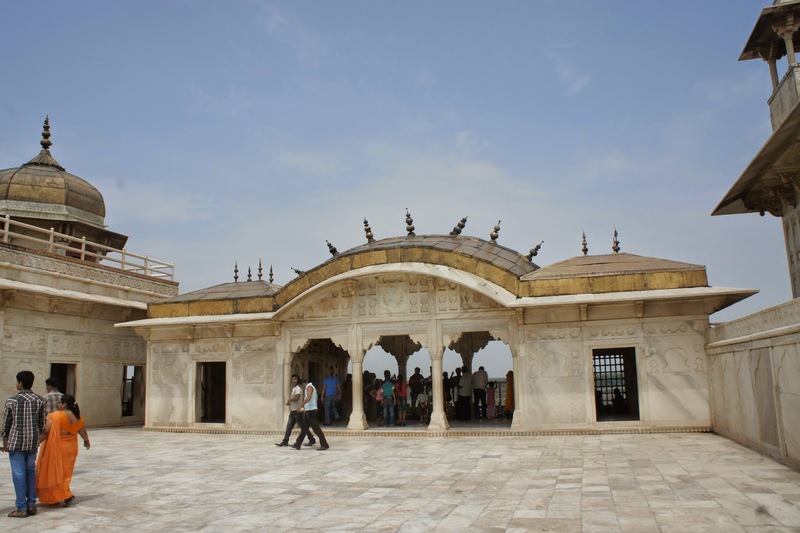 It is a tranquil site, away from hordes and hordes of visitors who visited Taj Mahal each day. 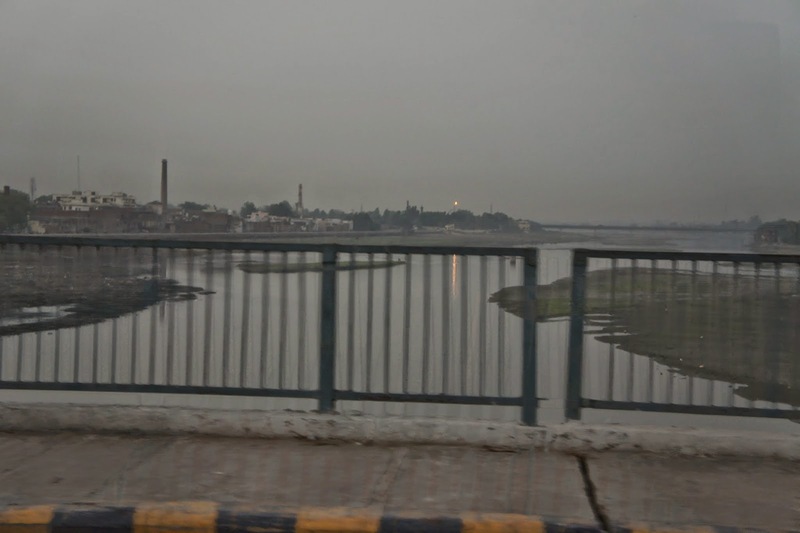 From this side of the river, I can see the whole of Taj Mahal and its 2 side gates. I spent another 2 minutes taking pictures of it before heading for dinner. Had my dinner at a restaurant called “The Park”, as it was strongly recommended by the guidebook. 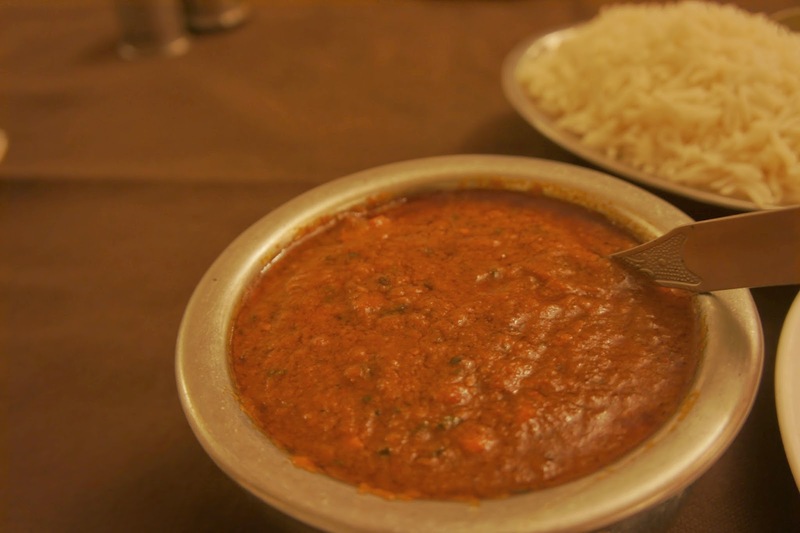 The Indian food was superb, as it was both sweet and spicy. 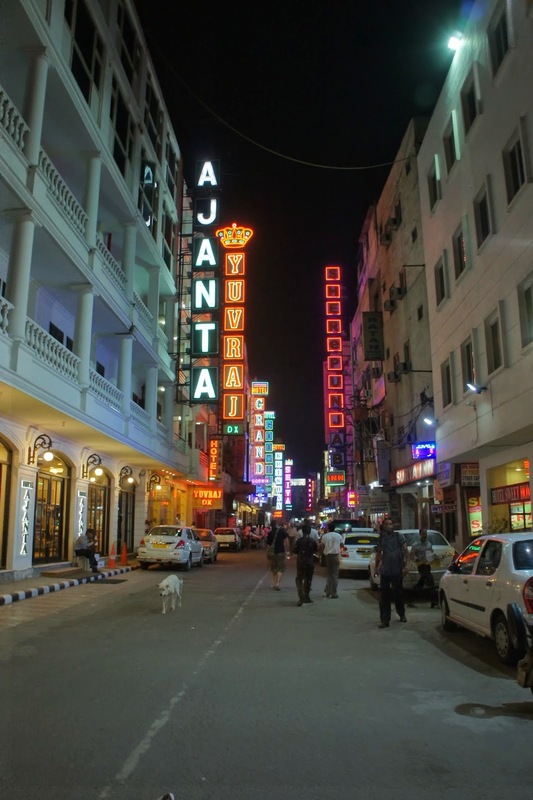 After dinner I headed back to the hotel to rest for the night, getting ready to visit the gem of India the next day. The sky is already brightly lighted at 7 am when I woke up, looking as if it is already noon time. Rather then forcing myself to get back to sleep, I left the hotel at around 8 am after breakfast. 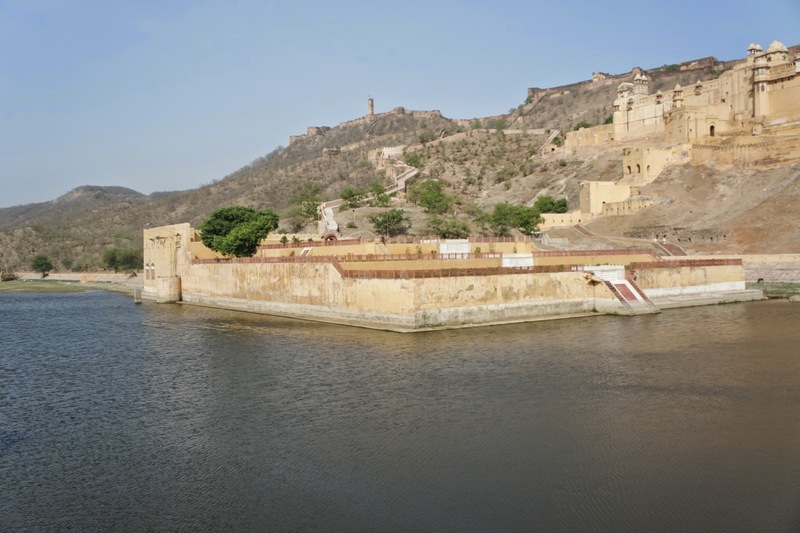 I made my first stop Amber Fort, which lies about 15 km north of Jaipur. As I was exiting the hotel, the very nice doorman asked where I was heading to, I told him my destination and he recommended me to take a public bus. 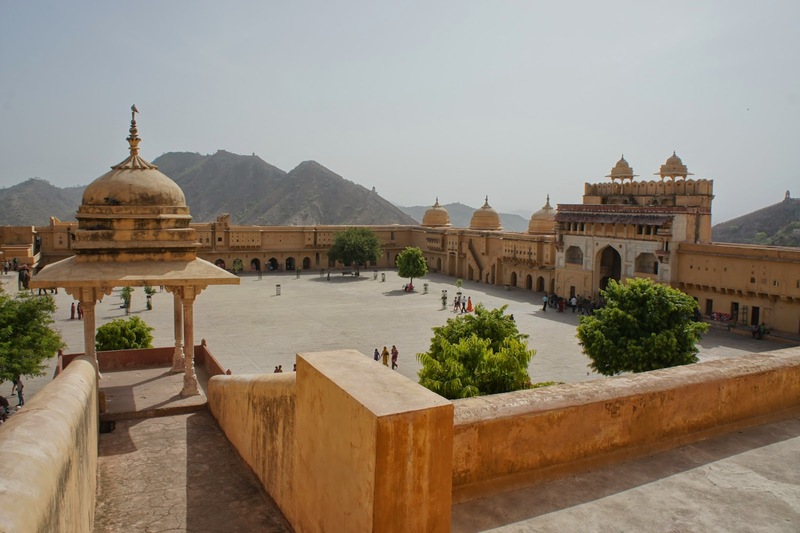 The bus runs from outside the hotel to Amber Fort! He also told me to get the day ticket which costs 30 rupees and I can take the bus the whole day without paying again! He was kind enough to lead me to the road and hail the bus, which the bus stopped in front of the hotel to let me board. The doorman then told the bus driver where I was going and to give me the day ticket, which he promptly did. 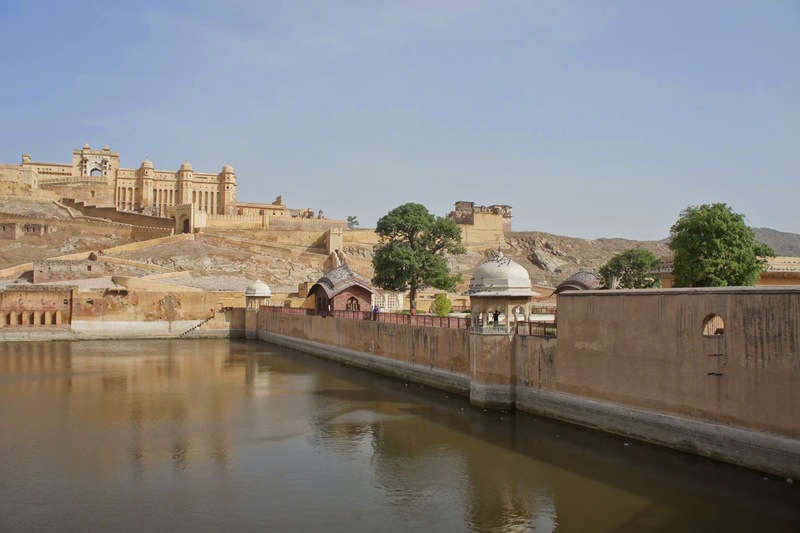 The bus runs through Jaipur City, Jal Mahal and then towards Amber fort. 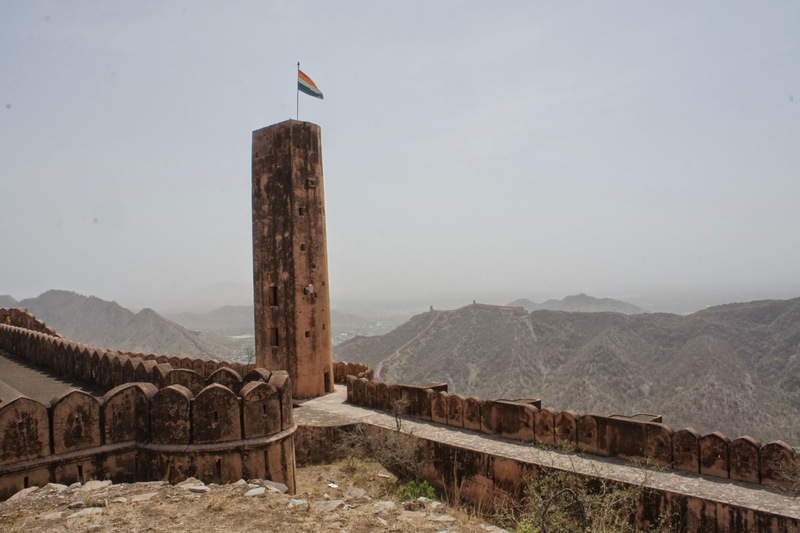 When the bus reached the fort, the conductor and bus driver reminded me that my stop has arrived and there I was standing at the base of the Fort. 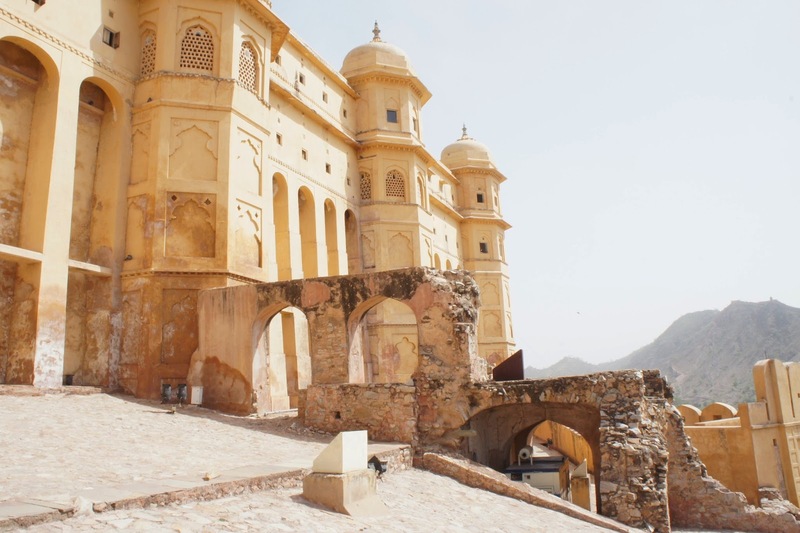 I would have to say the fort does not look that majestic from below, but it certainly looked like a piece of art. 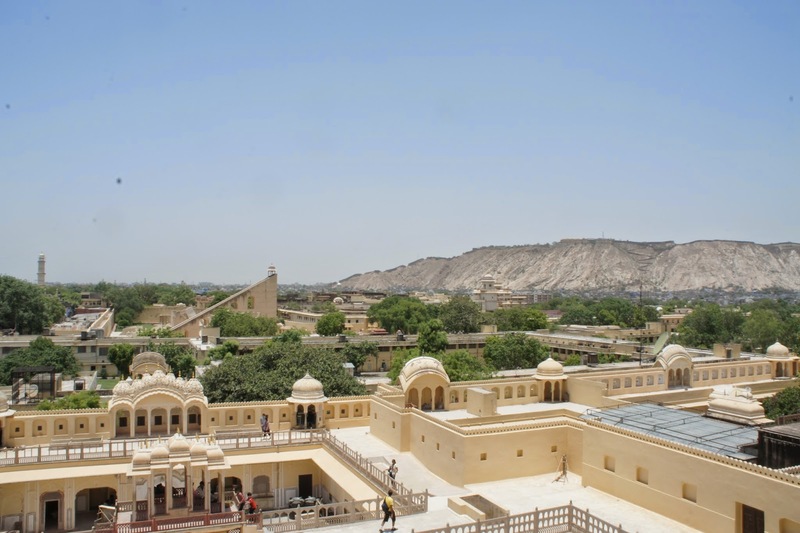 To get to Amber fort, I have to cross a small garden, then climb up a flight of stairs. 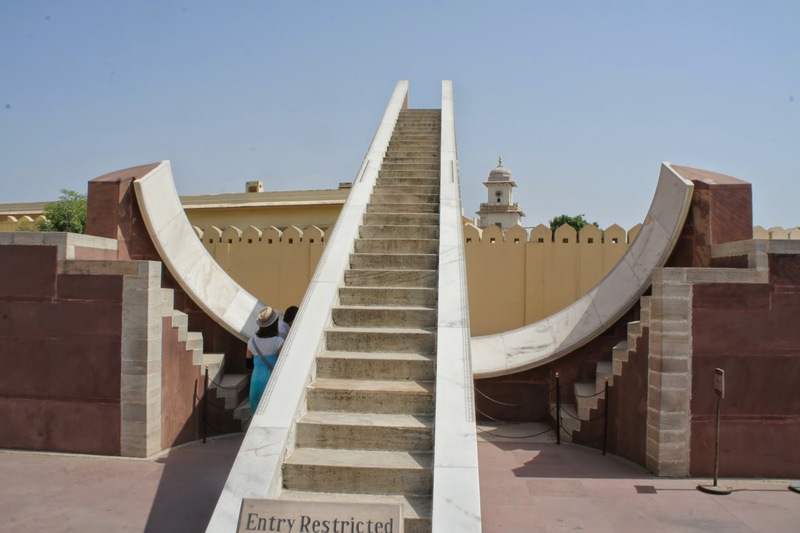 There is a ramp for people who opted for the elephant ride up the fort. The walk up did not take too long, I stopped by a few times to take pictures of the fort and its surroundings. 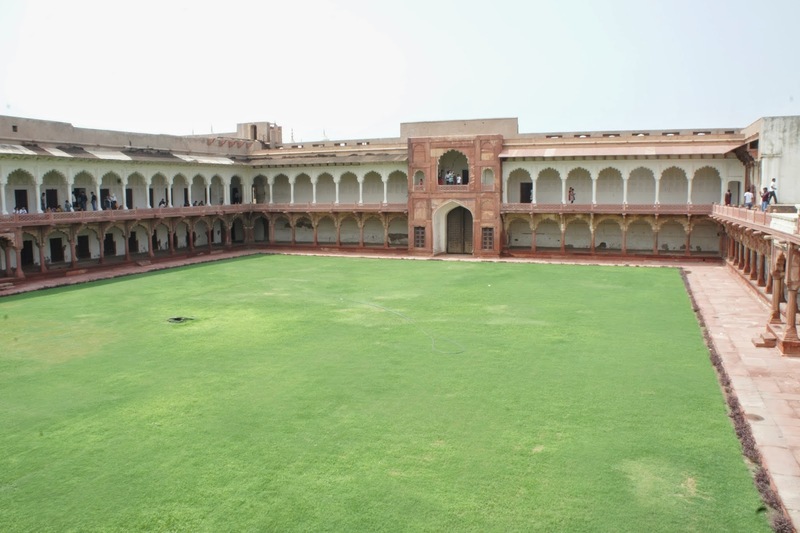 Once I reach the fort, entered its door, there was a huge courtyard. 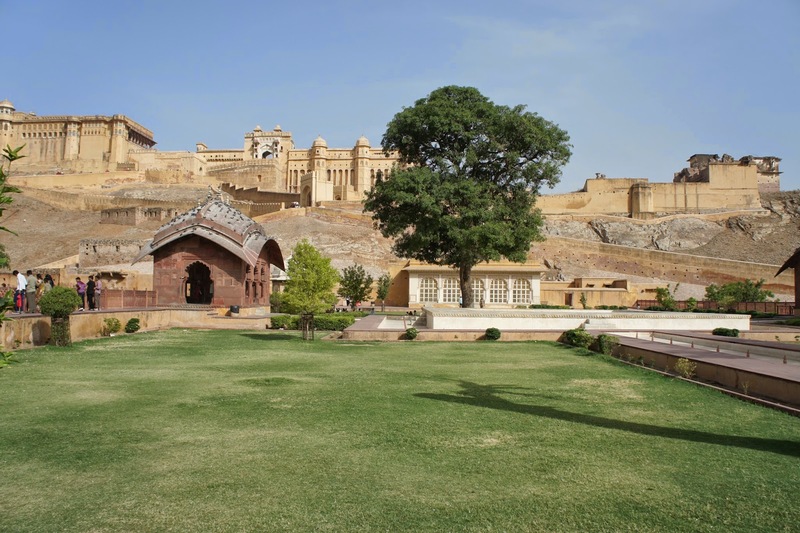 There are a total of 4 courtyards within Amber fort. 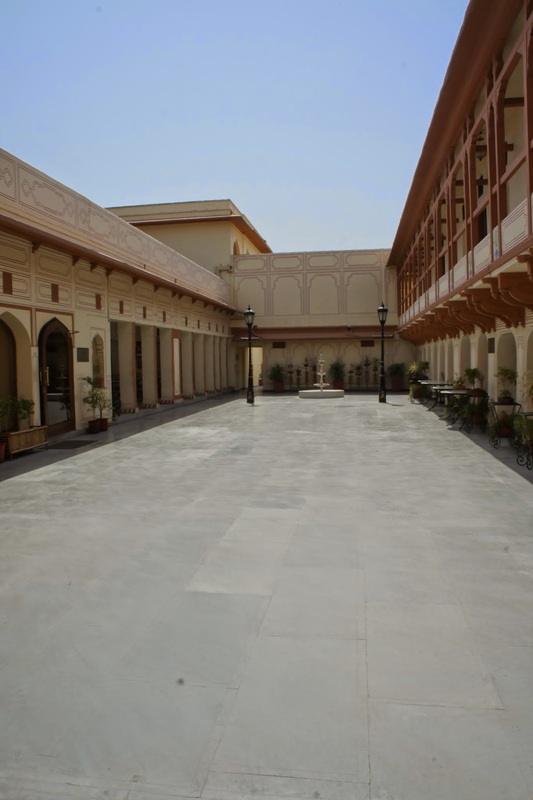 This is first of the 4 courtyards. 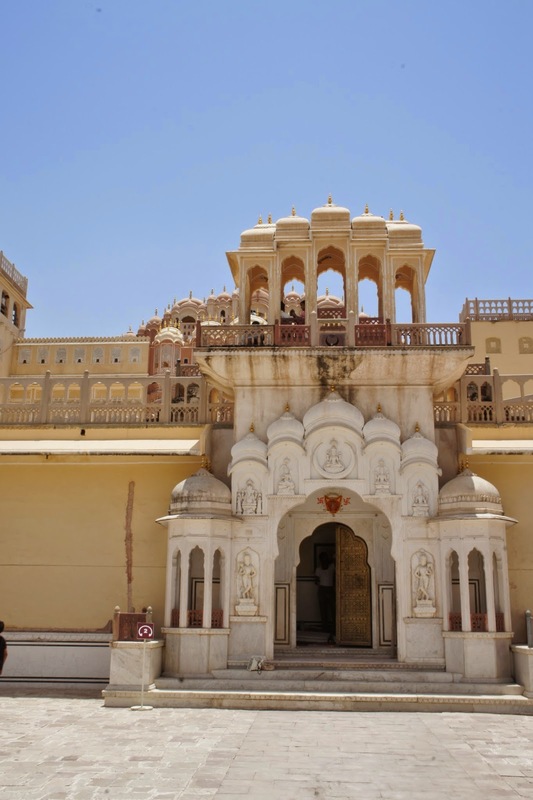 After getting the tickets to the fort, instead of going into the fort, I saw an entrance to a temple. 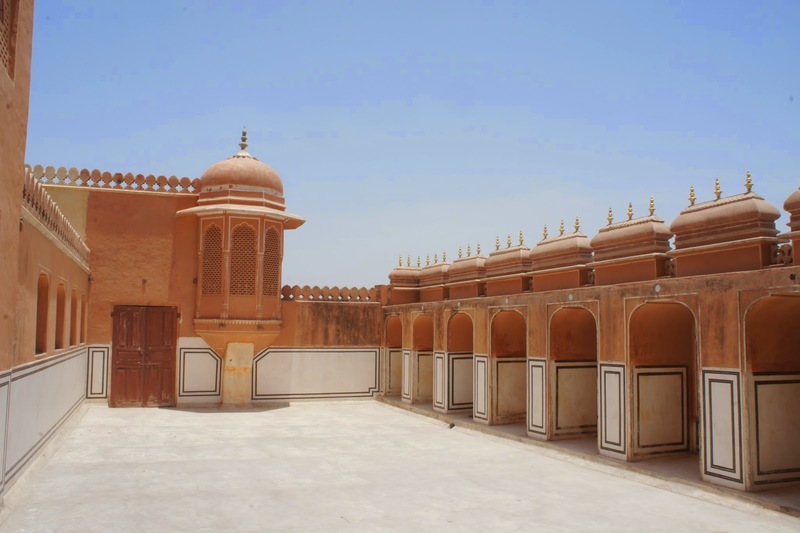 Headed towards that way, however no photography allowed so I headed back to the courtyard and went into the fort. 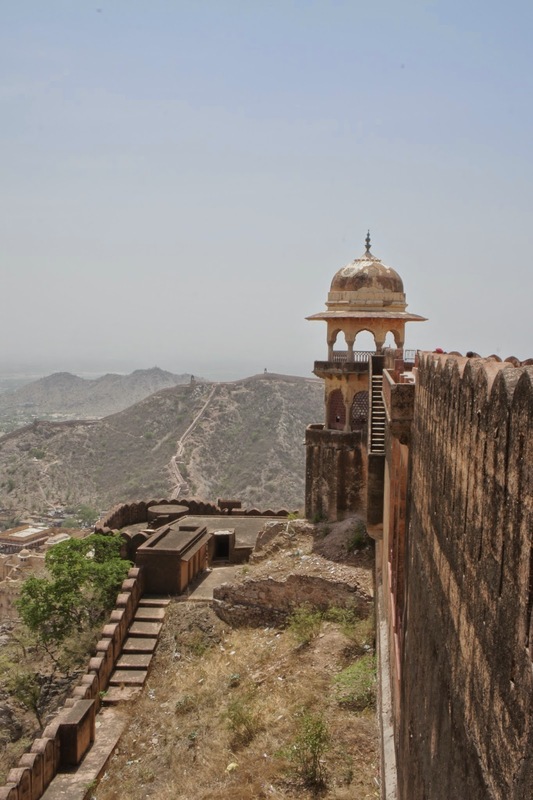 To get into the fort, there is a short set of stairs to climb. 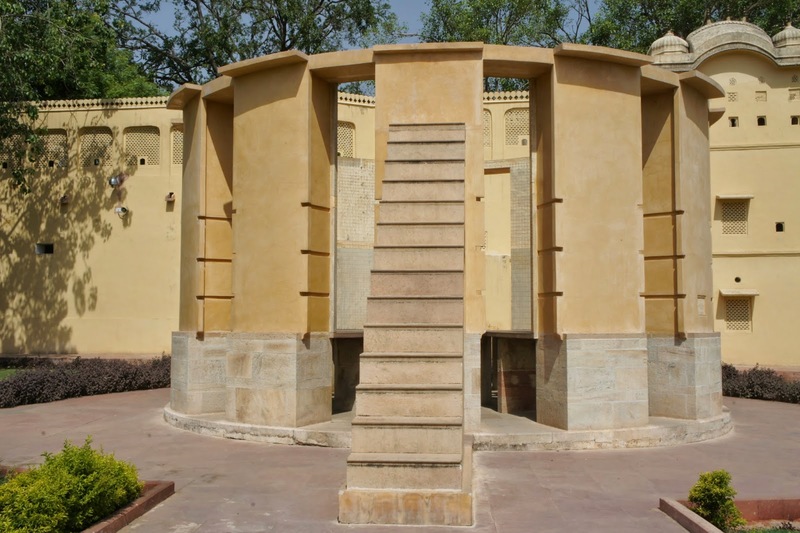 At the top of the stairs is the second courtyard, with a pillared structure at one corner of the yard. 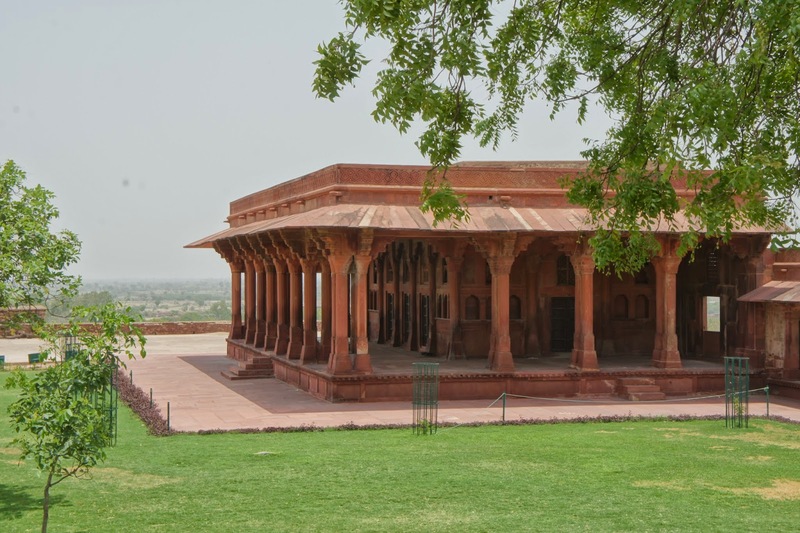 This is the Diwan-i-Am or the Public Audience Hall where the emperors grant audience with his officials. As there were groups of tourists with their tour guide explaining the purpose of this structure, I went to one inconspicuous corner of the yard. 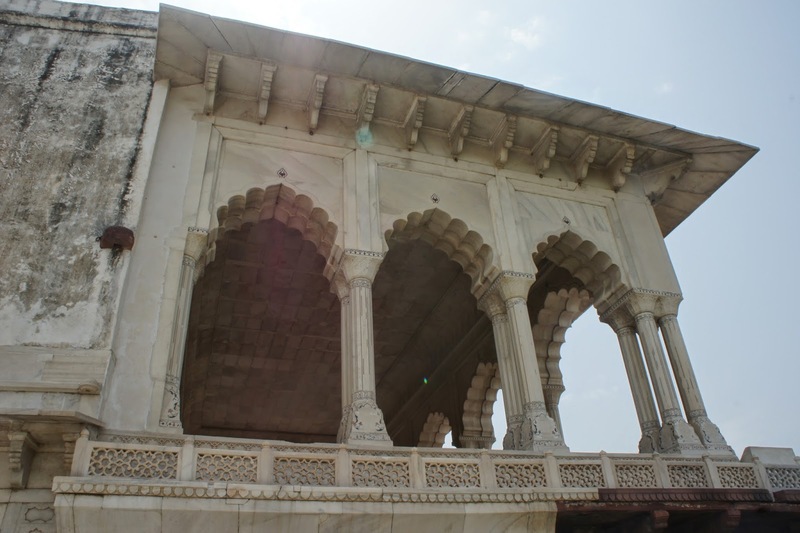 There was a small balcony that overlooks the base of the fort. However the railings was really short, makes me wonder if people back then were rather short. 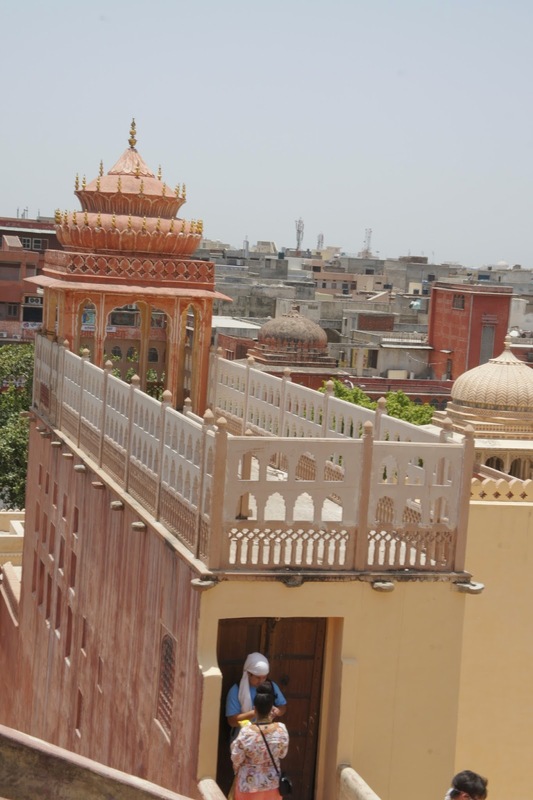 Passing through a door looking structure, climbed a short flight of stairs to the roof of the Diwan-i-Am. 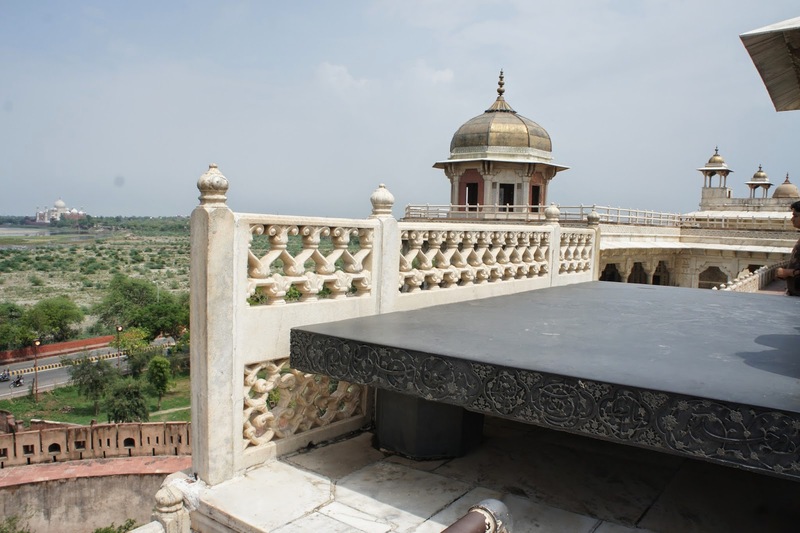 There is a platform on this rooftop that overlooks the front courtyard and part of the town, as well as the garden at the base of the fort. 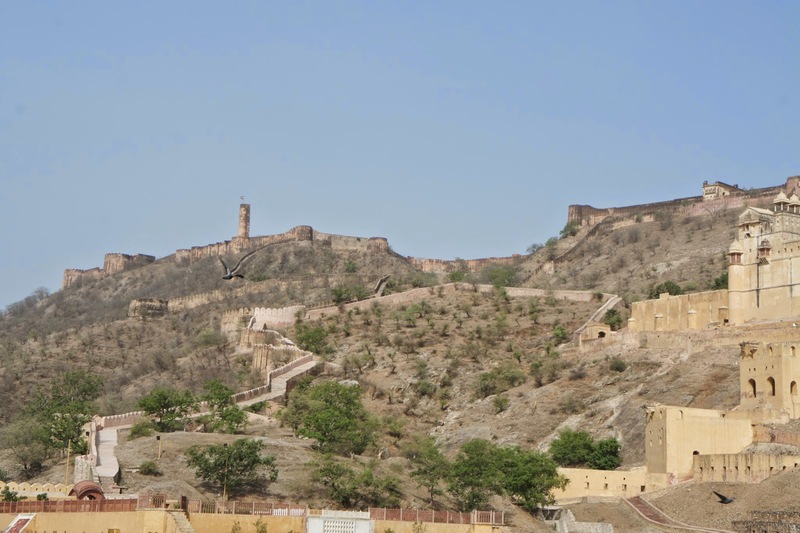 I could see Jaigarh Fort standing mightily on top of the hills behind Amber Fort. 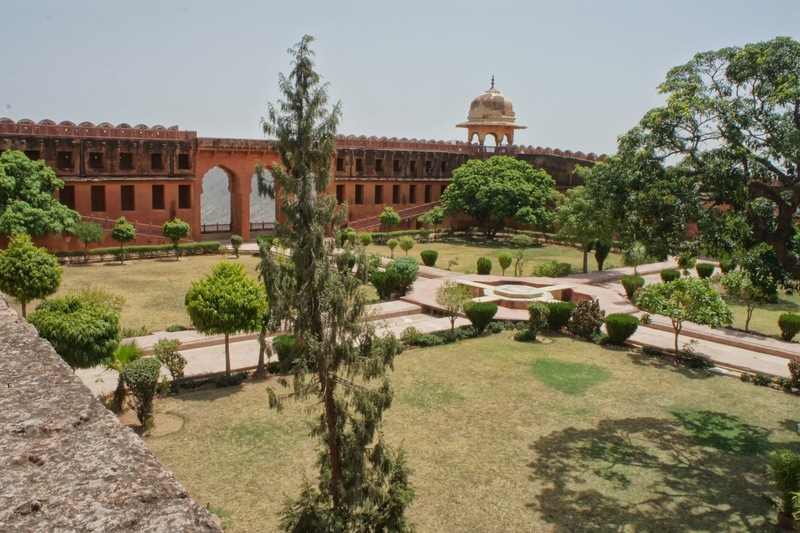 As I walk along this roof area, I can see a small garden further inside the fort and there was another building which overlooked this garden. 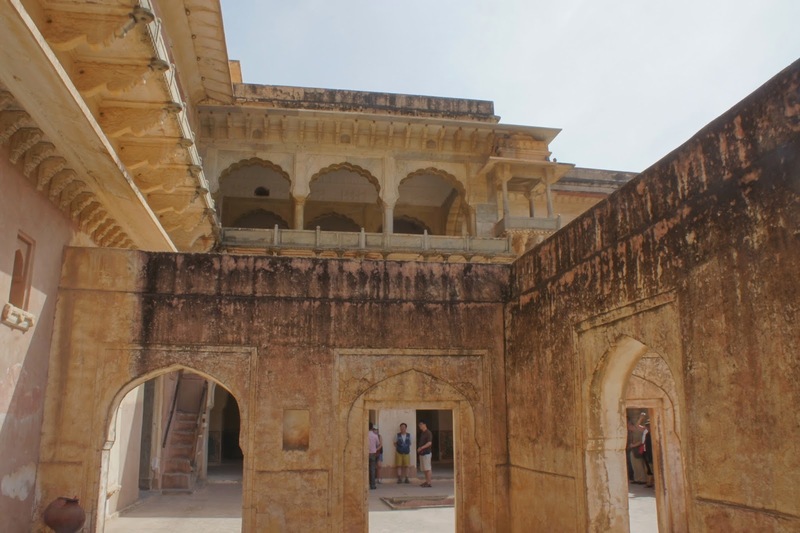 This must be the third courtyard in Amber fort. Looks like a place for the royalties to relax and spend their time. 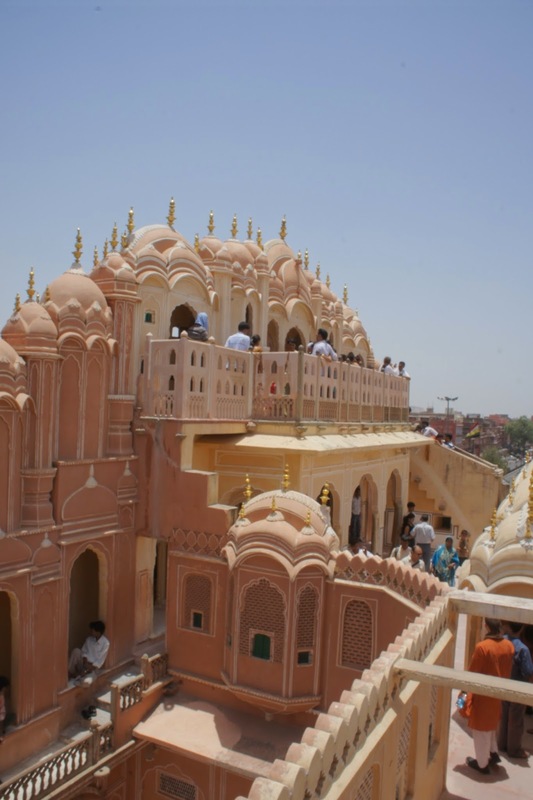 I turned around (literally) and headed towards the rooms on the Ganesh Pol. 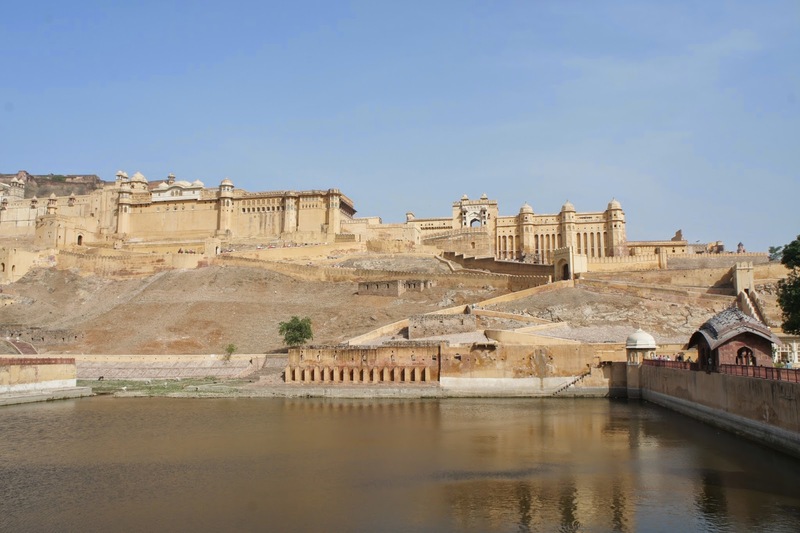 From here I can look down onto the second courtyard in Amber fort, where Diwan-i-Am stands. 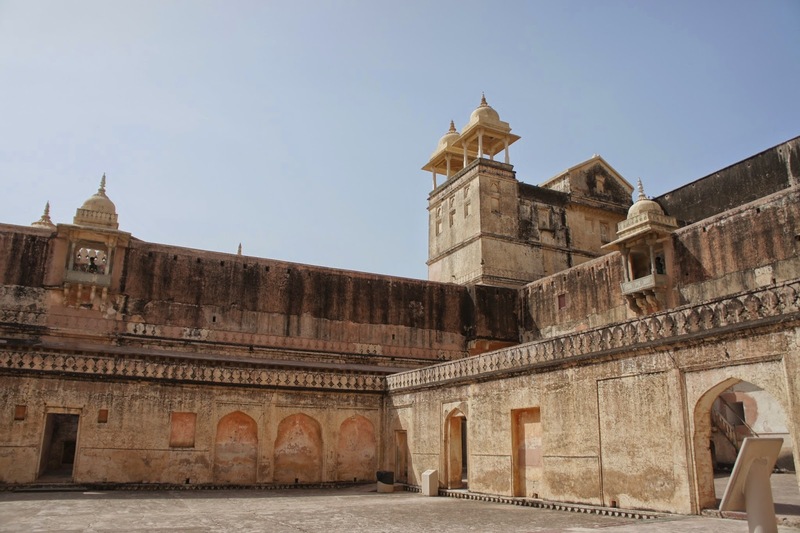 What I like about this fort is there is no touts or volunteered guide that expect you to tip them, so I have all the time in the world to explore the numerous rooms and the corridors that linked these rooms. 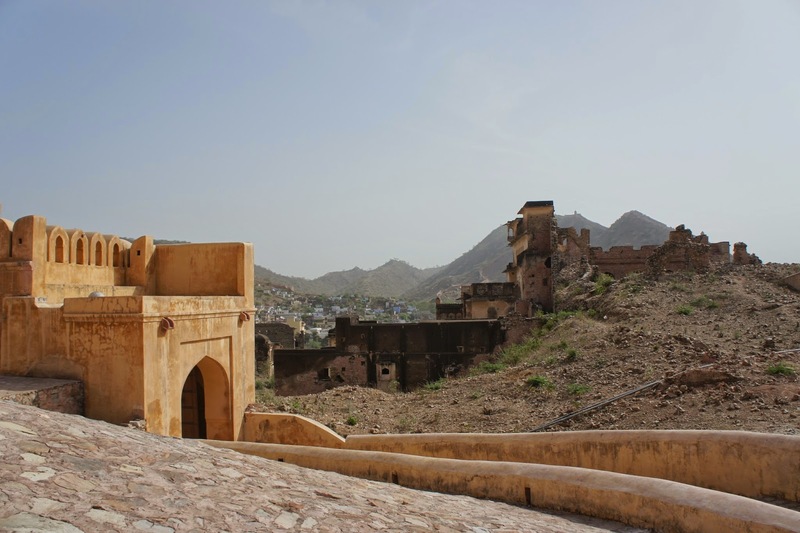 As I was exploring around the fort (all i know was i kept climbing up stairs after stairs), I soon realised I was at the innermost end of the fort. 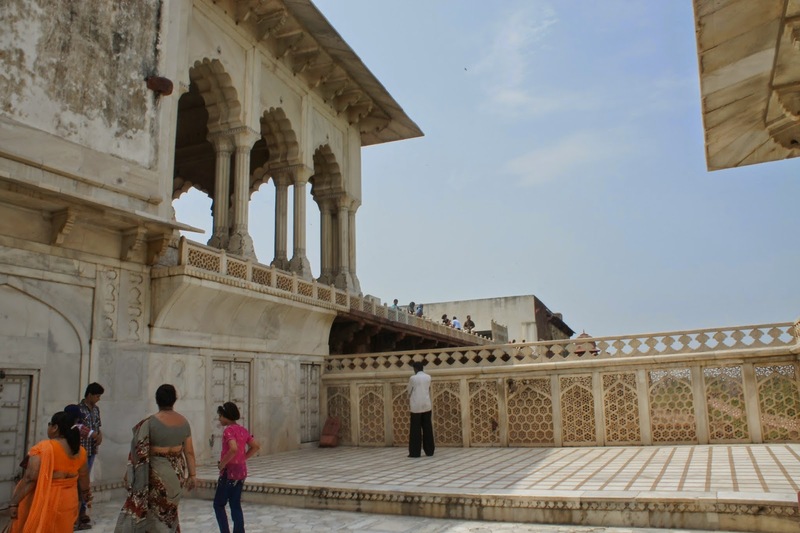 There was 2 small balconies that overlooked the innermost (fourth) courtyard. 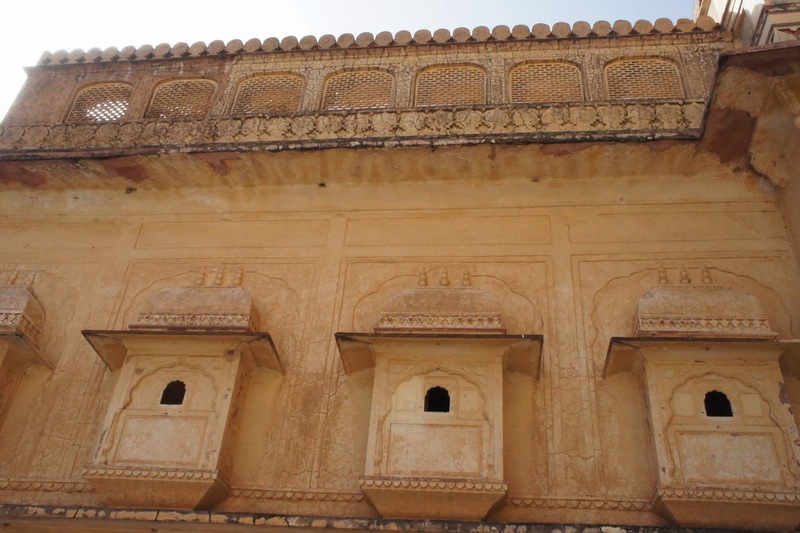 Behind these balconies seemed to be rooms for servants as they are pretty small and out of sight. I descended some stairs and made my way to the innermost courtyard. 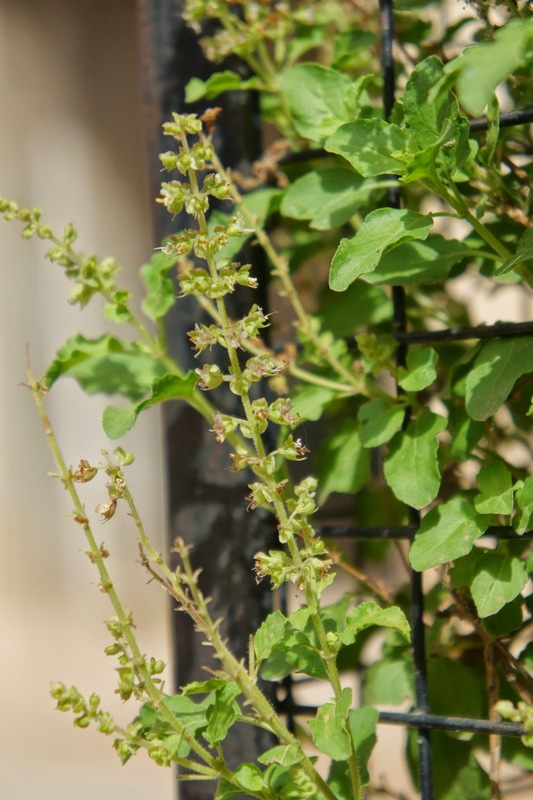 Along the way I came across this basil plant, beside it was a tablet that explained this is one of 2 plants in India. As I was about to leave, there was a guide explaining to 2 Europeans that the Indians believed that touching the plant on Sunday brings bad luck! Damn I just touched it awhile ago. I went to the centre of the fourth courtyard and there was another guide explaining to a group of Taiwanese tourists the purpose of the courtyard. 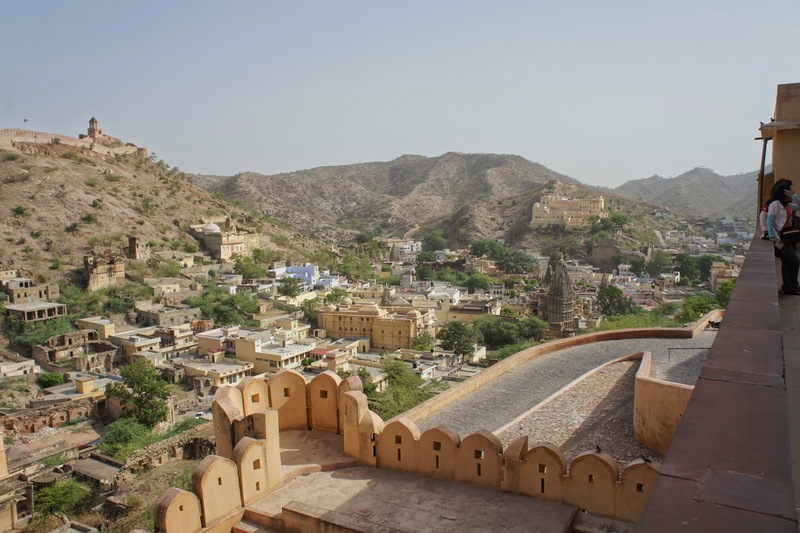 He mentioned that this portion of the fort was the sleeping quarters of the wives and mistresses of the emperor and their children. 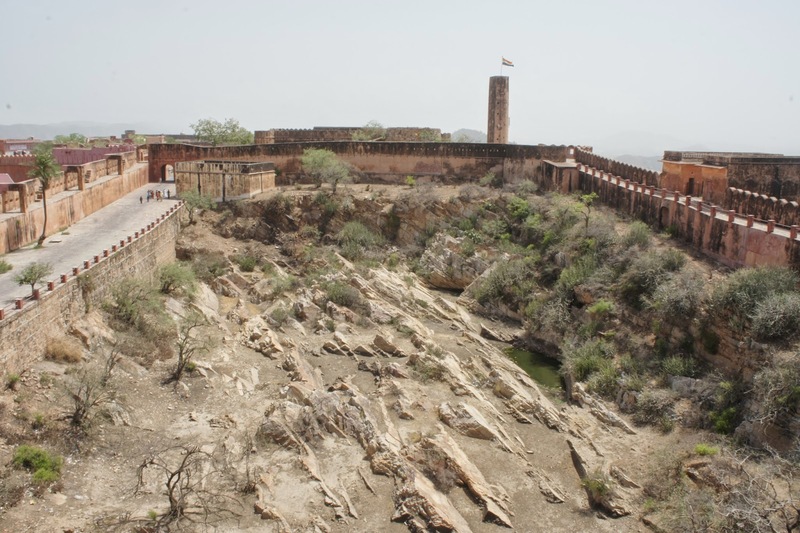 After he was done explaining, we spoke alittle about the fort and Jaigarh fort. 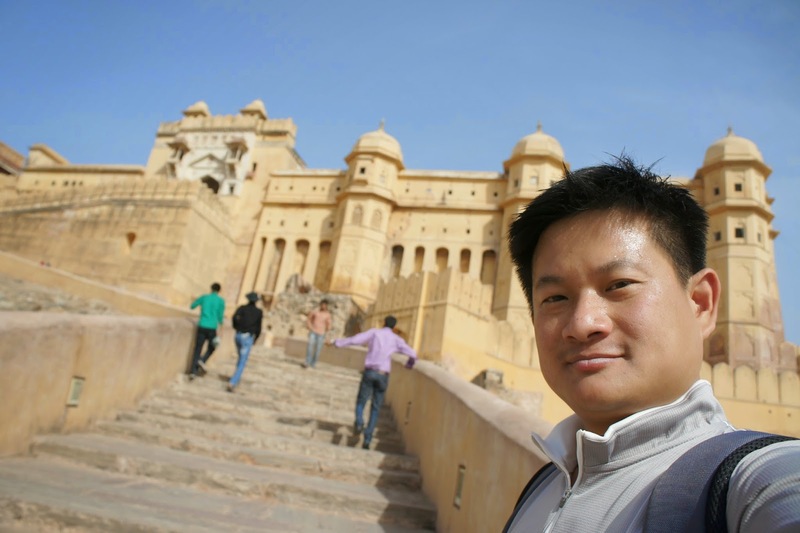 After the chat, I bid them farewell and started to head out of the fort as I thought this was pretty much it about the fort. As I was proceeding out, there was this corner where some music can be audible. There was also a crowd surrounding where the music came from. I went over to check it out and to find that there was a snake charmer playing the music to his pet cobra. 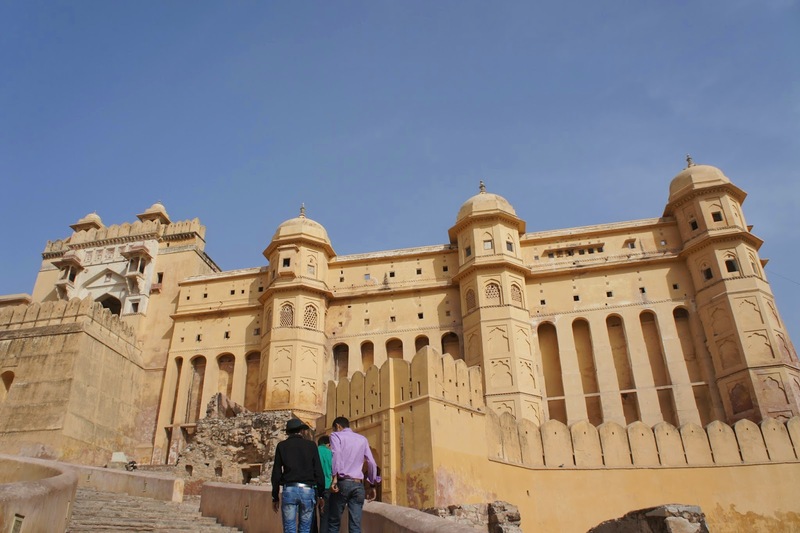 I headed out of Amber fort and hired a auto rickshaw to take me to Jaigarh Fort. 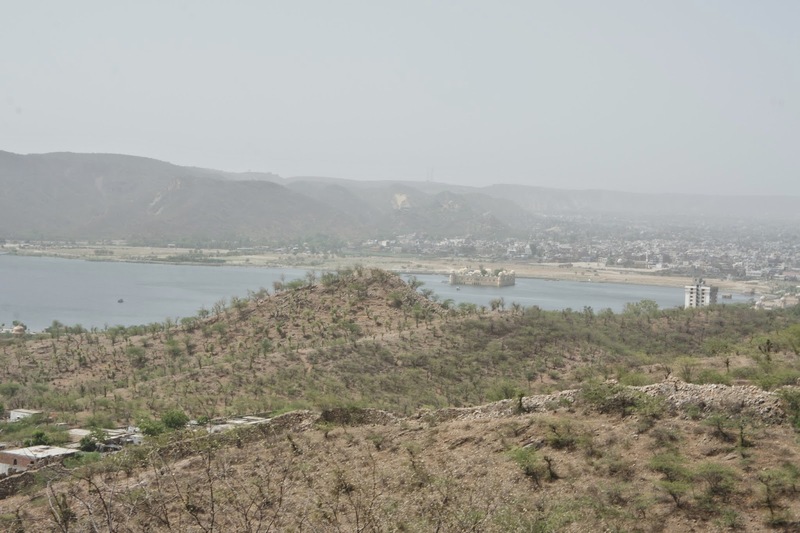 The ride to the Jaigarh Fort was not long, on the way we saw the lake where Jal Mahal is. 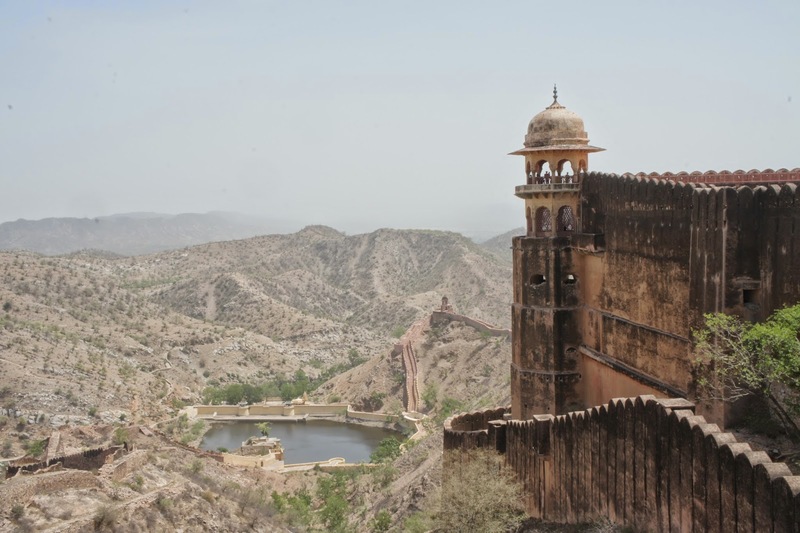 The winding road took us all the way to Jaigarh Fort. 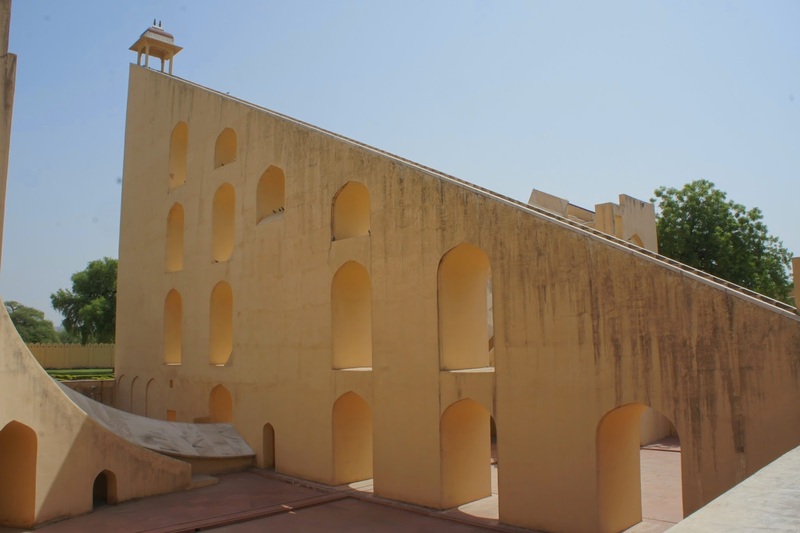 Basically this fort has 2 sections once pass the main entrance. I took the right side as it says “Big Cannon”. 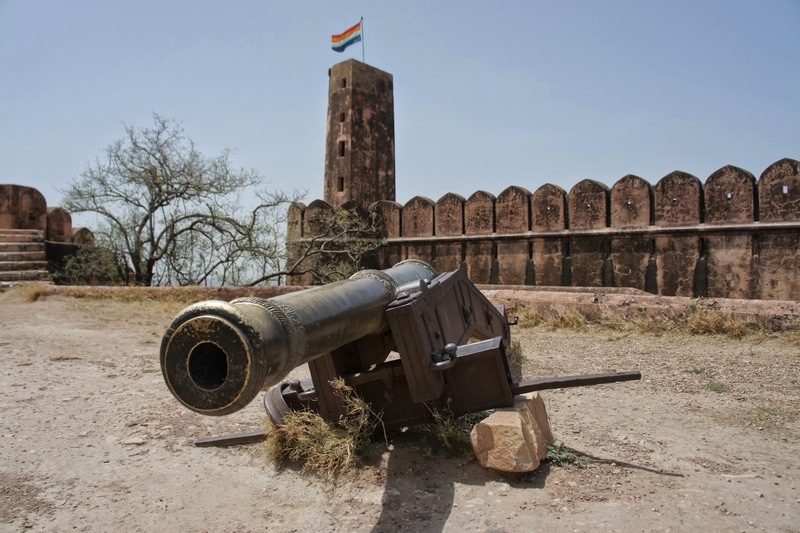 I had read that the world’s largest cannon was situated at this fort. 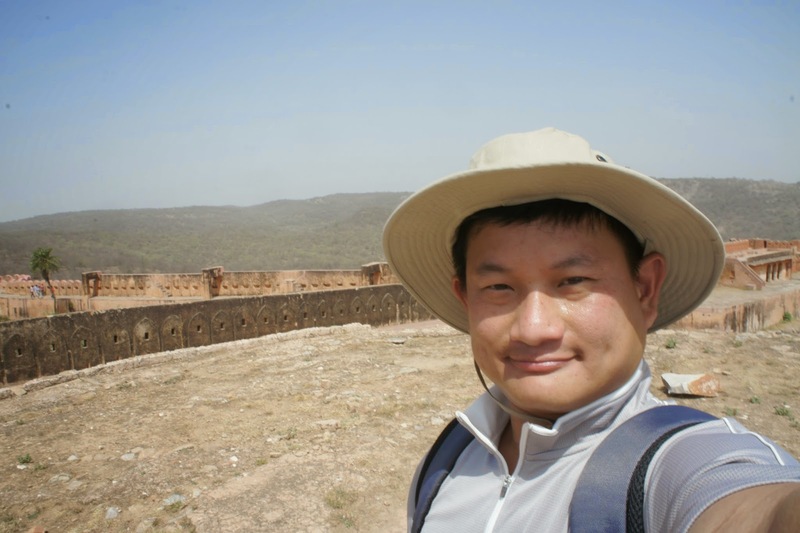 Before heading towards the cannon, I went to the side of the wall that has a watch tower overlooking the grounds below. I then proceeded towards the cannon, on the way there was this huge pit. I was wondering if this pit used to be a gladiator grounds at the time the fort was completed. Soon I found myself at the big cannon. Man it was really huge. 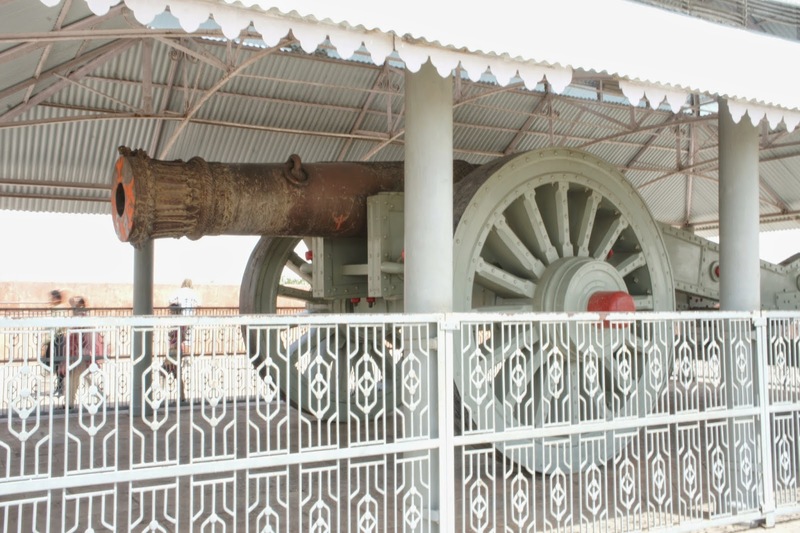 One of the staff asked for my ticket and he volunteered some information about this cannon. 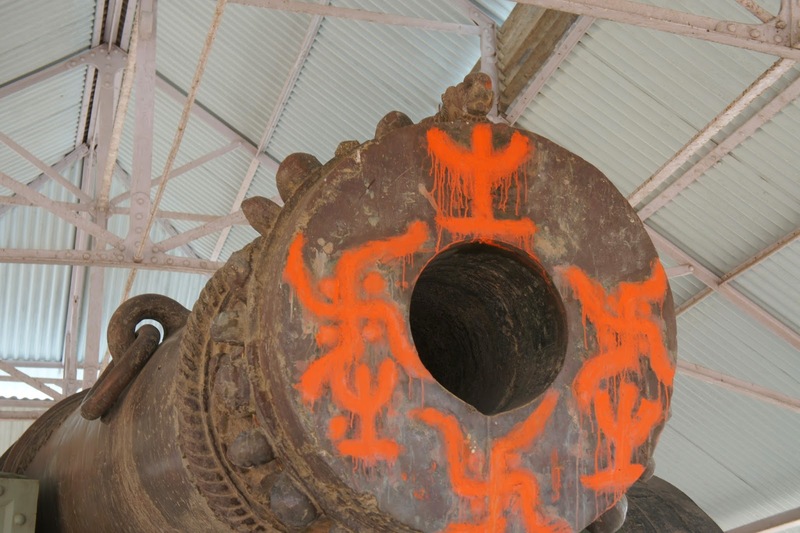 He mentioned that this cannon was brought up part by part using elephants and was assembled up where it is right now. 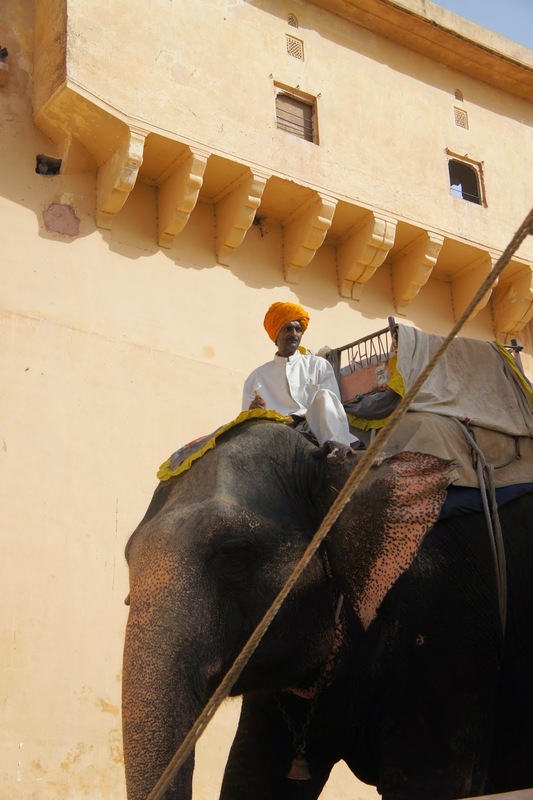 To change the direction of the cannon requires the strength of 4 elephants! 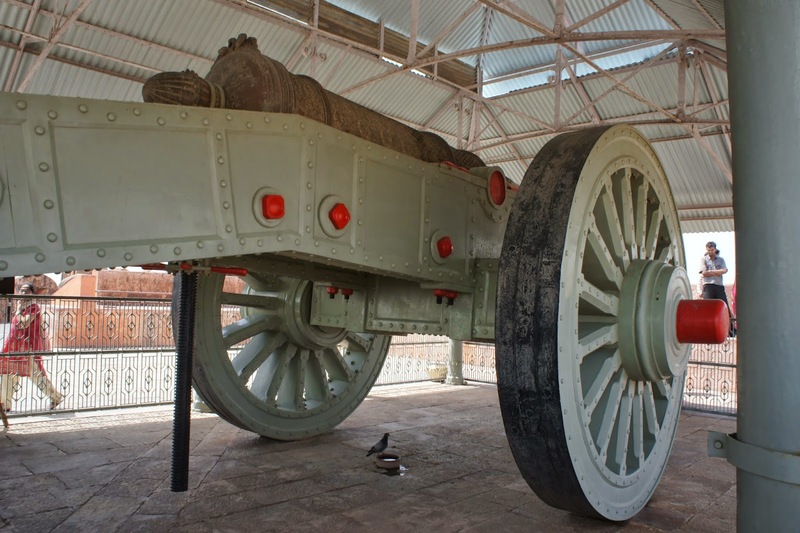 Damn it is one heavy cannon. The staff member also explained that the cannon was only fired once during its test trail and was never fired again since then, as there was no need to fire it. He also explained that the huge pit that I saw behind was a water tank where the gunners jumped in after then light the cannon to mask the loud noise it produced. 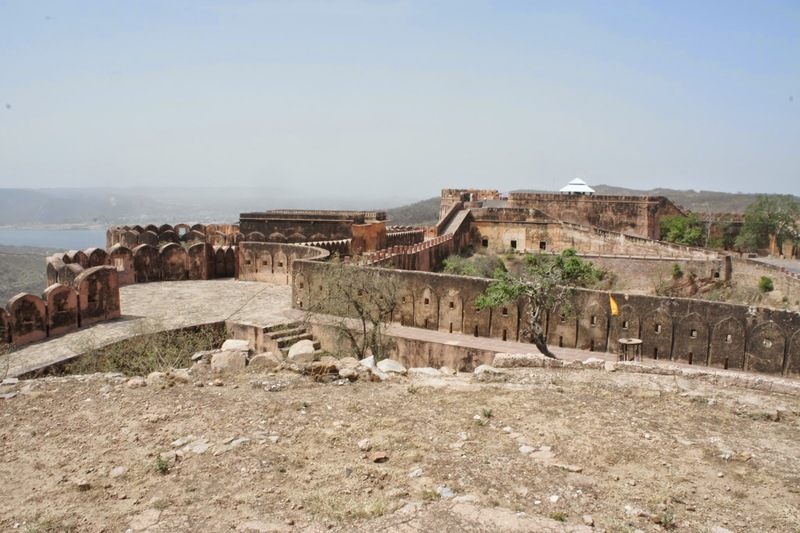 After which, the staff member told me to go over to the other end of the fort and visit the living quarters and let me go on my way. I was actually surprised that this guy did not ask for tips or anything. 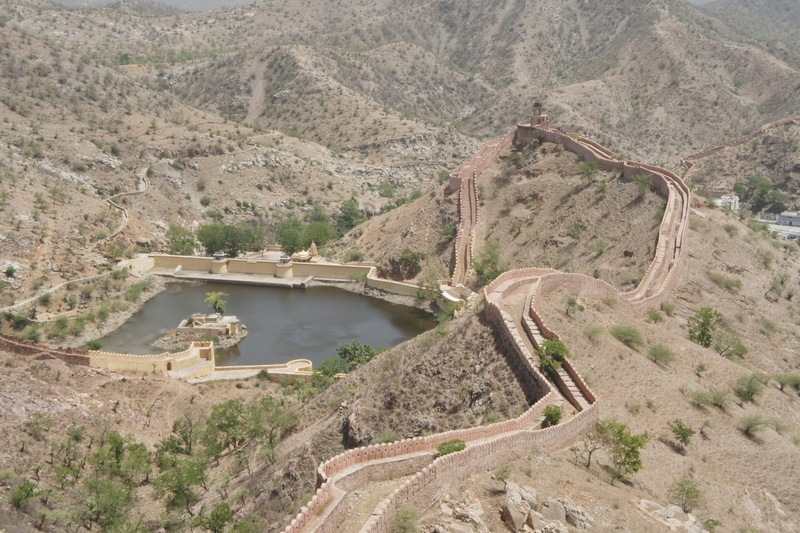 So off I went, pass the water tank to the other side of the fort. 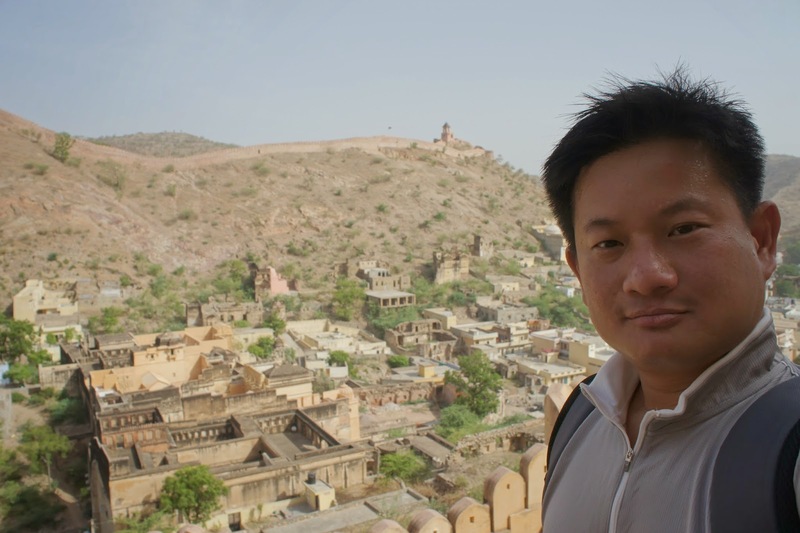 As I was entering the fort, the guy at the entrance demanded to see my ticket, so I showed him and he in turn became my guide. 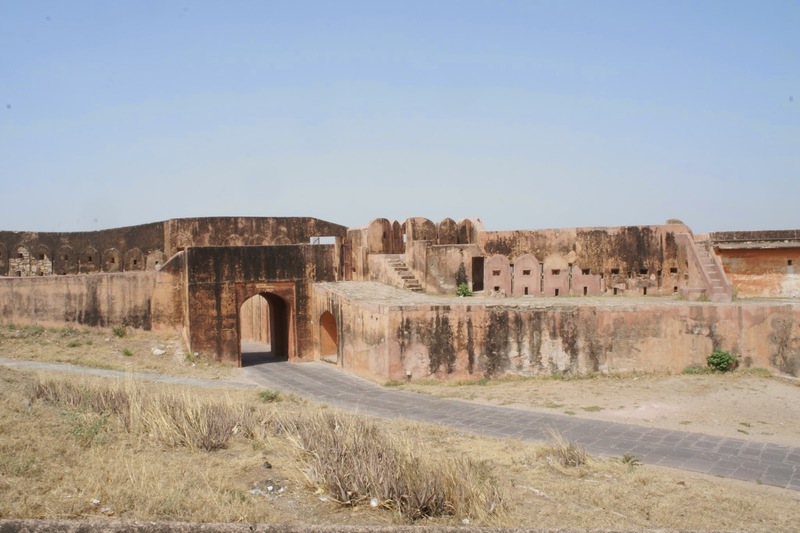 We walked around this side of the fort, which is mainly living, dinning and entertainment quarters. 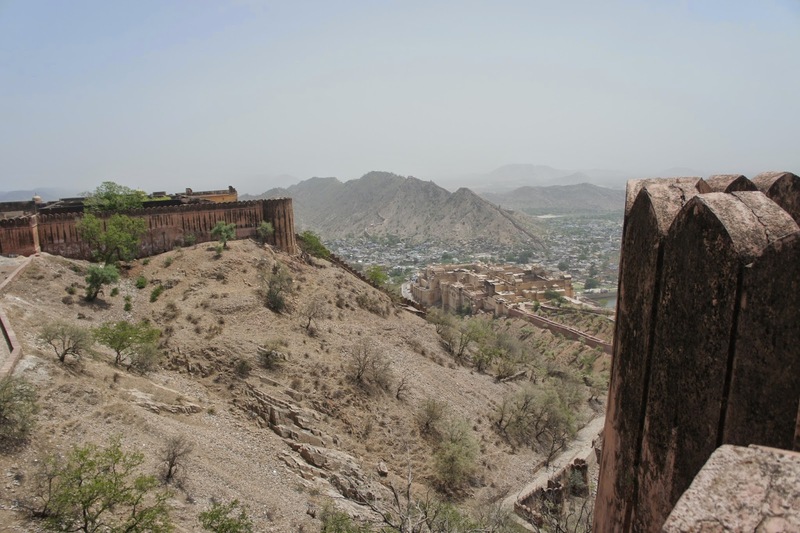 The staff brought me to the towers that overlooked the whole of Amber Town and the Amber fort. 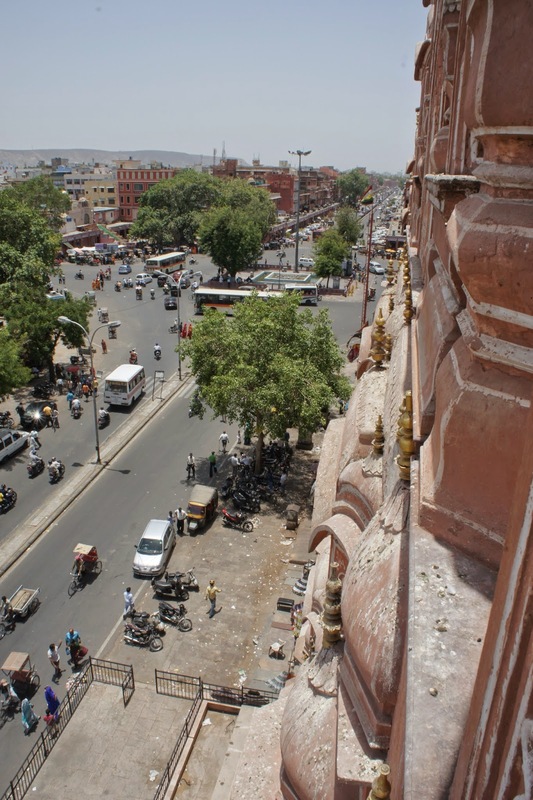 From the tower, I can see the walls that protect the town, it is just like those we see in the movies. 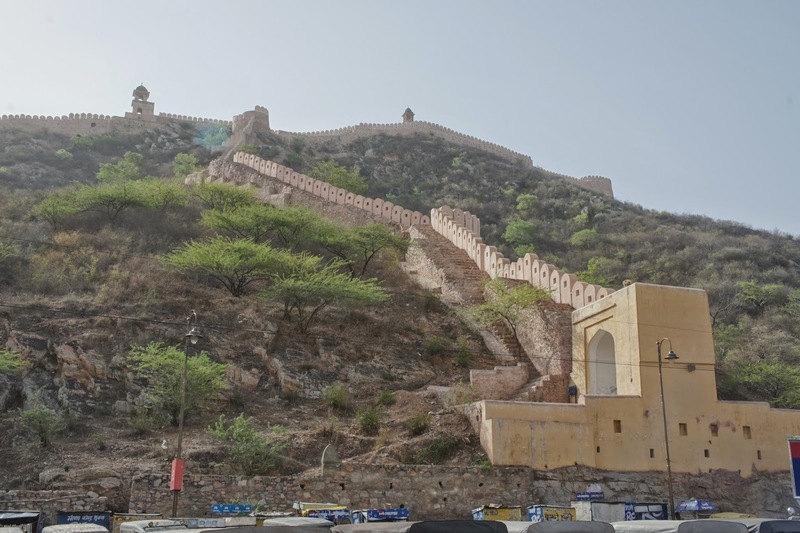 The staff jokingly said that in China they have the great wall, in Jaipur we have a mini wall to protect the city. Other then the view up here, I also like the breeze that cools the heatwave. Too bad our stay cannot be longer. 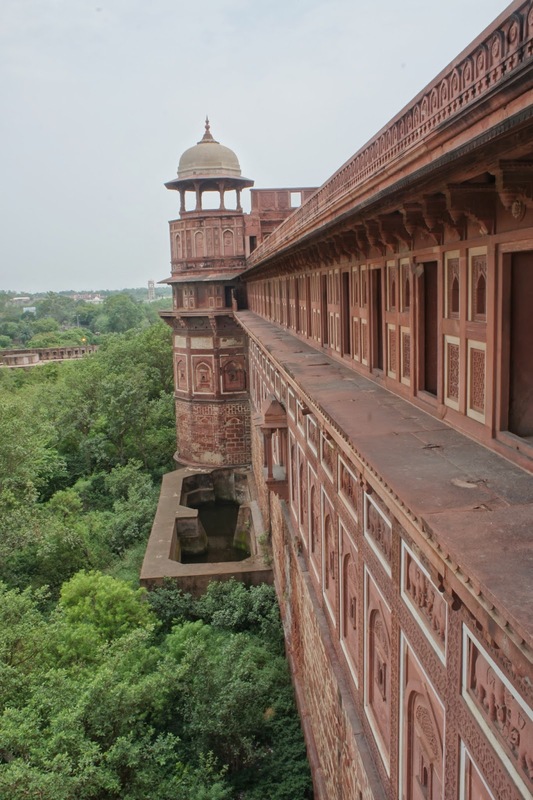 The staff brought me across the top of the wall to the other watch tower. 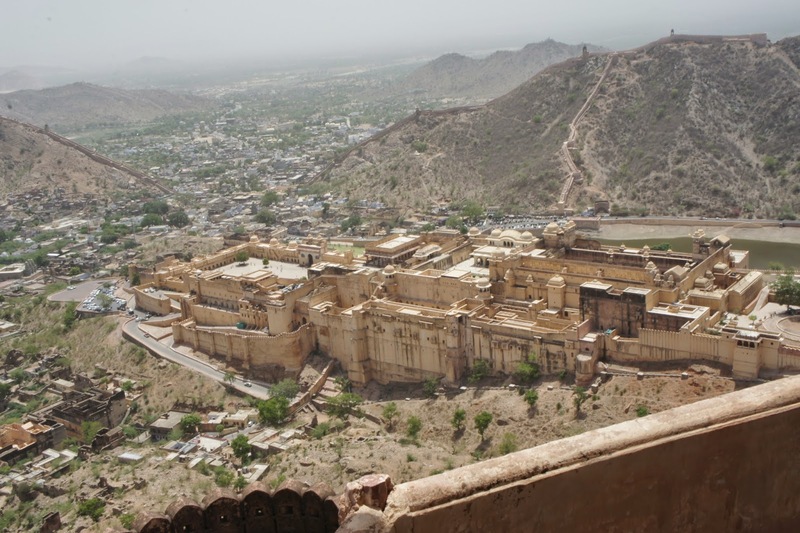 From here I can see Amber Fort closer. 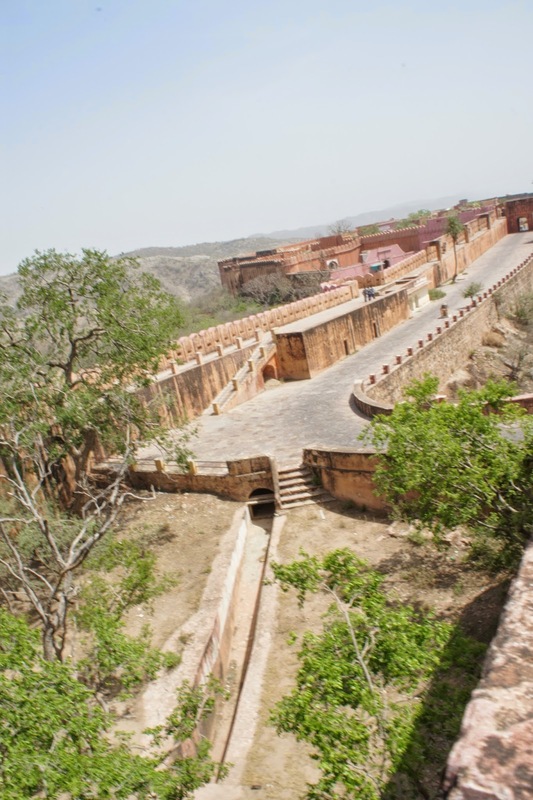 The staff also shared with me about a tunnel that linked Amber Fort to Jaigarh Fort. 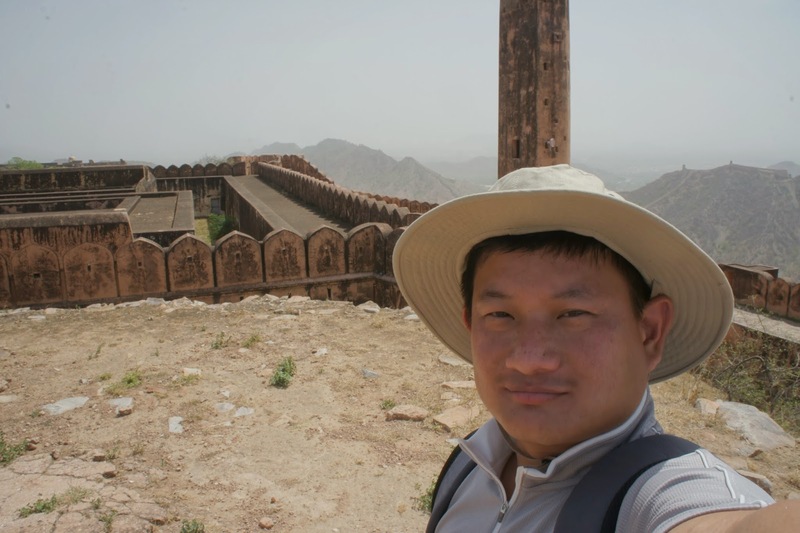 He mentioned that this tunnel is used by the Emperor to get to this fort. 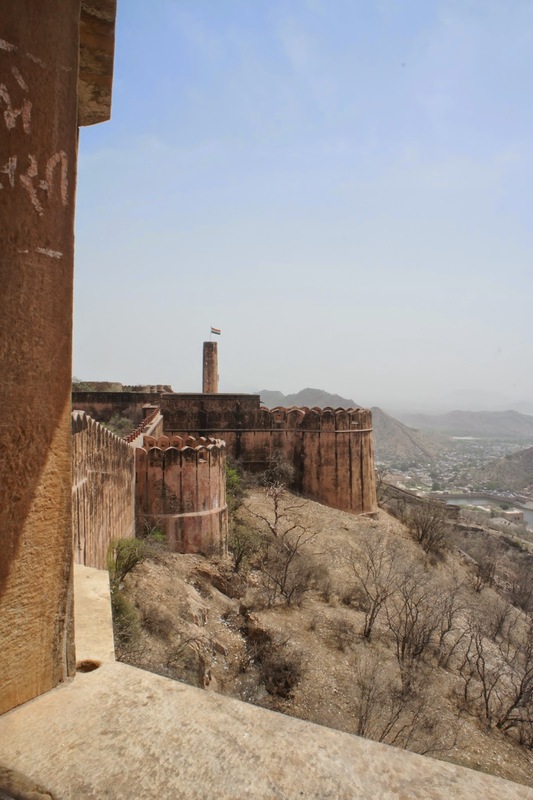 At this time, it struck me that the purpose of Amber fort is for residence and that of Jaigarh fort is for warfighting. 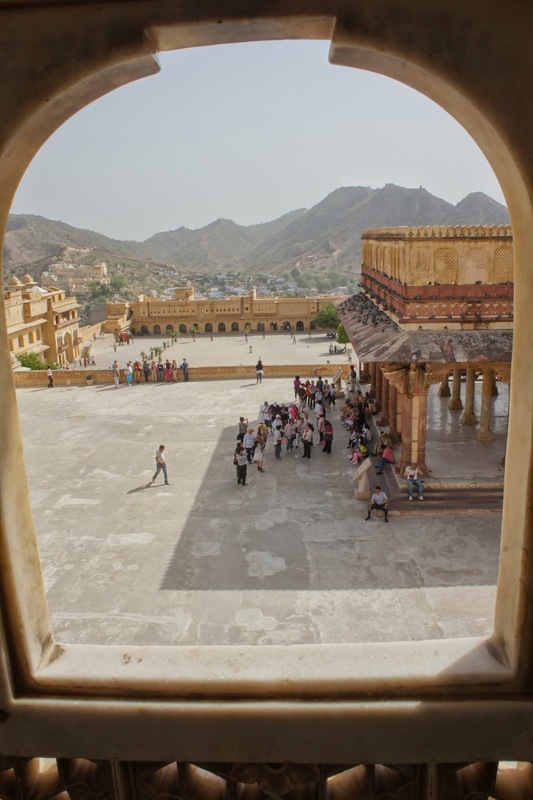 As we were walking towards the entrance, the staff pointed to a sealed doorway and said “this is the tunnel that linked to Amber fort”. As we were reaching the entrance, the staff actually asked for a tip! Another opportunist! and he did it quite discreetly away from the sight of this colleague, which led me to think that this was not the usual practice! 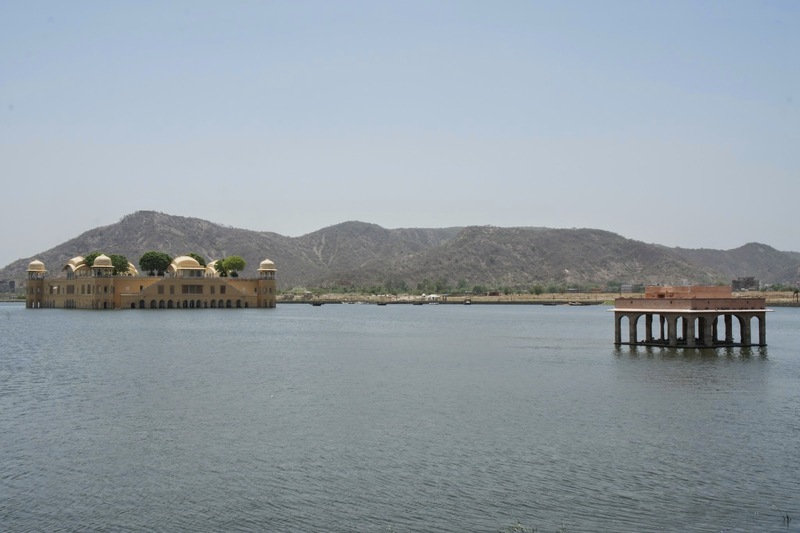 As I departed Jaigarh Fort, I told the driver to drop me off Jal Mahal, which I figured is closer to where we were then Amber Fort. The driver obliged. 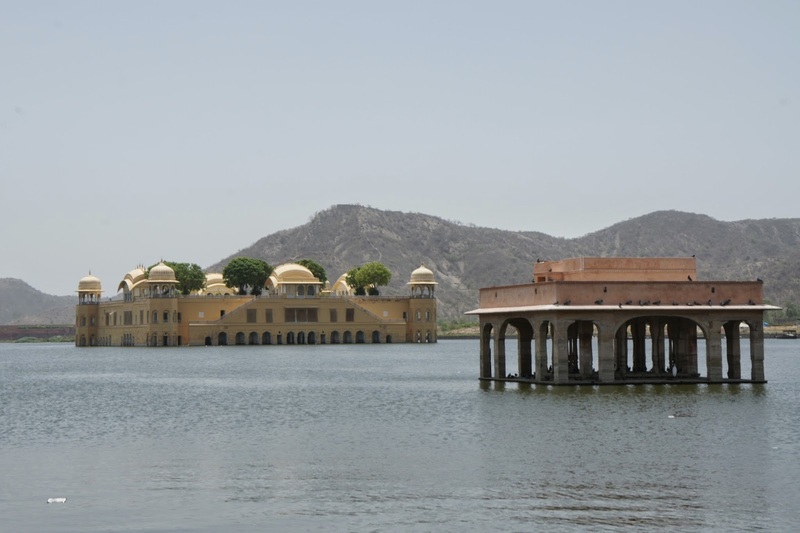 Well Jal Mahal is a palace that is built in the middle of the lake, which was used as a summer palace to cool the royalties from the heatwave in summer. 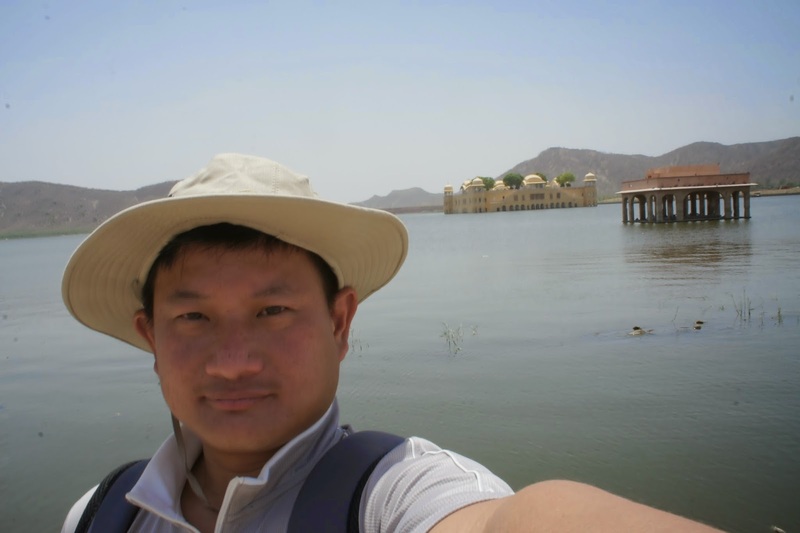 There is no access to this palace so all I can do is to take pictures of it. I went to the bus stop next to catch a bus back to the hotel. The weather was getting hotter as it approached noon. 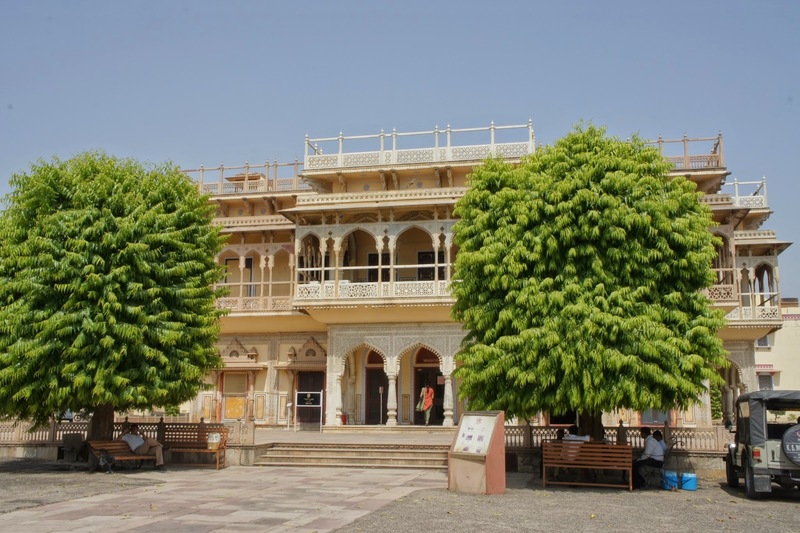 On the way back to the hotel, I stopped by Mawa Mahal – the wind palace as it was commonly known. Alighting the bus, I crossed the road like the locals trying to fight a space with the forever flowing of vehicles. 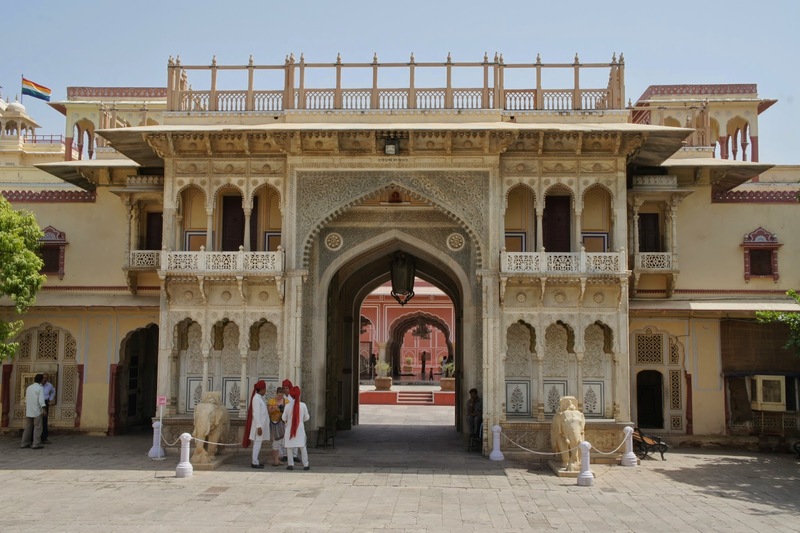 Getting to the palace was easy, the way to the palace was clearly marked by signs. 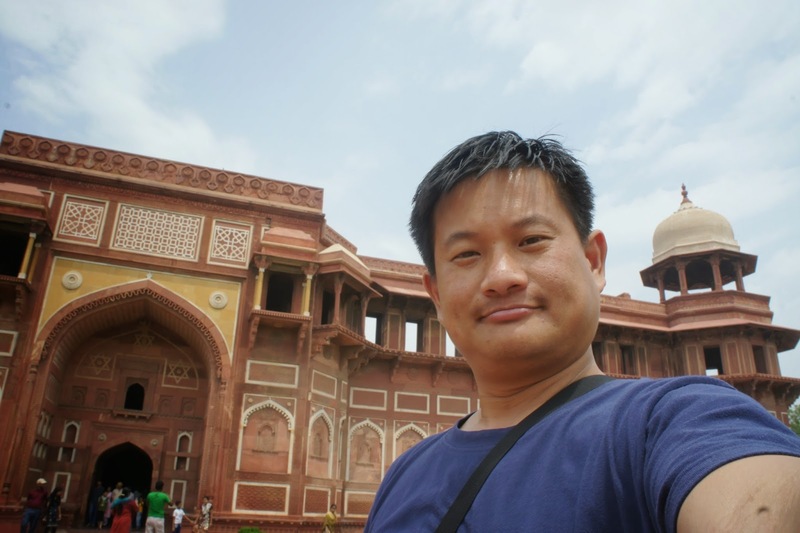 After getting the ticket, I went into the palace. 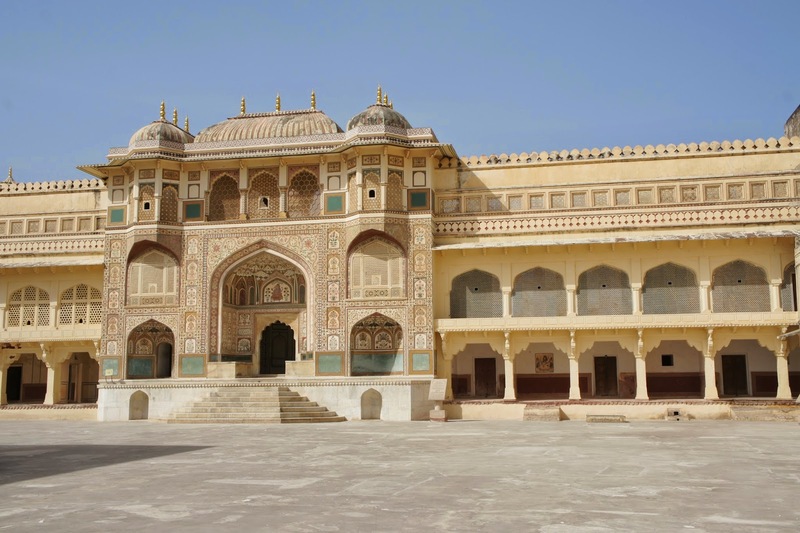 This palace, compared to the others I have seen so far this palace is much smaller. 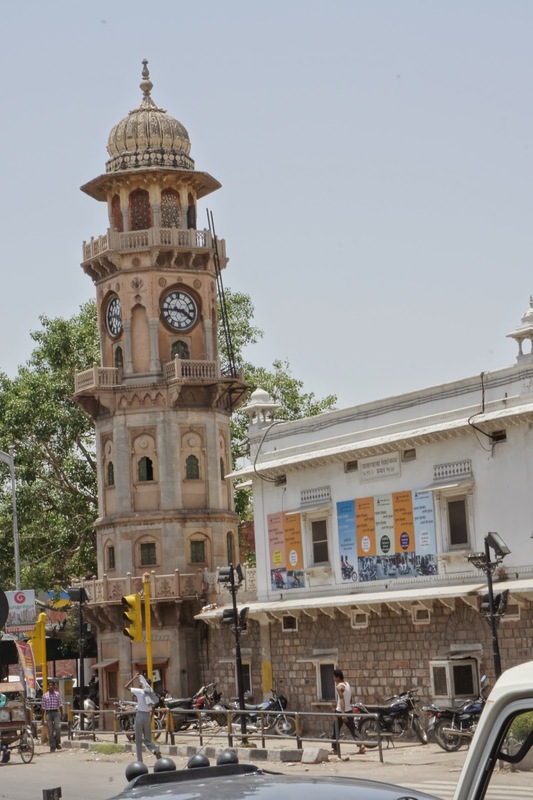 Its main purpose is to allow women in the royal family to see the happenings in the city, as well as to watch the possession as they match by the Mawa Mahal. 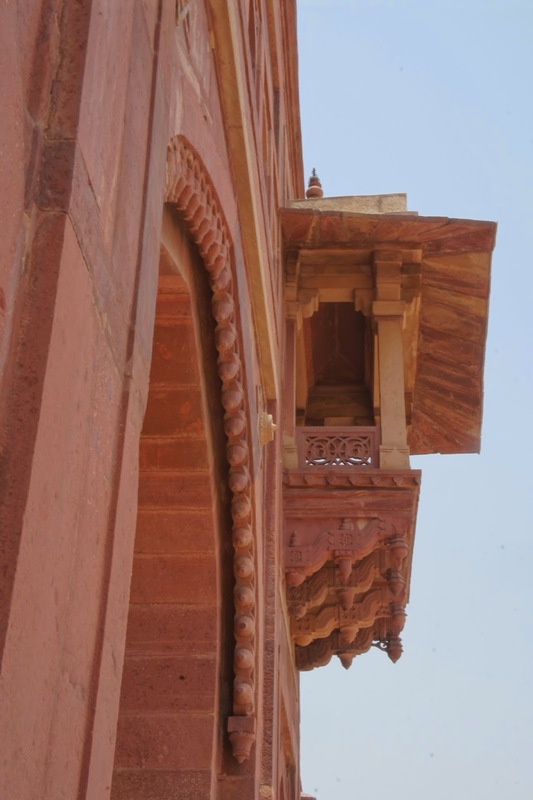 The Mawa Mahal was built in the way that it looked as though the upper levels of the structure stacked onto the ones below. The viewing “rooms” are open on one side and can only accommodate 1 people in each room. The way up to the highest point of this building was quite an easy walk. There wasn’t any stair case up and a ramp was used instead. The best view out of the little windows onto the street would have to be those on the upper most floor, as it is the most windy. 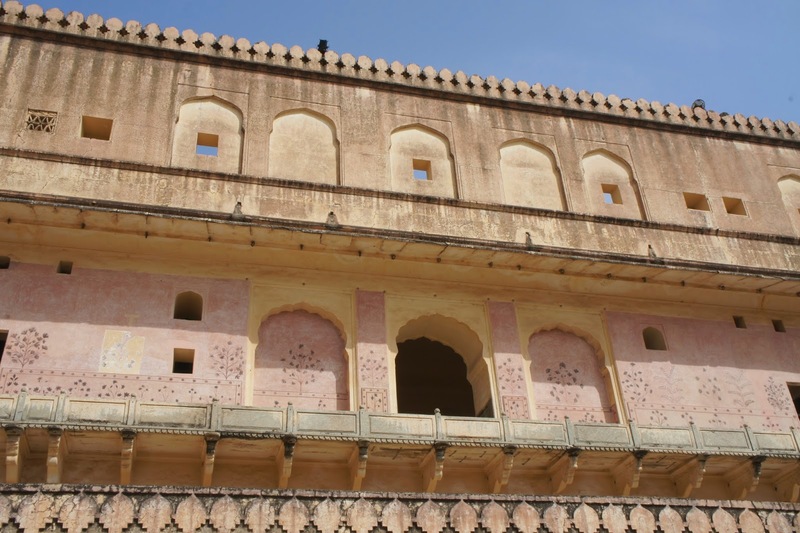 The only stairs in this palace was the one that led to the upper most portion of this palace. 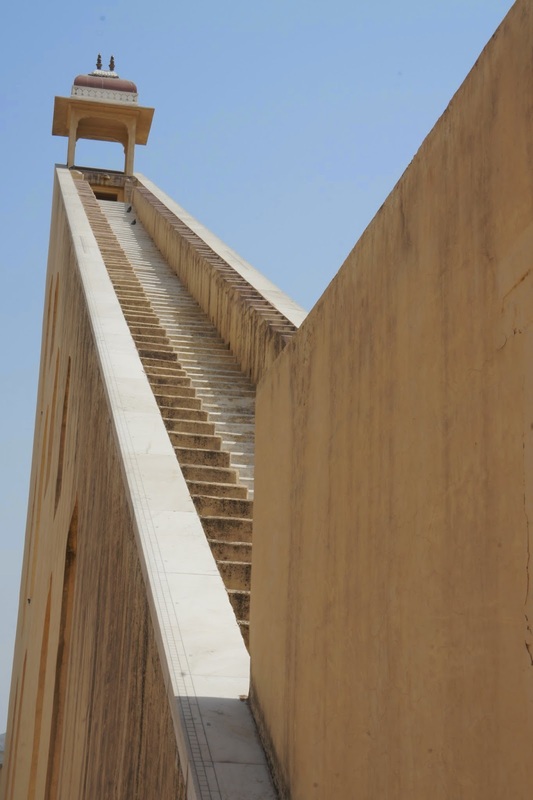 There is only 1 flight of stairs and it was so narrow that only 1 person can use the stairs at any given point of time. 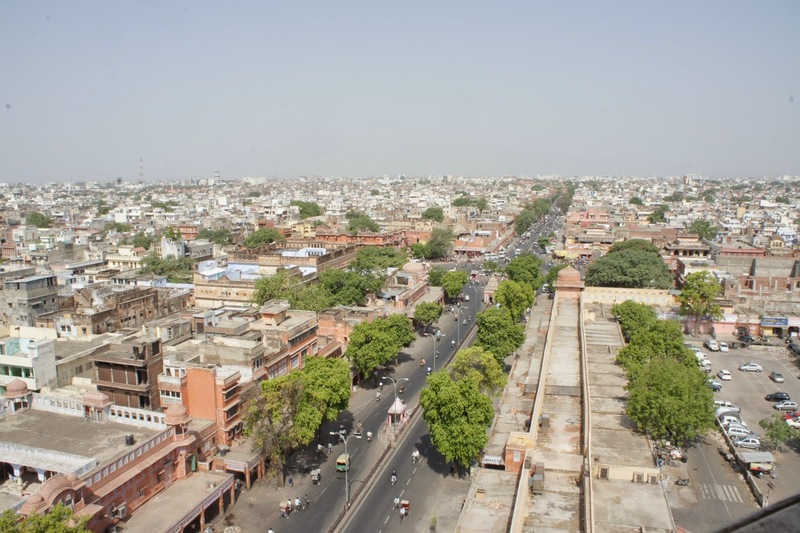 I took some pictures from the tallest point and went to the only wind tower that was open to the public next to the main structure of Mawa Mahal. From the wind tower, I truly believe why this palace was known as the Wind Palace as it is the most windy on one of the 2 wind towers in the palace grounds. From the tower, I can not only see the street below, I can also see the other attractions close by. 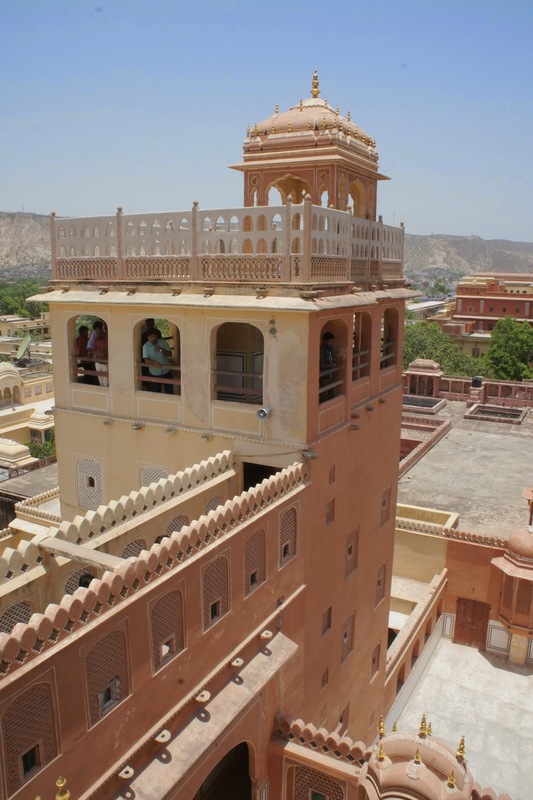 The main thing to do in Mawa Mahal is climbing the main structure that overlooks the streets. 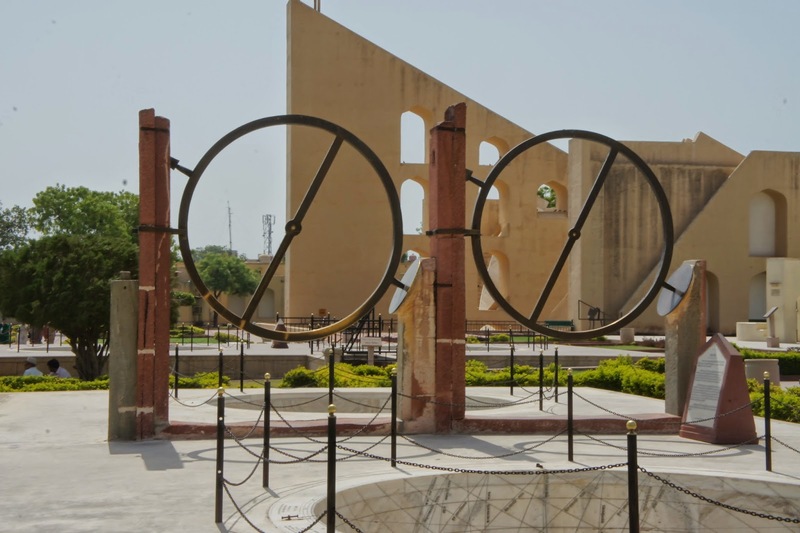 I did not spend too much time at Mawa Mahal and decided to head towards Jantar Mantar, which looked very close to Mawa Mahal. 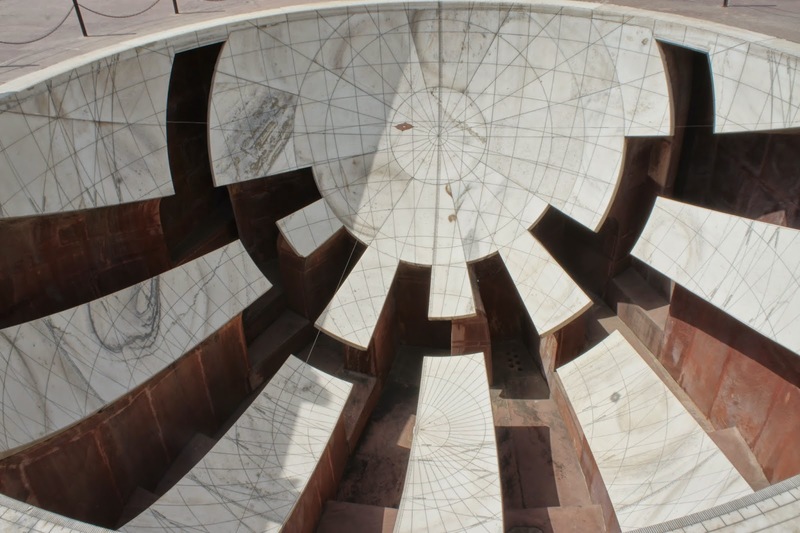 As I was walking to where I thought Jantar Mantar is, a local stopped me and said the way I intended to go is out of bounds, and told me to go outside onto the main street to get to Jantar Mantar. That was what I did, but I gave up halfway as the heat was getting to me. I headed back to the bus stop and caught a bus back to the hotel. I originally intended to spend the rest of the day at the hotel as it was really hot outside. 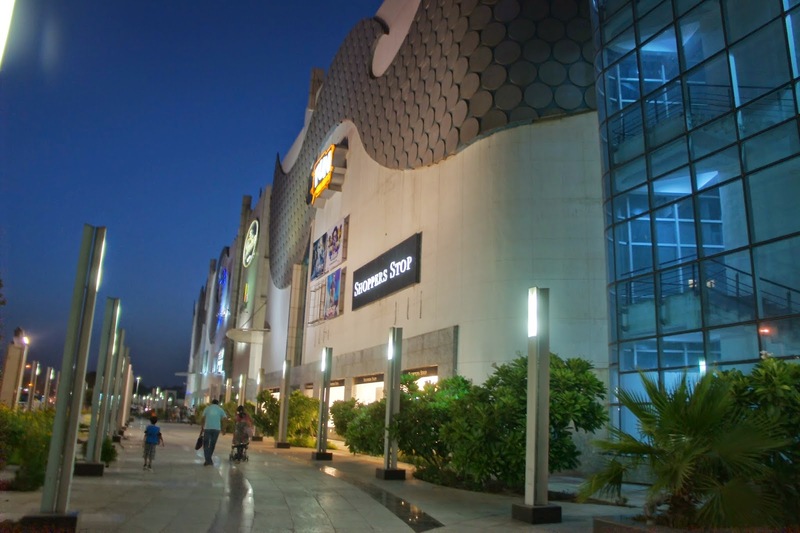 However in the evening, as the weather cools down, I took a bus to Triton Mall, one of the newer shopping malls in Jaipur. The ride to Triton Mall was a short one. 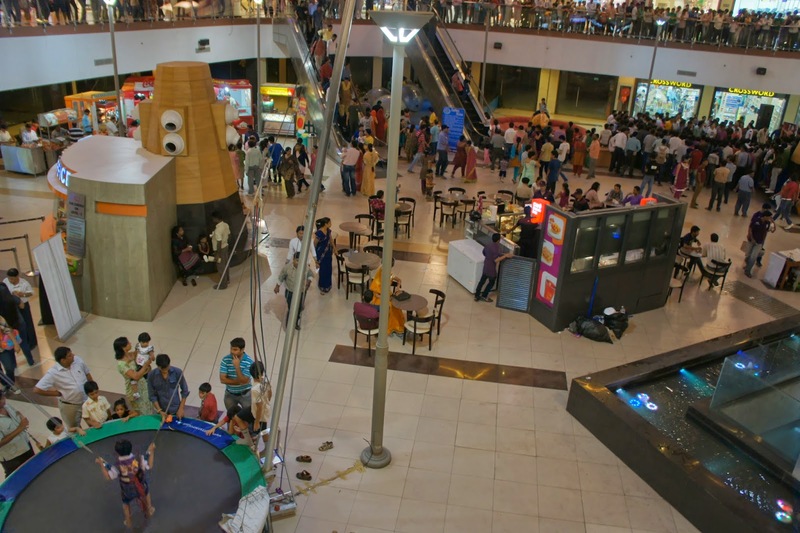 This mall is rather disappointing, as not many shop spaces are leased, making the whole mall feel like it is still undergoing construction. The visit to this mall was quite uneventful. I headed to the top floor, where the food court is to grab my dinner, after which I took the same bus back to the hotel to rest for the night. 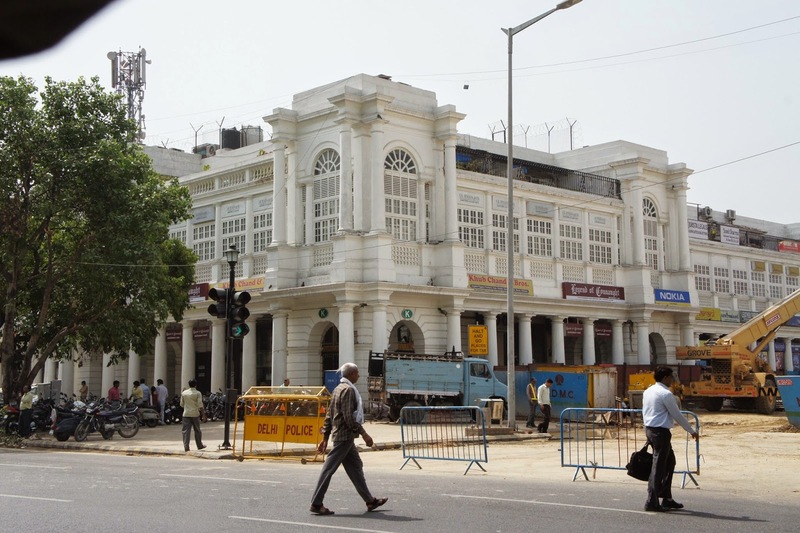 After a good night sleep at the hotel, I headed to the train station to arrange for my interstate travels in India given the short time I have here. I am mentally prepared for the heat wave that I will be experiencing in India, given this is the middle of summer. As I step out of the hotel, it did not feel very bad after all. I took a stroll towards the train station, which was not very far from the hotel I put up for the night. I entered this dark foyer with a “Unreserved Ticket” stated on it. As I entered here, there were long queues forming at every counter that was attended. I did not feel like queuing up, so I approached a security guy and asked where can I get tickets for my train trip. He pointed me to the main station and head to the 2nd floor where it states international tourist. As per directions given, I went to the room that was pointed out. This room is full of tourists trying to sort out their train tickets. Getting the train tickets was rather uneventful, after queuing for about 30 mins (well there are seats where we move around like musical chair for people trying to get tickets. 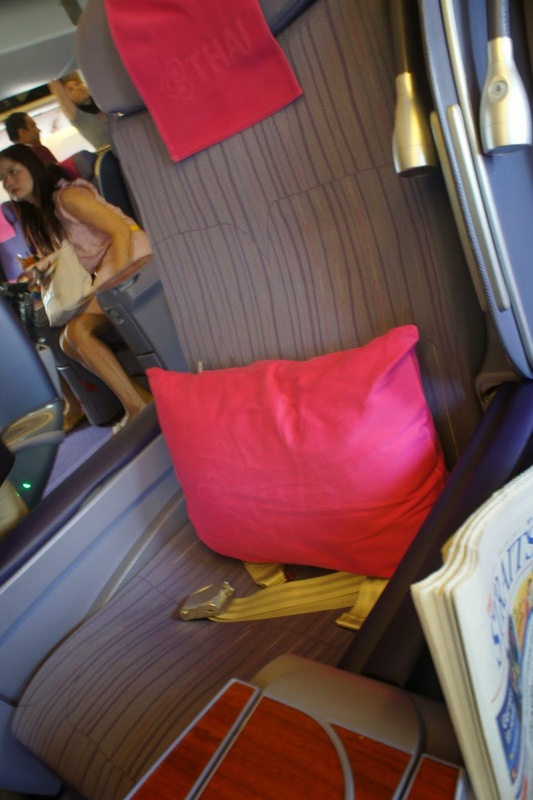 Got the tickets for my 3 trips settled for less then I would expected, one of which is first class (Well that is the only seat available). 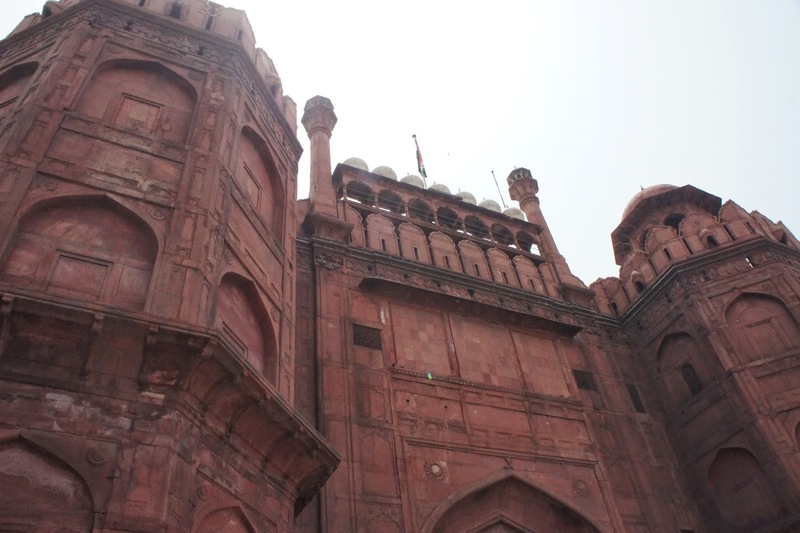 As I exited from the station, due to time constraints I took a motor rickshaw to the Red Fort. 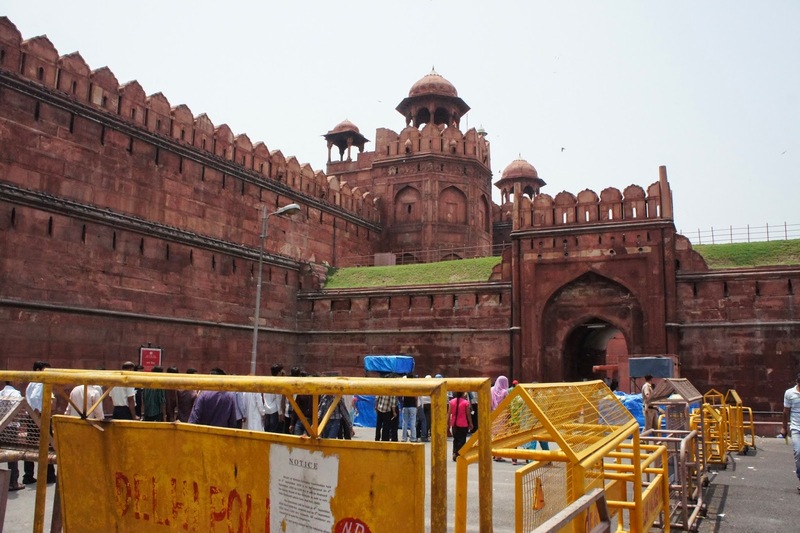 The ride to Red Fort exposed me to more foul smell!!! Mostly from the rubbish that the locals threw on the ground and of course the ammonia smell from the road side toilets. 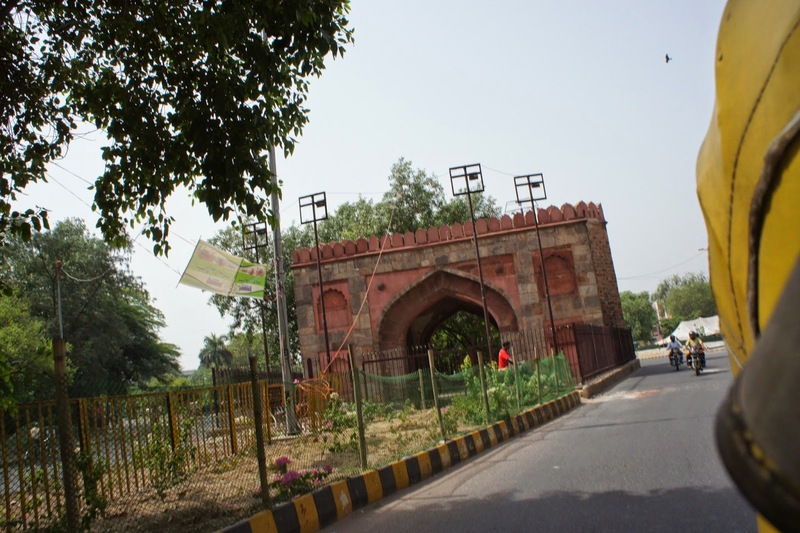 As we were heading towards the Red Fort, the rickshaw driver has mentioned that the people just do not bother about the governmental policies to curb littering, to make things worst, the local authorities accepted bribes when to look the other way when they catch people breaking the law. 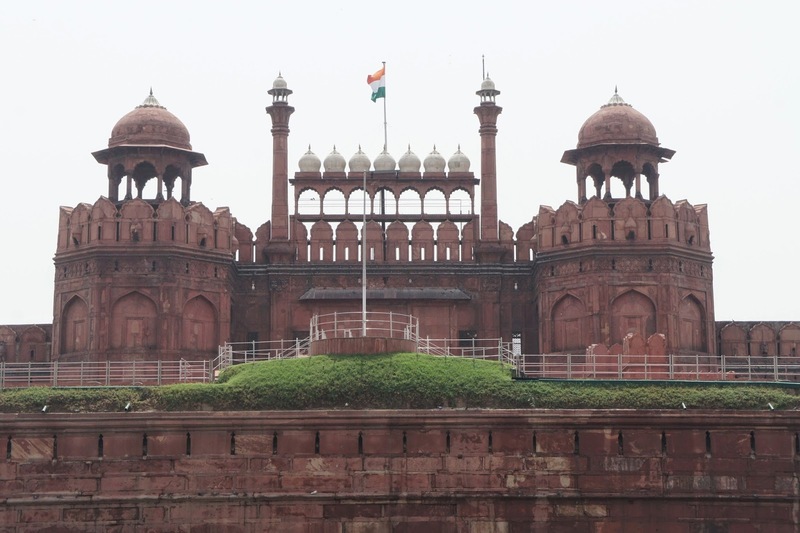 Soon I found myself in front of the Red Fort. 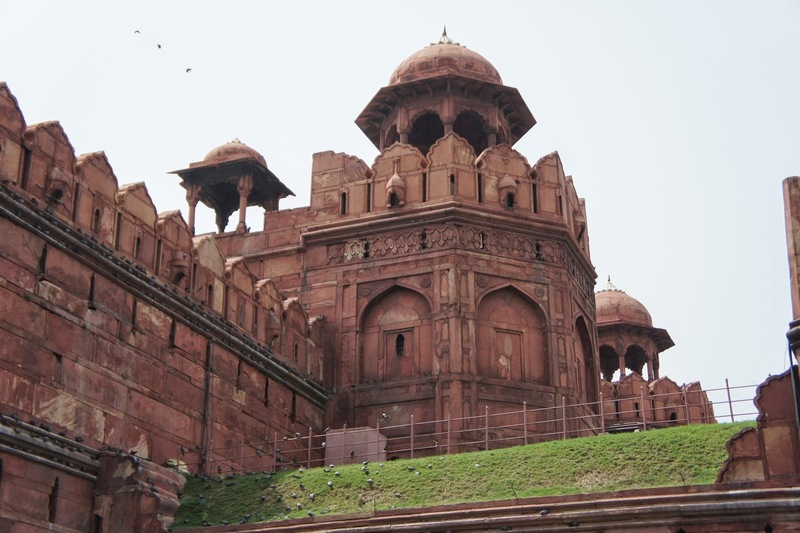 It looked majestic, and really lived up to its name as the Red Fort. 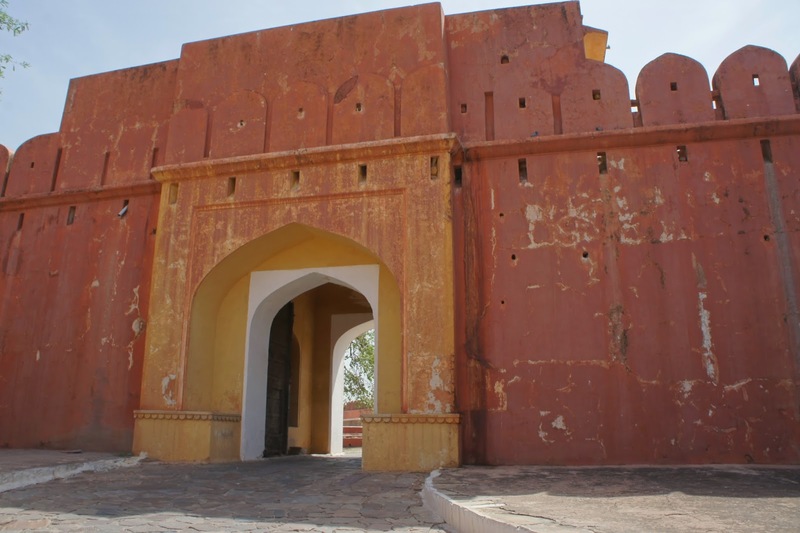 The gates and the main walls surrounding the fort is red in colour, due to the red sandstone used to build the fort. 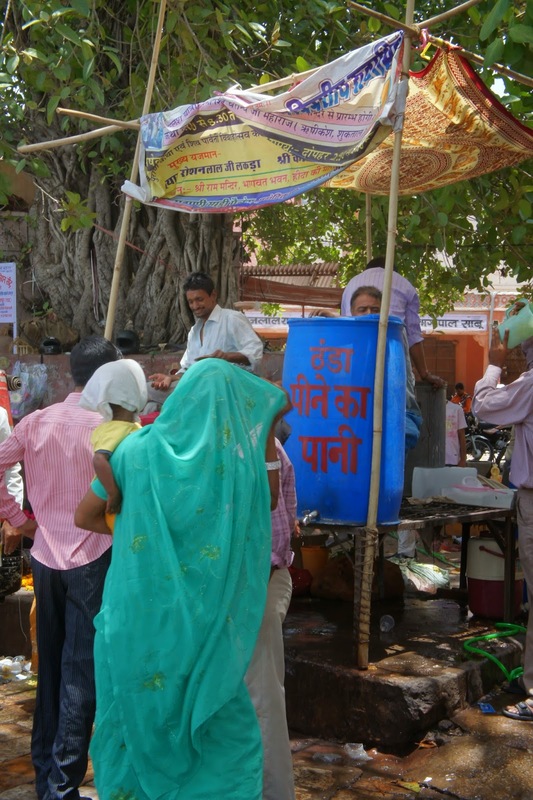 India practices dual pricing system where the locals pay a fraction of what the foreigners pay. 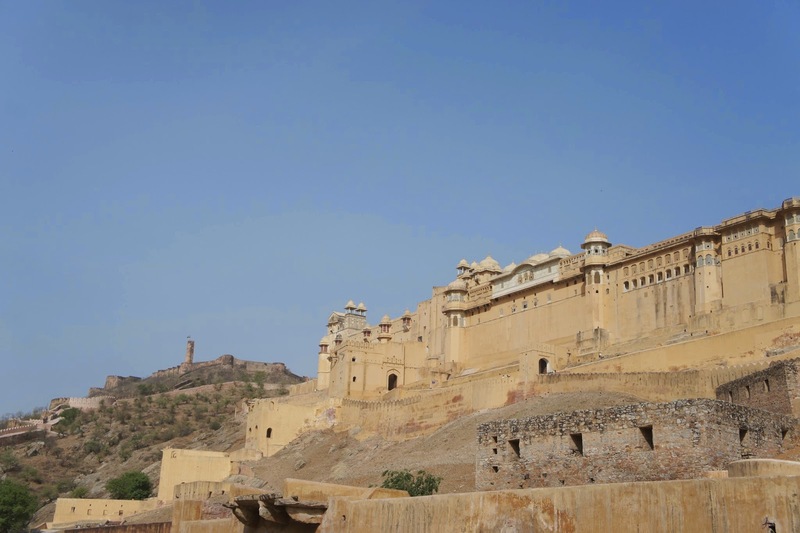 At the time I entered the fort, there wasn’t many people. Guess it is still rather early at this hour. 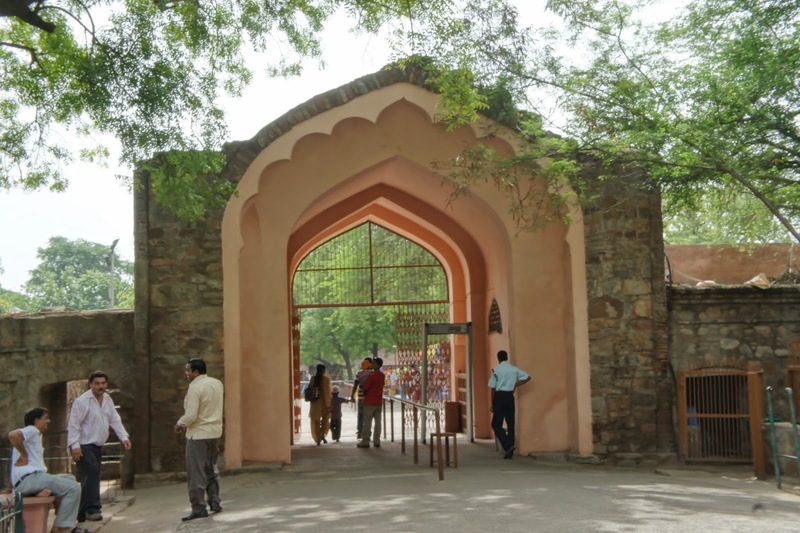 Entering the fort is like checking into the airport, we have to go through metal detectors and subjected to a body search. 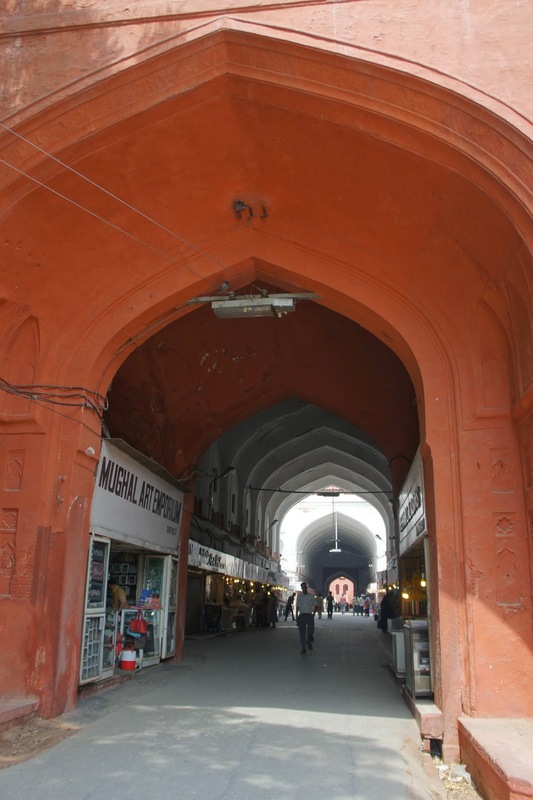 I passed the main entrance and the first thing I saw was a covered bazaar selling mainly souvenir to tourists. In the olden days, this place mainly served the royalties. The bazaar wasn’t that long, took me about 2 minutes to walk across it into the another a building known as the Drum house. This was where the emperor enjoyed the drum as part of his entertainment. However this Drum house has been converted into a military museum. 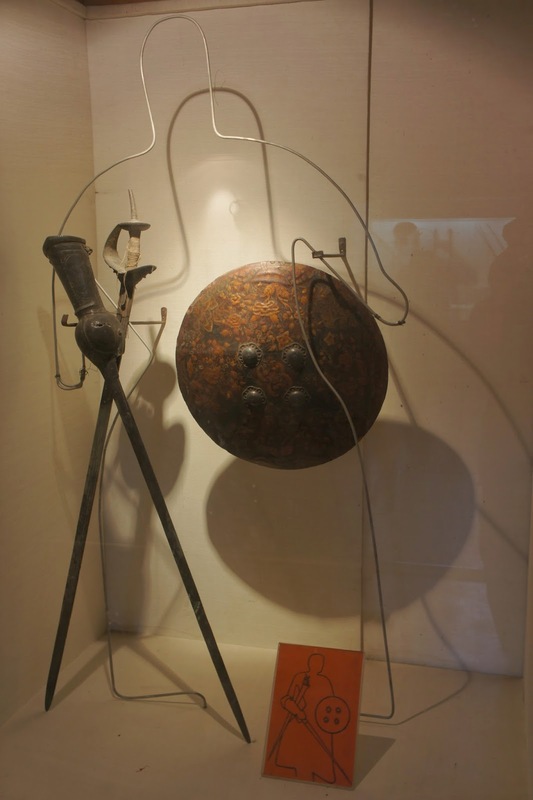 Guess most tourists gave this a miss as I found out I am the only foreigner in this museum. Perhaps the inconspicuous entrance is part of a factor many give this a miss. 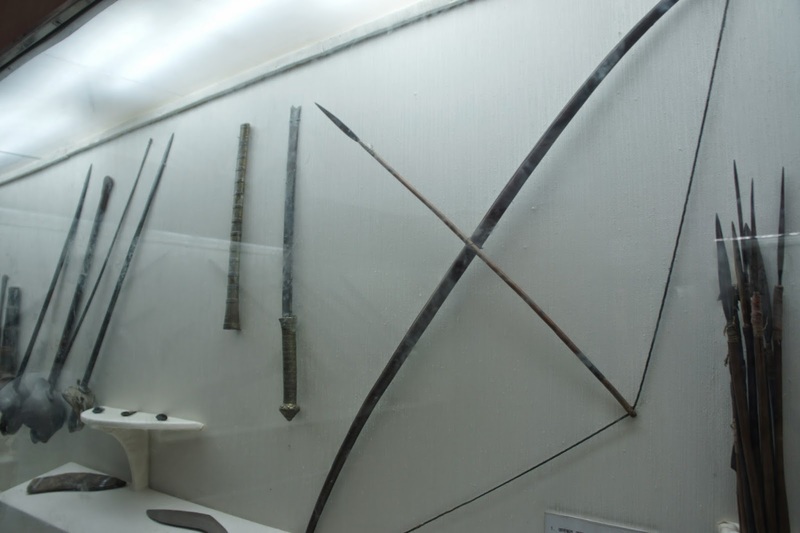 The smallish museum displayed main weapons that was used in Shah Jahan’s time, but towards the end there are exhibits of weapons used by the Brits. 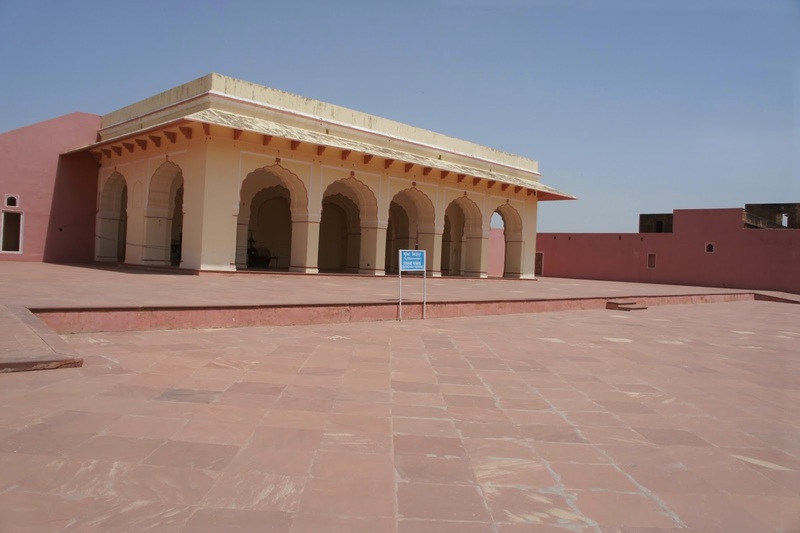 Exiting from the Museum I headed towards the next building where the Diwan-i-Am stands, this pillared building is where the emperors received the general public and listened to their greviances. 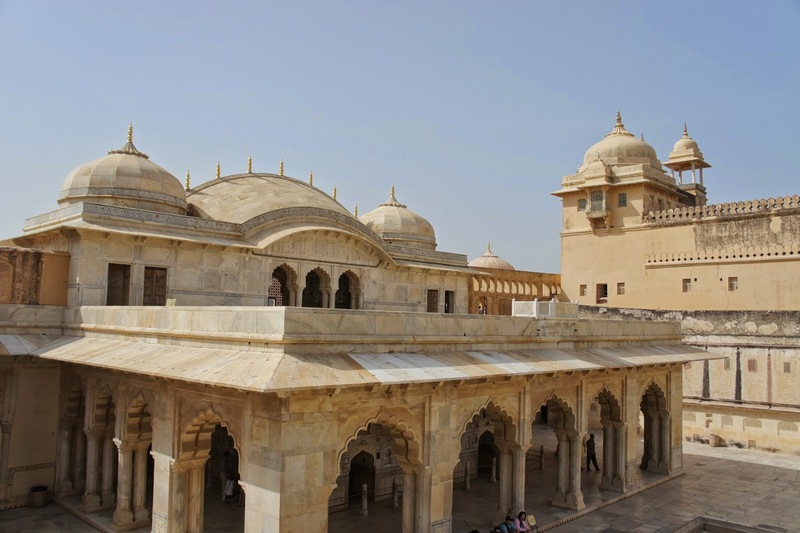 The centrepiece of this pillared open building was a white marble throne where the emperor used to sit. 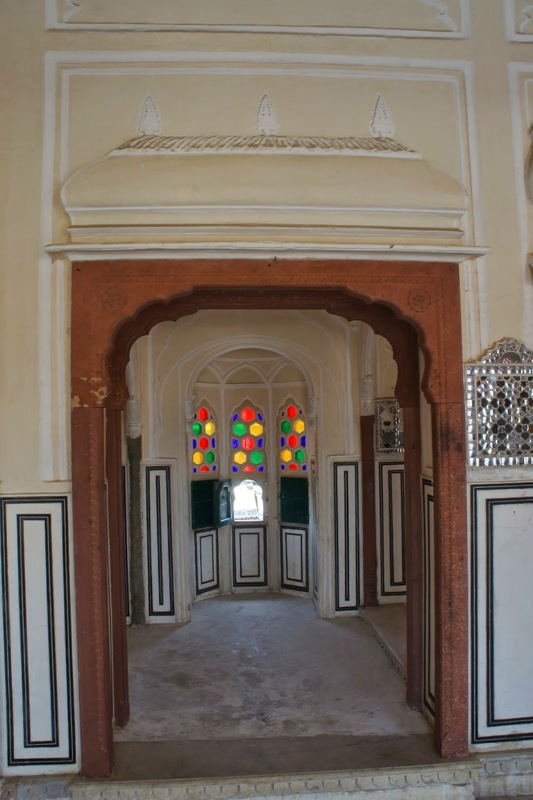 Passing the Diwan-i-Am, opens up to the interior of the palace. 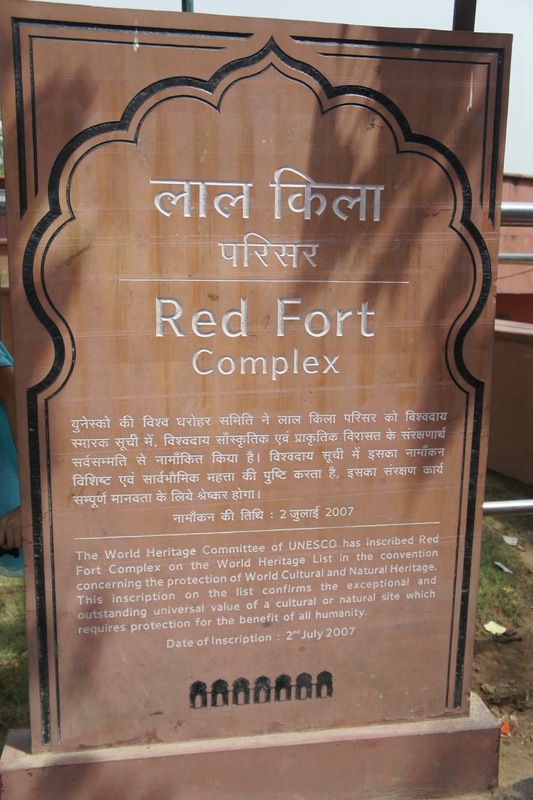 At this point, I realised the Red Fort is actually the royalties’ residence. 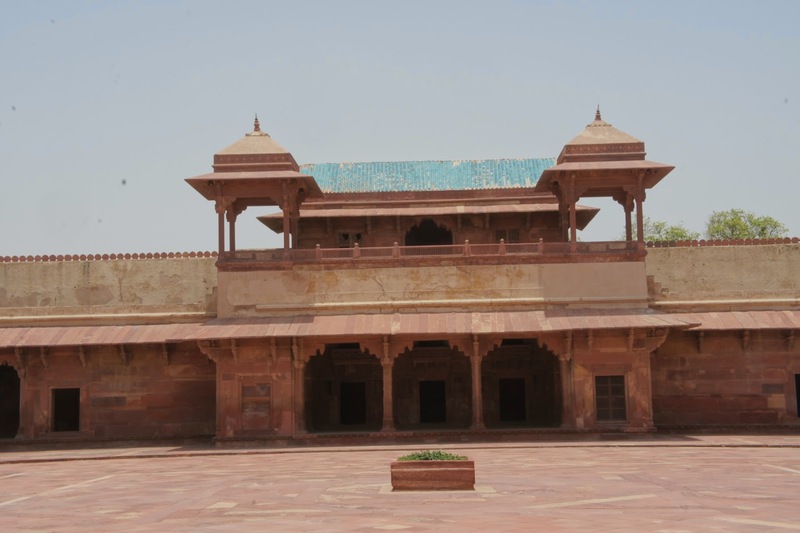 With areas where the emperor would have meetings with his officials and even a balcony where he would address his subjects, other then the sleep quarters. 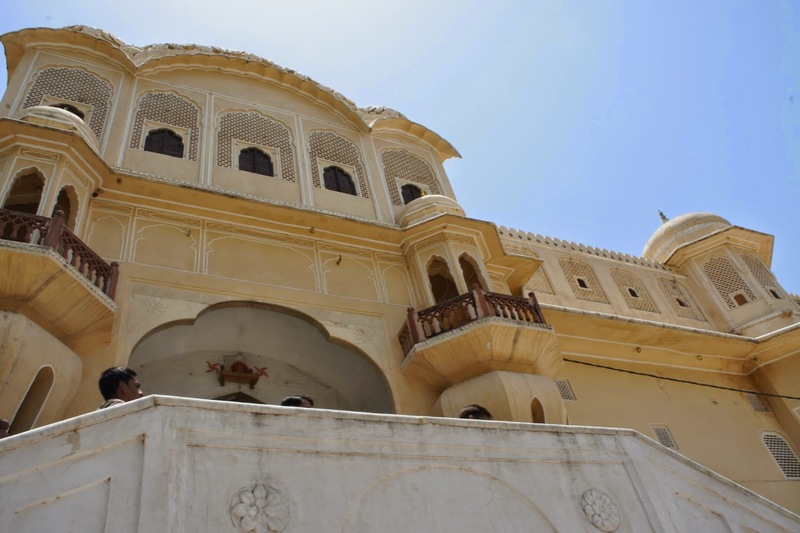 As I walked pass the Diwan-i-Am, the next building – Rang Mahal was immediately insight. 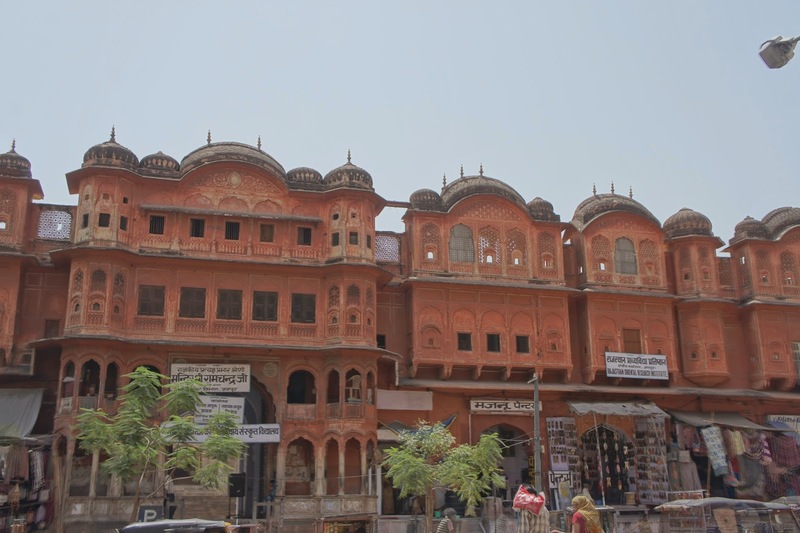 This building was also known as the Palace of Colours as it once was painted with bright colours and decorated with mosaics. 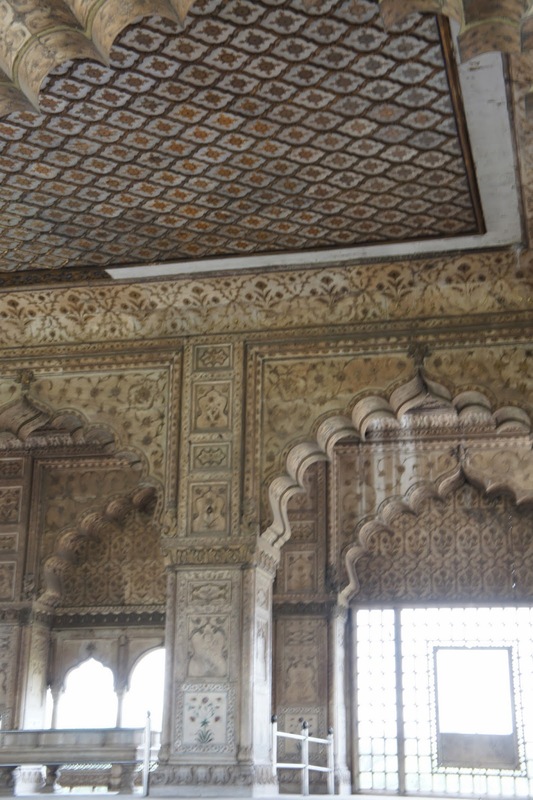 Its ceiling was once laid with mirrors and gold, and this building functioned as the quarters of the emperor’s wives and mistresses. 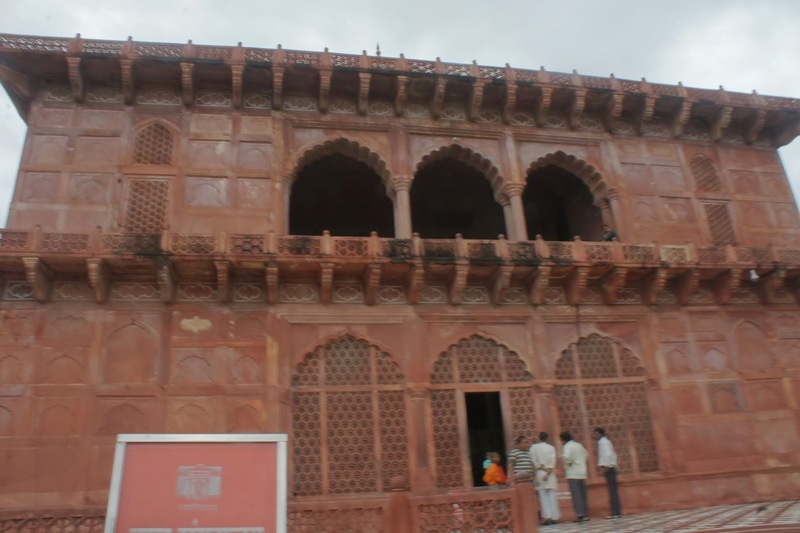 The building next to the Rang Mahal, known as the Mumtaz Mahal, where it once housed the princesses. 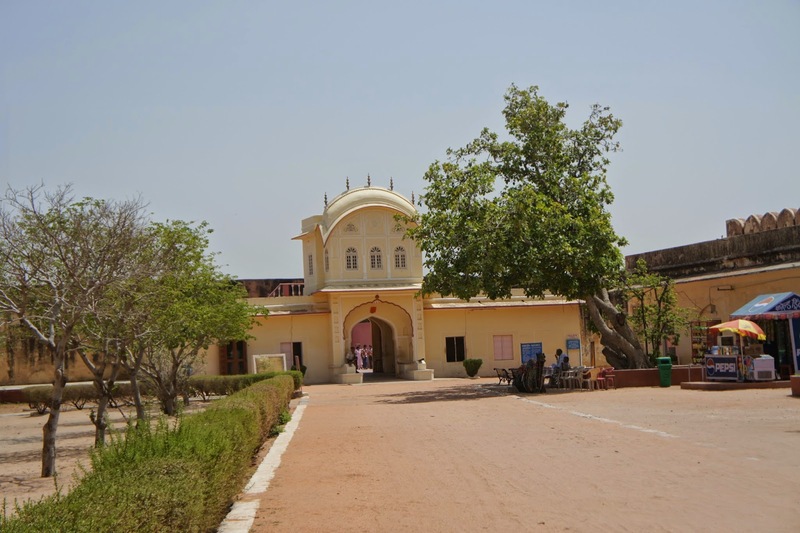 It has since been converted into an archaeology musuem. 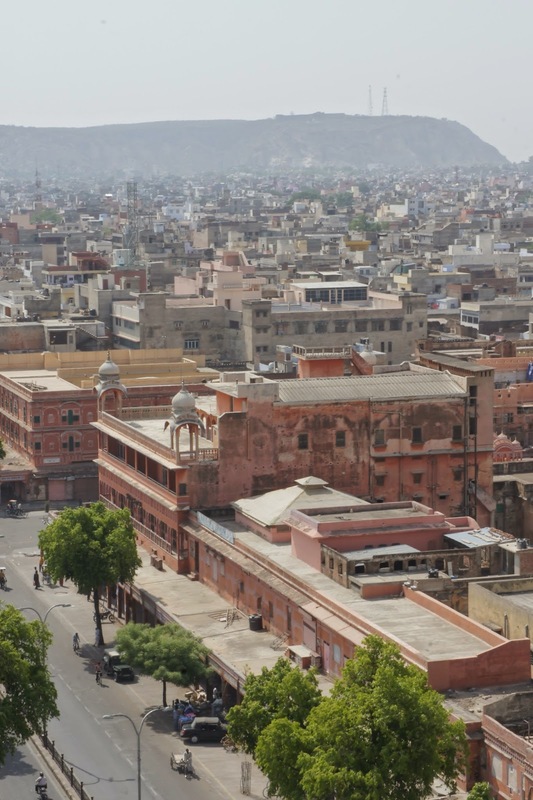 Tracking back towards the Rang Mahal, the building next to it was the Khas Mahal made out of white marble, which served as the emperor’s private palace. 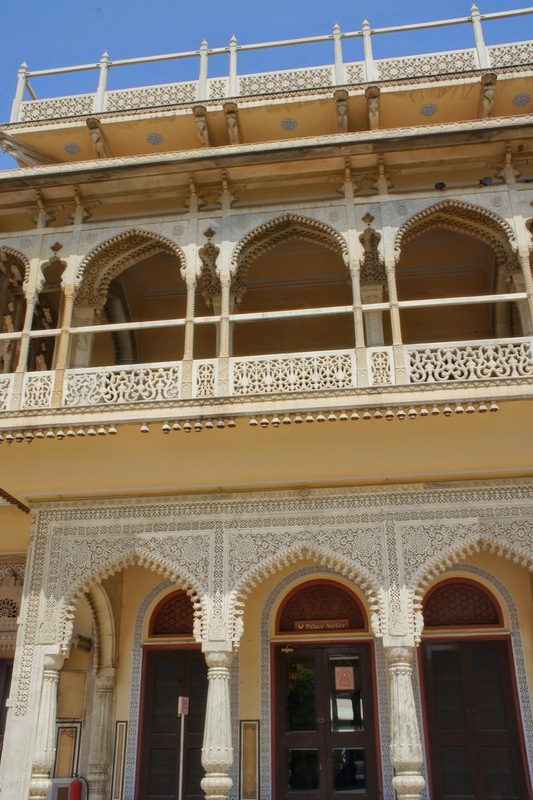 There was a balcony between the Khas Mahal and the building next to it – the Diwan-i-Khas (used as a robe room for the emperor), where the emperor used to address his subjects. 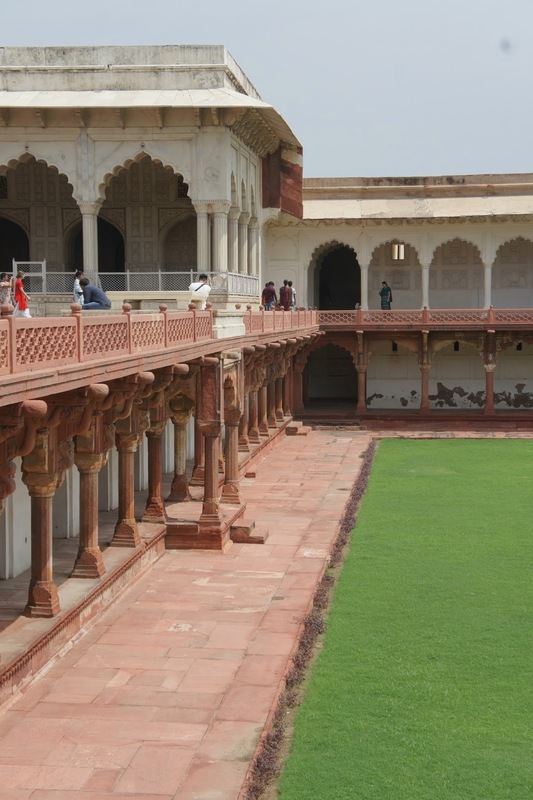 This balcony overlooked a huge garden, where I can imagine the subjects used to gather to listen to their emperor. 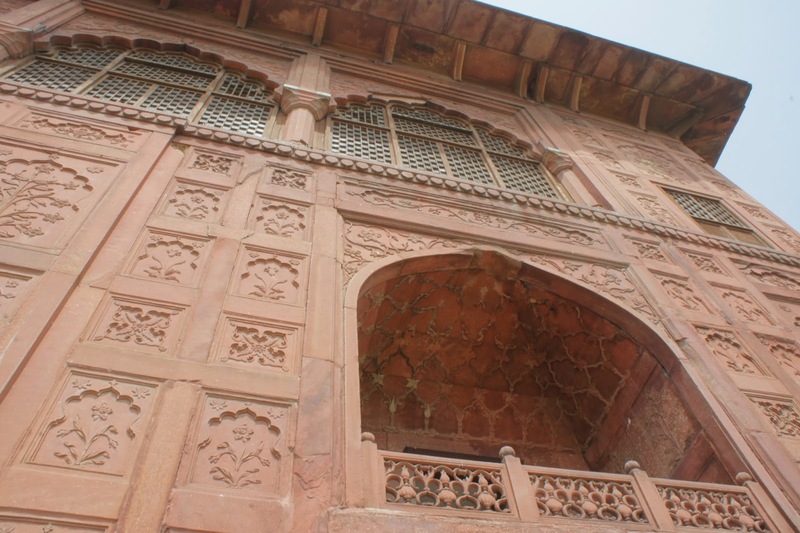 The other buildings in the Red Fort are rather uneventful. 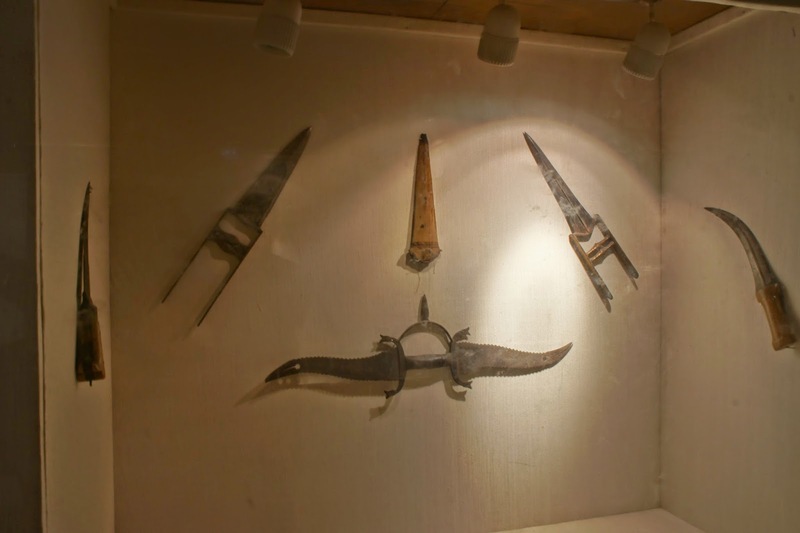 There wasn’t any signs that explained their purpose in the olden days. 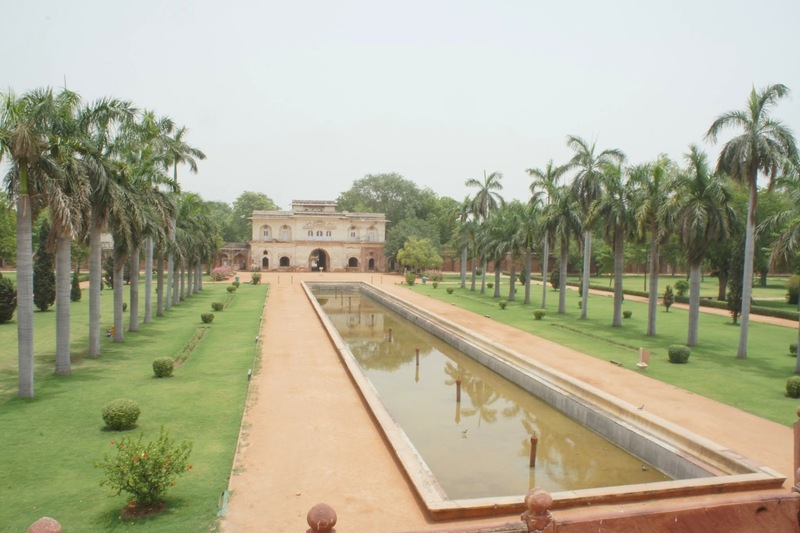 There was a smaller garden and a palace (Zaar Mahal) like building, built into what seemed to be a pool of some sort between 2 white coloured pavilions. 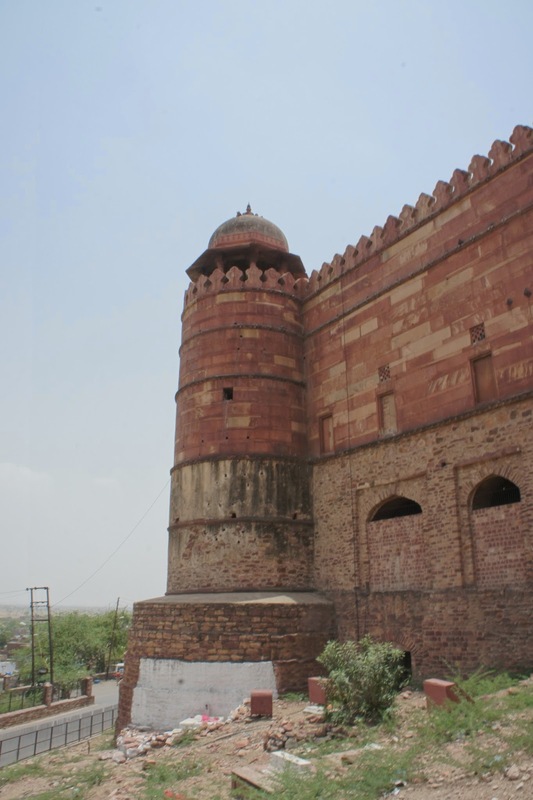 I guess this was pretty much it for the Red Fort, so I made my way out of the fort. 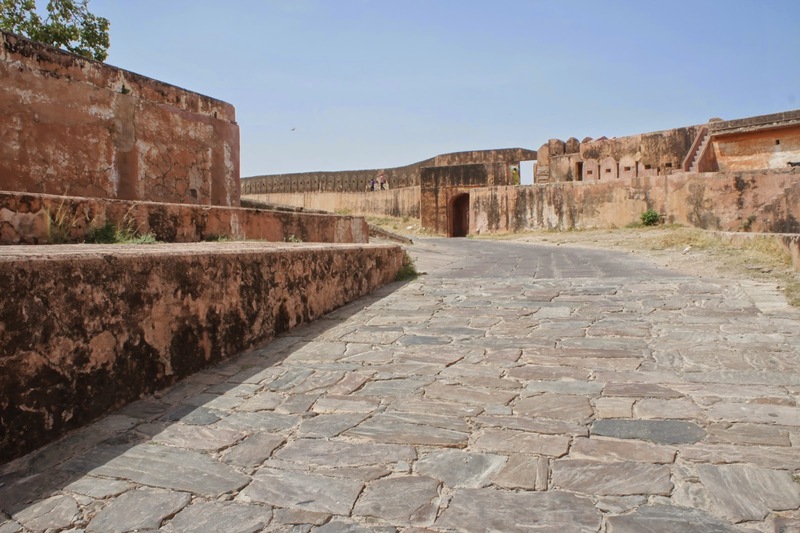 At the entrance of the fort, I was rather shocked to see a snaking long queue forming at the entrance of the fort, mostly locals and some tourists, awaiting for their turn to gain entrance into the fort. I thought I was lucky to have came early, if not I would be amongst the snaking queue. 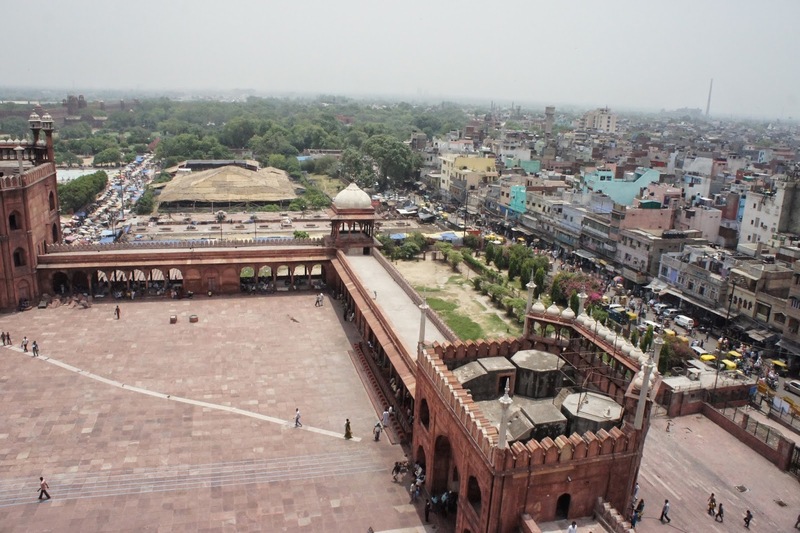 Leaving the fort, I headed to my next destination, the Jama Masjid mosque, which boasted as the largest mosque in India. 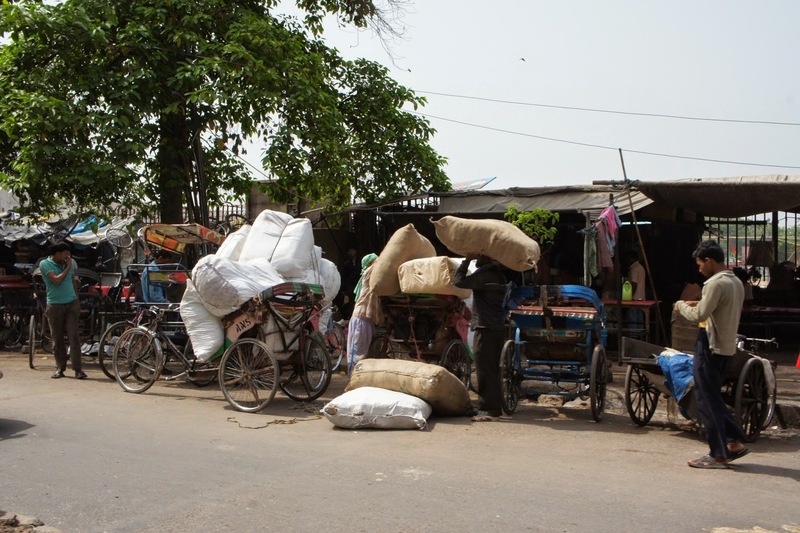 As I was walking towards the mosque, which was really not that far, there were touts along the way, people selling stuffs, the rickshaw riders trying to grab my business and such. There was one that tried to sell his rickshaw service to me by saying that the tourist entrance to the mosque was a good 30 minutes walk! Well I did not buy into it and chose to walk, and right I was, the entrance was really not that far, and tourists are allowed to enter the mosque at any entrance. The interesting part about this mosque is the entrance is free, however I had to pay to bring my camera in, what a weird rule! 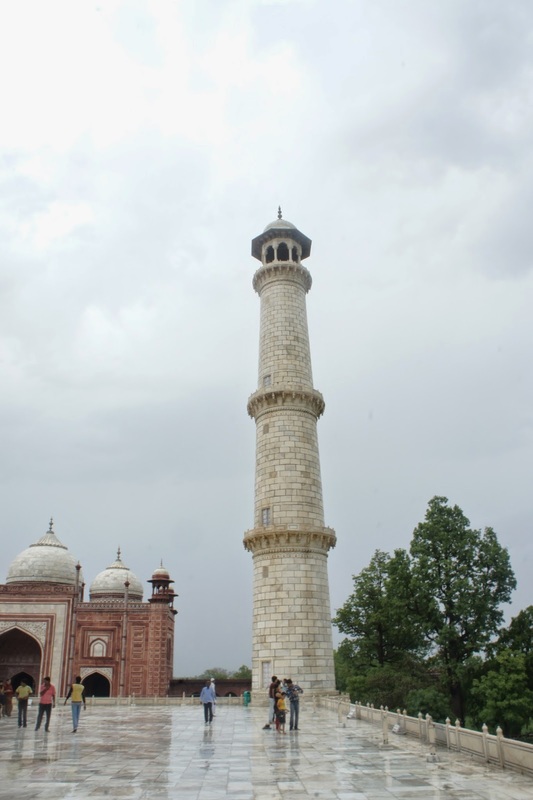 Other then being the biggest mosque, one of the pulling factor for tourists is that one can climb up one of the minarets to marvel the surroundings. As I entered the mosque, a local who seemed to be working in the mosque grounds volunteered to bring me around without even my consent! I did not suspect much except that he would probably want a tip out of it at the end of the trip, so I allowed him to bring me around. At the end of the short 2 minute walk, he popped the question and asked for a tip. So I gave him 50 rupees and that fella actually asked for minimum 60 rupees! 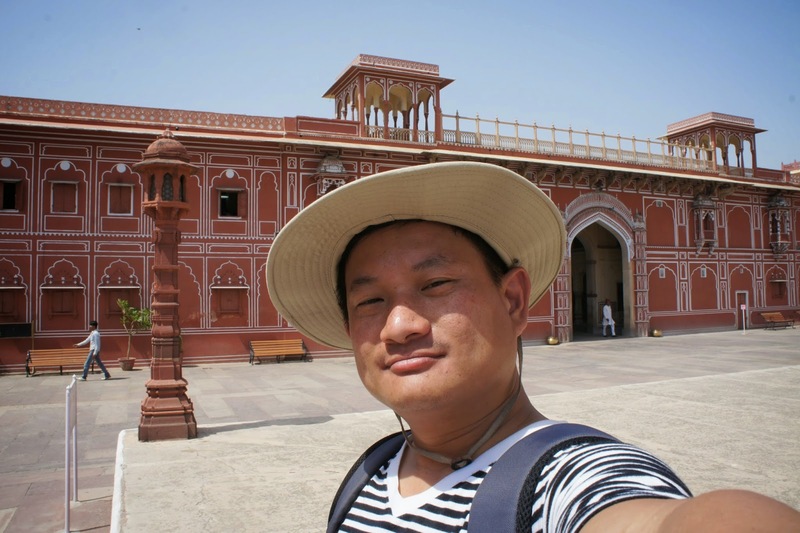 How can he extort visitors in a religious grounds??? That staff member left me after taking my tip and I was given the freedom to explore the mosque on my own. 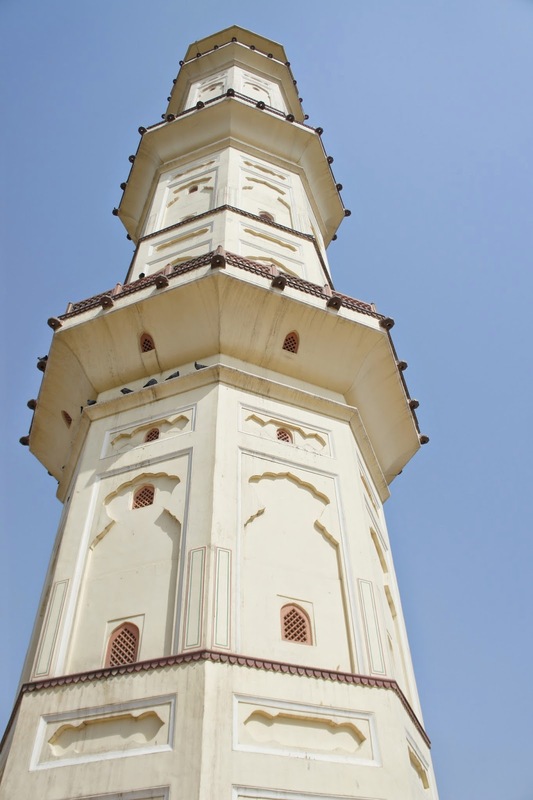 My main purpose of visiting this mosque is to climb the minaret. 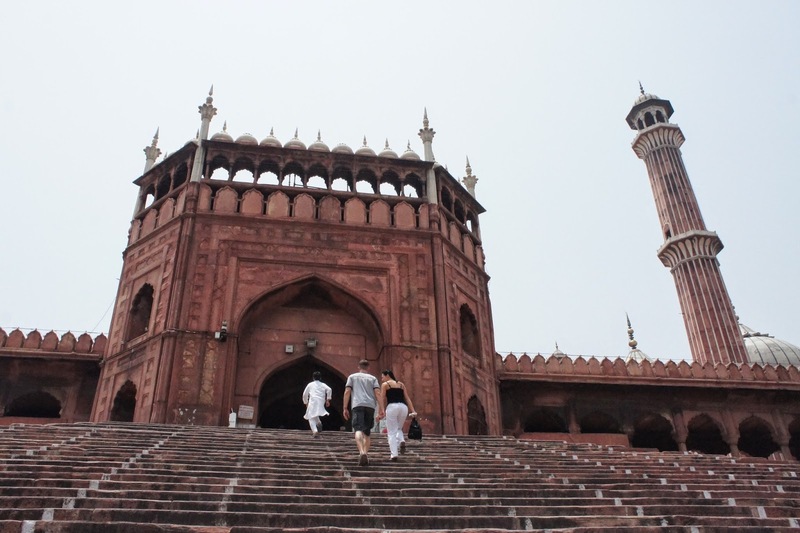 Paid for the ticket for the minaret and off I went, getting to the base of the minaret. 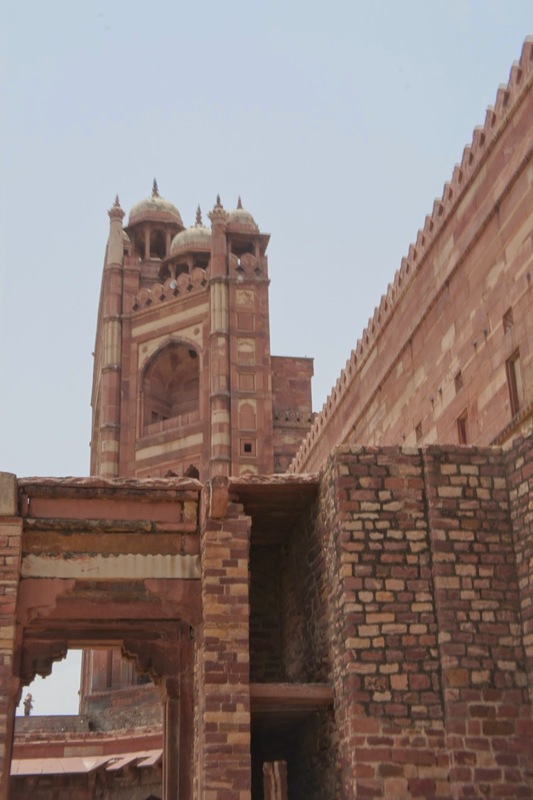 Now to get to the base of the minaret, I had to climb up to the second level of the mosque wall and a short walk on the wall to get to the minaret. 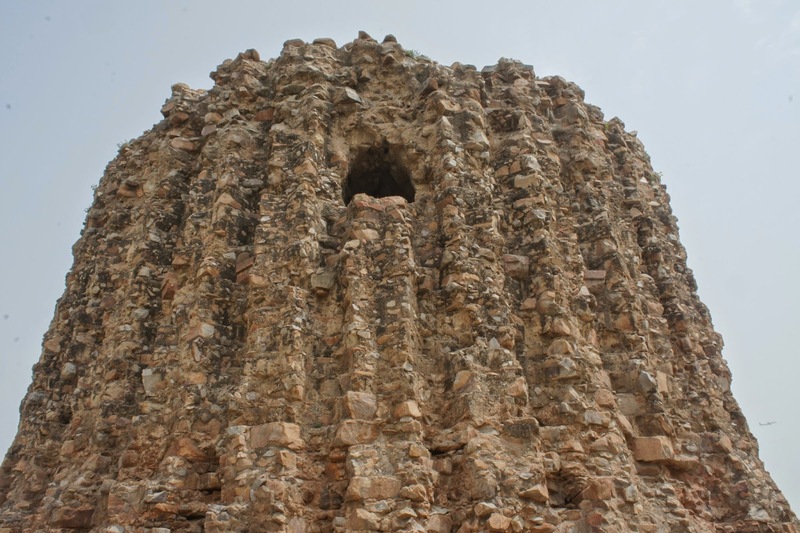 At the base of the minaret, before entering it, there seemed to be someone guarding the entrance of the minaret. 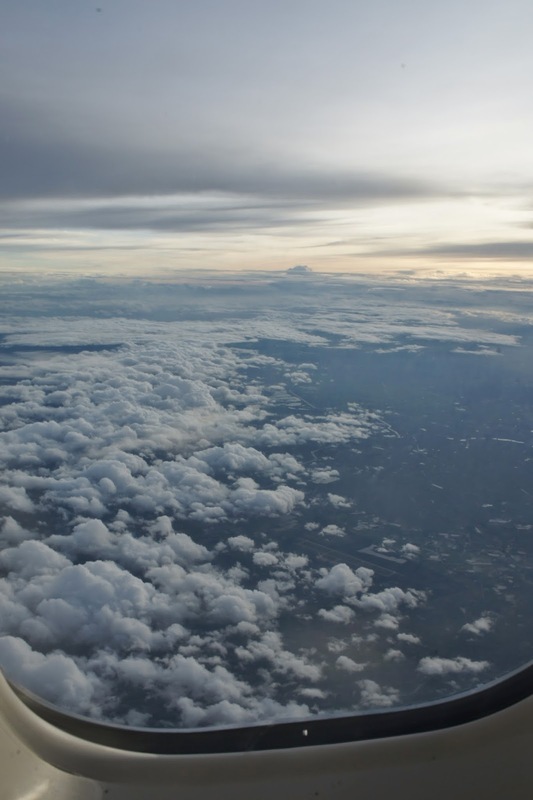 He forcefully assigned a boy who seemed to be his son to guide me up there. Well I have to say the boy did a good job by ensuring that my climb is a smooth one. 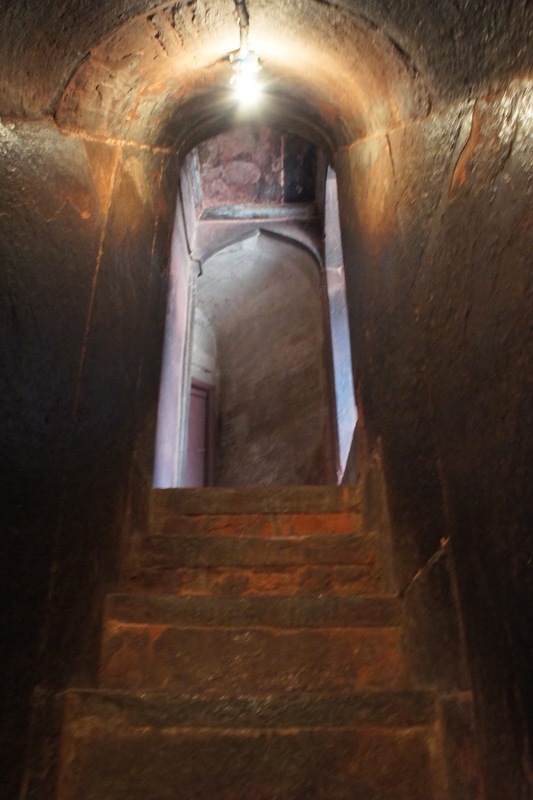 As the 122 step stairway was very narrow, good for only 1 person at a time. Along the way there are people descending from the tower so we have to shift one side to allow their passage. At the top of the minaret, the view was stunting! 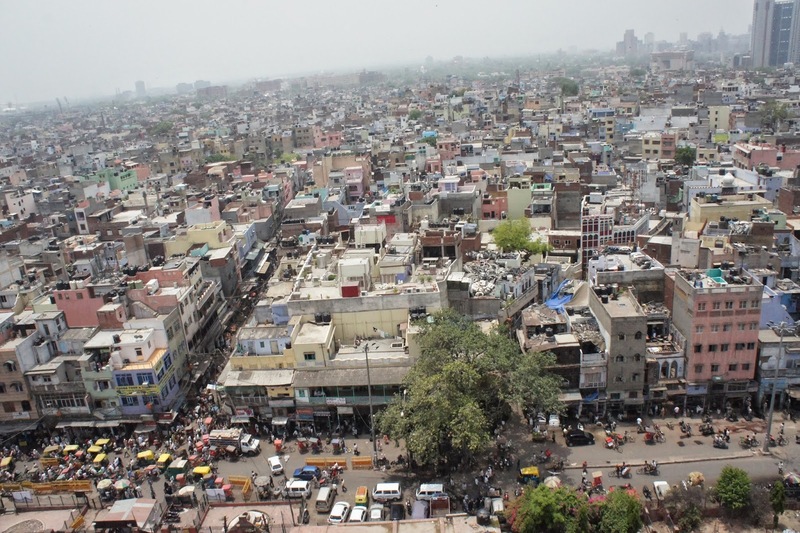 I can see the whole of old Delhi as well as new Delhi. Not to mentioned the breeze up here was welcoming amidst the hot weather. I stayed up there for a good 10 mins before descending. 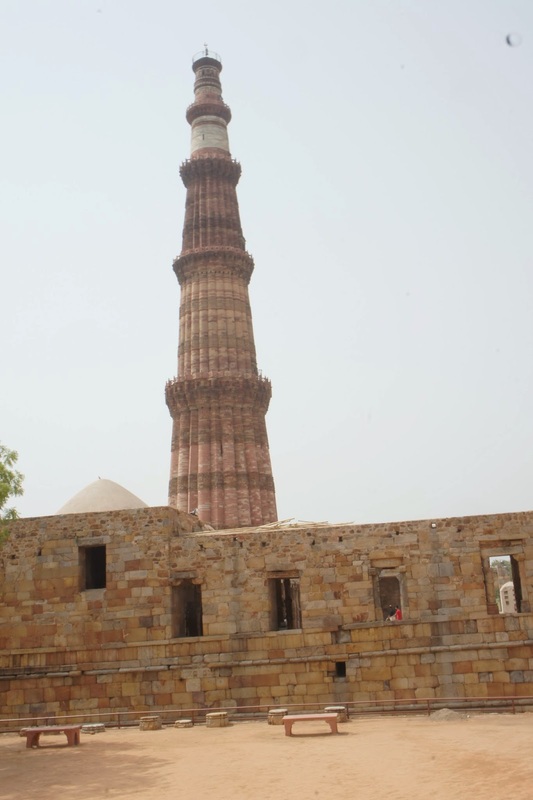 As I reached the base of the minaret, the father of the boy started to ask for a 100 rupee tip! At this point I was rather pissed so I shaft 10 rupee to him and tell him I did not ask for the guide, and he volunteered his son as a guide, either he take it or he leave it. I think he saw how aggressive I was and did not insist in his 100 rupee tip! Well twice in a row I have been extorted for outrageous tips for services I did not ask for, it was really frustrating! Out of the mosque I took a auto rickshaw to Connaught Place to grab lunch before heading back to the hotel to pack up my stuff for my train ride in the afternoon bound for Jaipur. 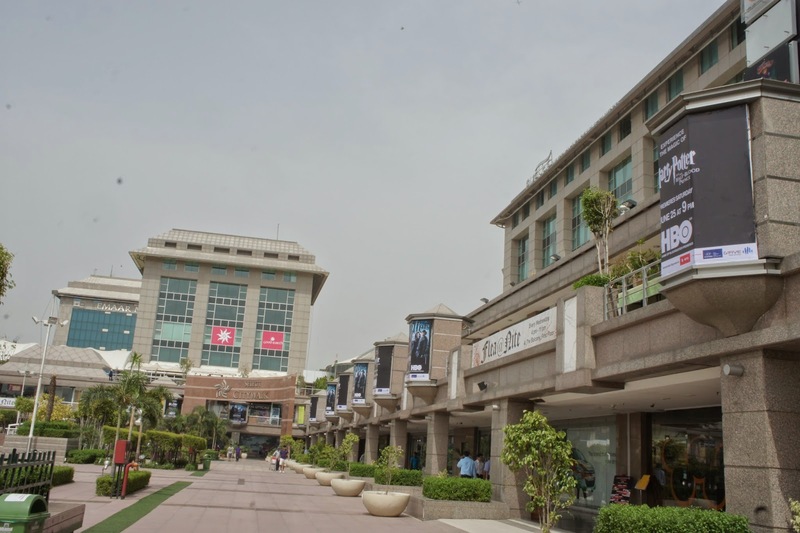 I asked to be stopped at the shopping mall, hoping the air conditioning can ease the heat in Delhi. 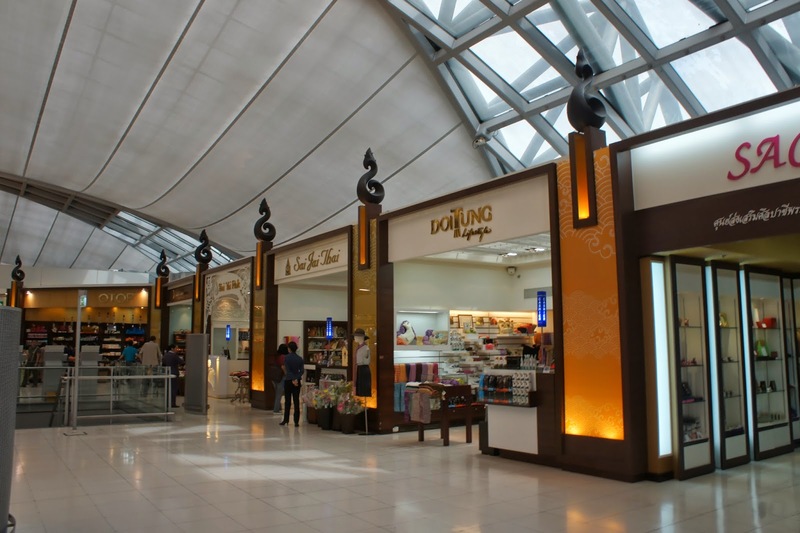 I was prompted sent to the underground shopping mall, which was really nothing other then shops after shops selling daily necessities to the locals. Was rather boring and I decided to leave the mall and check out for any fast food to settle my lunch (well all I had for the day was a sip of water before I left the hotel and nothing else). Exiting the mall, I saw a McDonald’s across the road and headed that way for lunch. After lunch I went back to the hotel and packed up leaving for the train station. 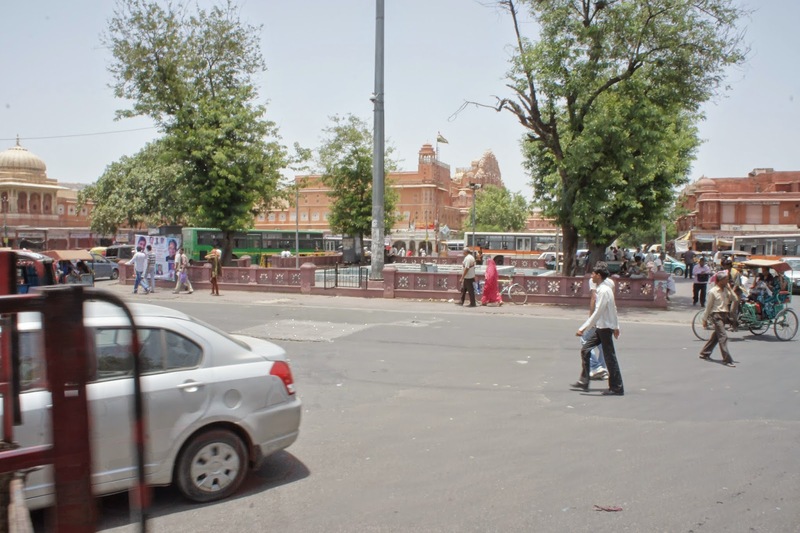 As the train leaves from Old Delhi Station, which was a distance away from the hotel, the hotel staff was kind enough to hail a auto rickshaw for me. This is where I learnt my 2nd lesson. The auto rickshaw driver kept saying pay whatever I like, so I boarded his vehicle (partially due to time constraint), when we reached the station he asked for more! As I was about to miss my train, paid him whatever he asked for and left to catch my train! At the crowded station, finding the platform was not that tough. 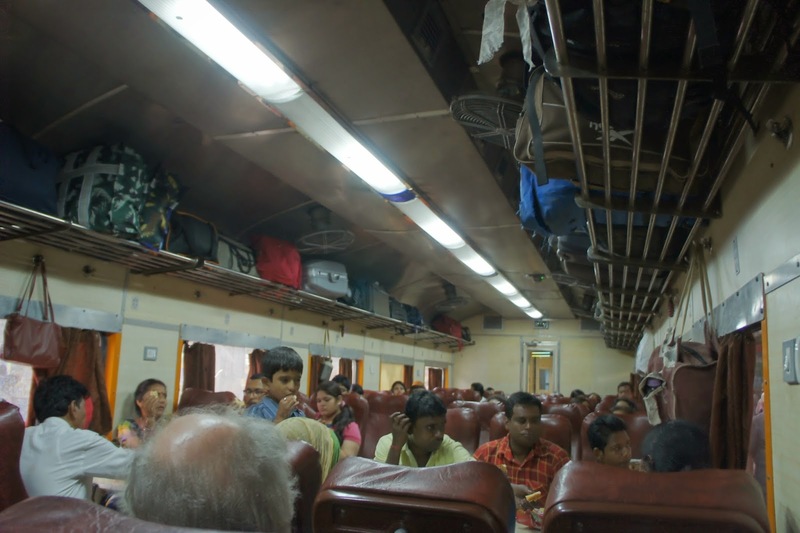 The tougher part was finding the carriage I was suppose to travel in and the berth! It took me 3 tries before I found where my berth was! About an hour through the ride, a teenage boy approached me asking me if he could sit, I asked if he has a ticket and he said he didn’t but just wanted a sit to rest. So I told him he could that the sit beside me. 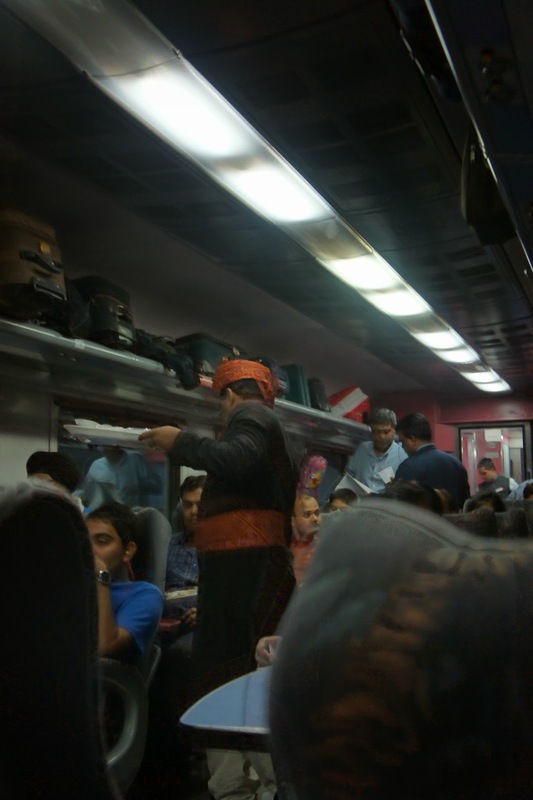 Throughout the train ride, there are vendors selling things like potato chips, tea, snacks. The teenager bought a packet of chips and asked me if I wanted some. Well I didn’t wanna get my hands dirty by eating the chips, I rejected his kind offer. Later, the tea selling man came by and that boy asked if I would like to have some tea and he intended to buy me a cup (probably out of gratefulness), however seeing him probably having not much cash with him, I rejected his kind offer again. The rest of the journey was really uneventful. The only thing is there is no announcement of the train stop, lucky for the locals I was traveling with, they reminded that the train pulled into the station that I was suppose to alight, and off I went. 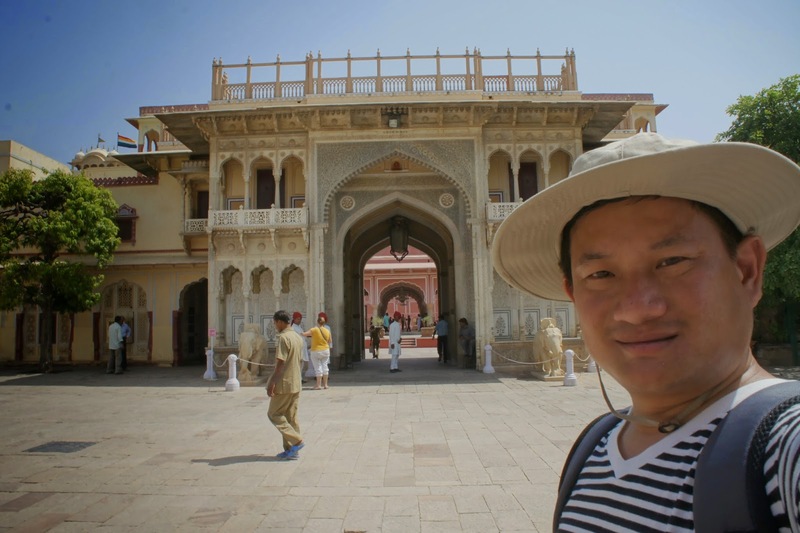 Here I am in Jaipur after a 6 hour train ride. I must say the ride was rather comfortable. I checked into my hotel and rest for the night. 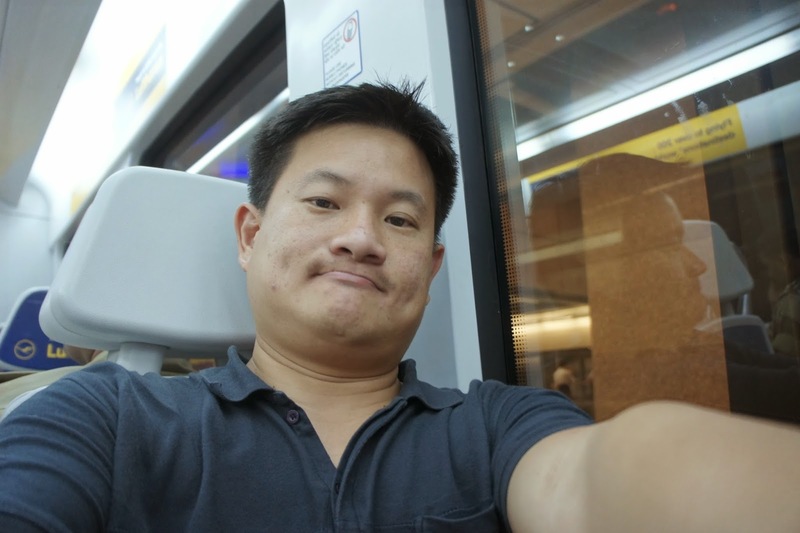 I was rather exhausted partly by the heat and partly by the train ride, I hit the bed early at night. 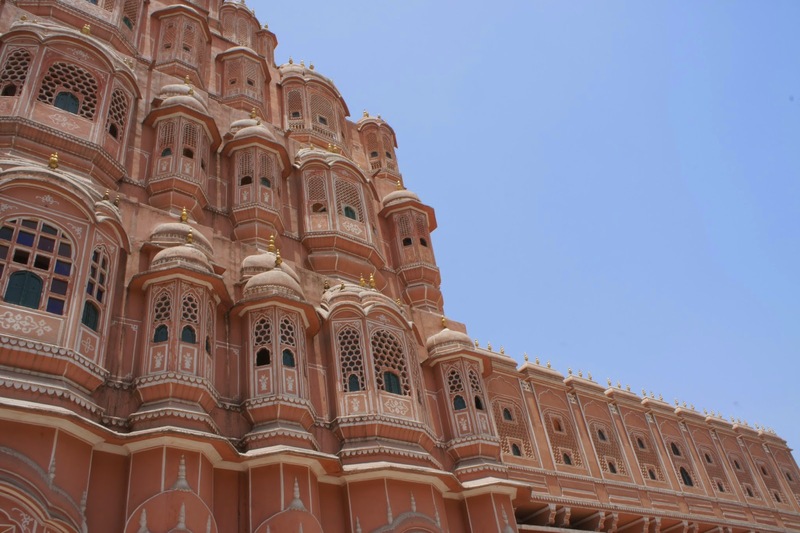 The decision to travel to India is rather ad hoc. 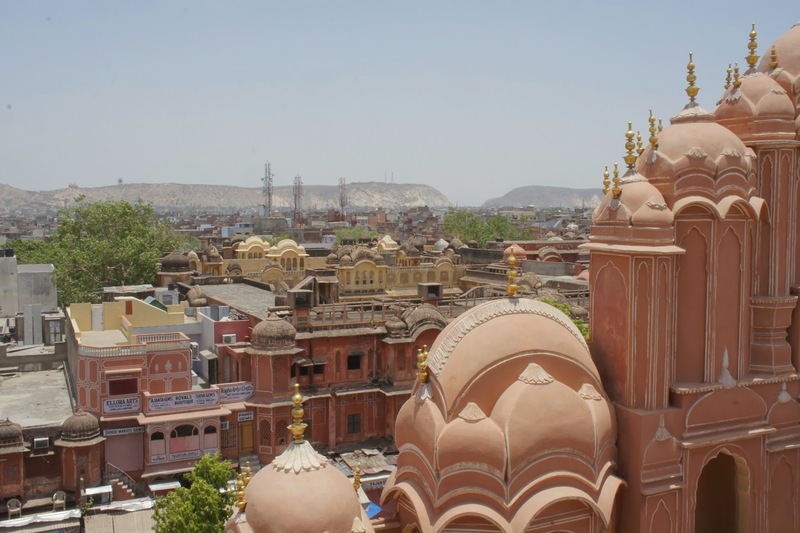 I was rather hesitant to make this trip, as it is the middle of summer in India with a daily average temperature of 40°C. 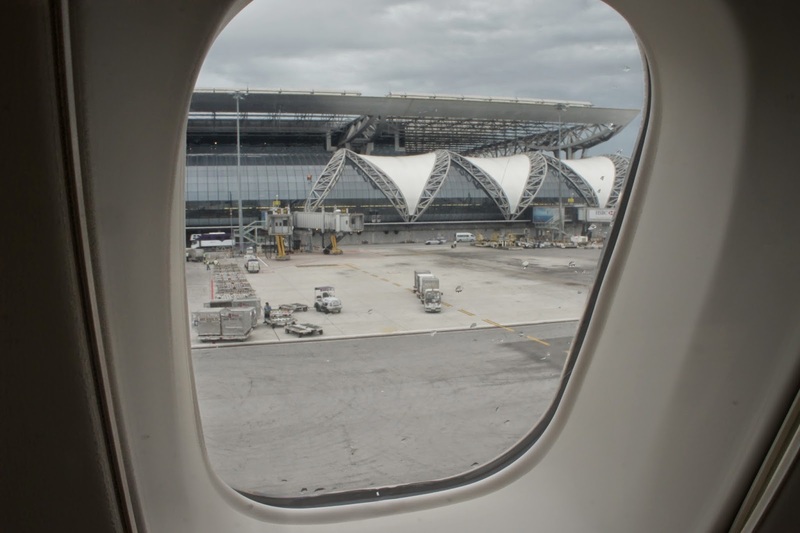 However I couldn’t resist the opportunity to travel, thus 2 months ago I made the plans to travel and did the necessary arrangements and now here I am traveling to India. 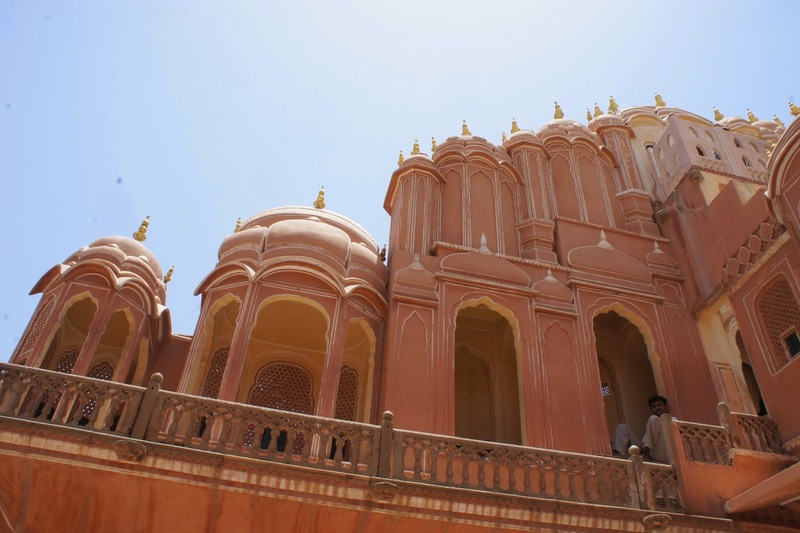 Today is rather uneventful as I practically spent the whole day traveling to India. 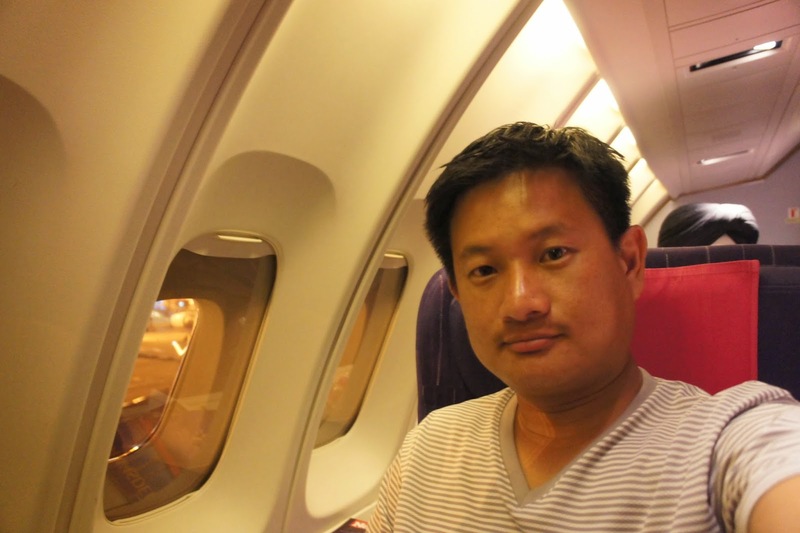 I took Thai airways to India, transiting Bangkok. The only highlight is the free message in Bangkok Airport that I was so looking forward to. The lady who did the message is not only skillful, she also got rid of the shoulder ache I have since before my Iran trip. Kudos to her!! 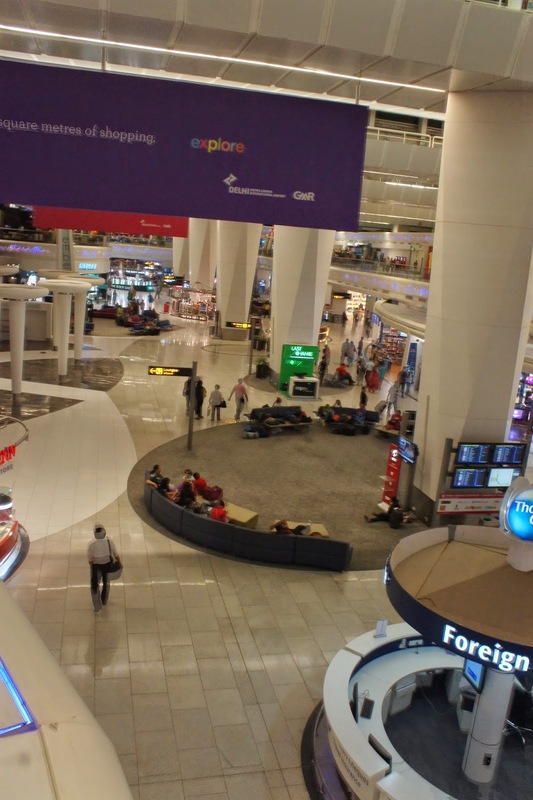 After spending almost 10 hours of traveling (plus transit time), I finally reached Delhi International airport. 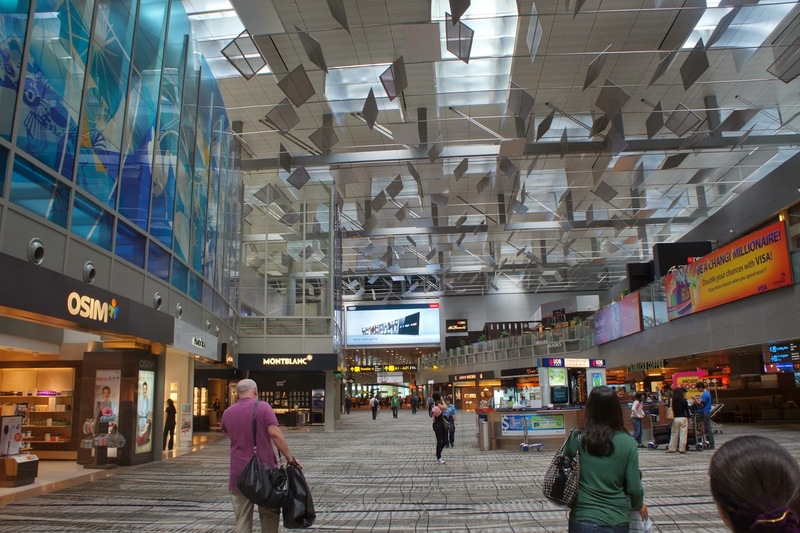 The first impression of this airport is it is very new, very modern and is comparable to the Singapore Changi Airport that most Singaporeans is so proud of. Immigration was swift and there wasn’t alot of people as I had anticipated. Customs clearance only took about 10 mins. After collecting my luggage, the moment I step out of the airport, it doesn’t feel and look like India at all. There is not much crowd, could be due to the time that I arrived. 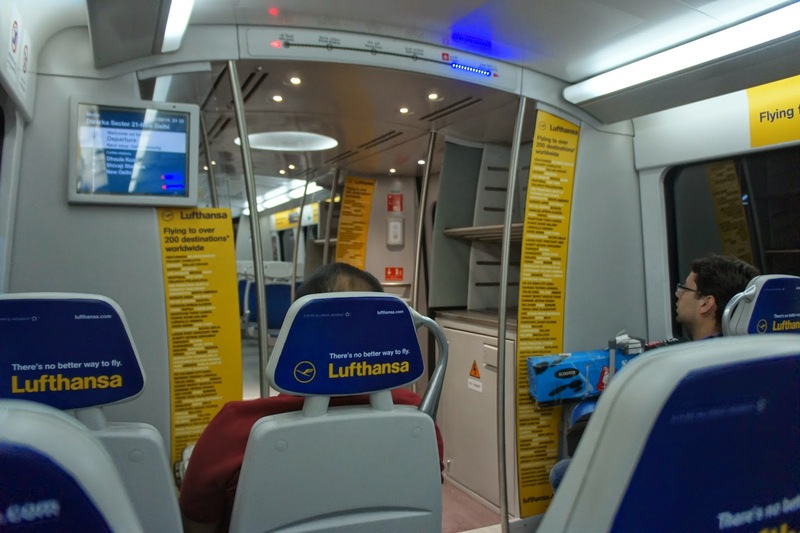 I headed happily towards the airport express metro that took me all the way to New Delhi train station. 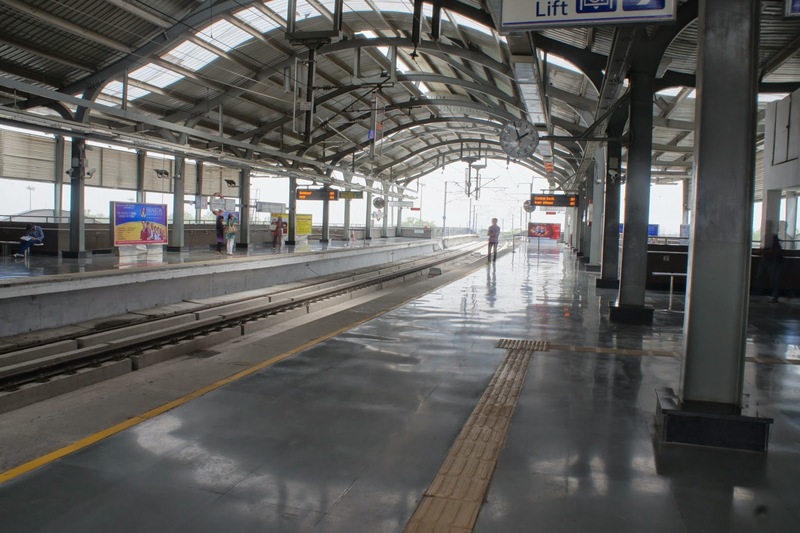 The ride was rather fast and I was at New Delhi train station in less then 20 mins. 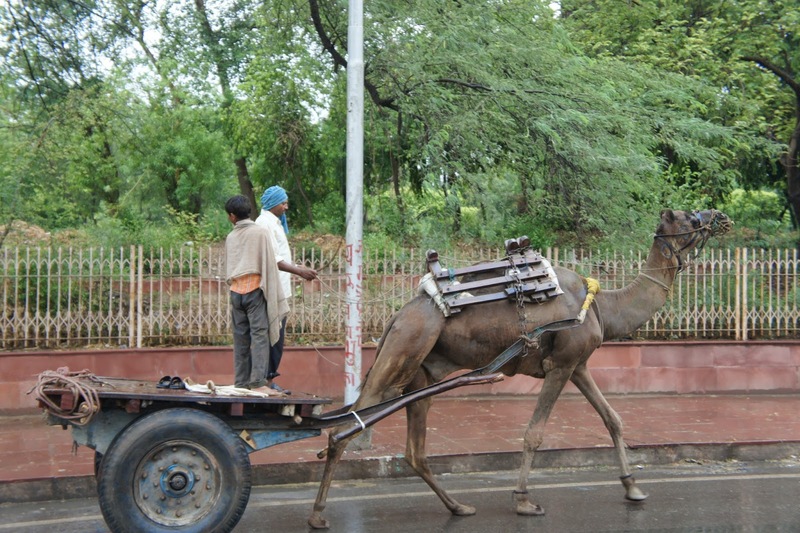 Exiting the train station, this is the time I felt I am really in India! The usual cab touts that the guide books mentioned sprung into action upon seeing that I was a potential target. They quickly rushed up to me trying to get business. 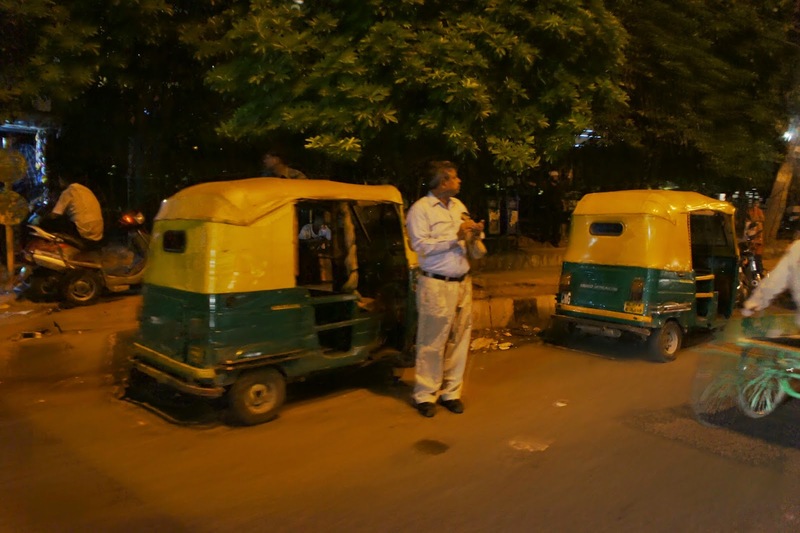 As the guide books has mentioned, these touts that approached the foreigners often quote a higher price, so I told them I am at my destination and do not need auto rickshaw. I gotta give it to their determination, these touts do not seem to buy my excuse and kept following me till a distance where they stopped and approach other foreigners. 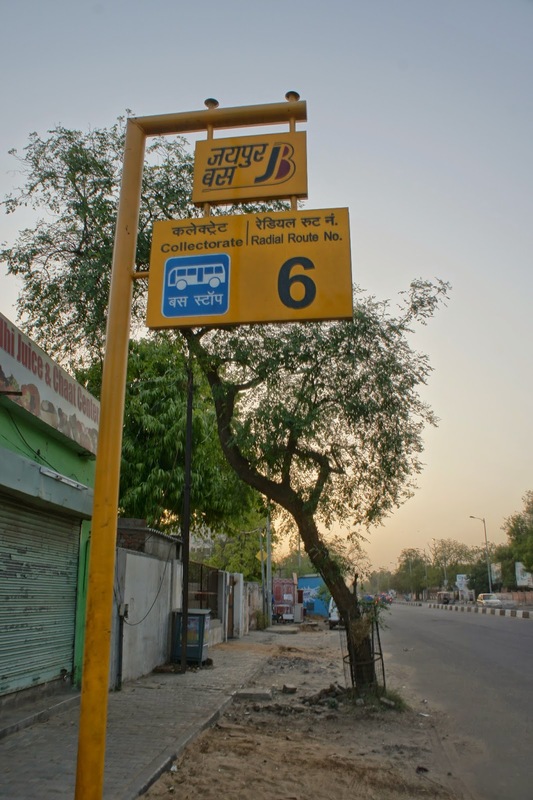 Well I was intending of getting train tickets to Jaipur the next day, so technically I am at my destination. There are Xray machines at the entrance of the train station. I asked the guard at the Xray machine if the ticketing counters are closed (it is 9.30 pm when i reached New Delhi station). The guard mentioned that they are closed for the day so I see no purpose in going into the station. I tried to walk towards the hotel that I will be putting up for the night. 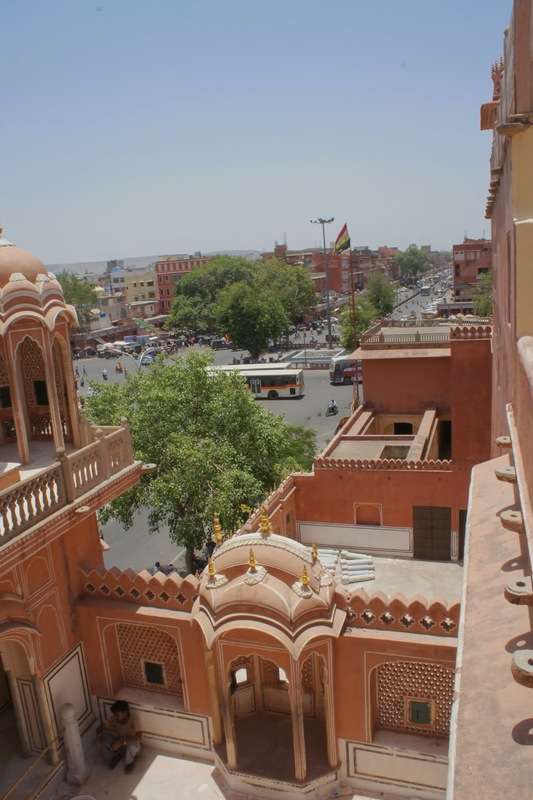 After some distance I saw some tourist police and approached them for directions, they mentioned that walking to my hotel is quite far and they helped me hailed an auto rickshaw, negotiated the price for me and off I go towards the hotel. The journey to the hotel is indeed far, I was grateful to the tourist police for telling me walking is too far. 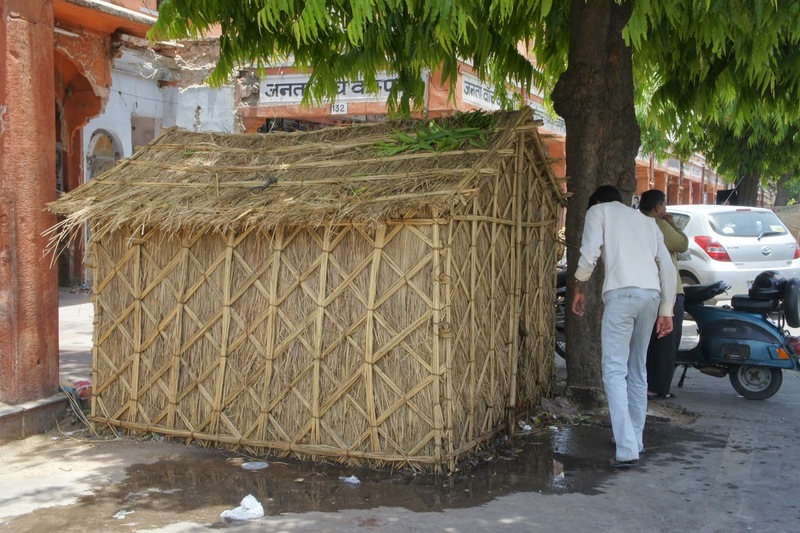 The hotel was very inconspicuous, however the diligent auto rickshaw driver managed to find it. After settling in, I walked around nearby looking for dinner. After dinner I returned to the hotel to rest for the night.